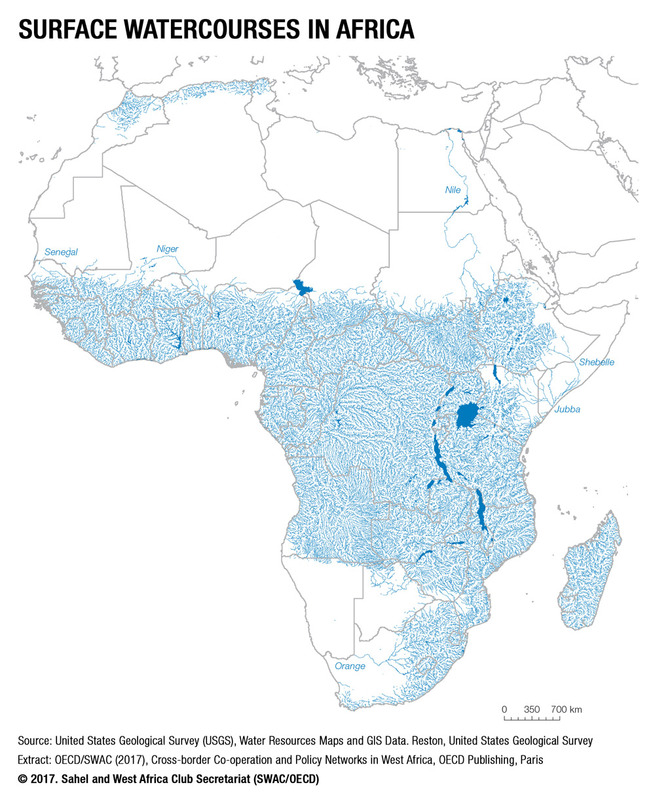 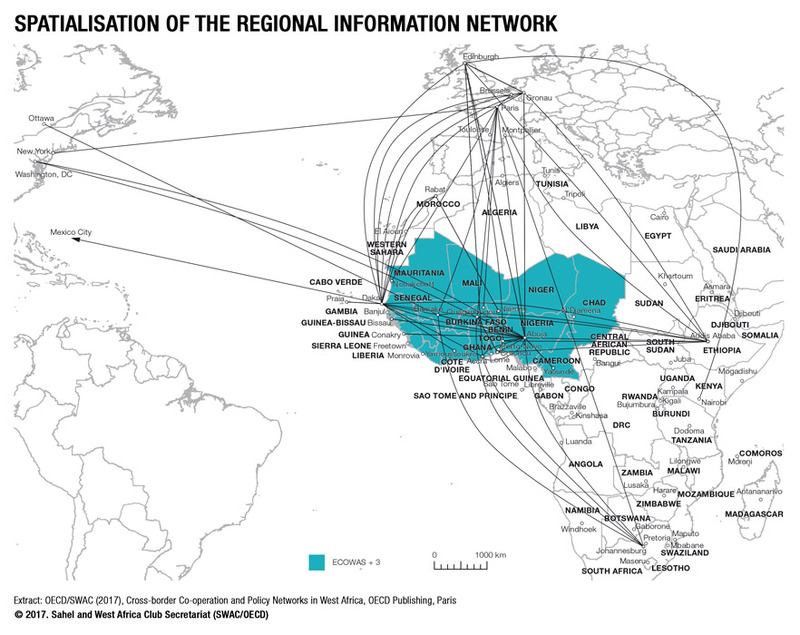 The SWAC Secretariat's map library includes 400 maps and nearly 100 figures. 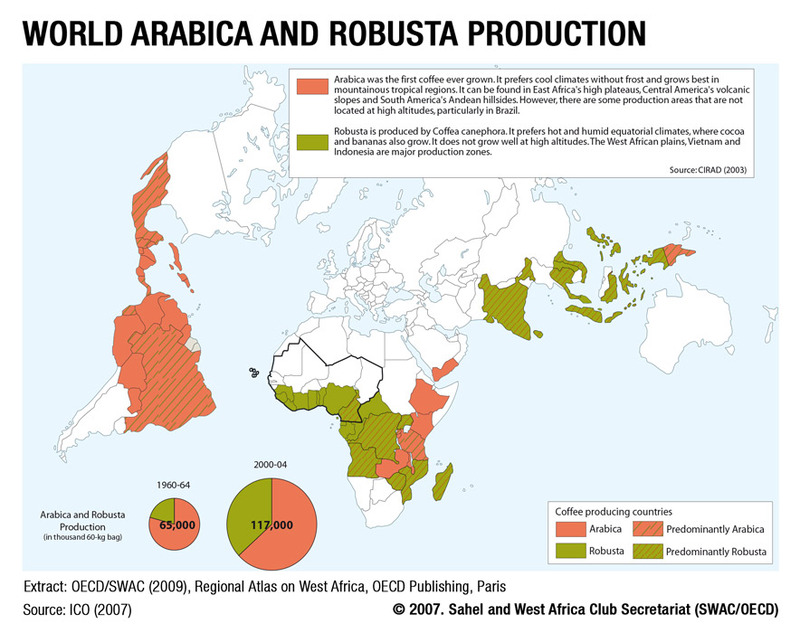 You can search by keyword, topic or country on our Online Map Library, or by publication or series (click on collapsed menus below). 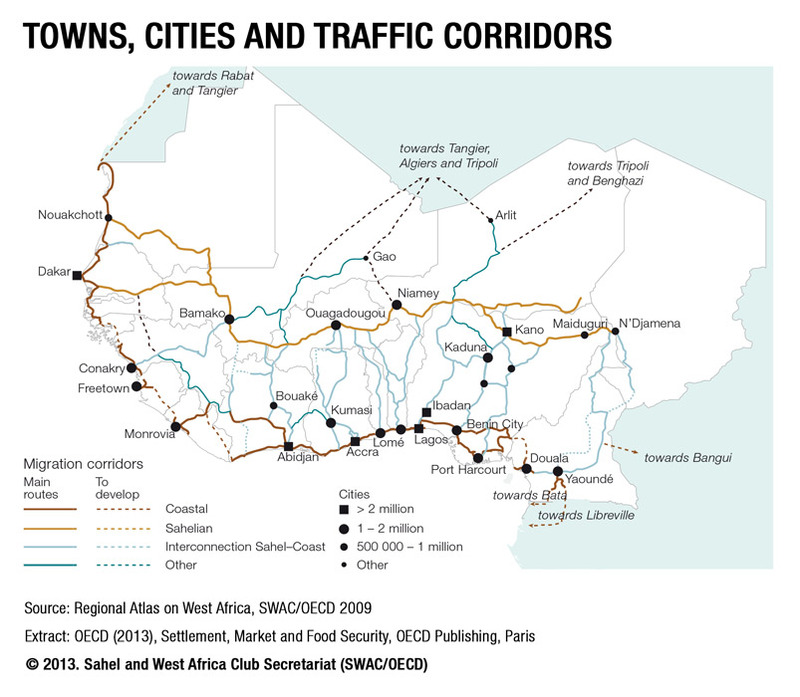 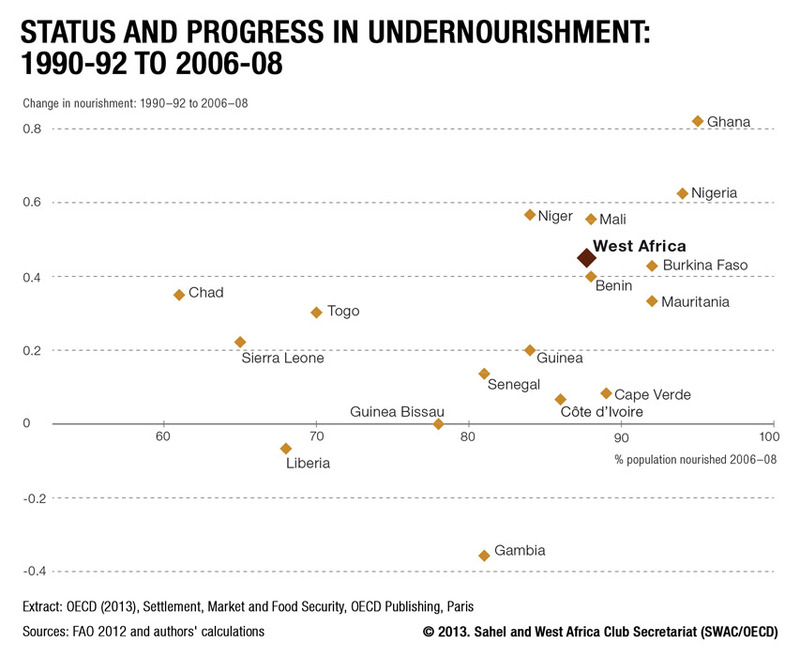 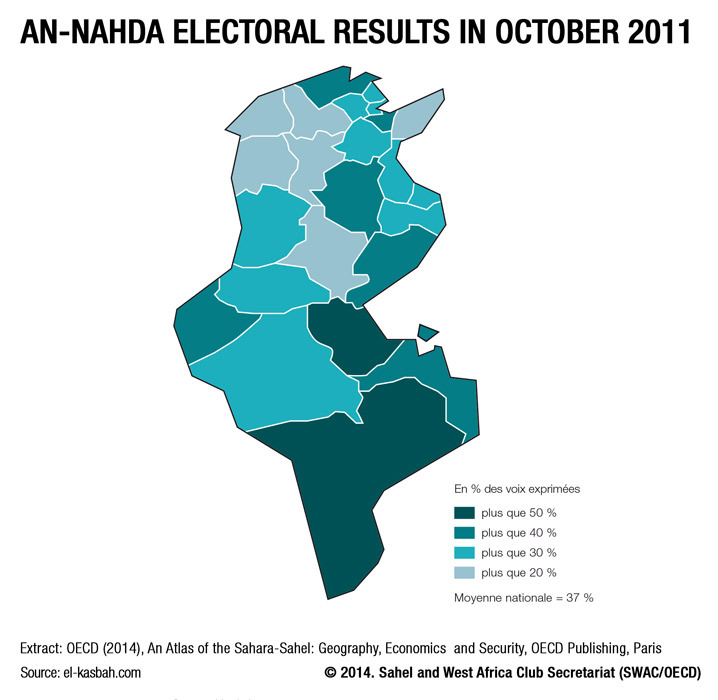 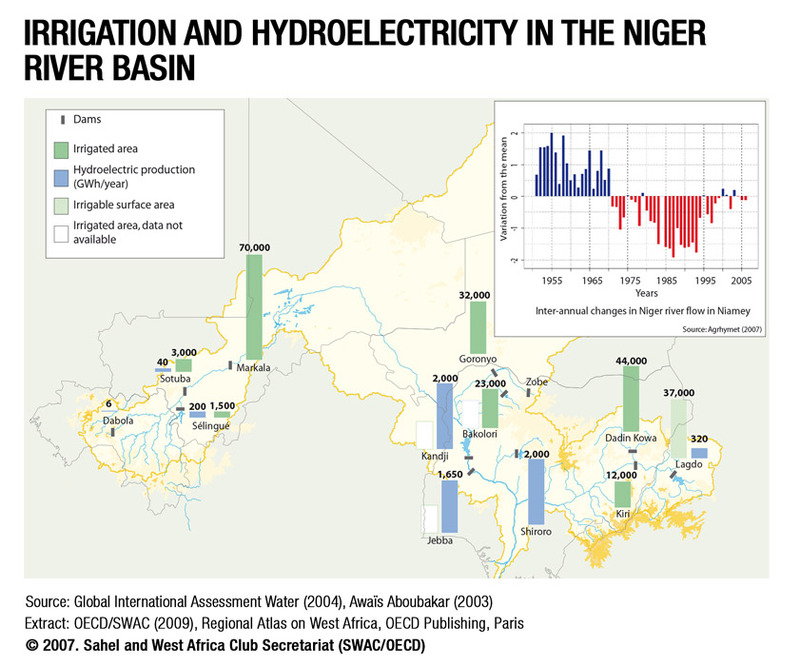 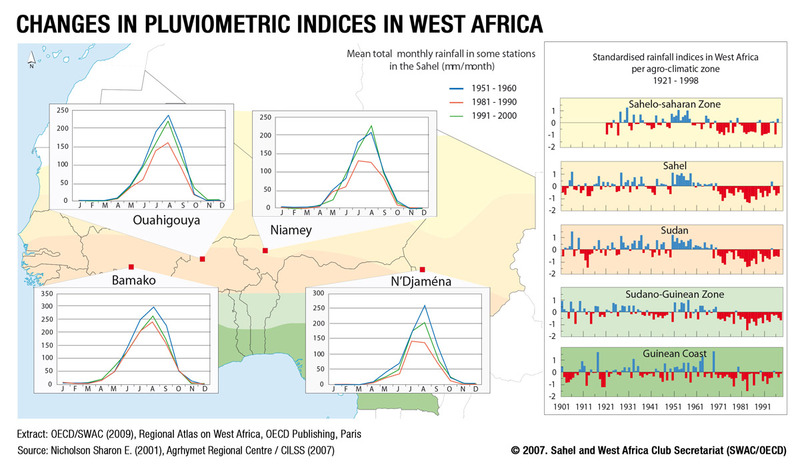 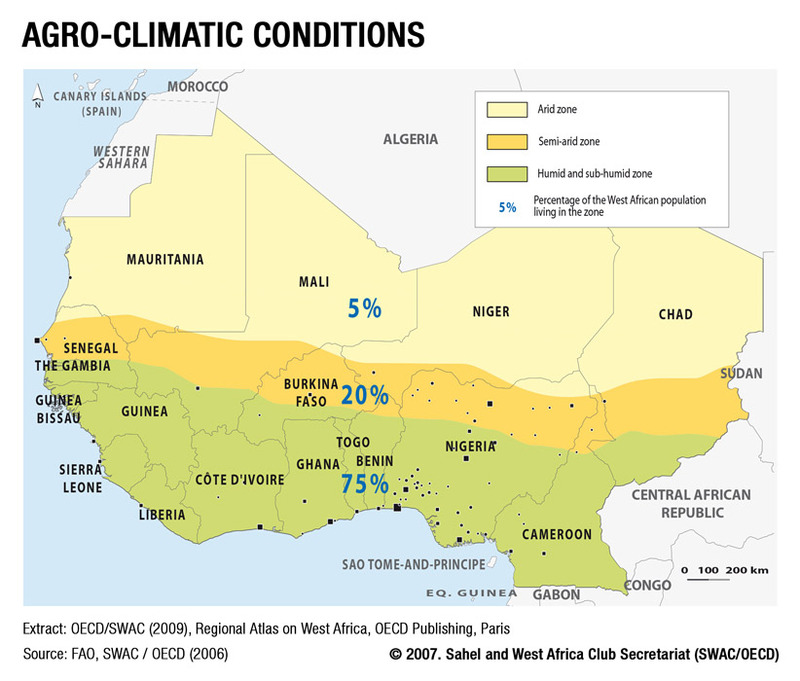 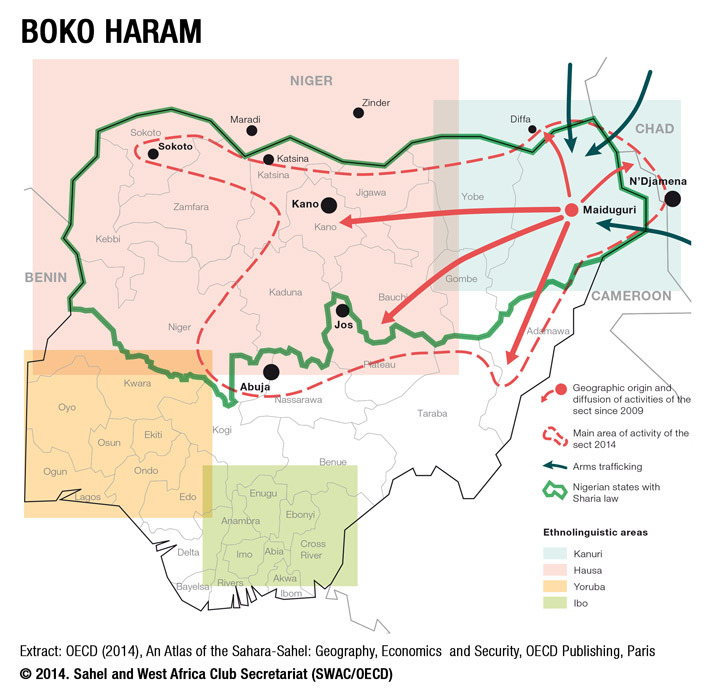 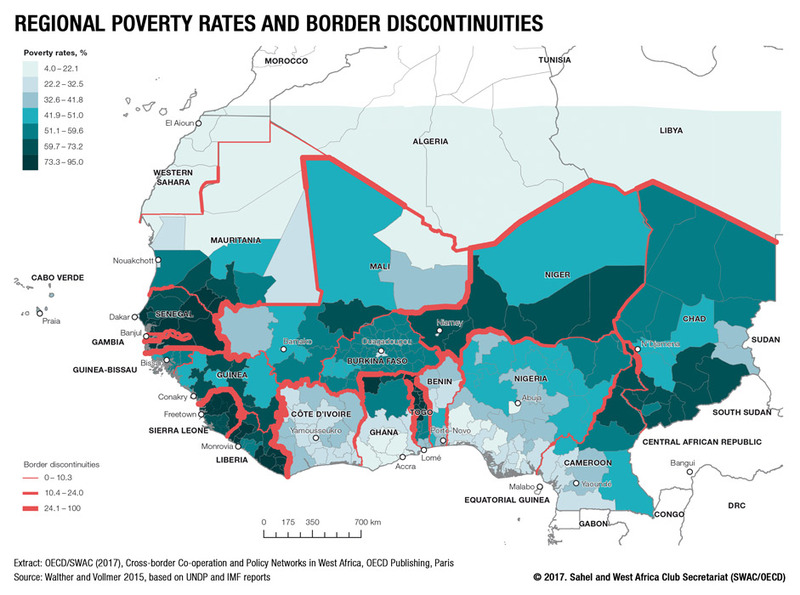 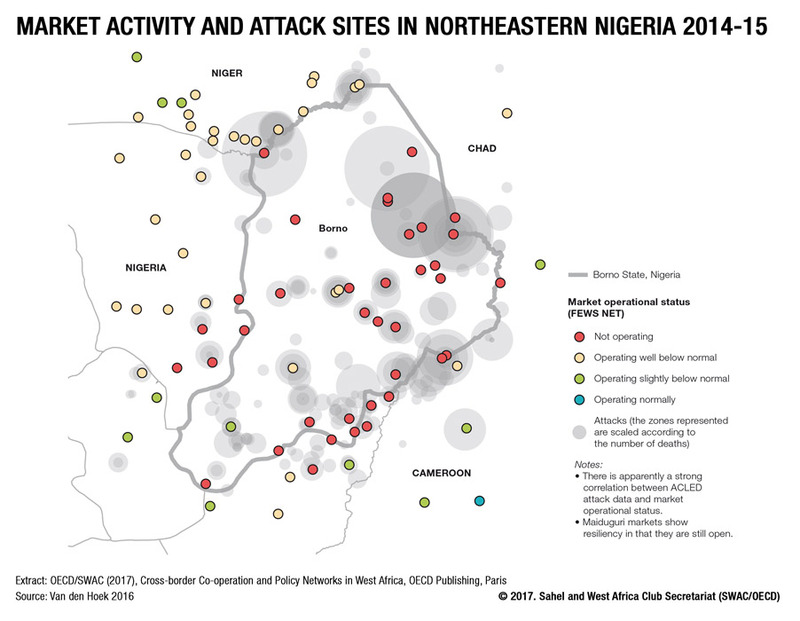 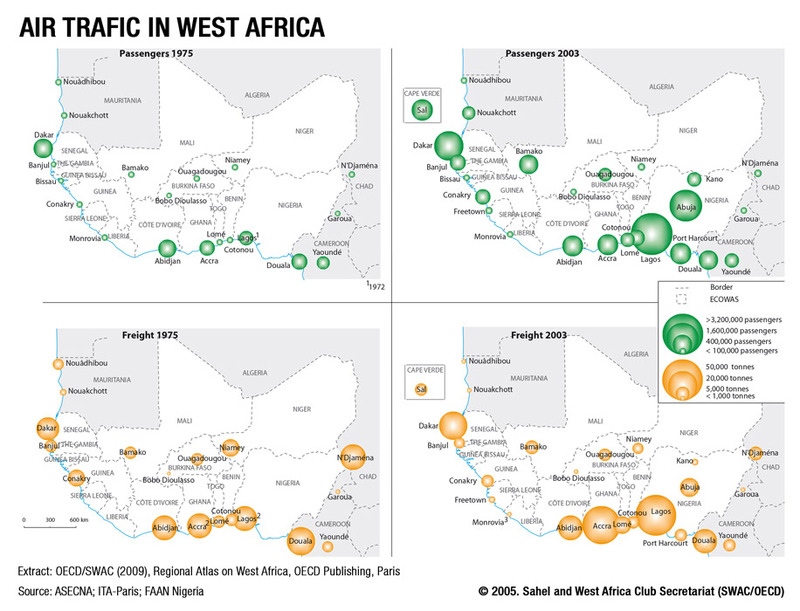 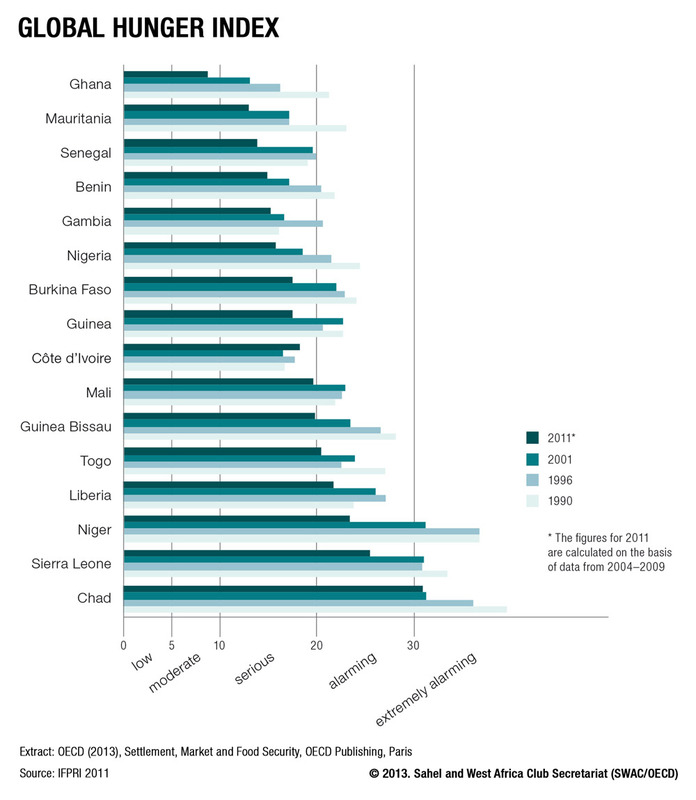 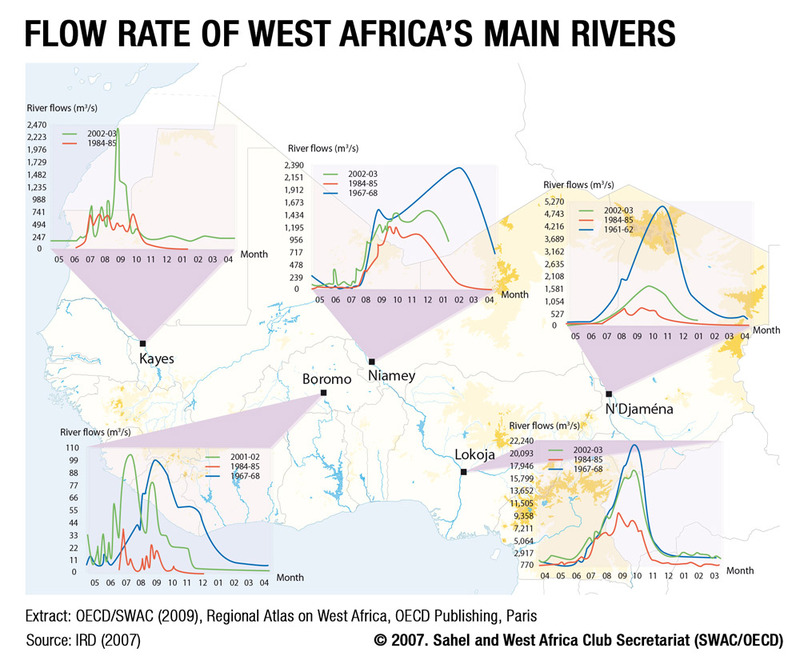 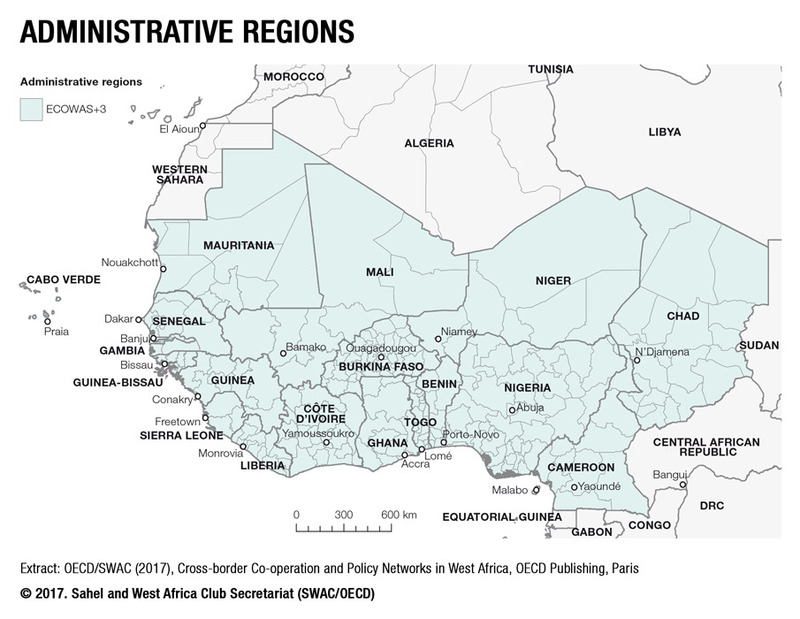 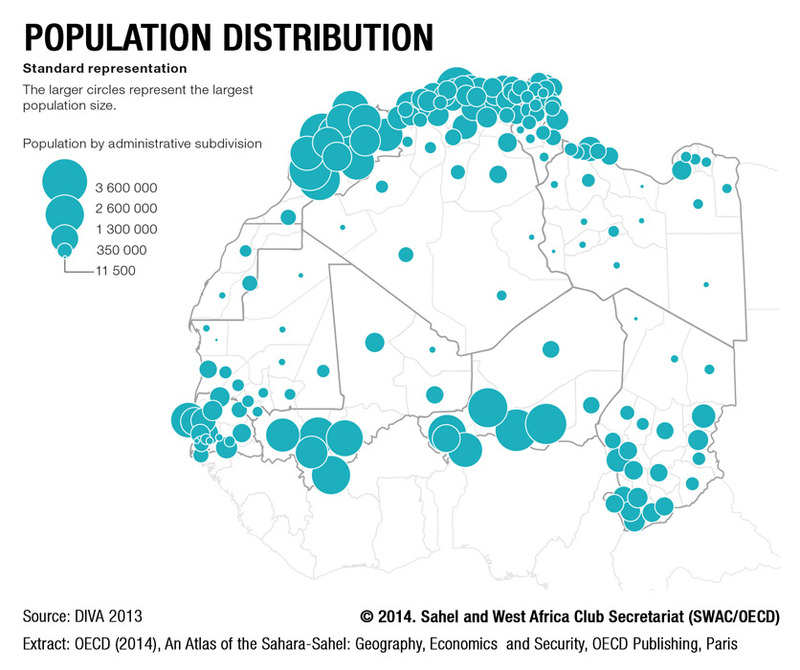 You can also subscribe to our Maps & Facts series via the SWAC Secretariat's bi-monthly West Africa Brief. 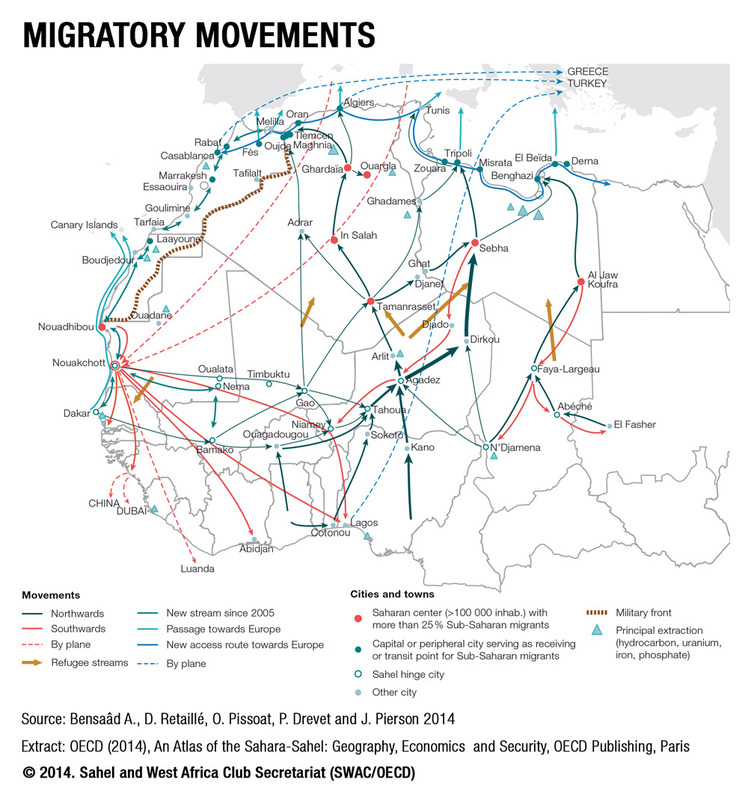 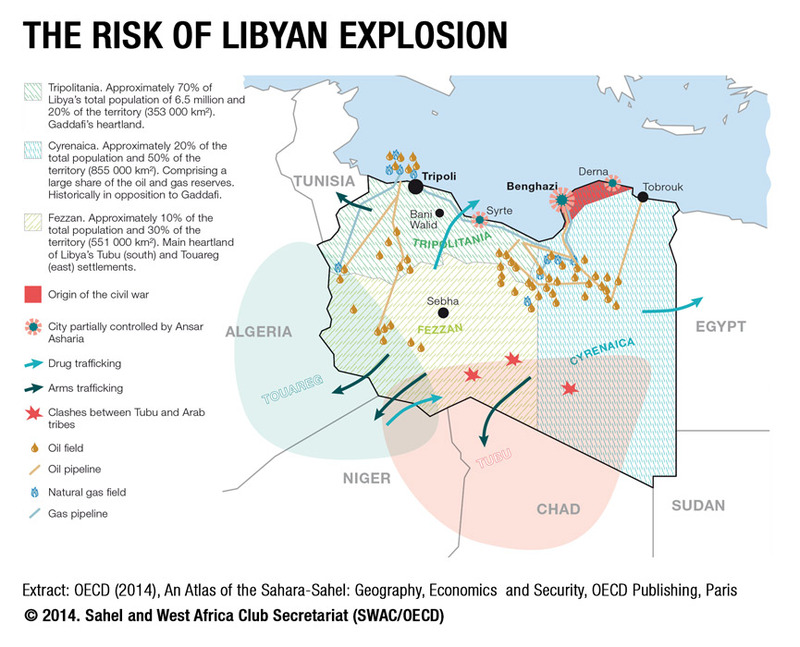 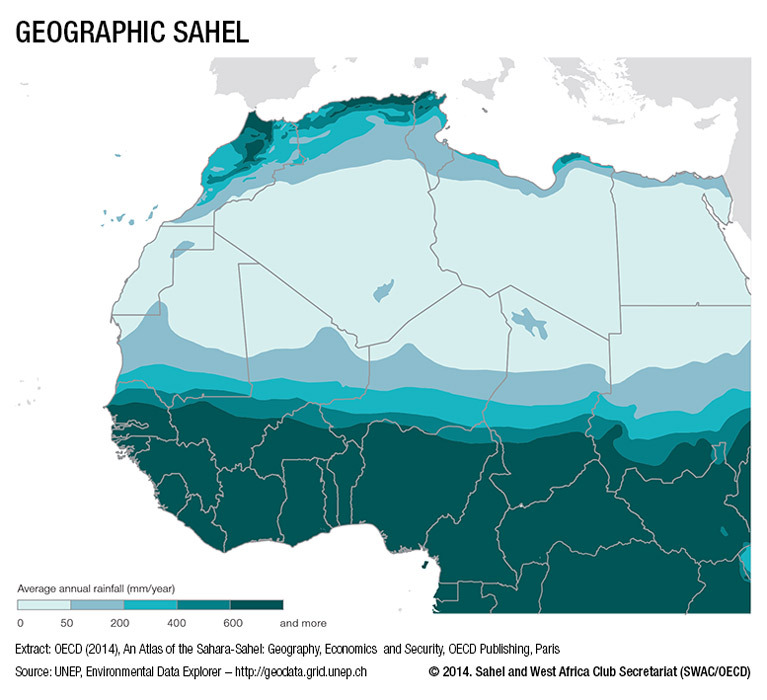 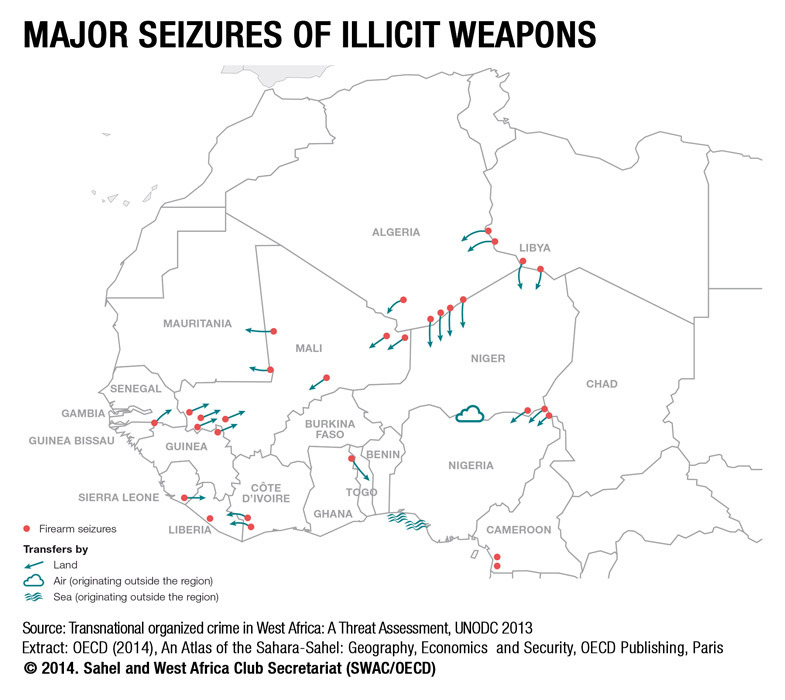 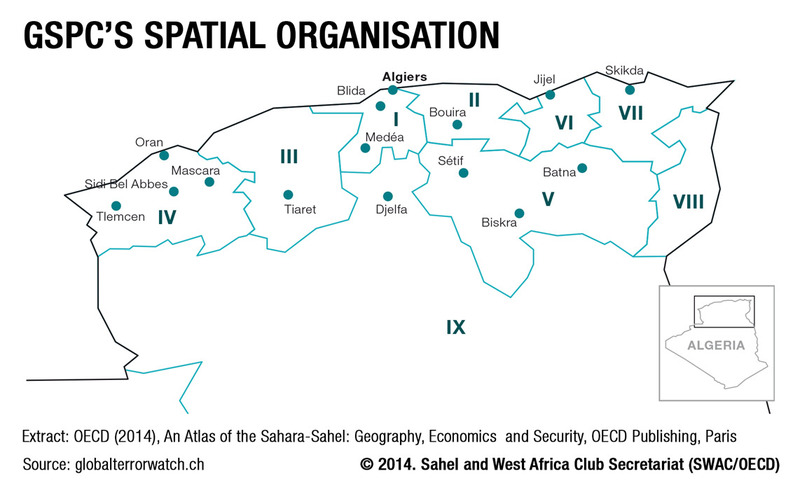 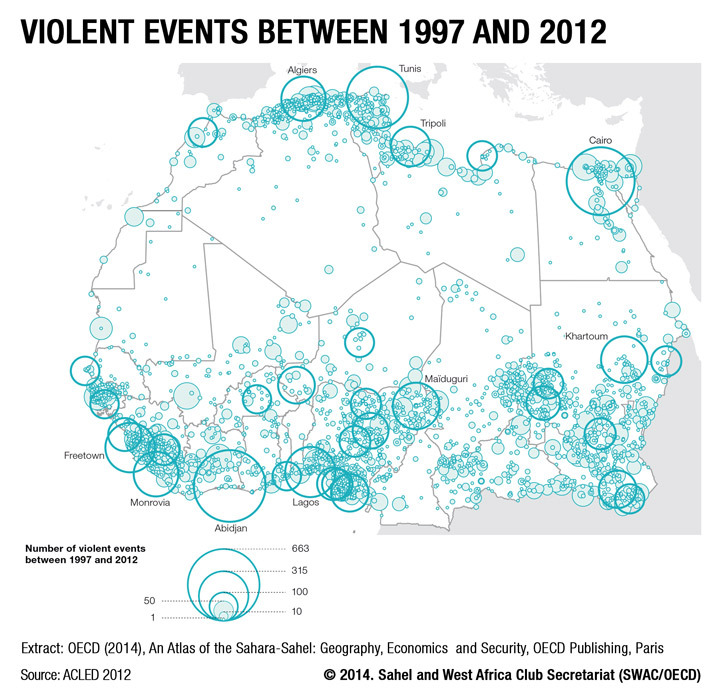 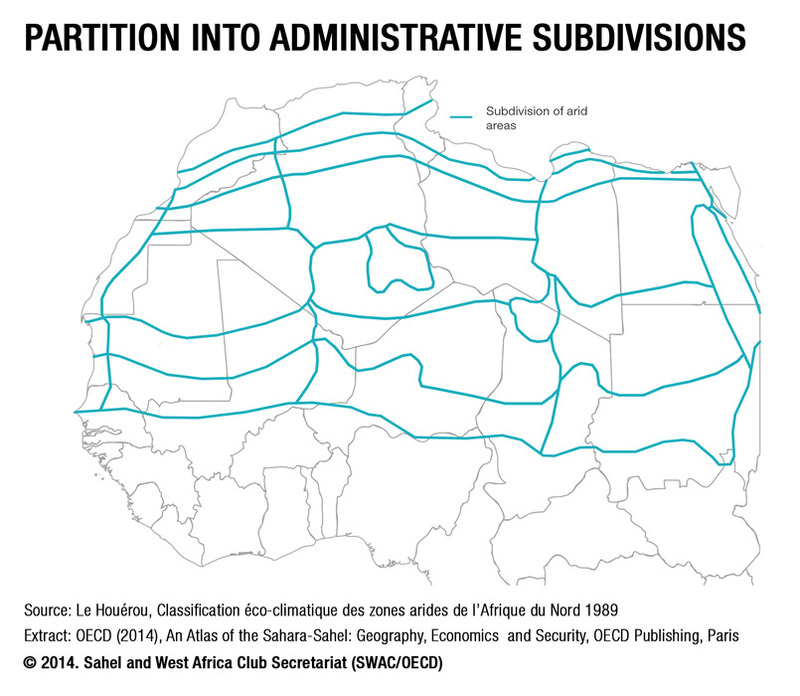 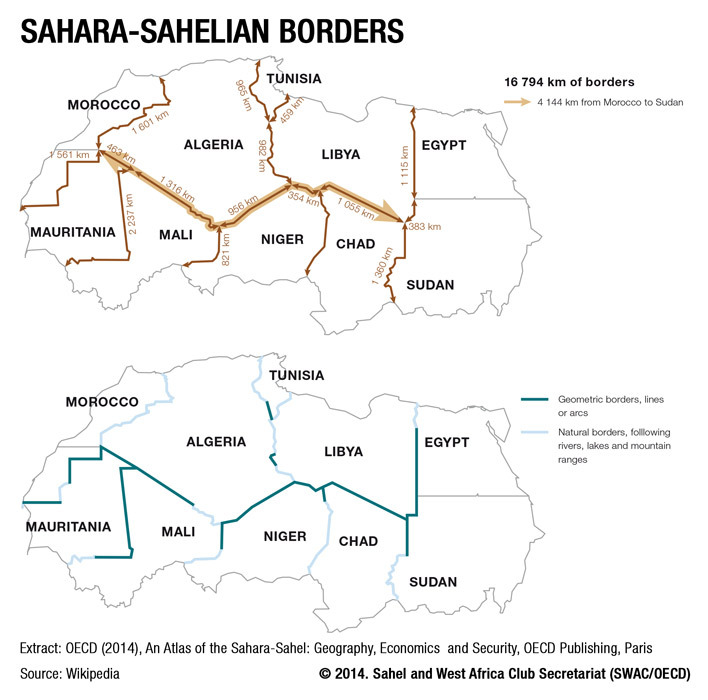 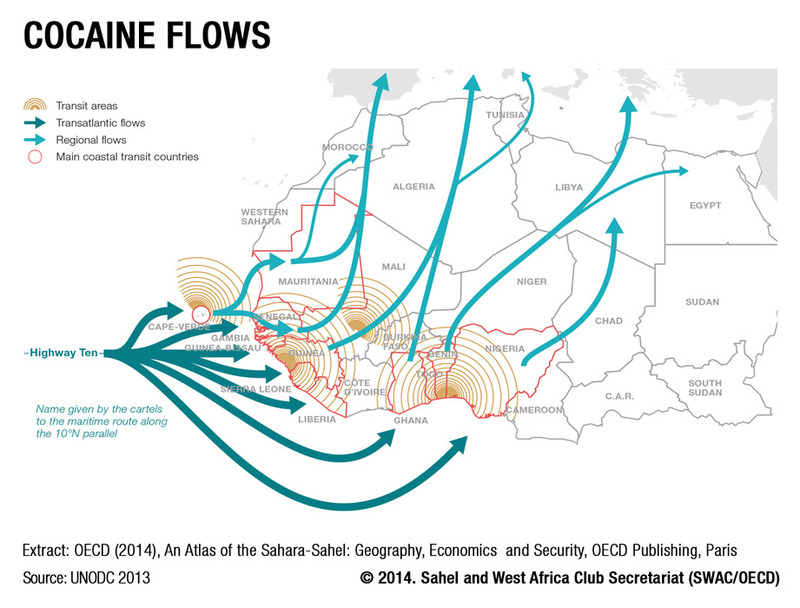 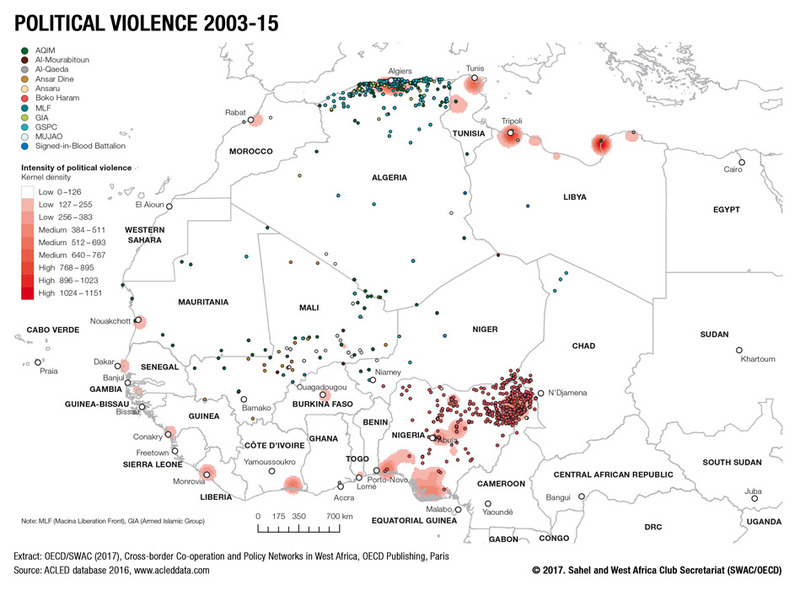 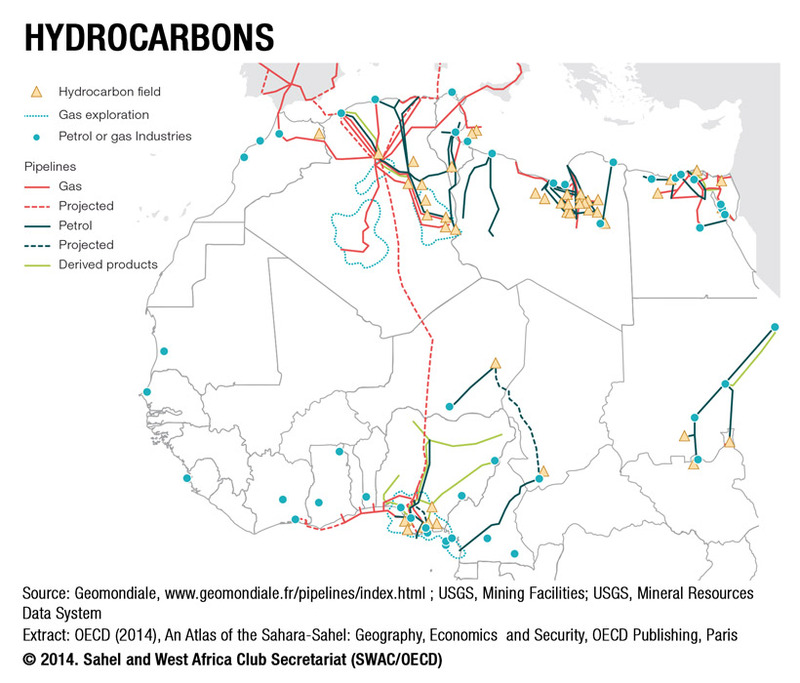 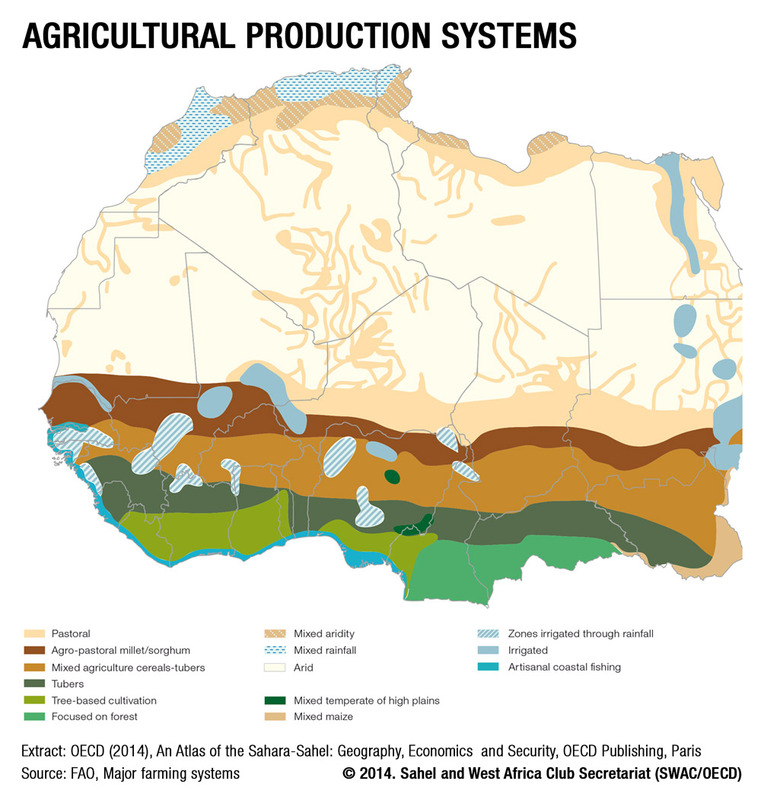 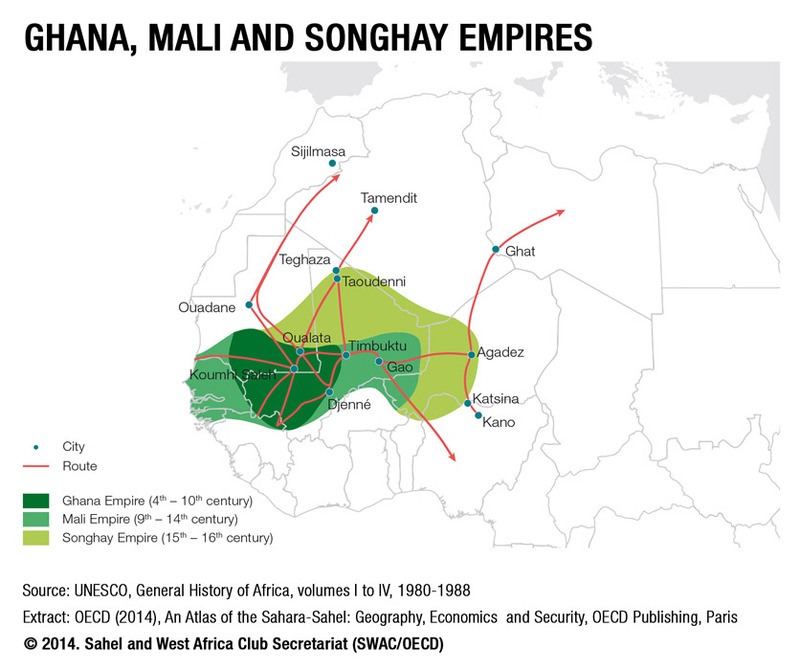 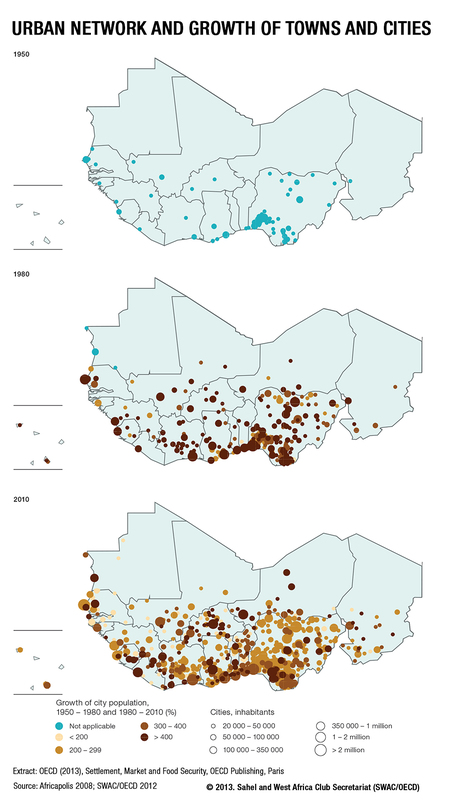 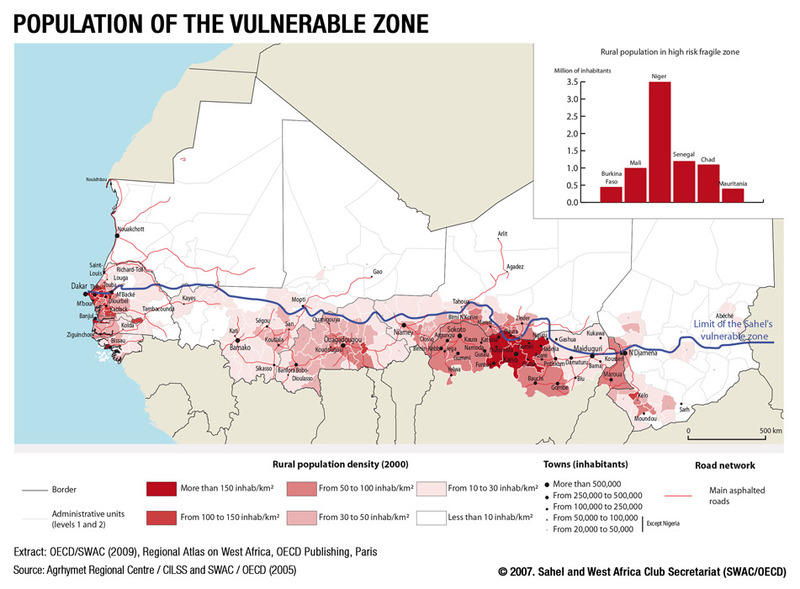 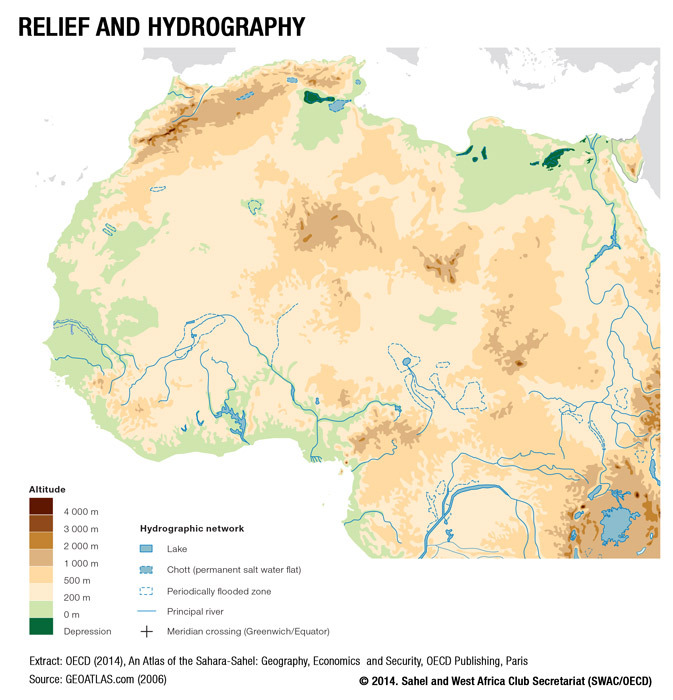 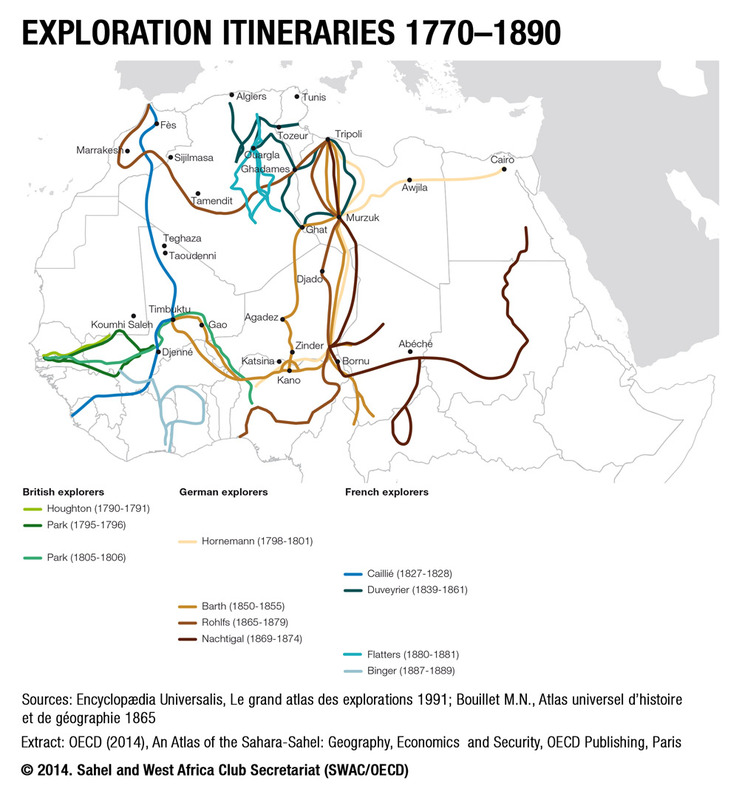 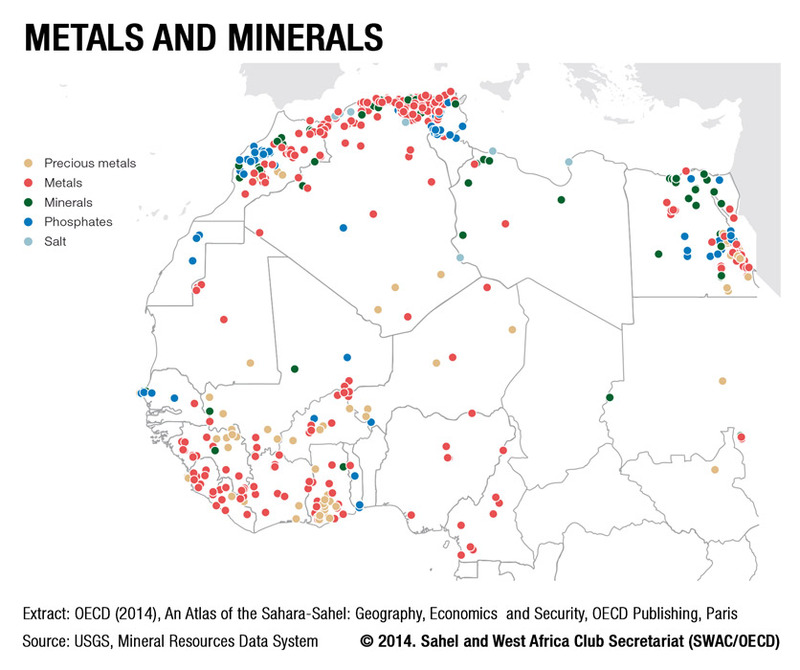 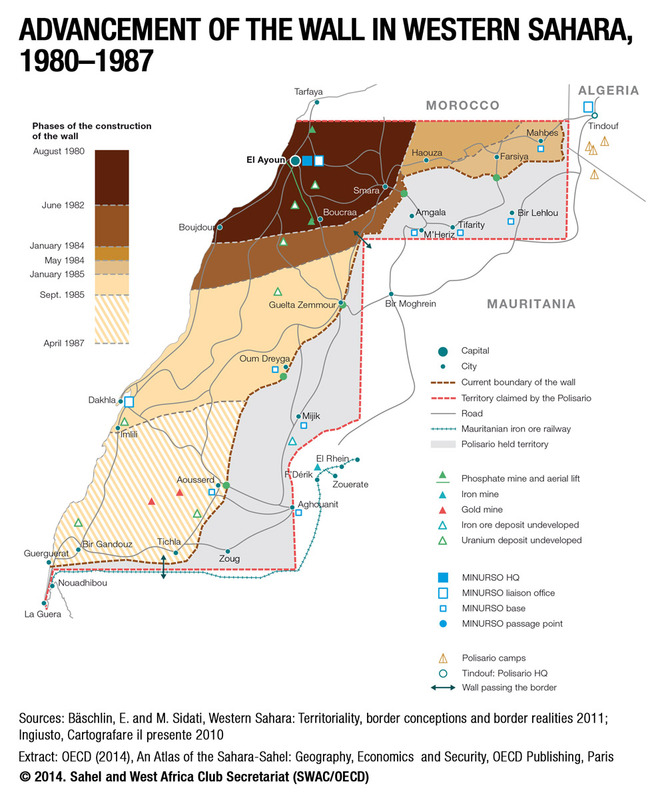 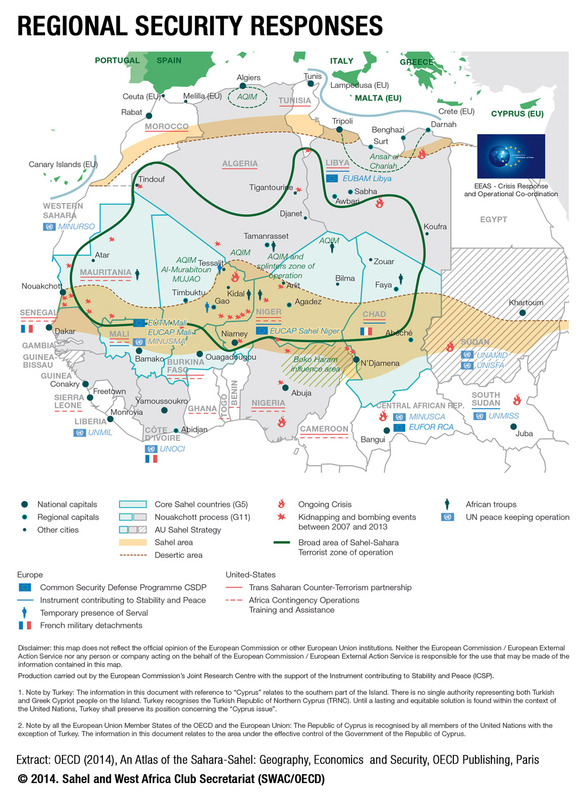 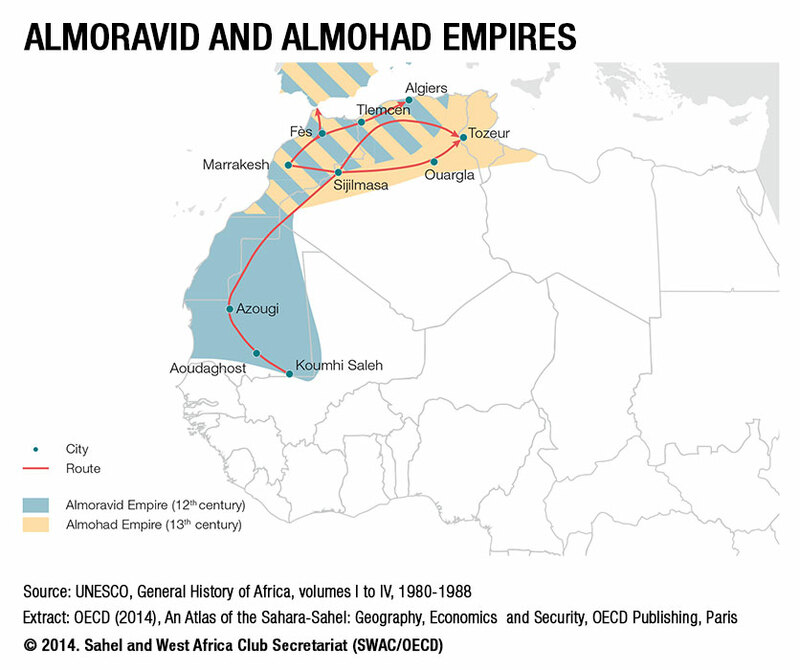 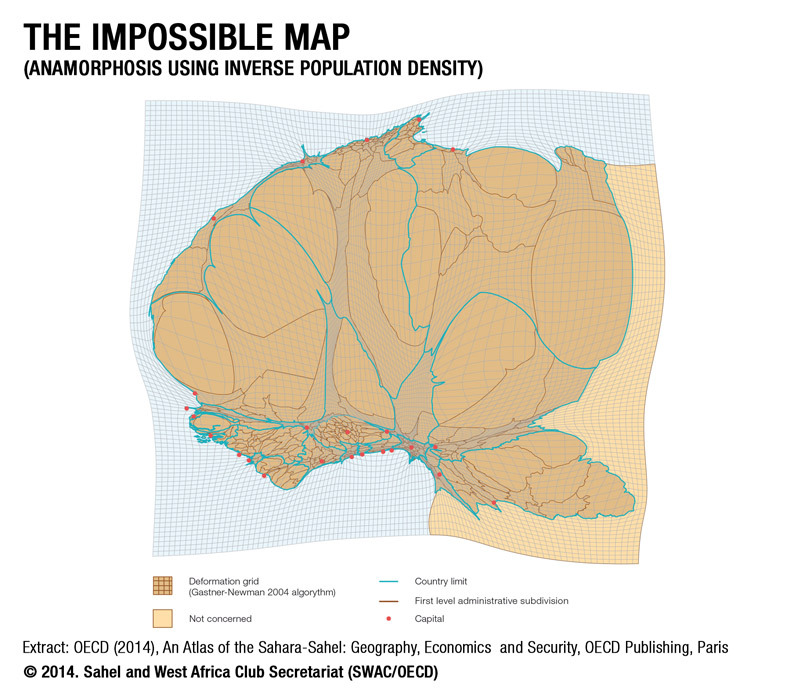 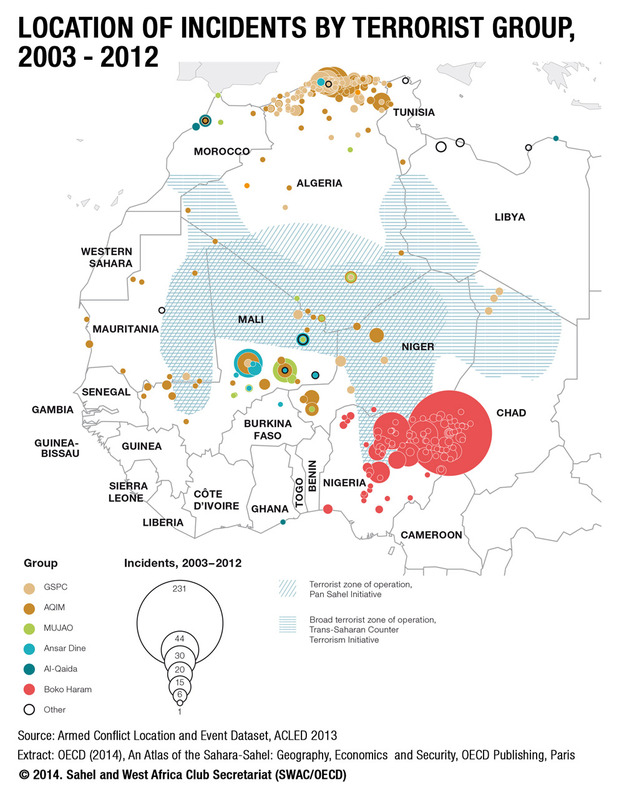 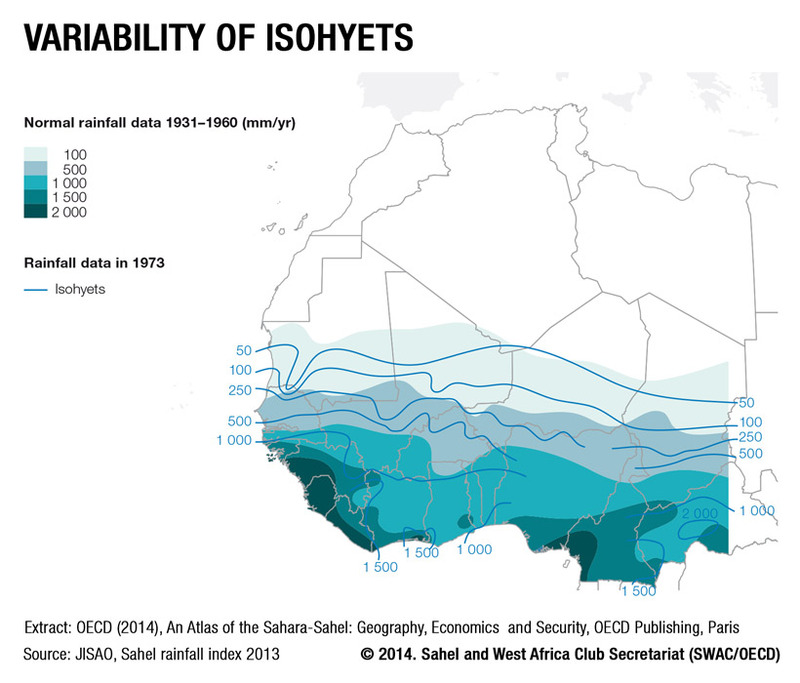 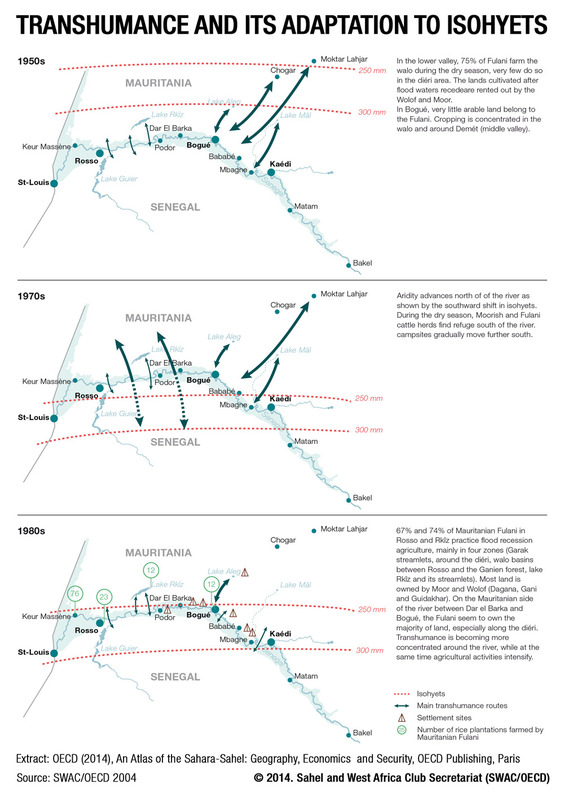 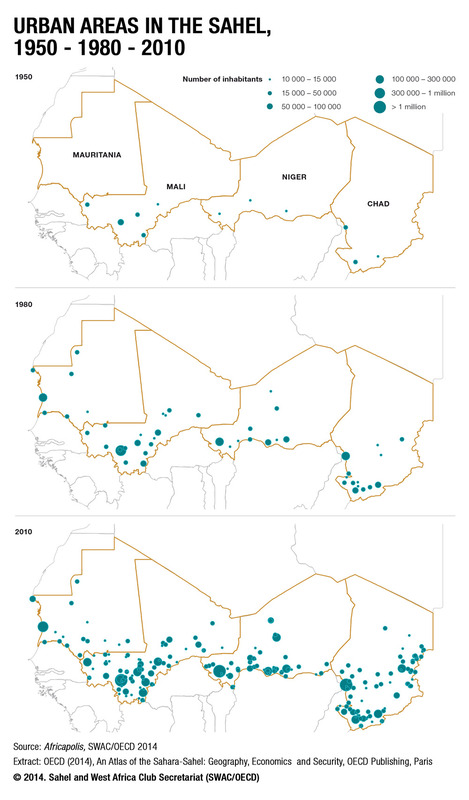 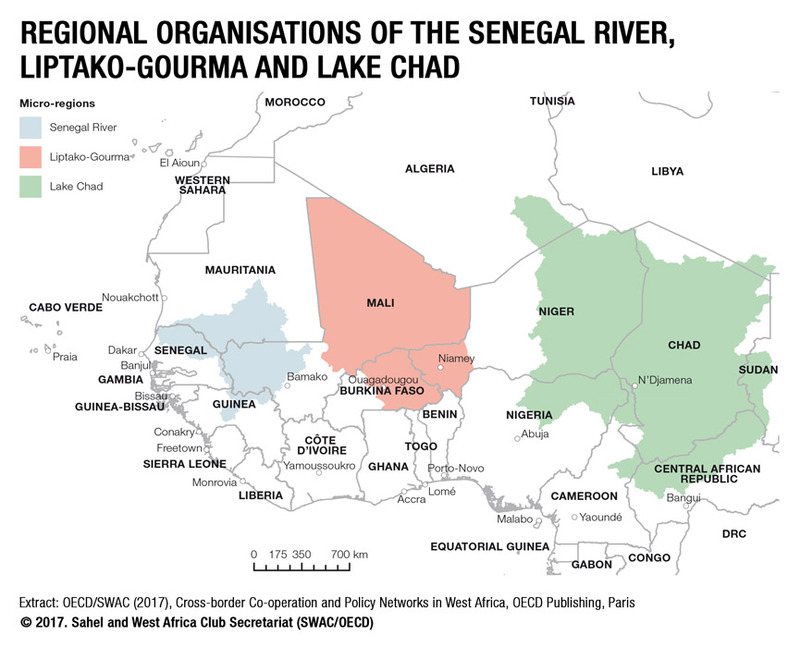 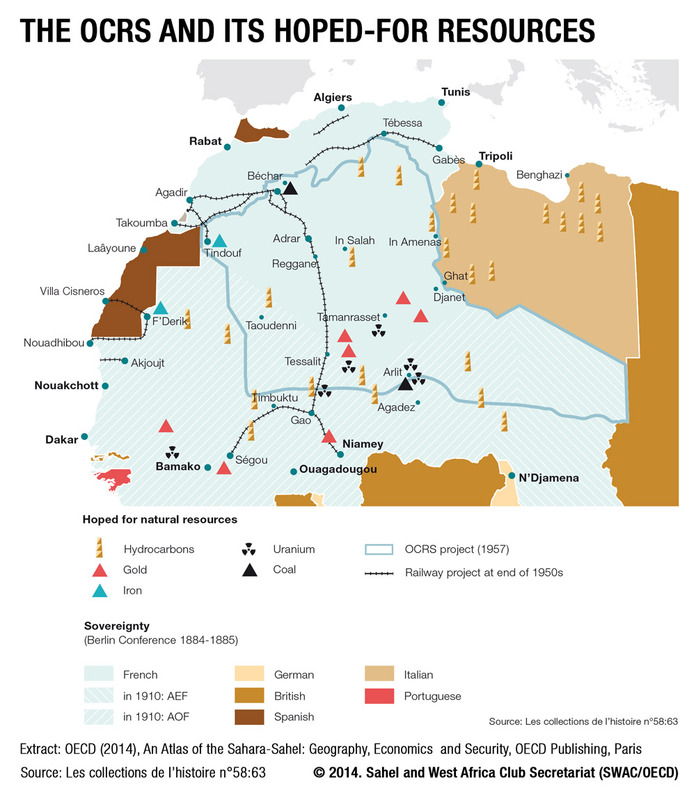 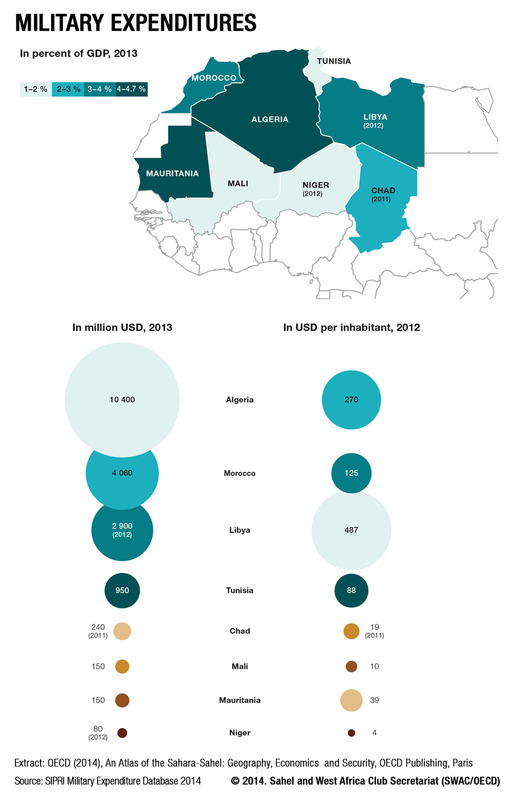 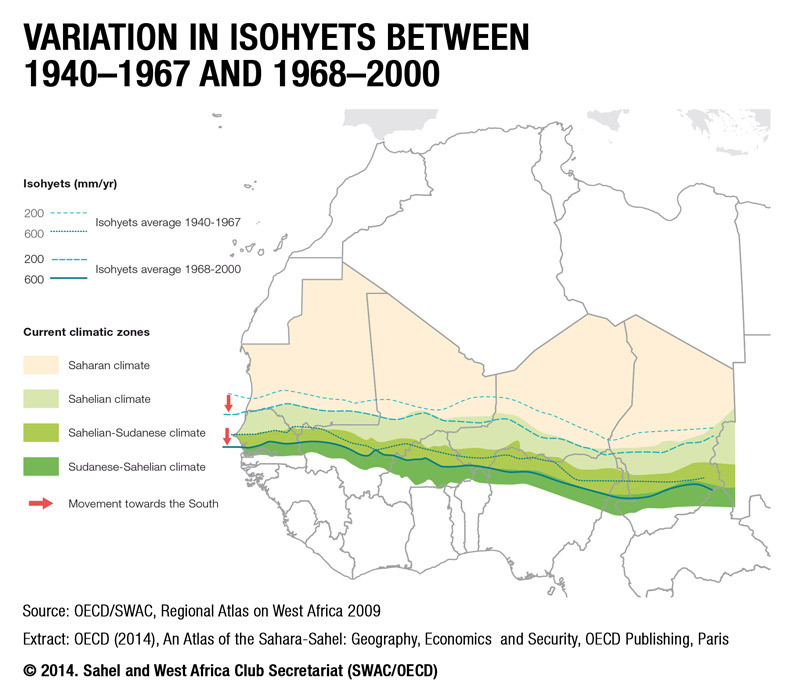 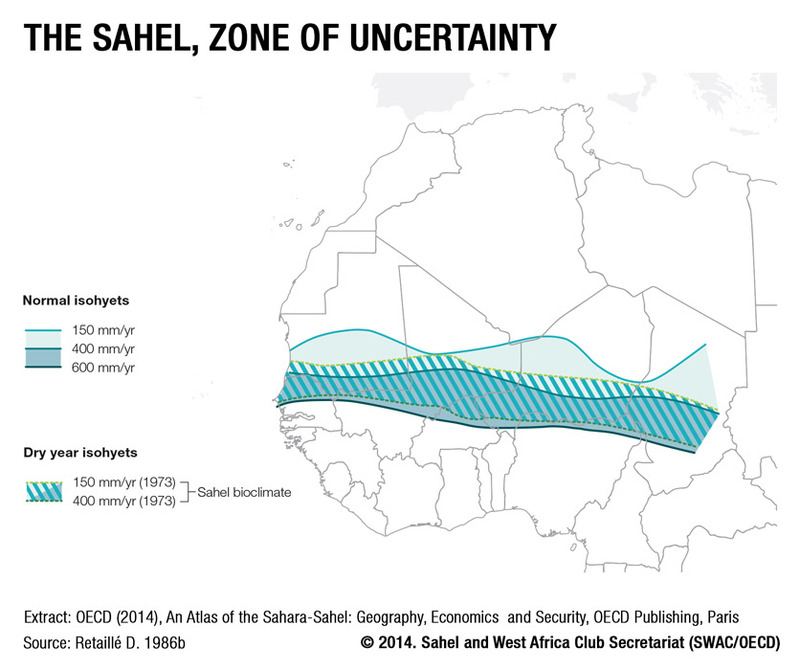 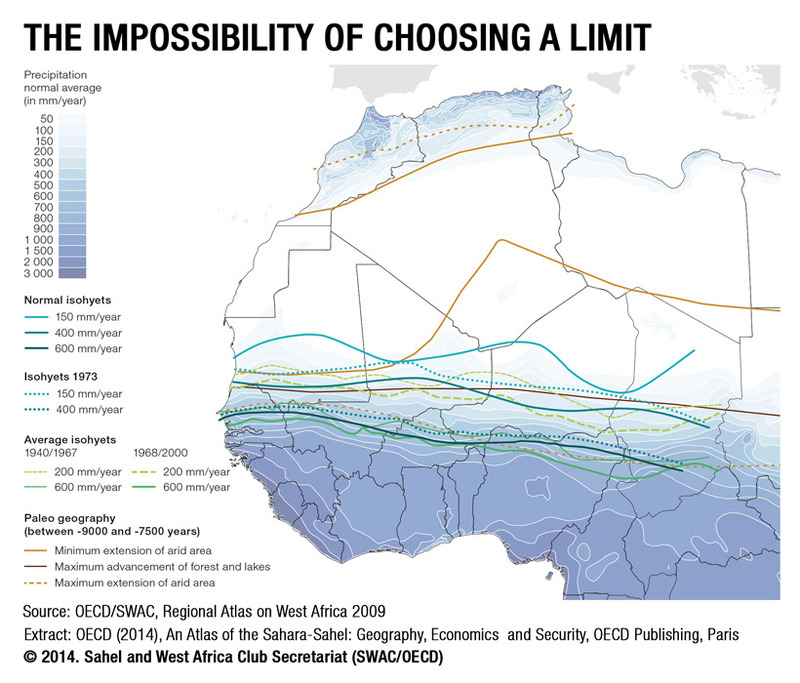 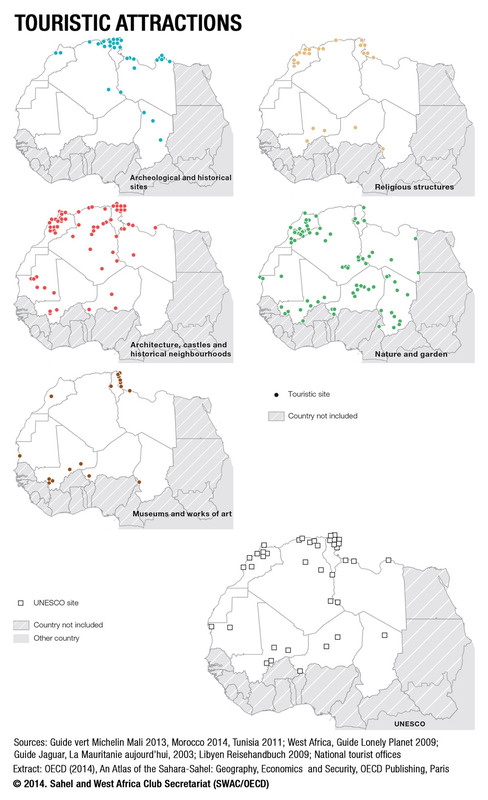 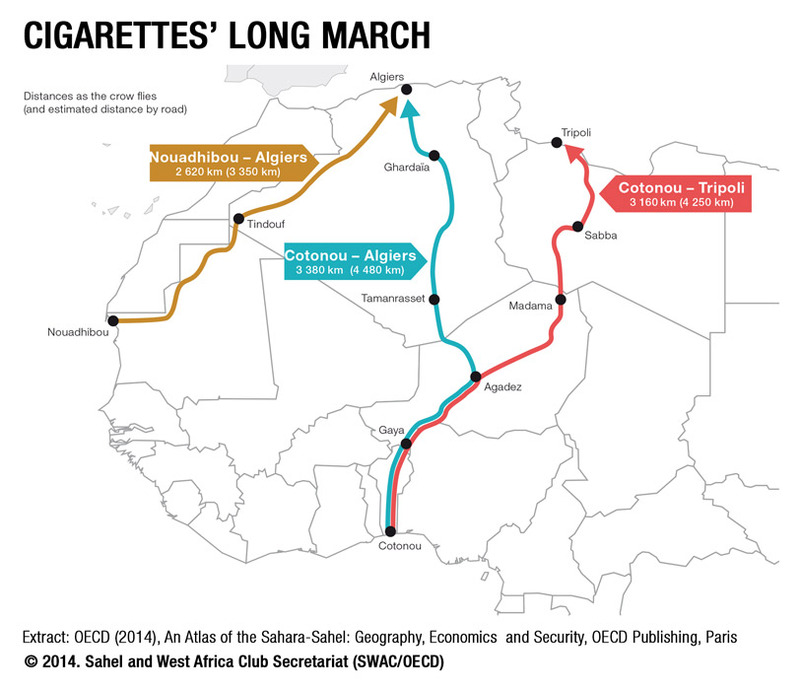 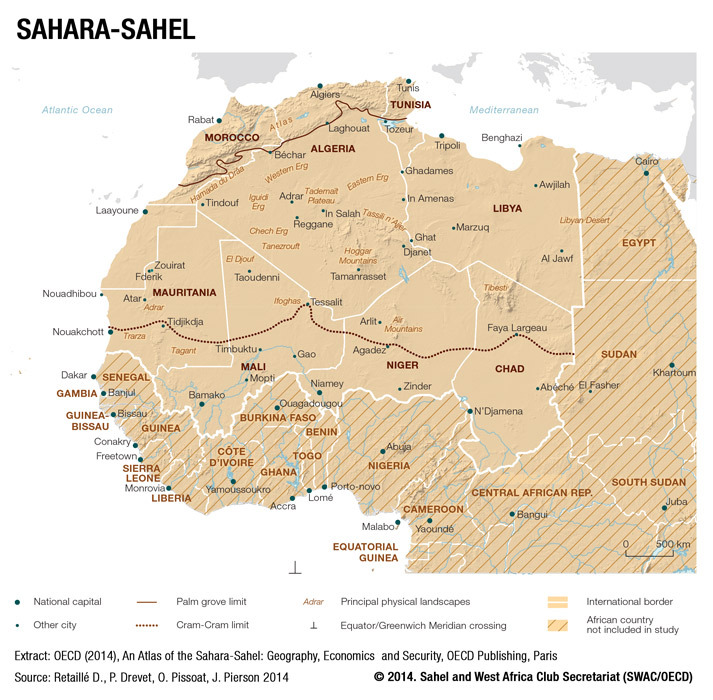 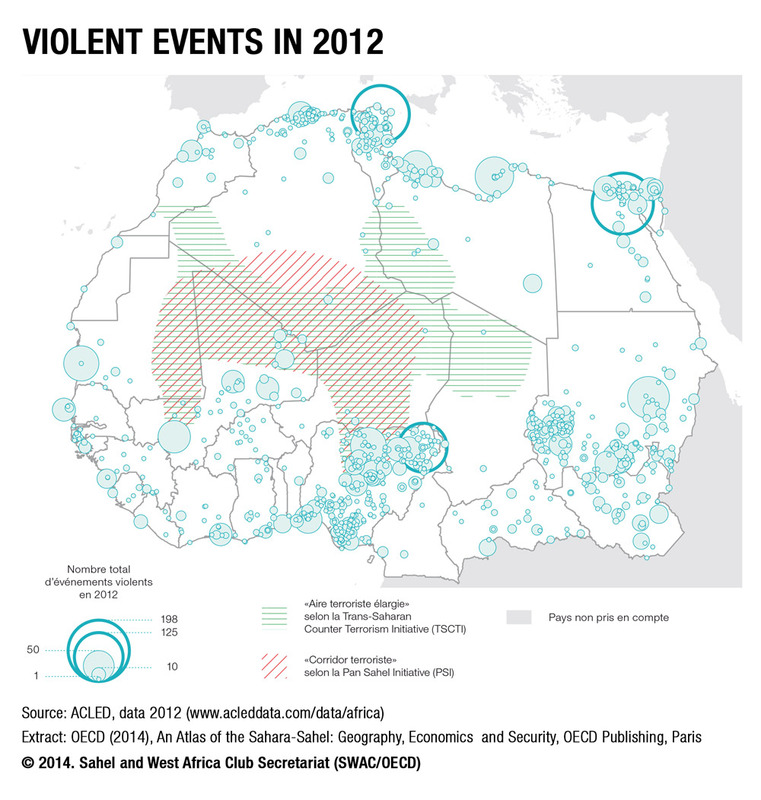 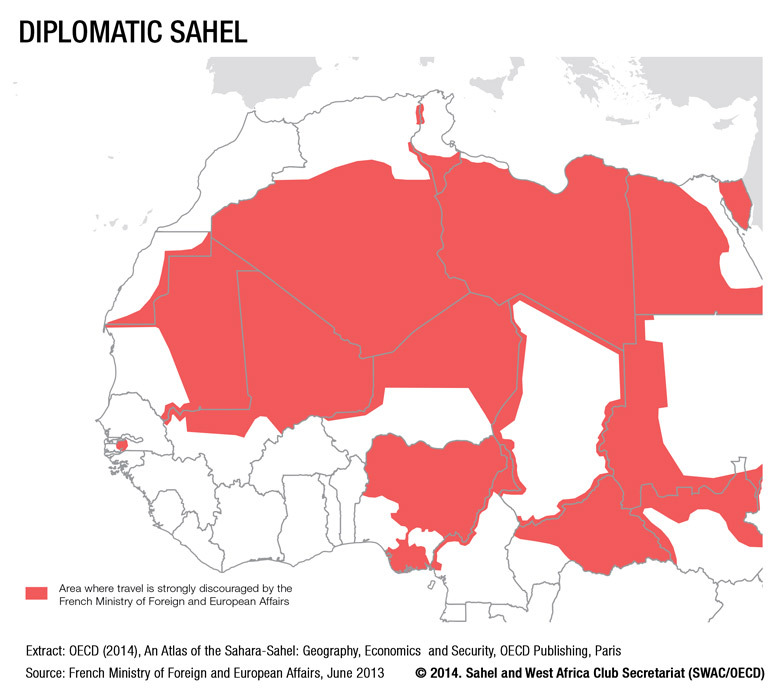 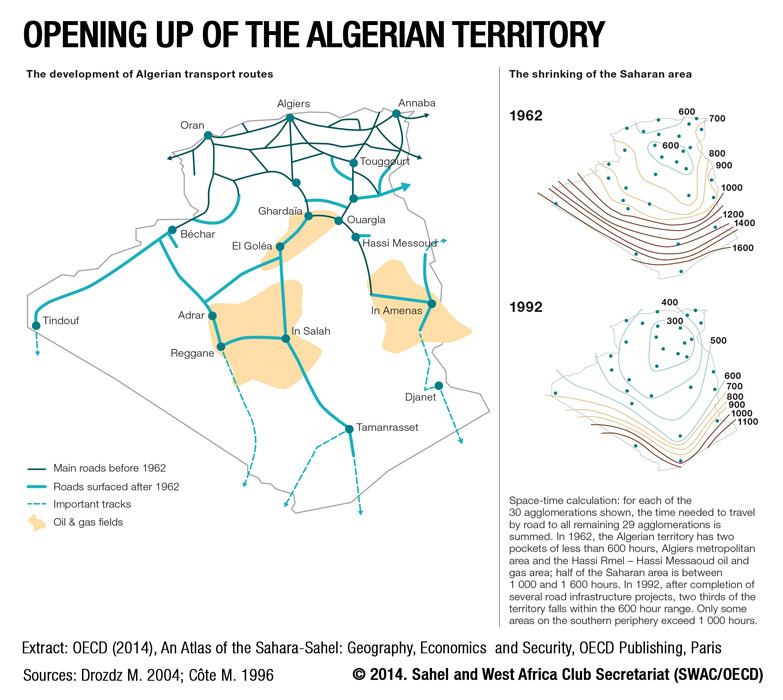 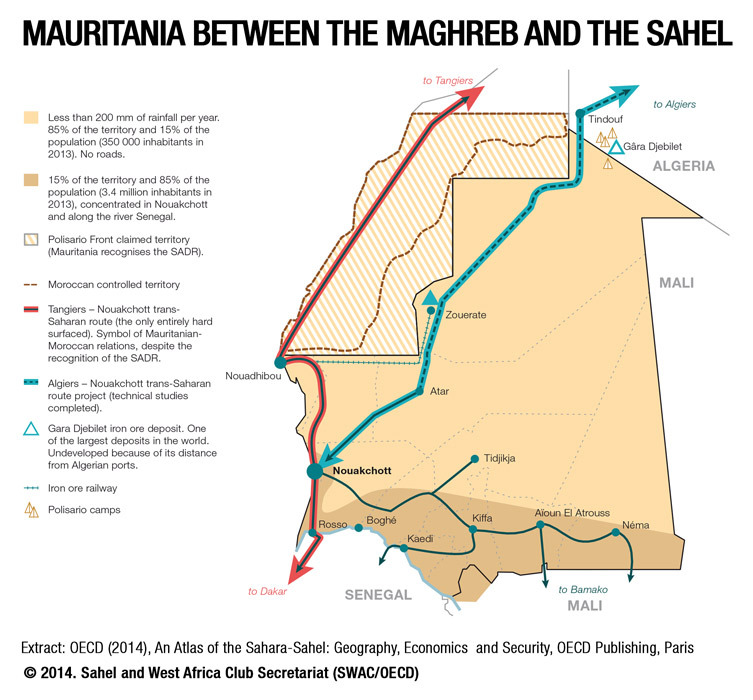 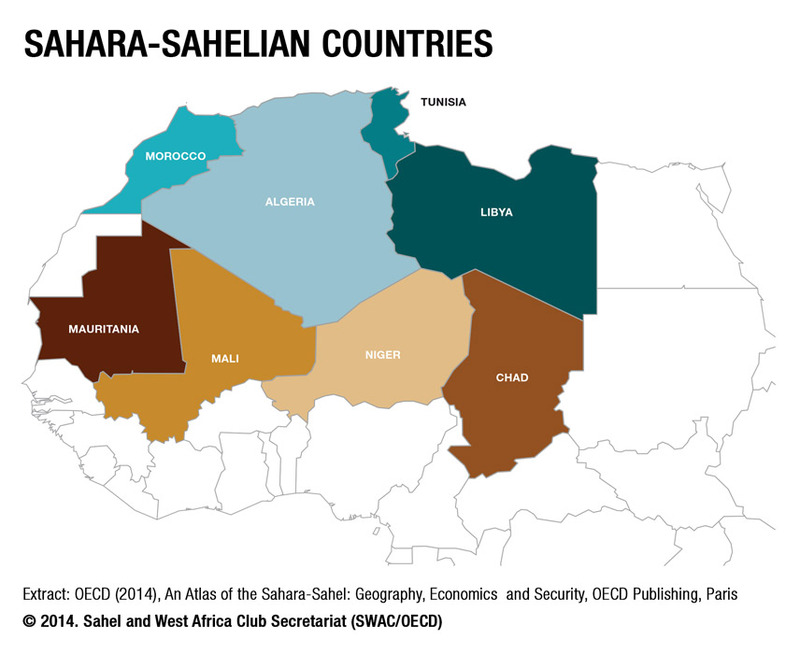 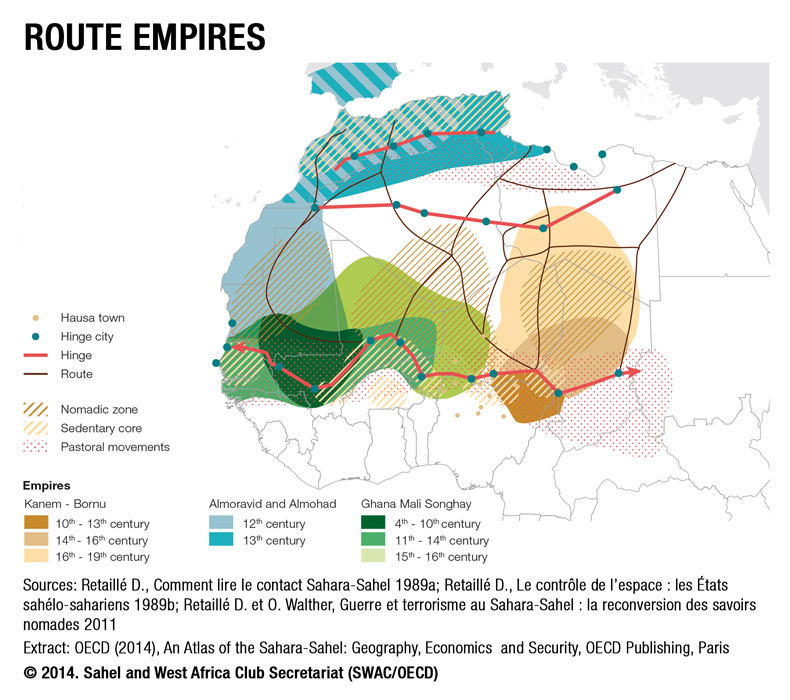 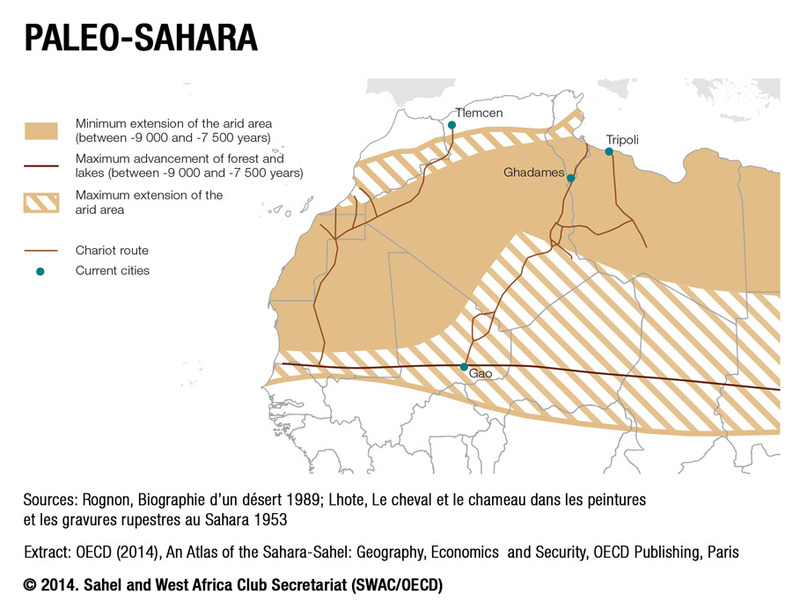 ‌The following maps are extracted from the OECD publication "An Atlas of the Sahara-Sahel, Geography, Economics and Security", published in December 2014. 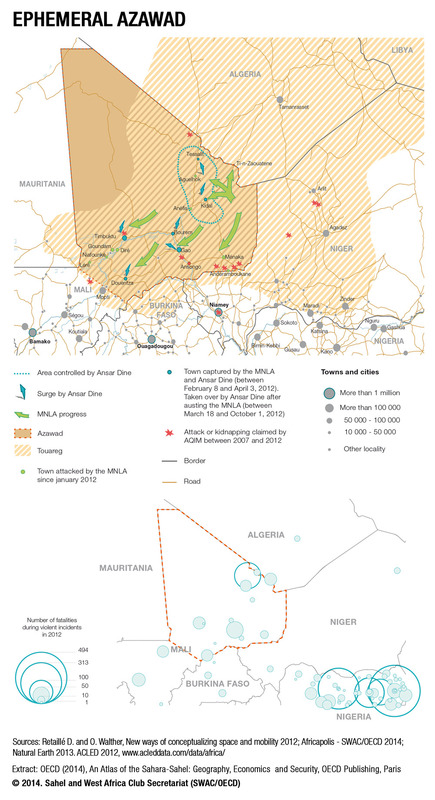 The 250‑page publication is illustrated with 105 maps. 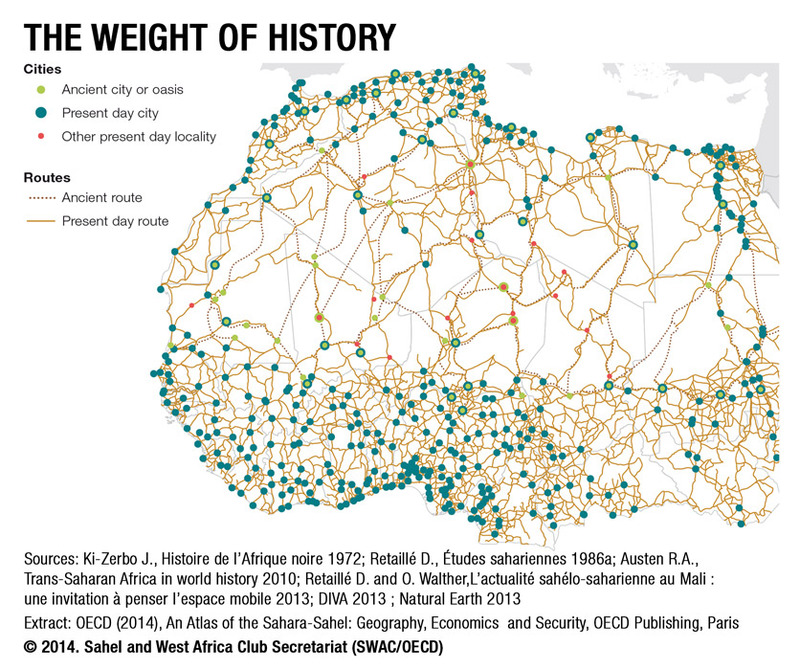 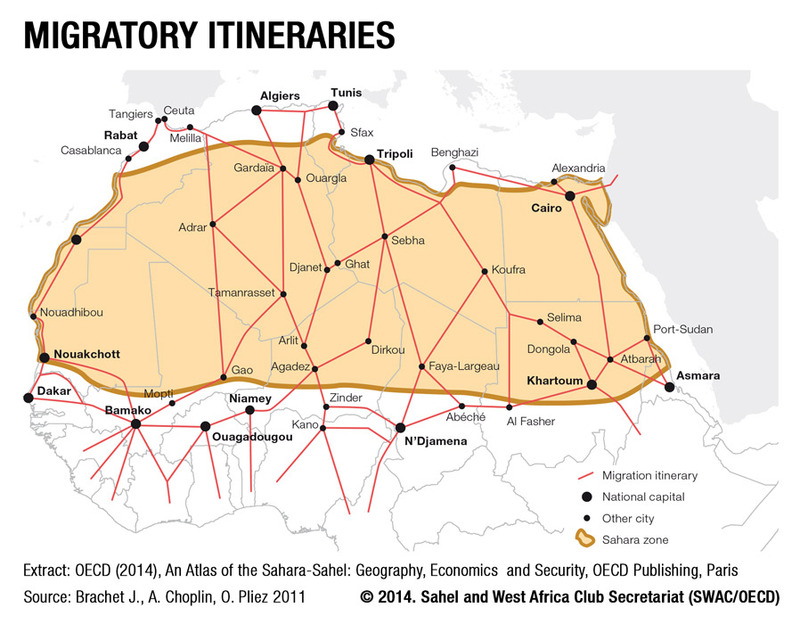 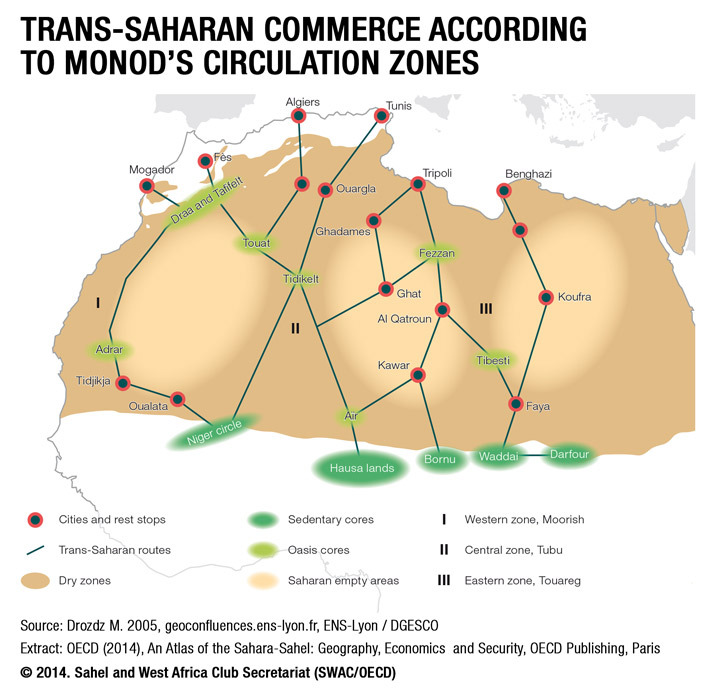 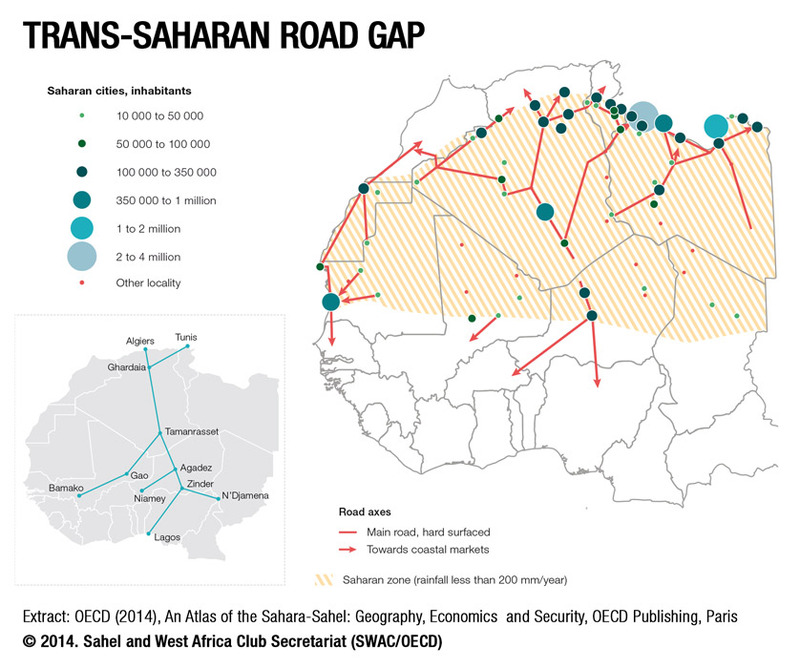 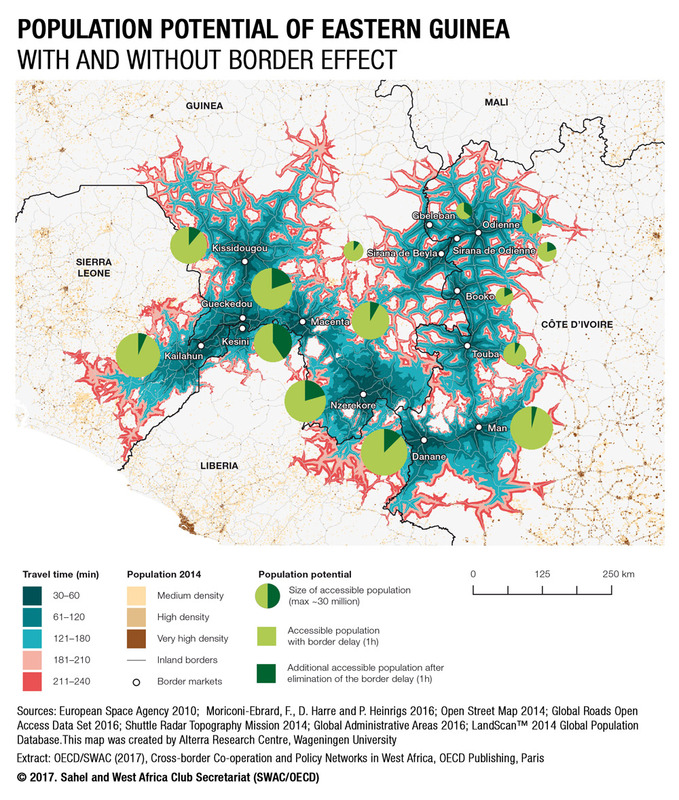 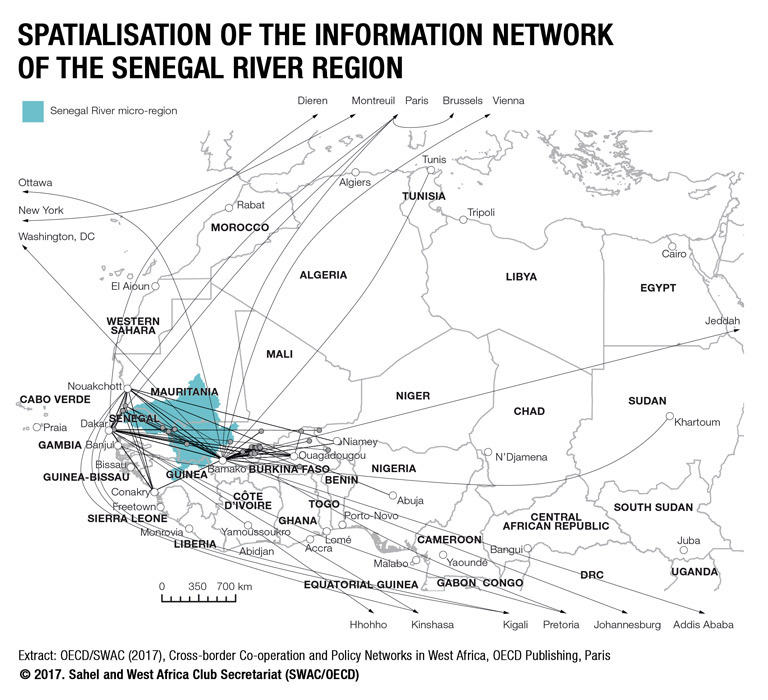 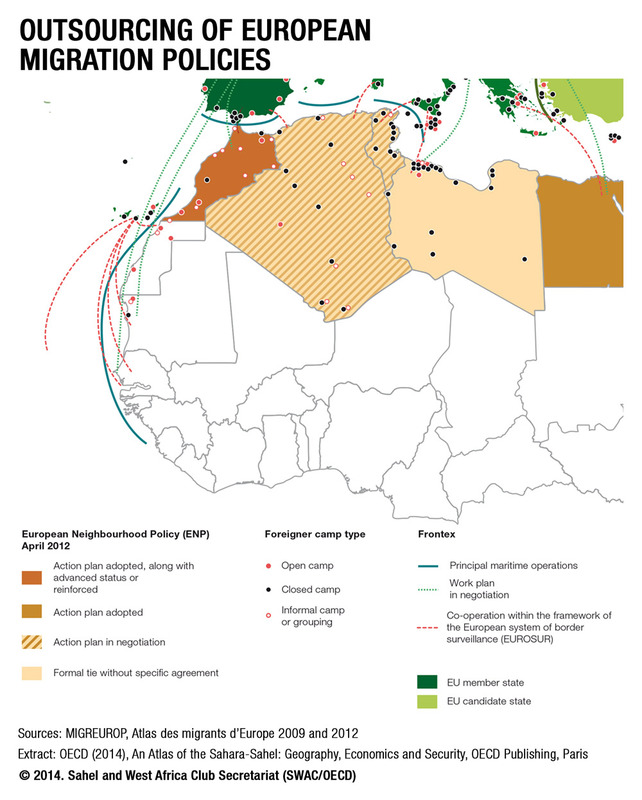 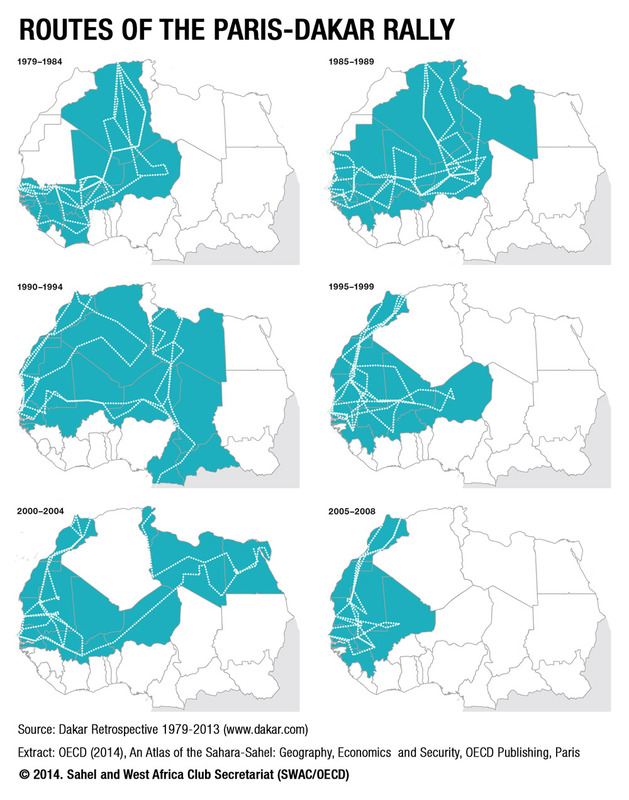 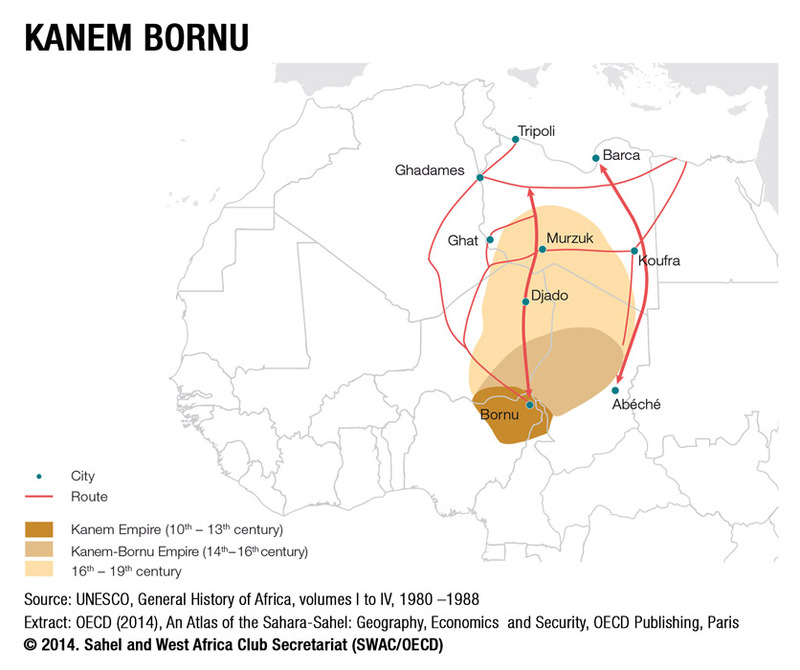 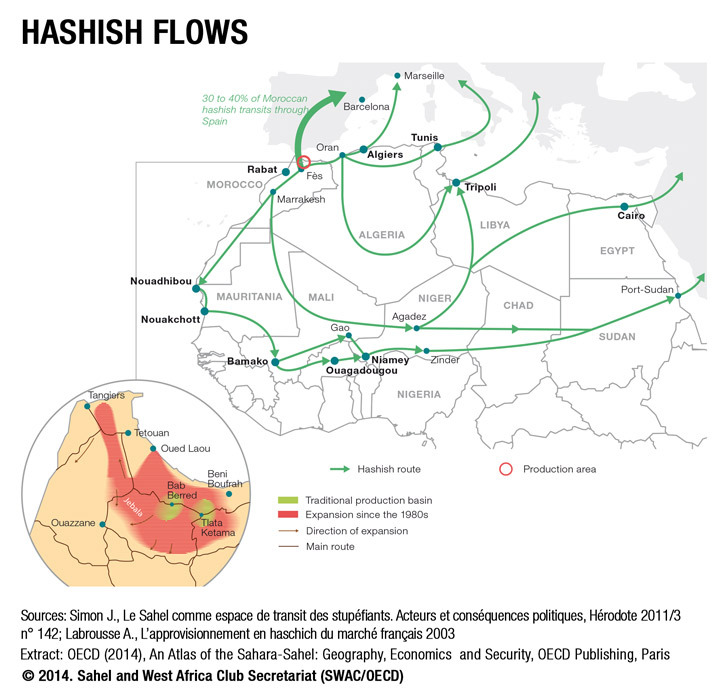 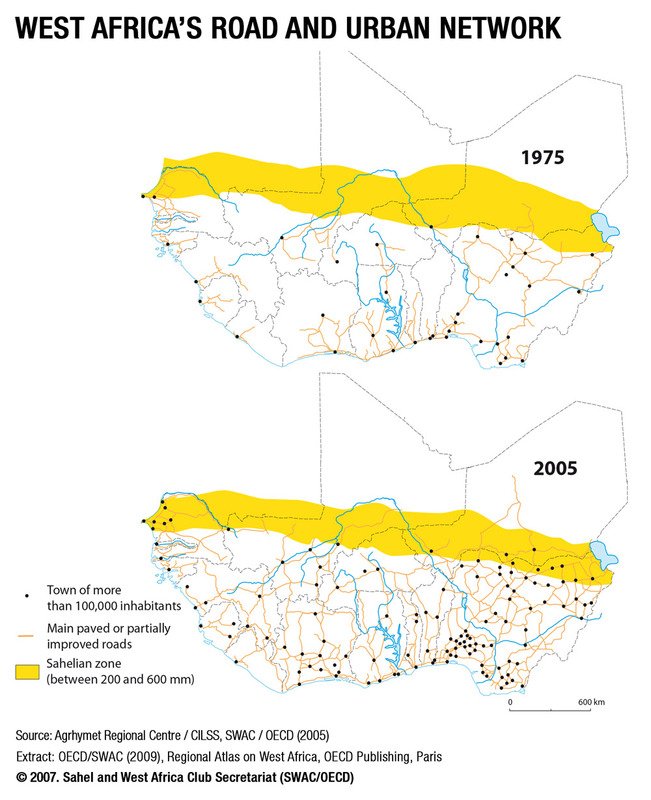 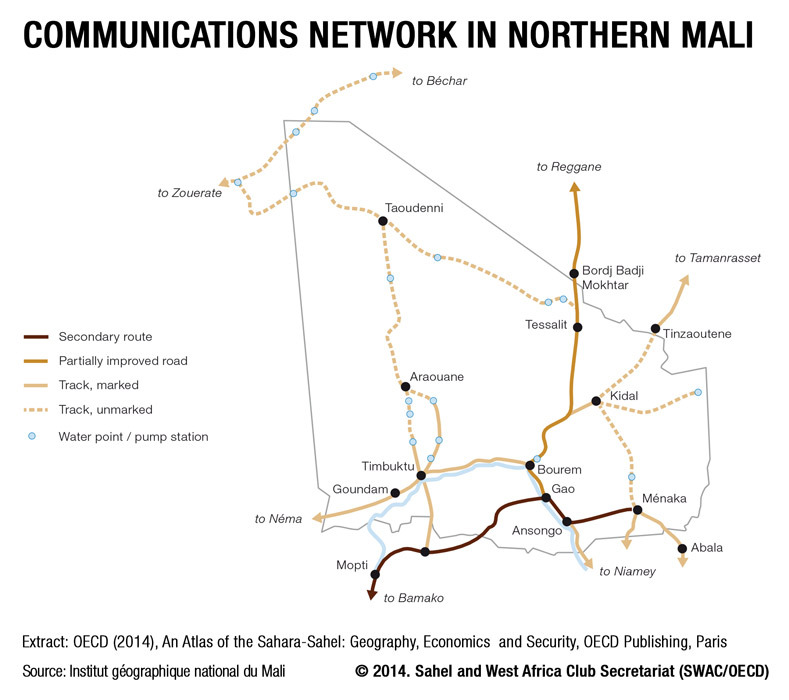 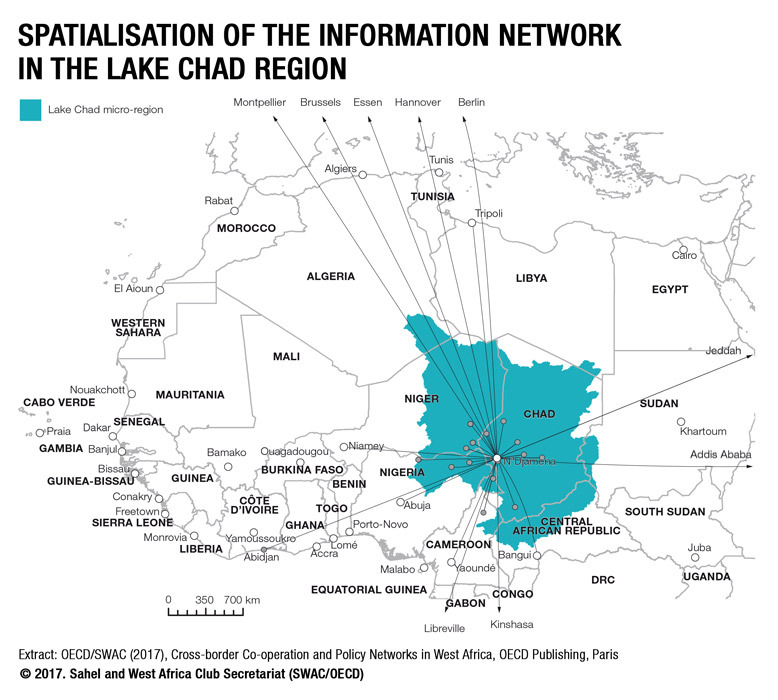 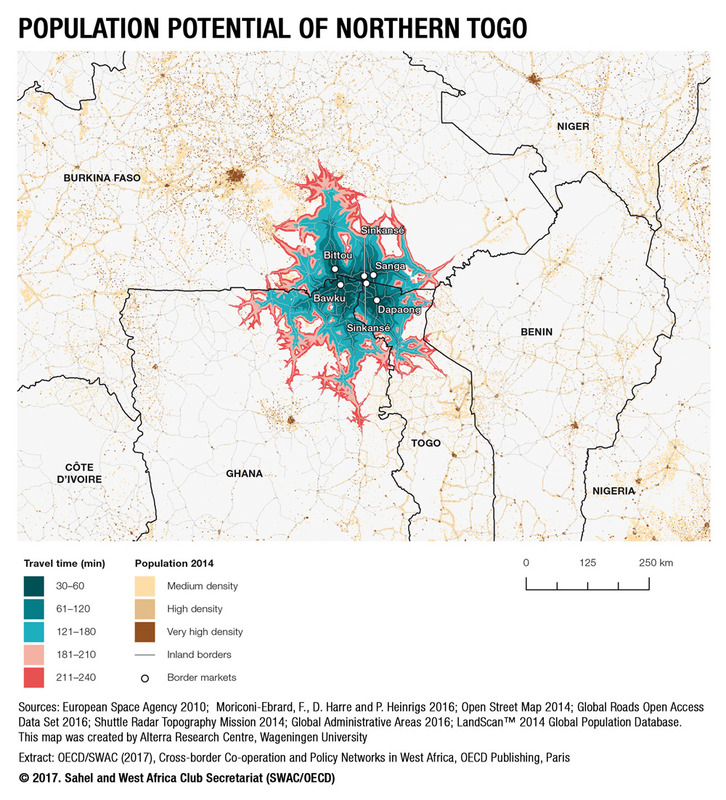 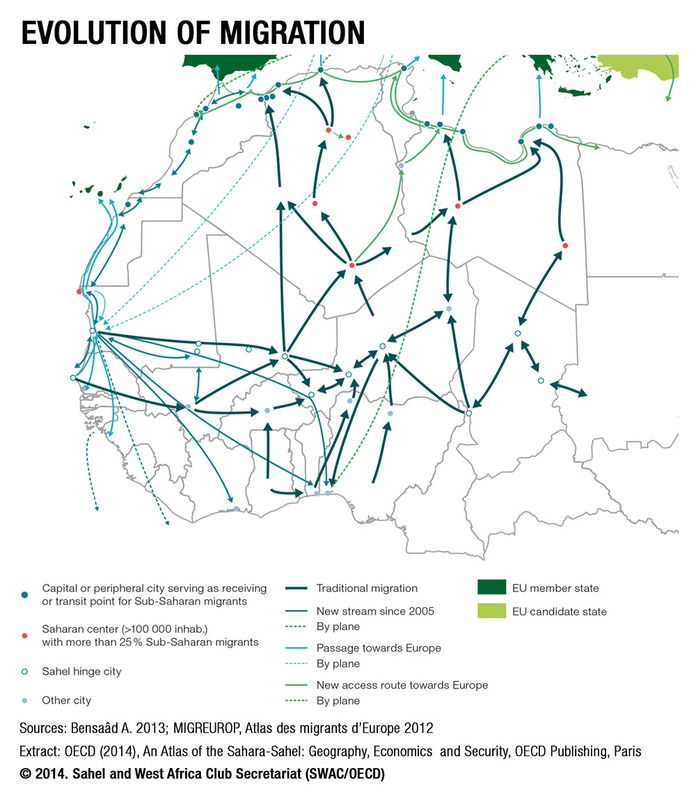 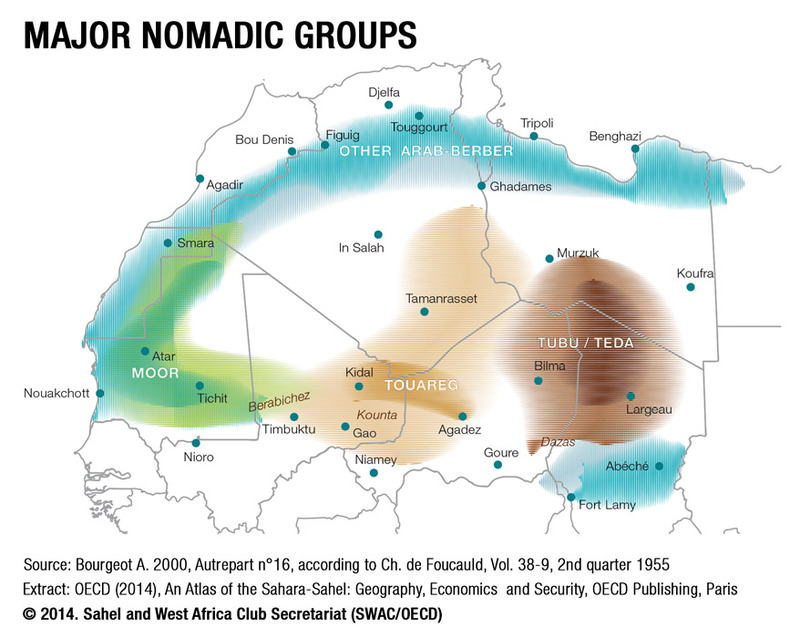 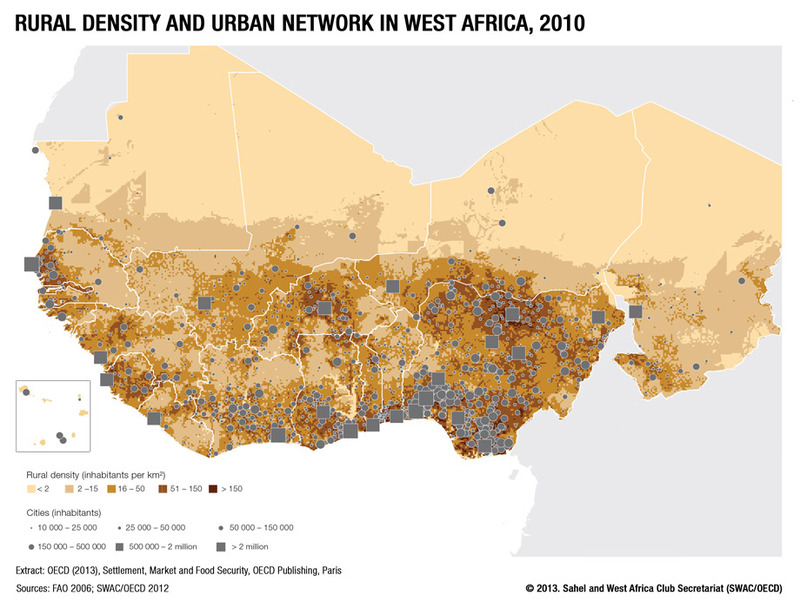 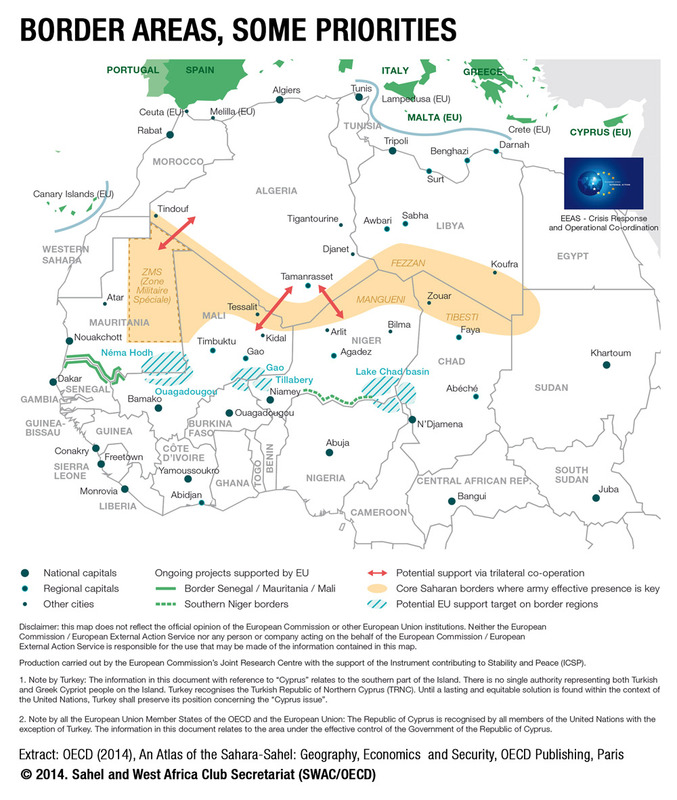 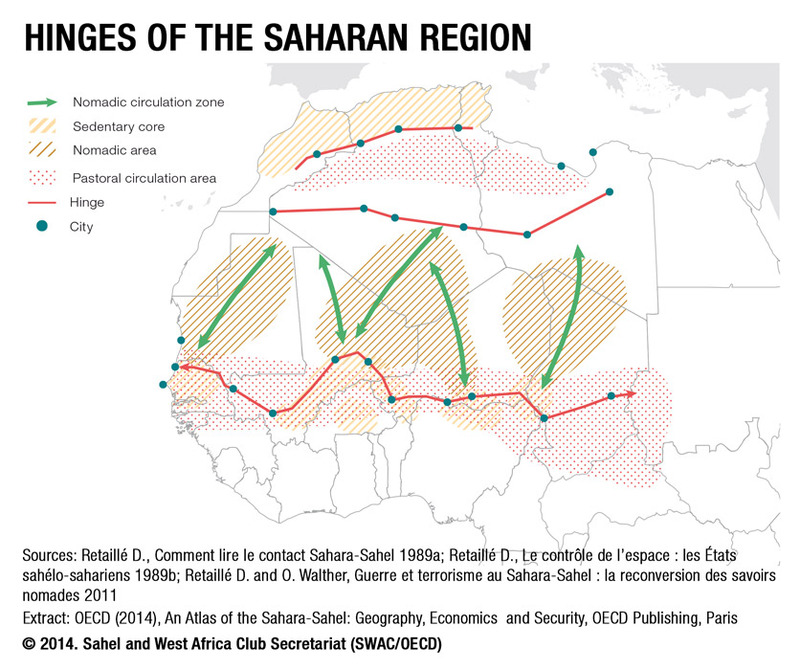 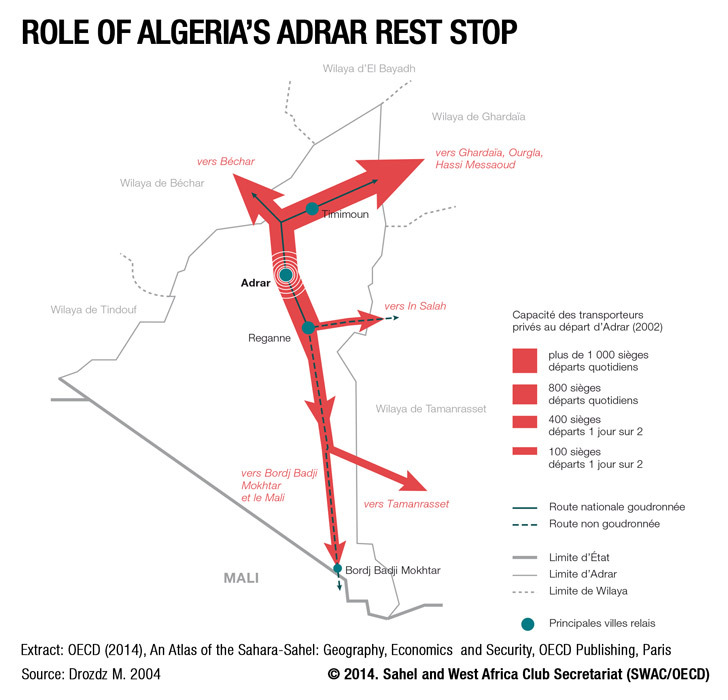 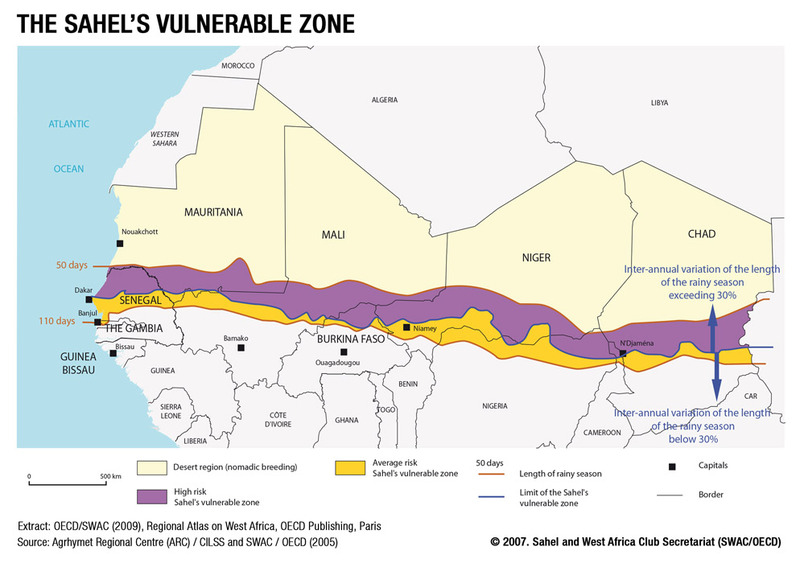 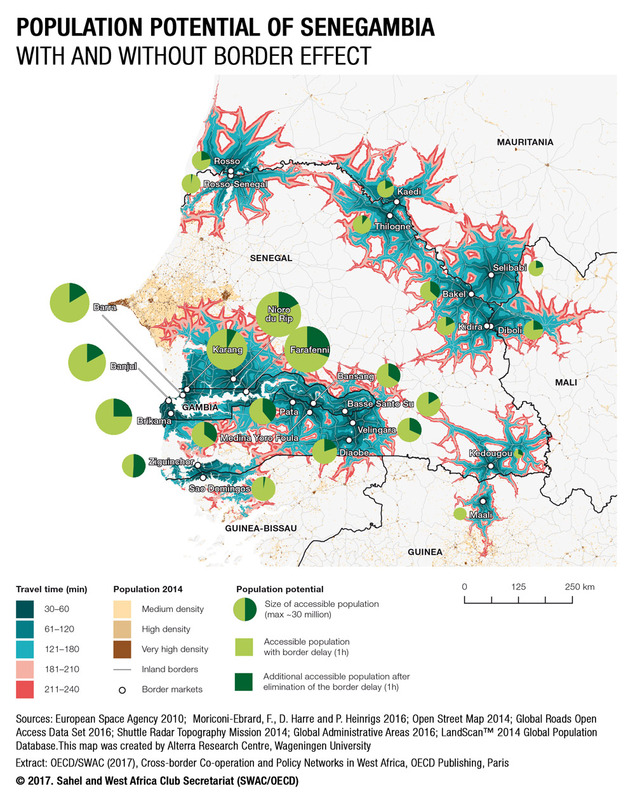 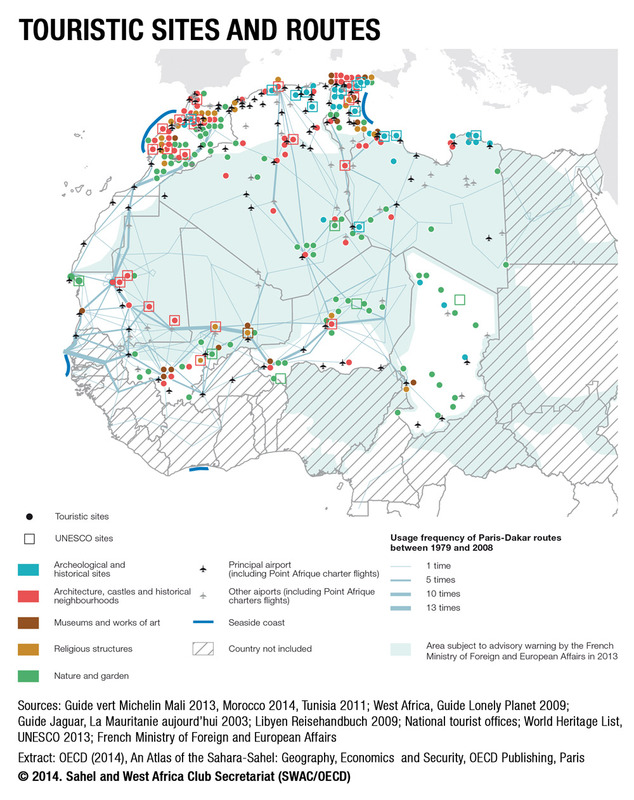 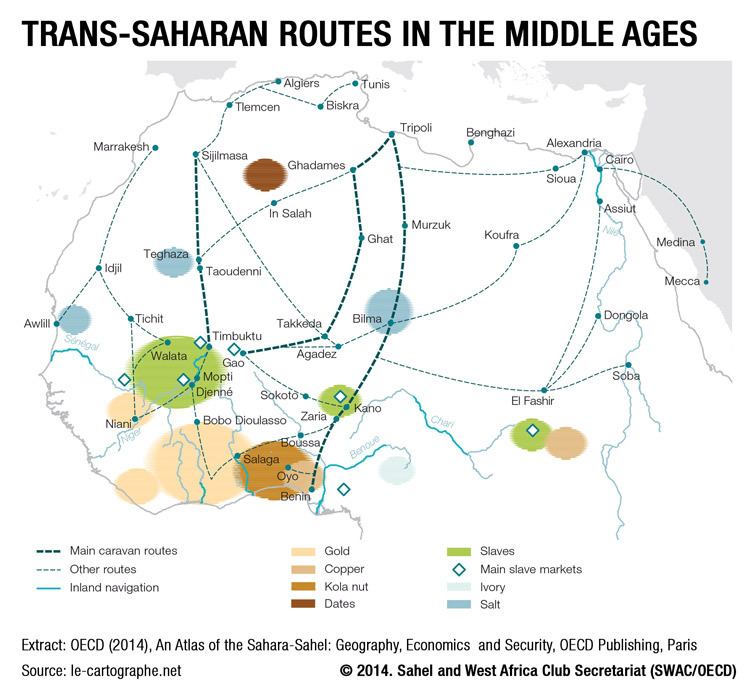 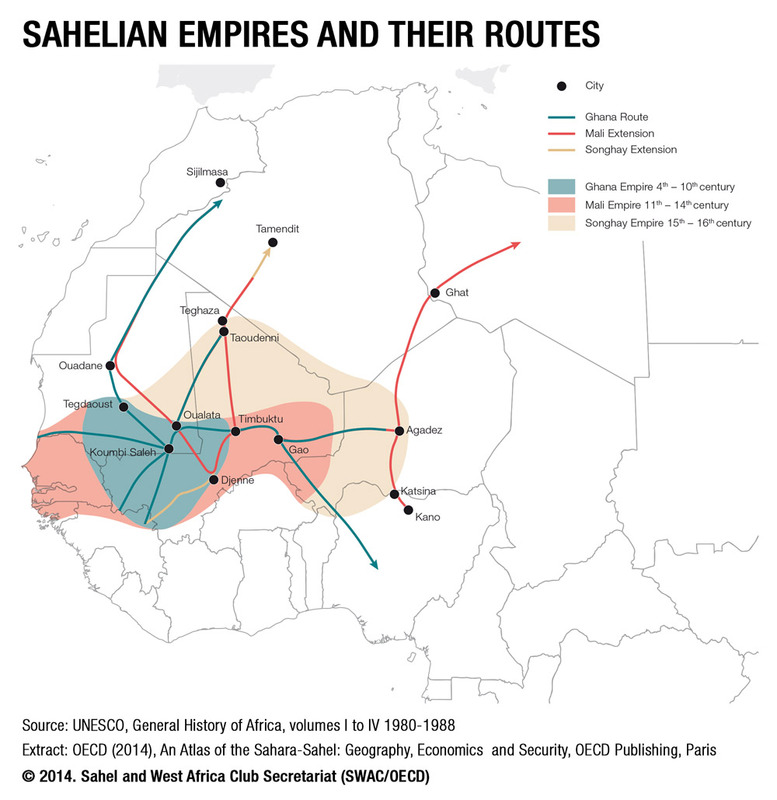 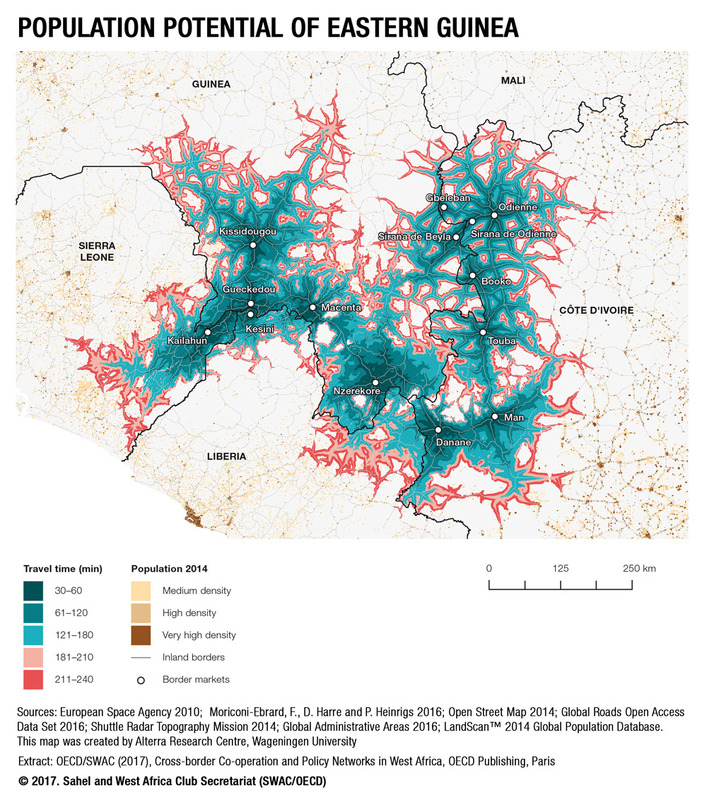 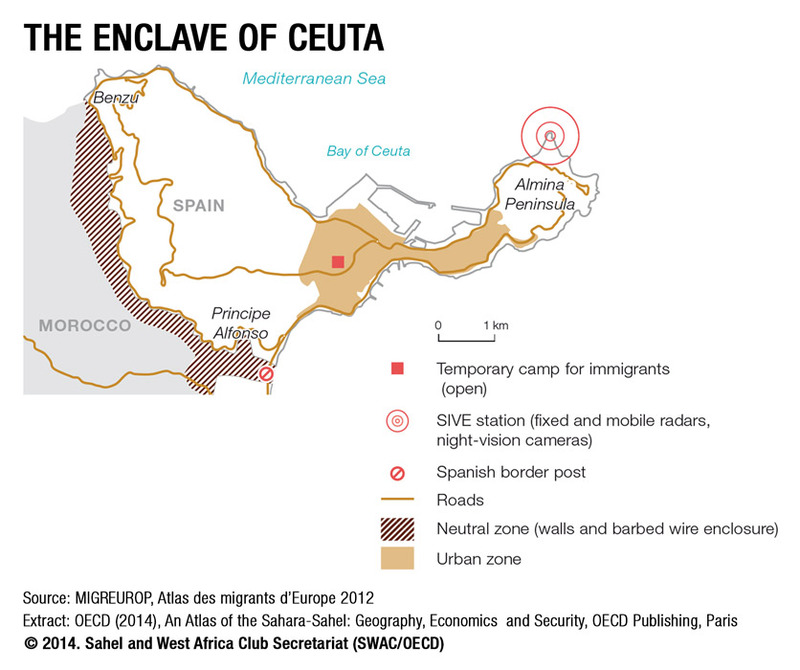 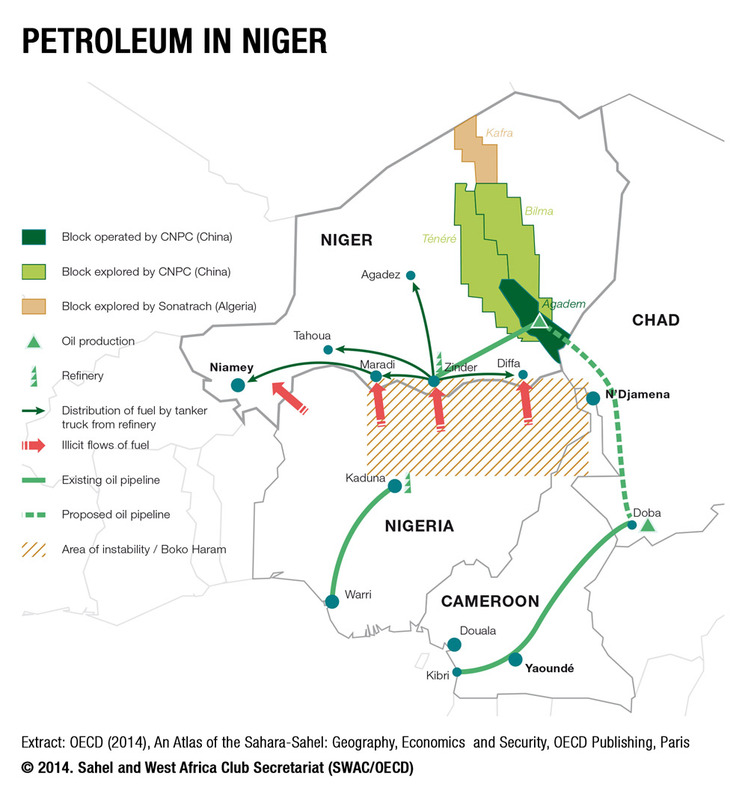 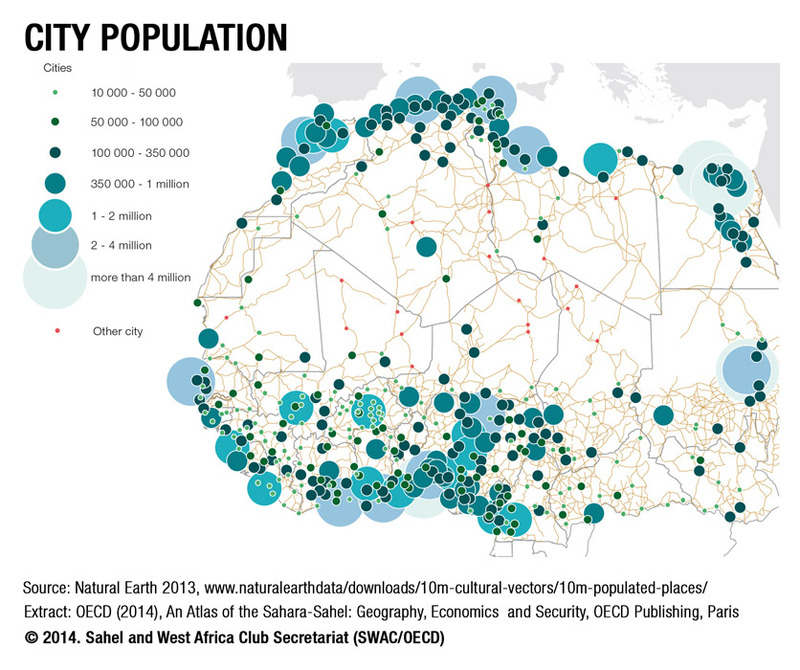 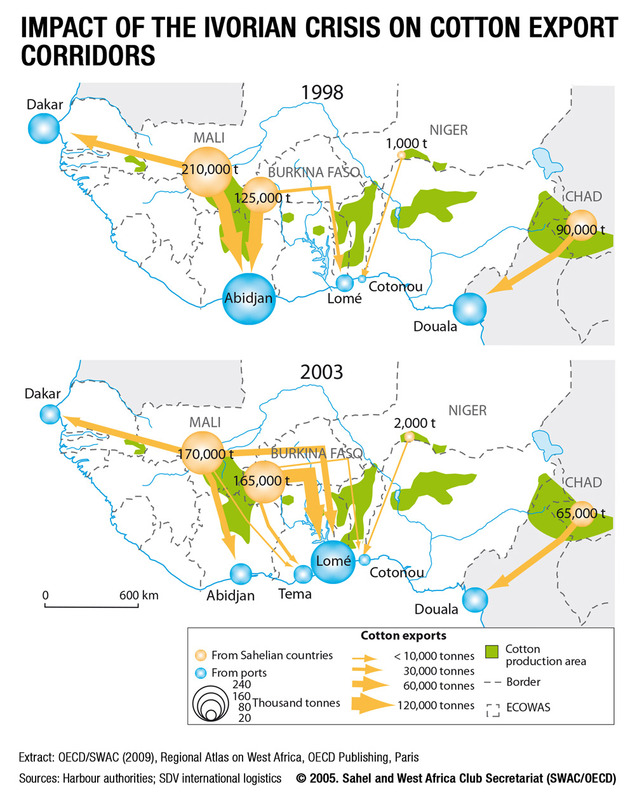 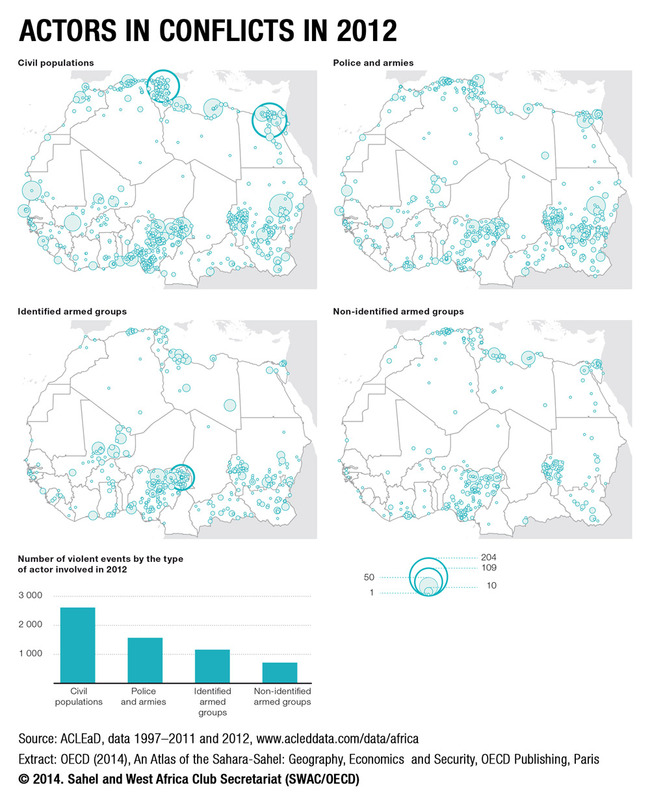 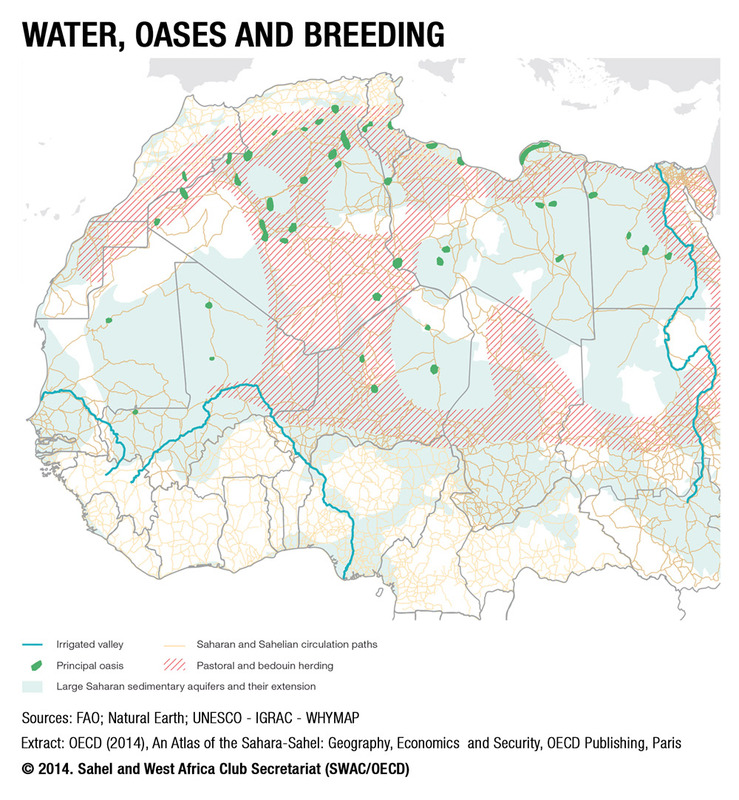 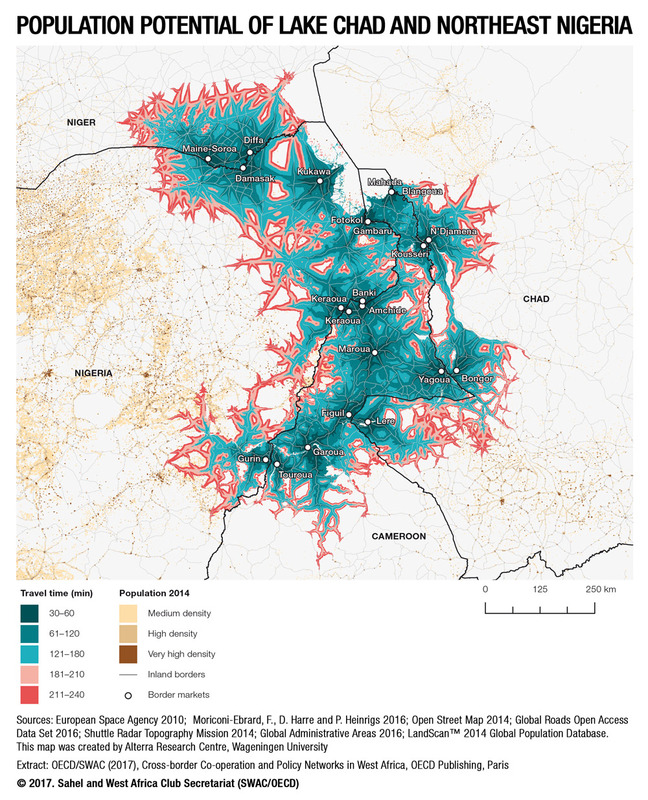 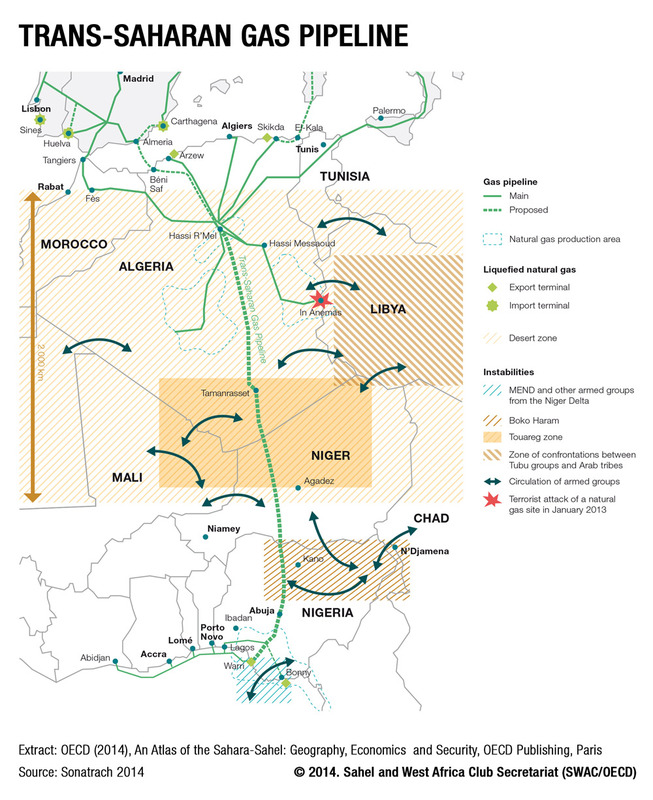 It addresses security challenges in the Sahara-Sahelian area by considering the mobility of its territories and populations in conjunction with the socio-economic networks that connect them. 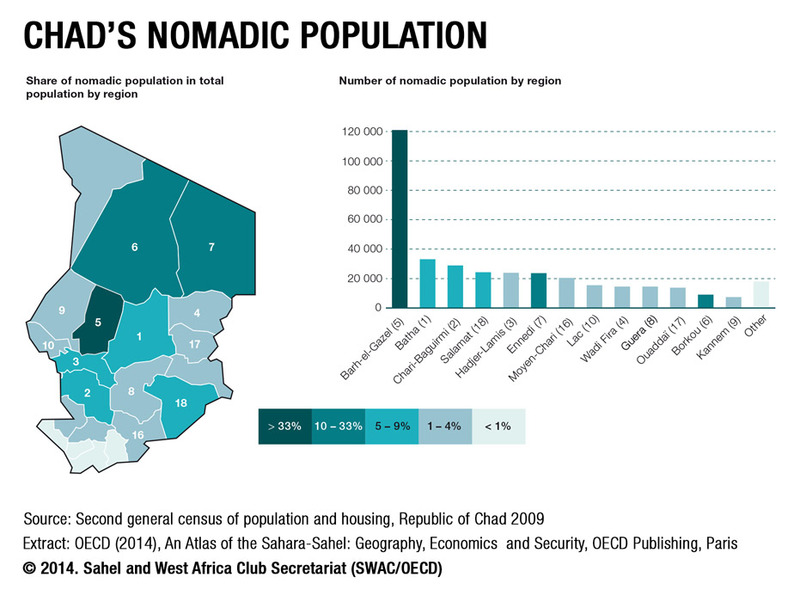 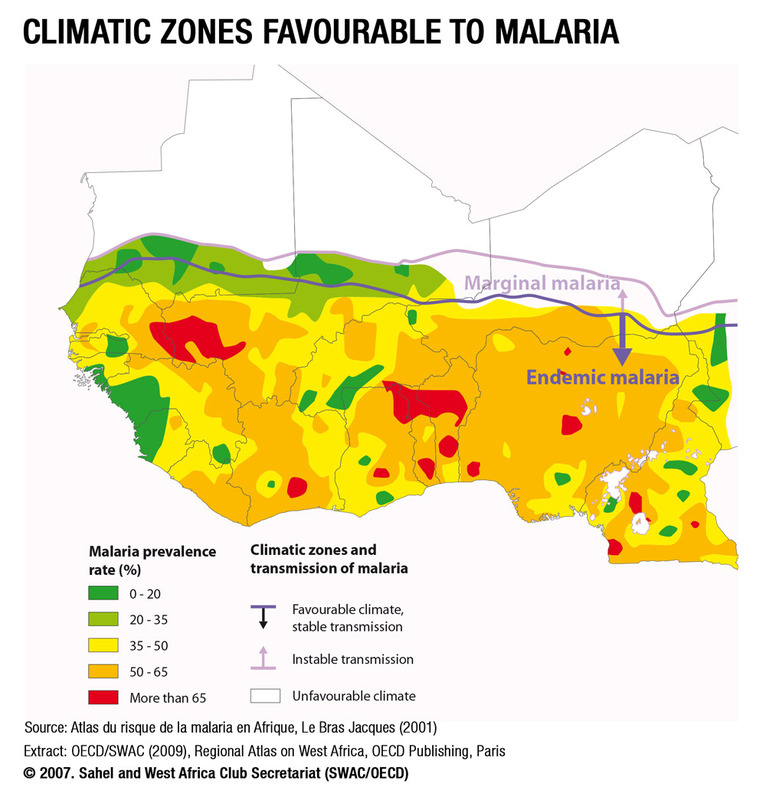 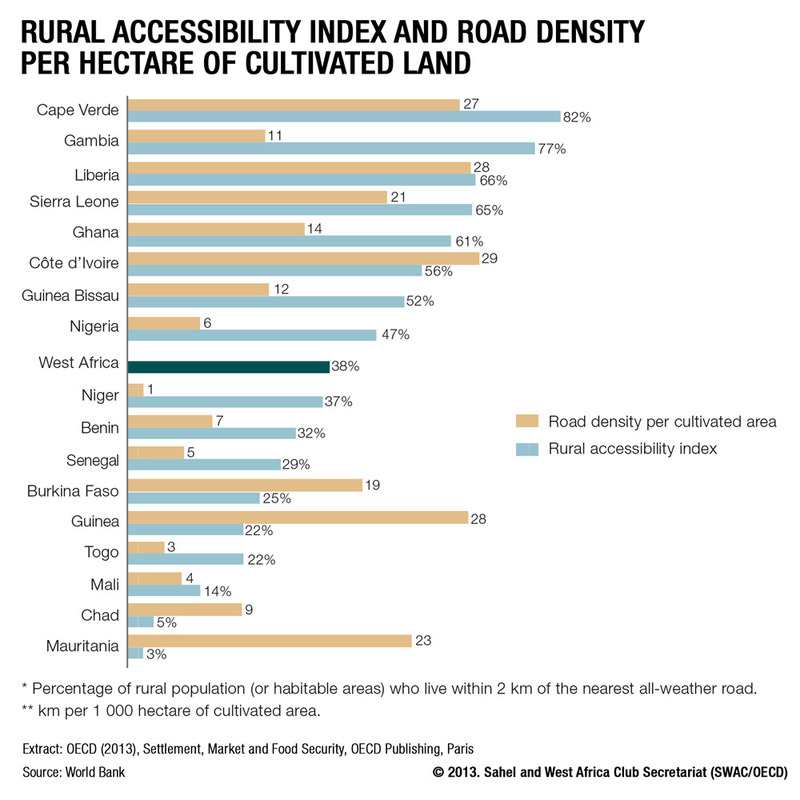 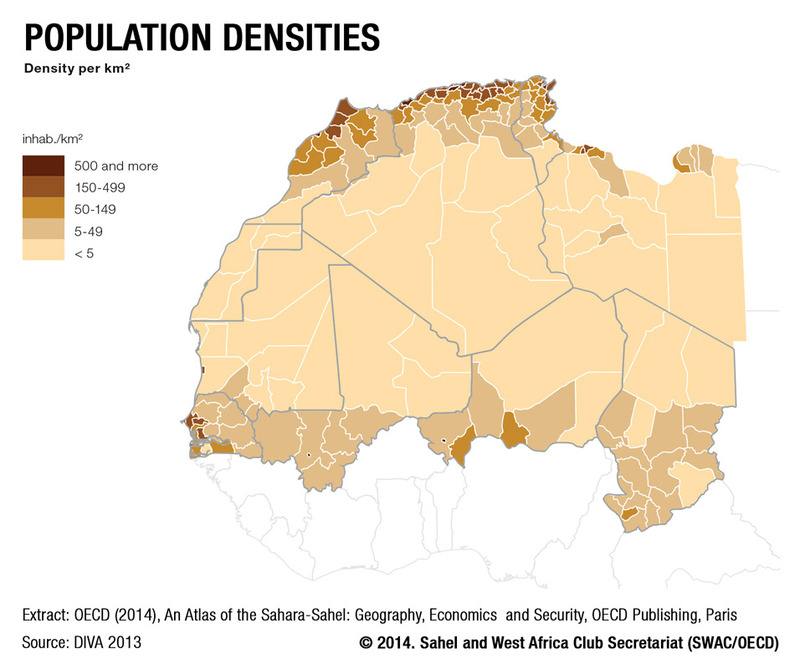 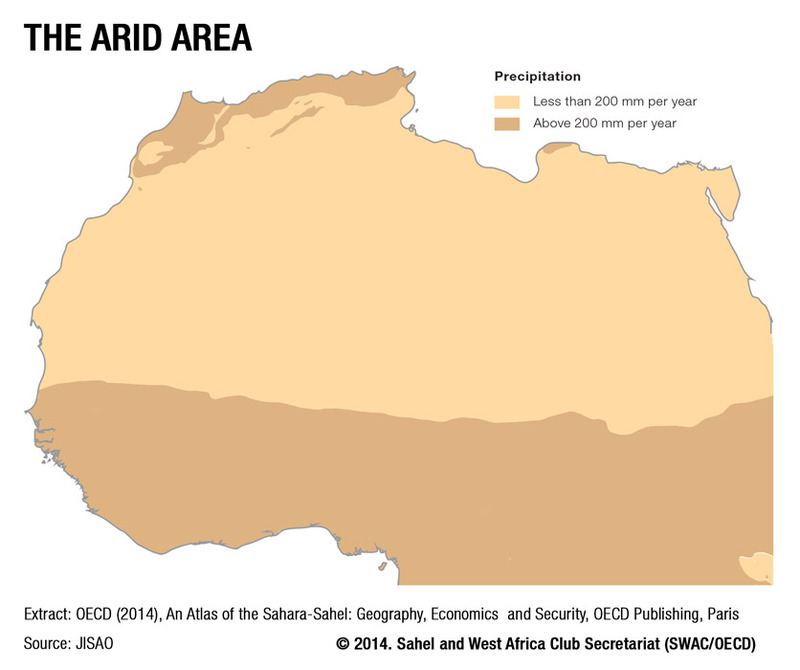 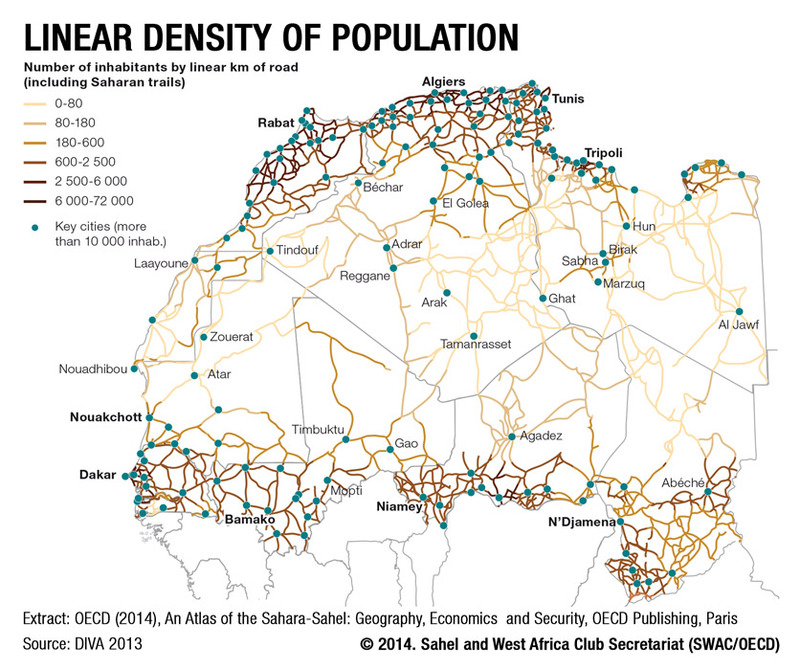 Given that the inhabitants are concentrated along roads and in towns (most people living in the Sahara-Sahel are urbanites), the Sahara-Sahel is neither empty nor immobile. 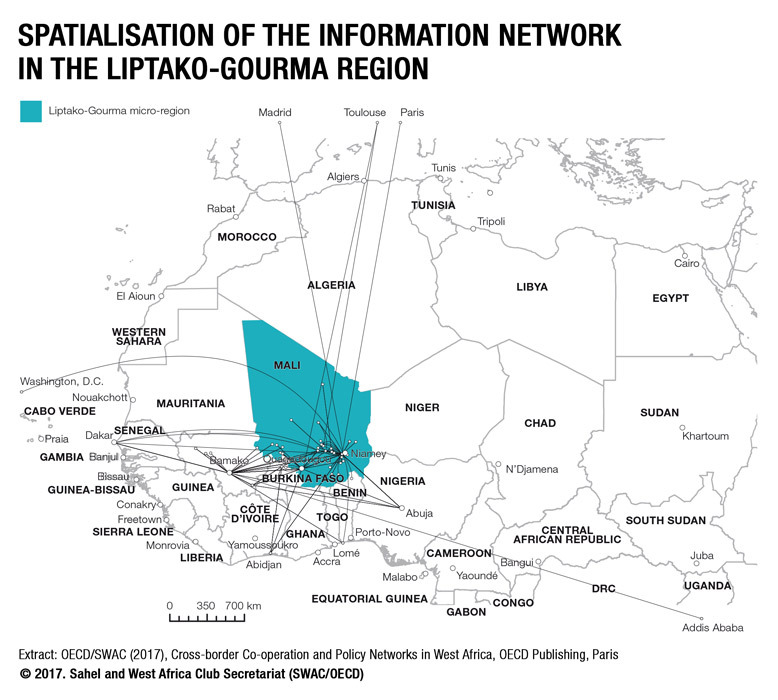 The roads and towns form the framework of this area associated with mobile societies that are organised on the basis of social and trade networks more than ties to the state. 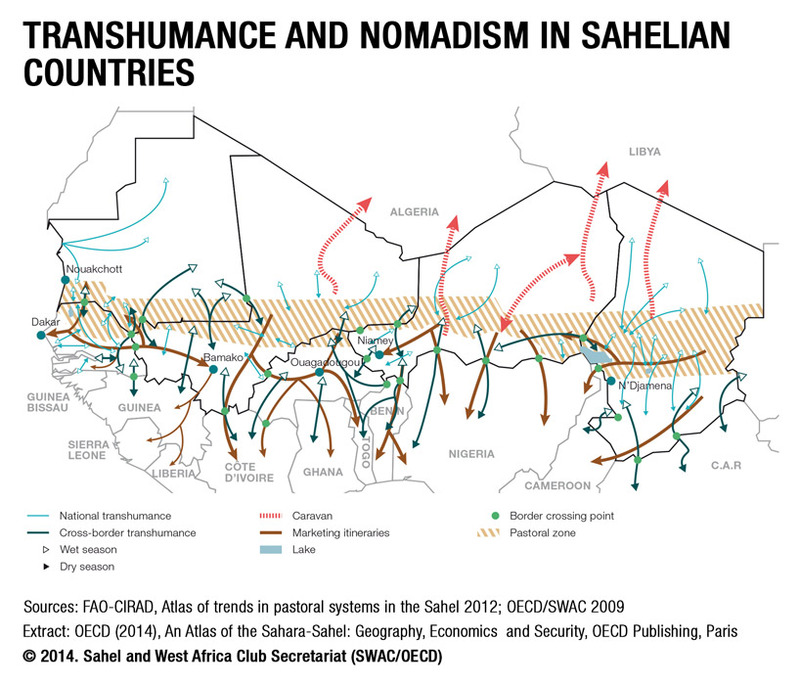 The movement of people and goods within that framework — associated with nomadism, transhumance, trade and migration, but also with trafficking and violence — is the main focus of the Atlas. 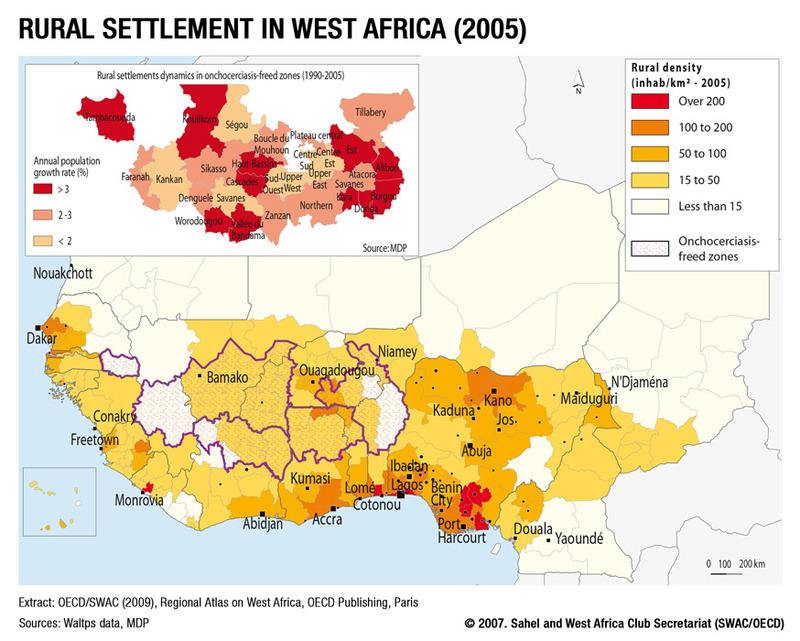 You can copy and paste maps directly from the PowerPoint presentation (Part 1 | Part 2) or download individual maps by making a right click and choosing the option "save image as". 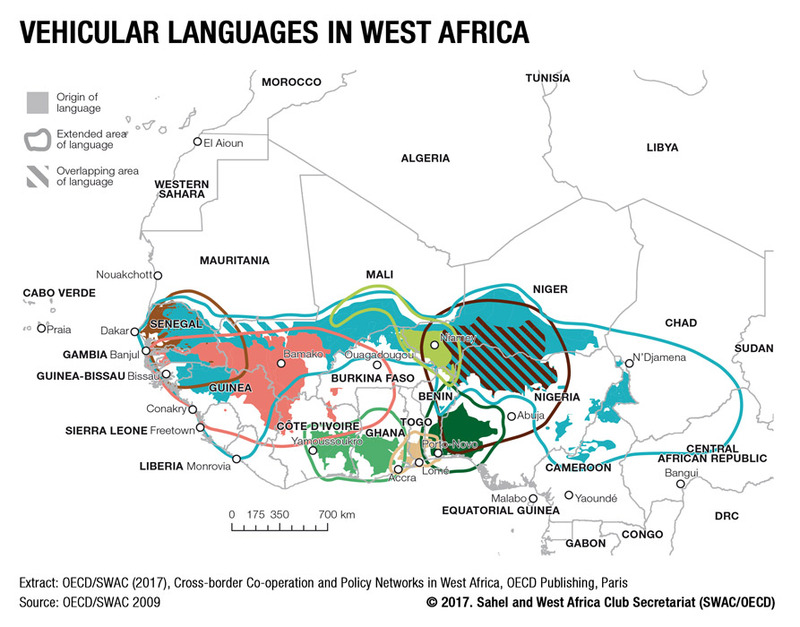 You can also explore all SWAC maps in different formats by key word, topic or country search on the SWAC Online Map Library. 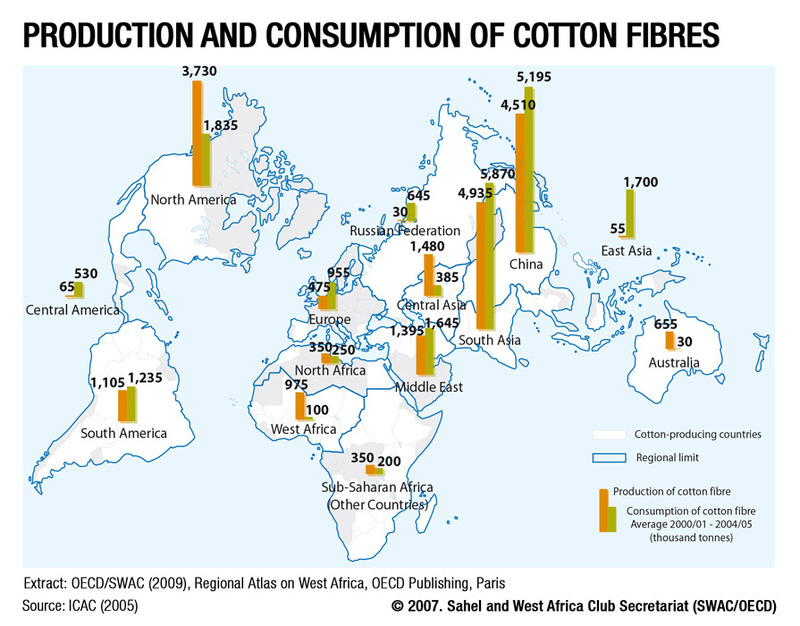 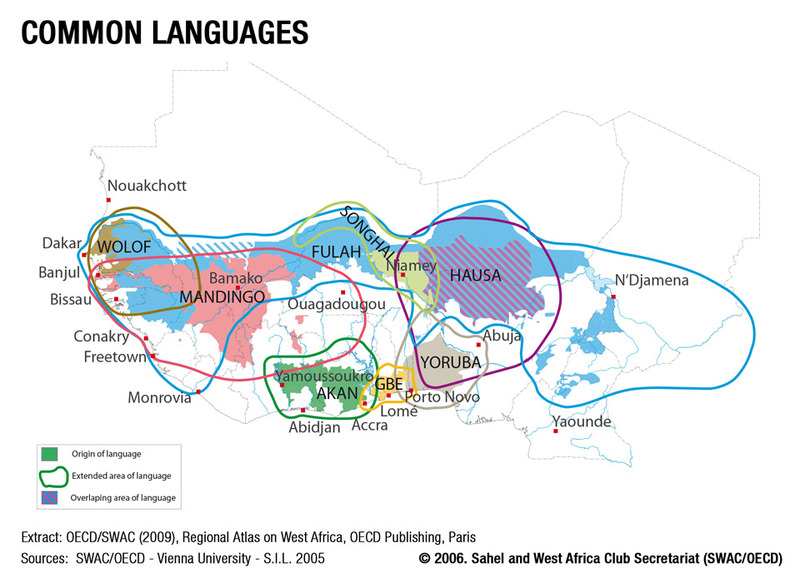 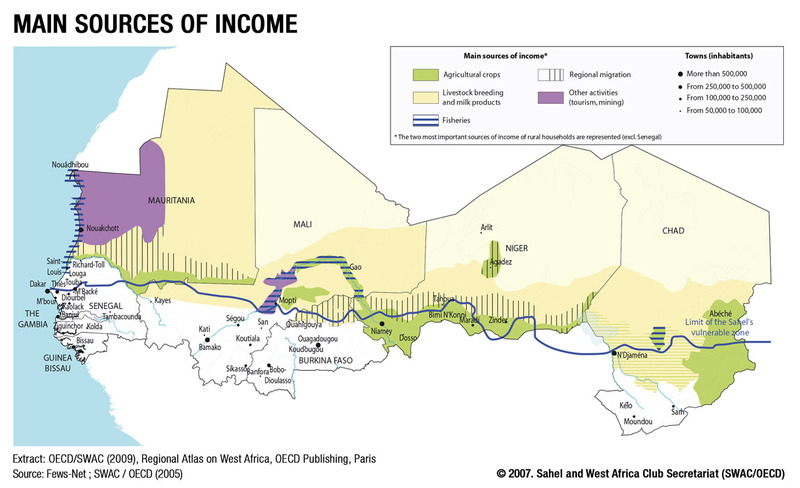 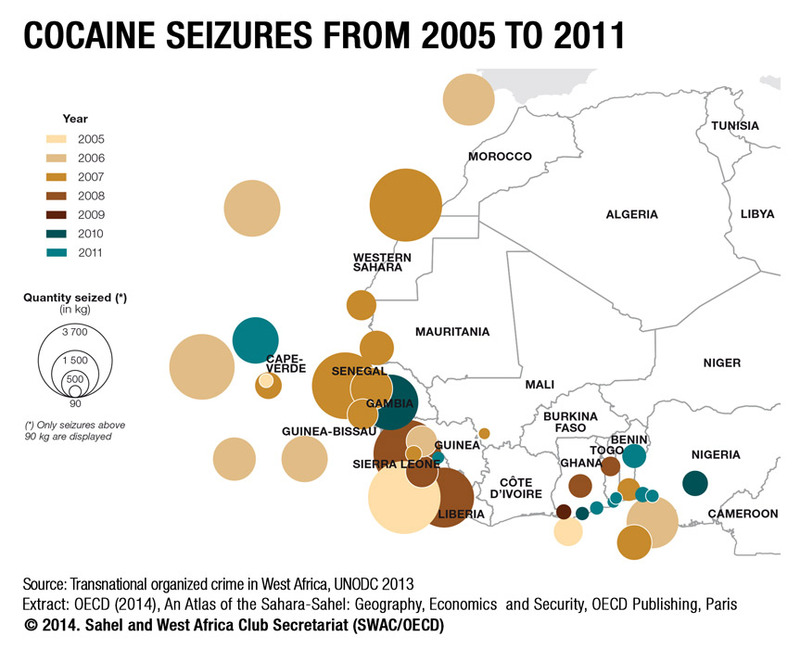 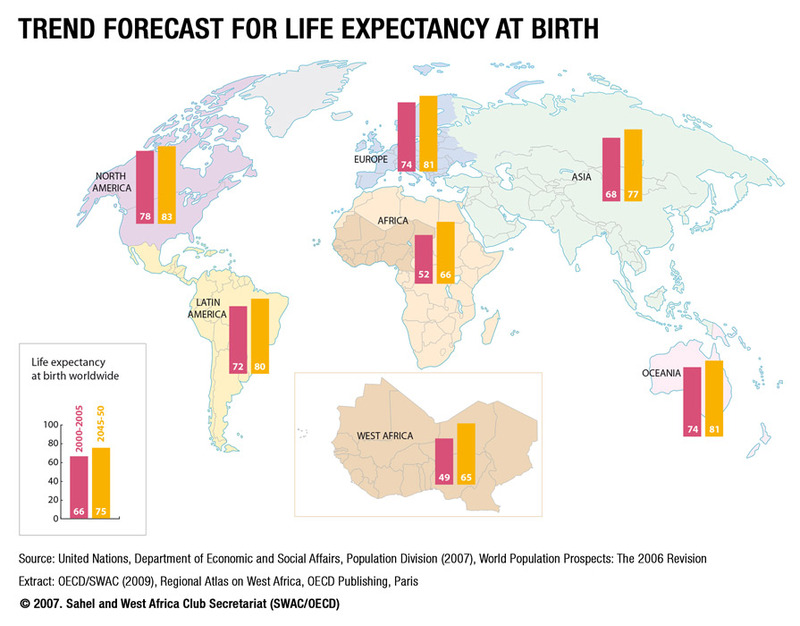 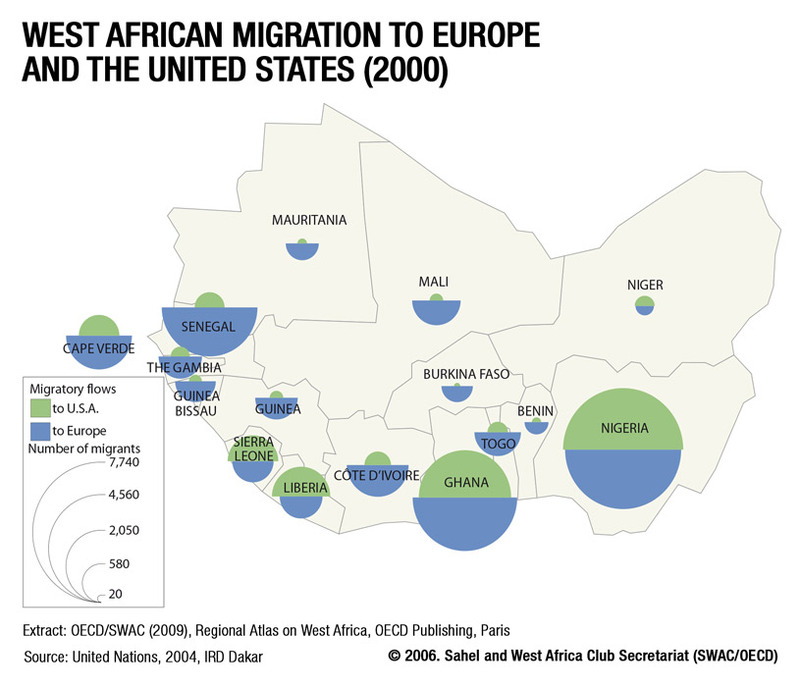 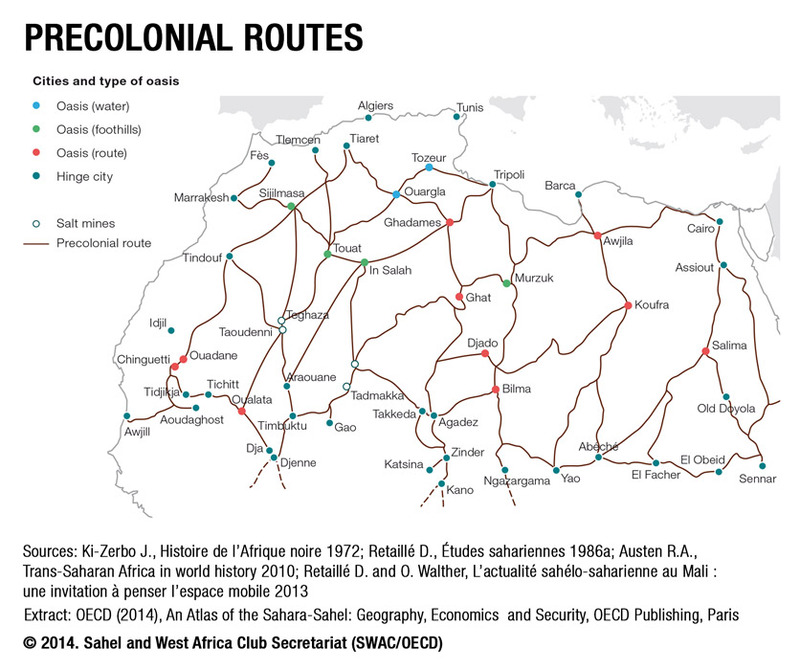 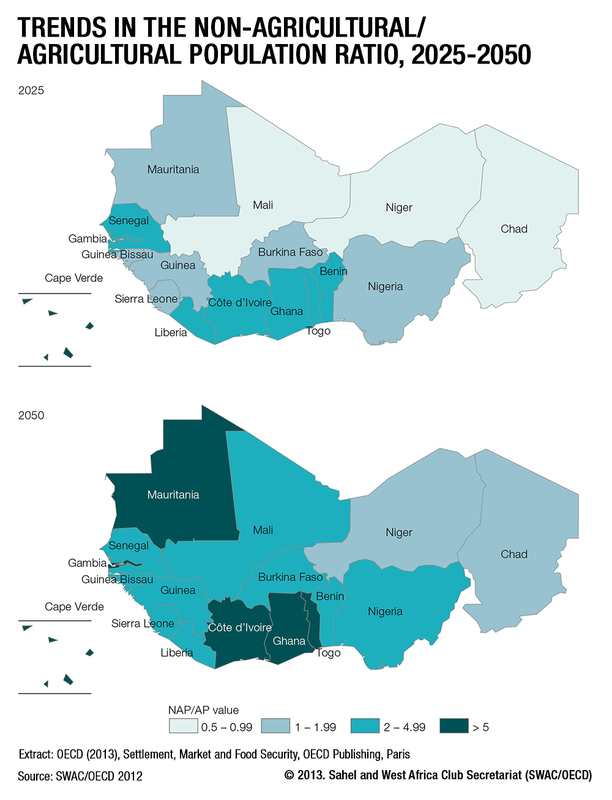 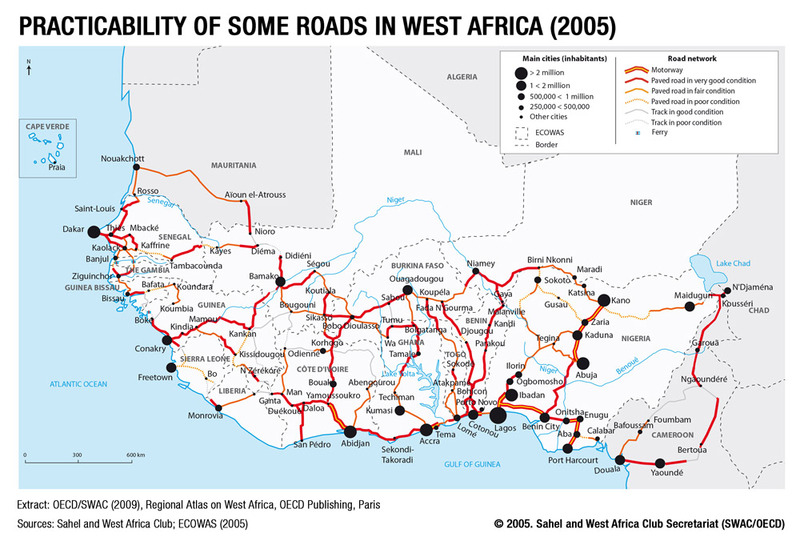 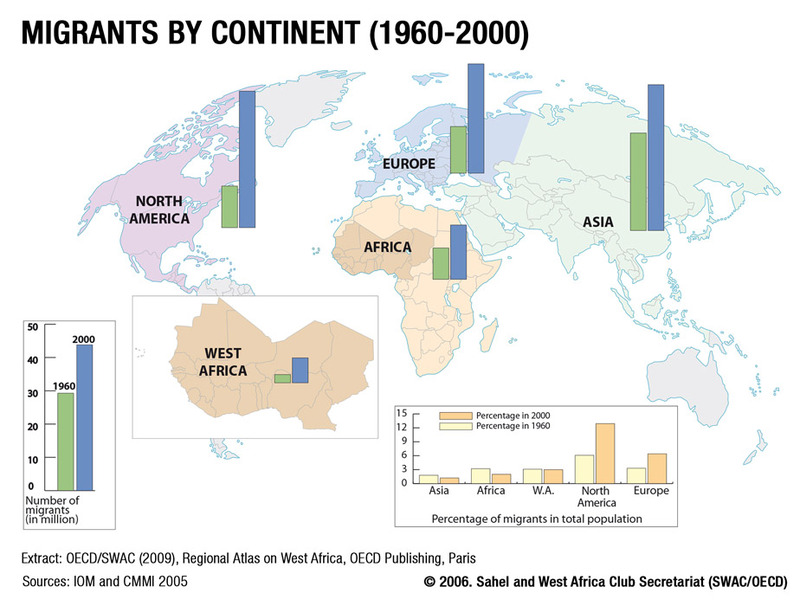 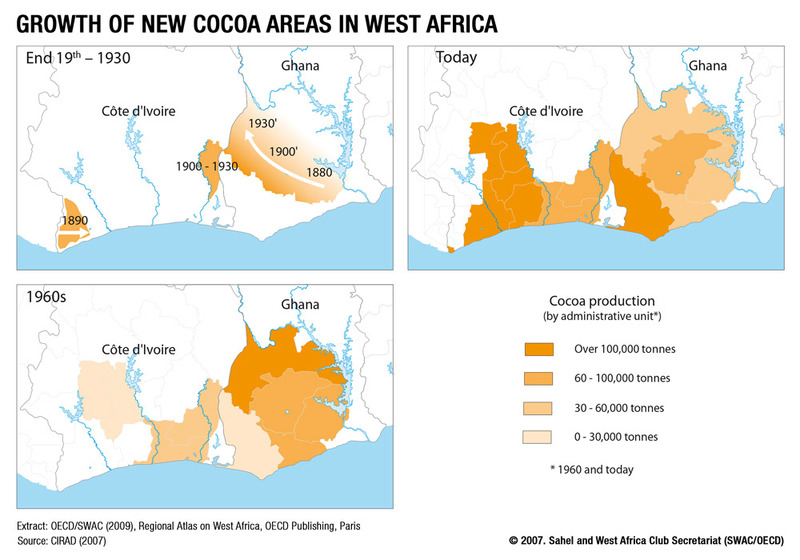 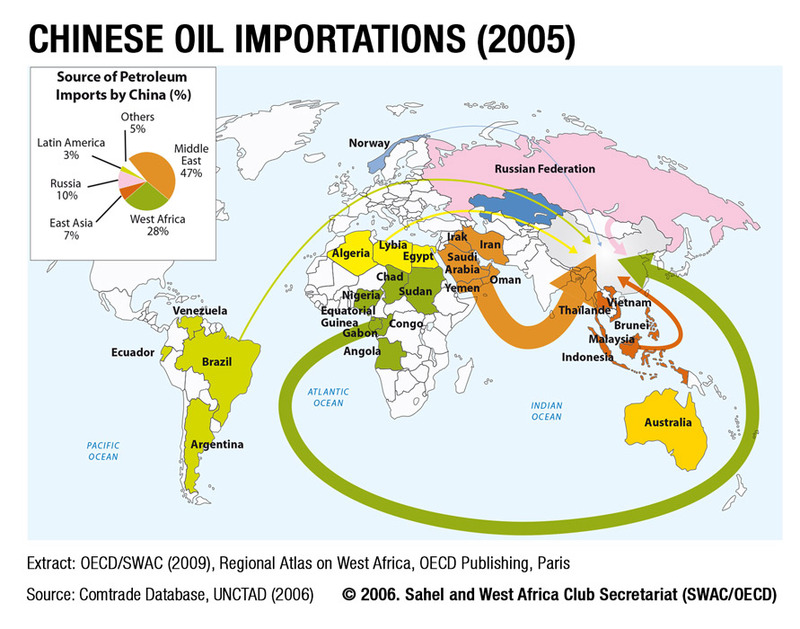 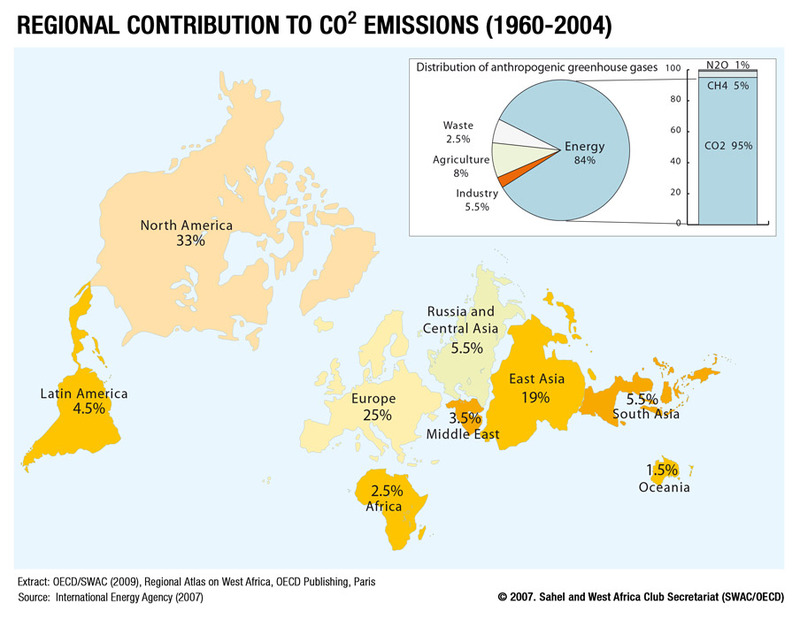 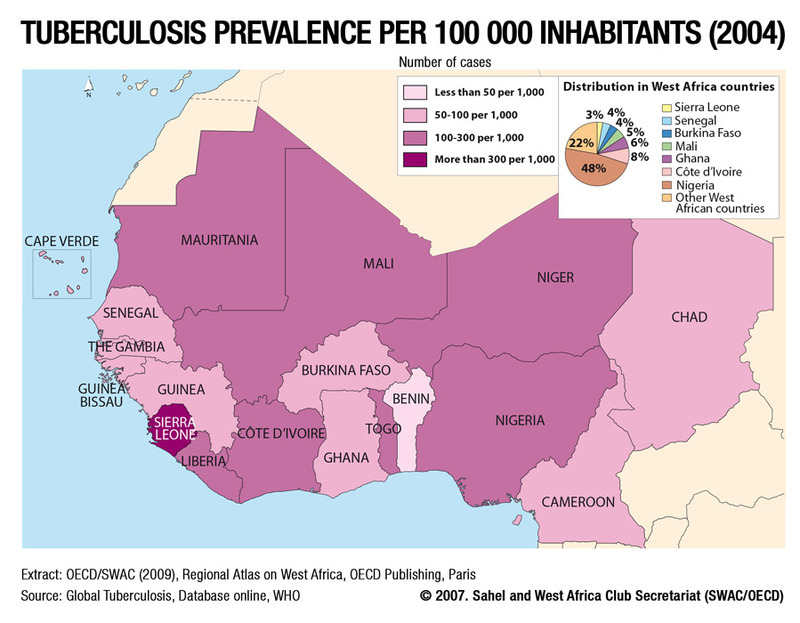 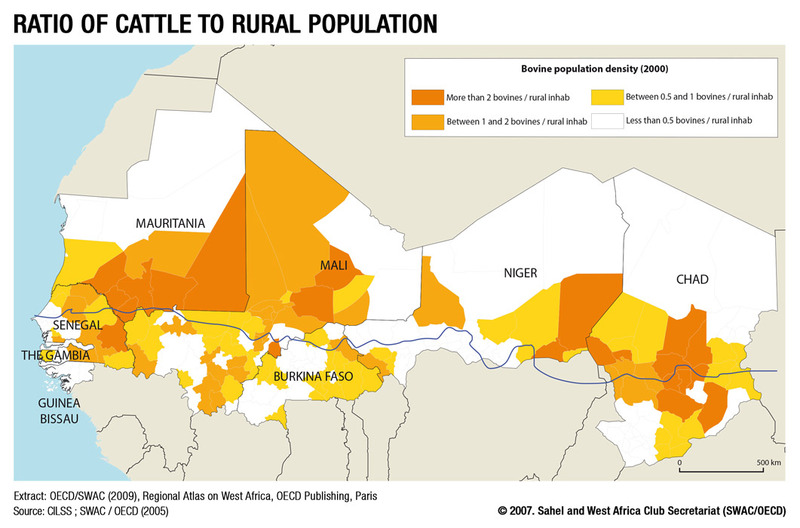 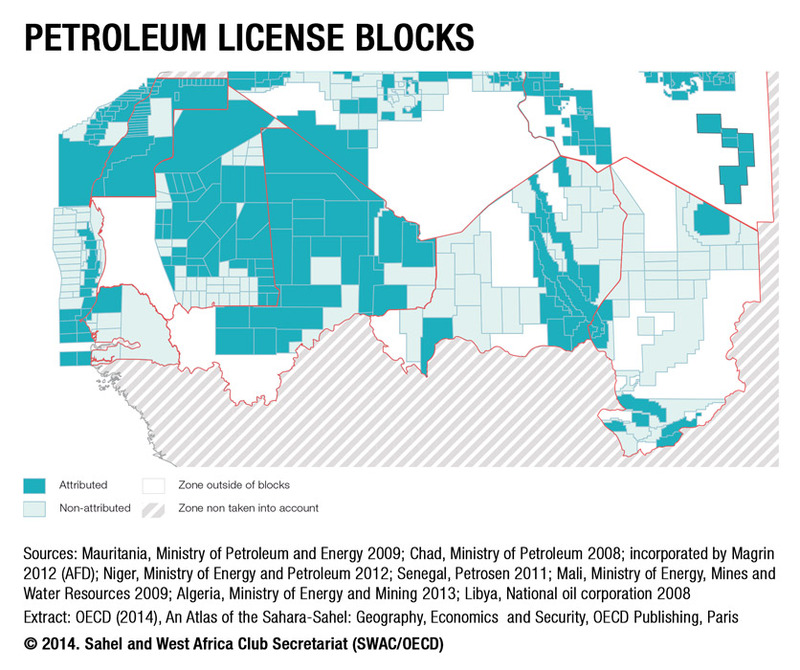 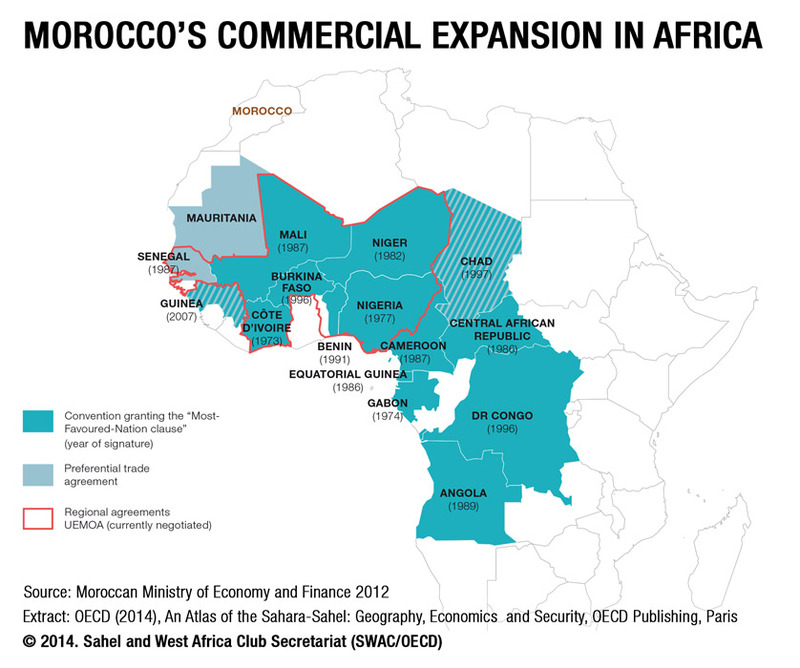 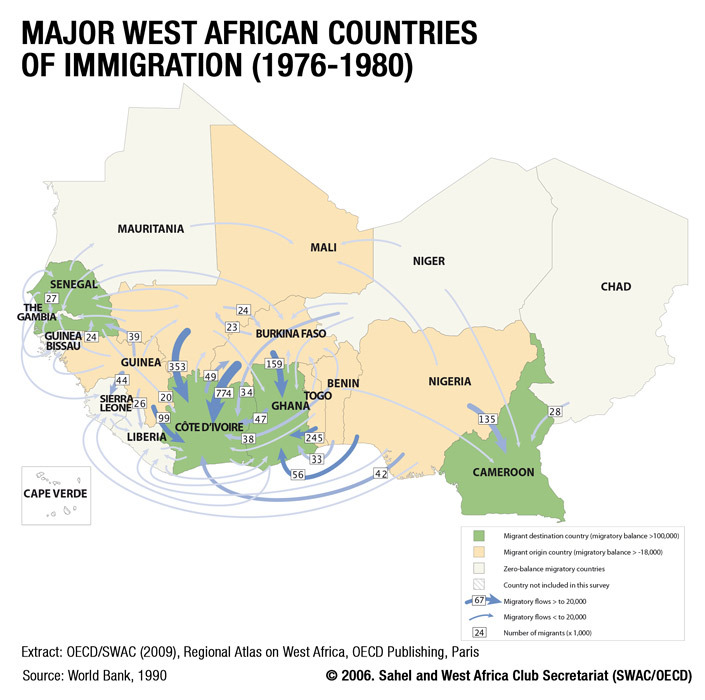 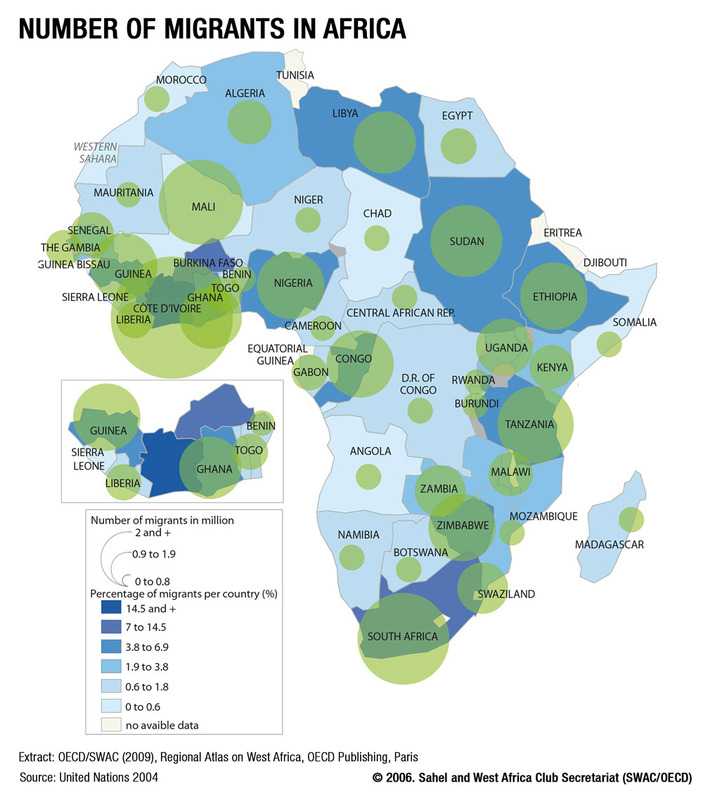 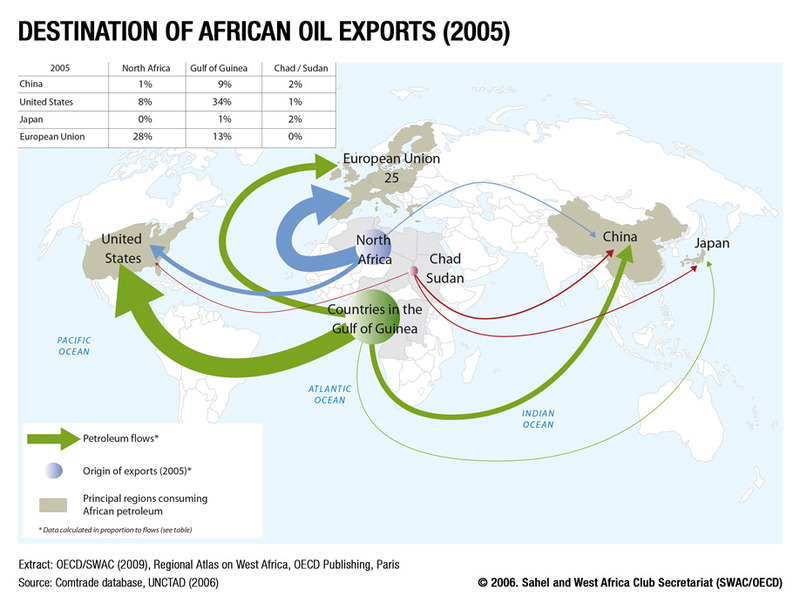 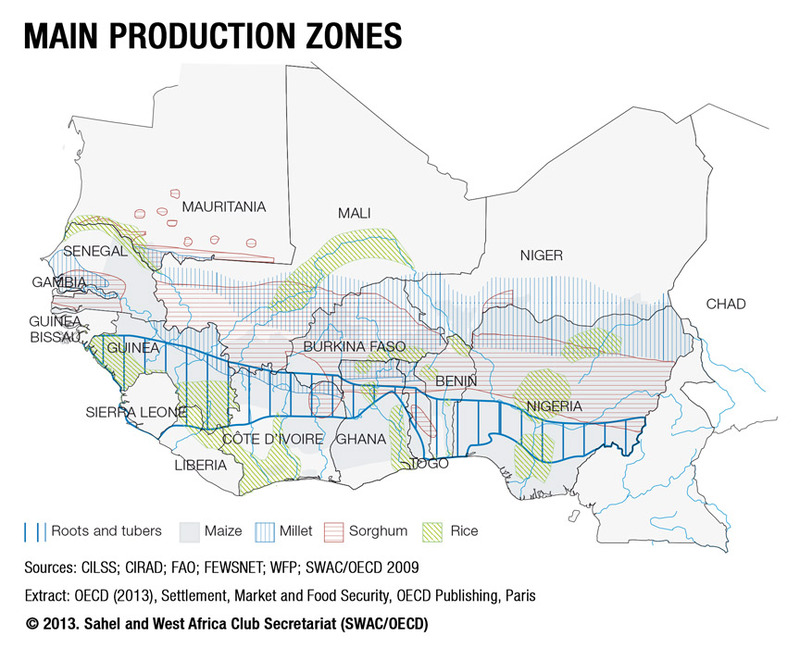 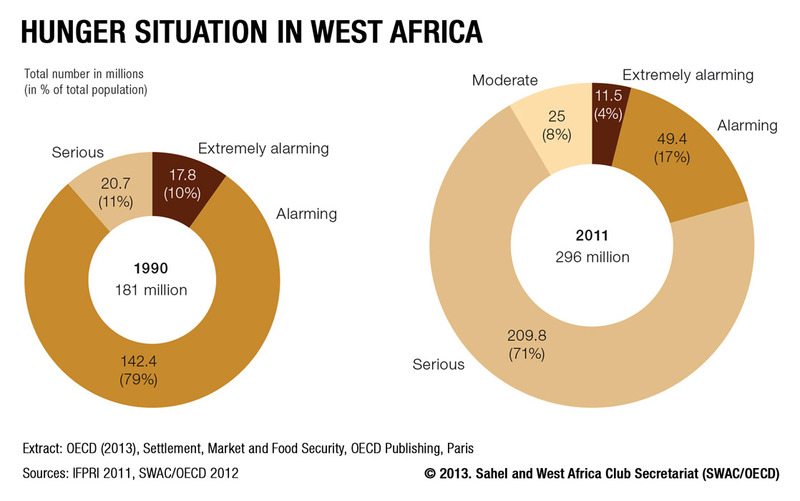 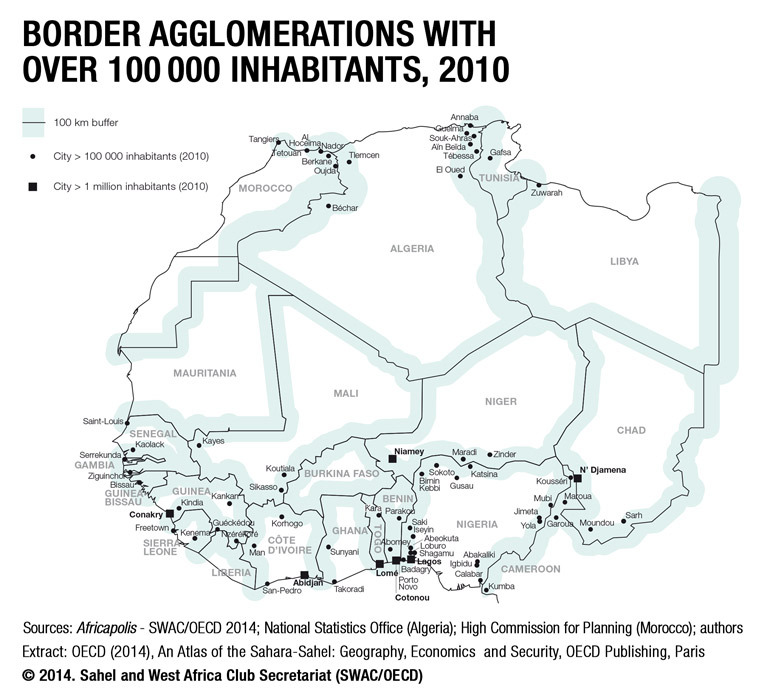 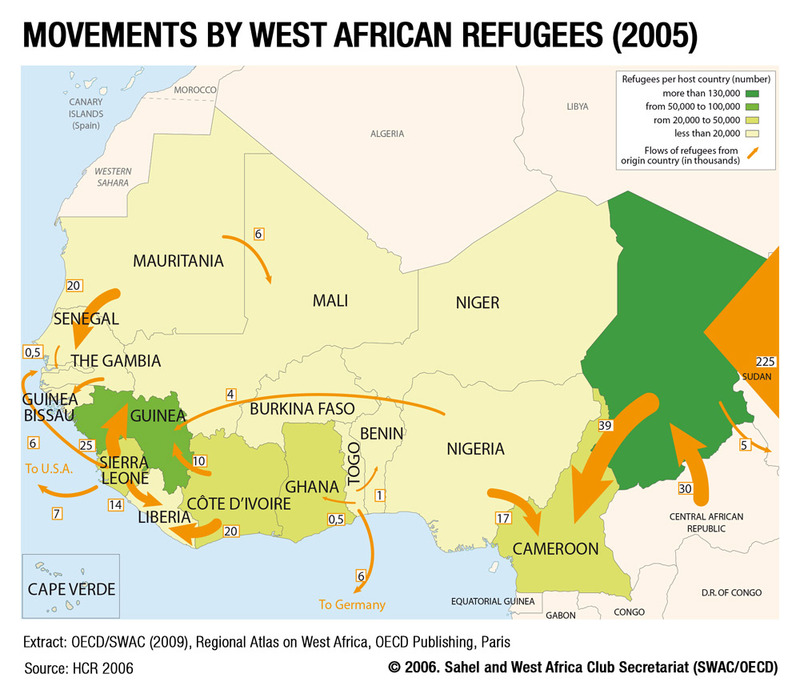 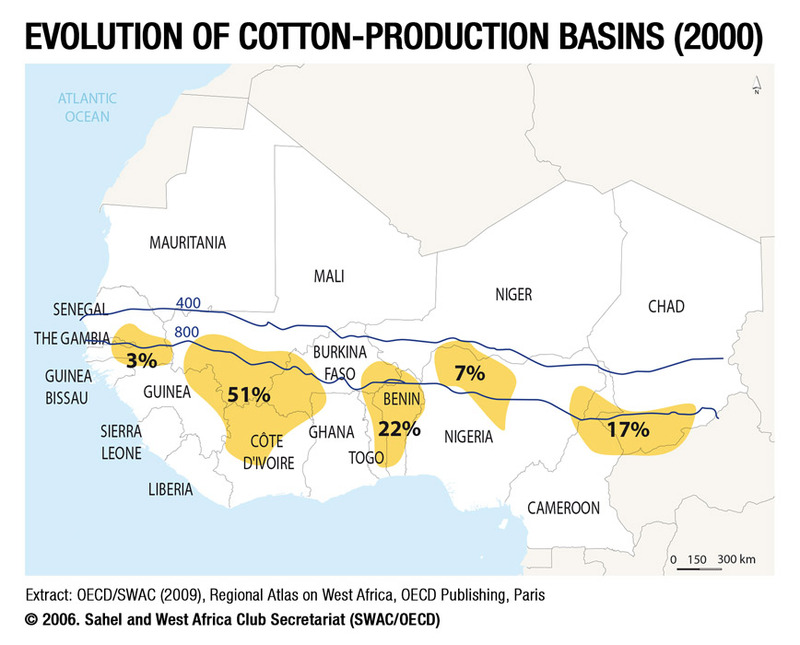 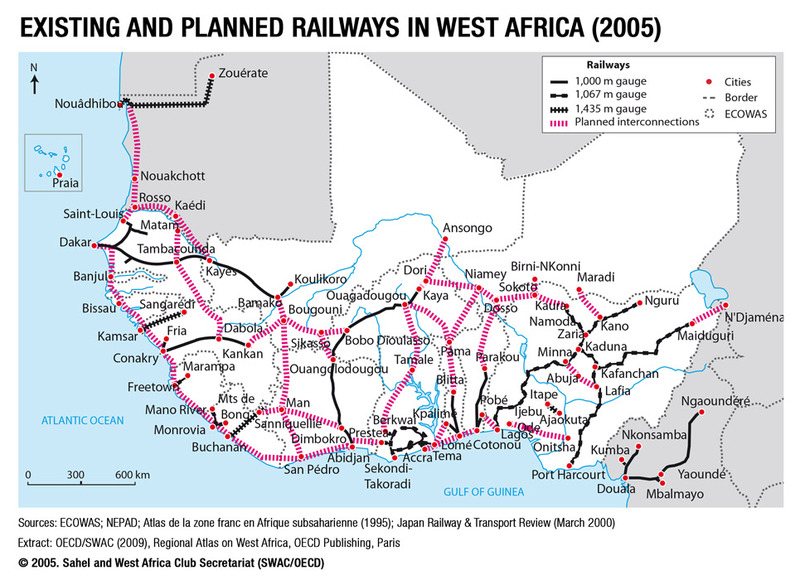 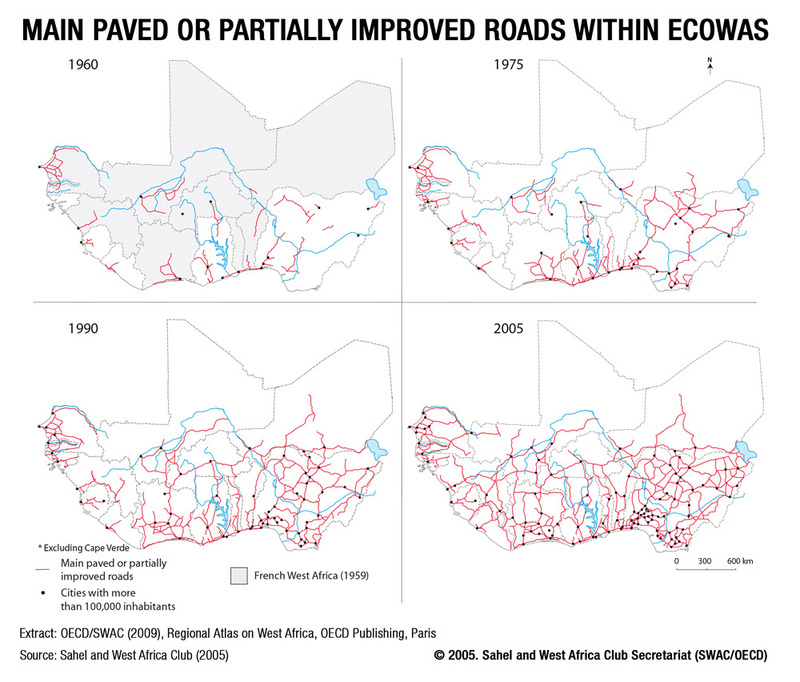 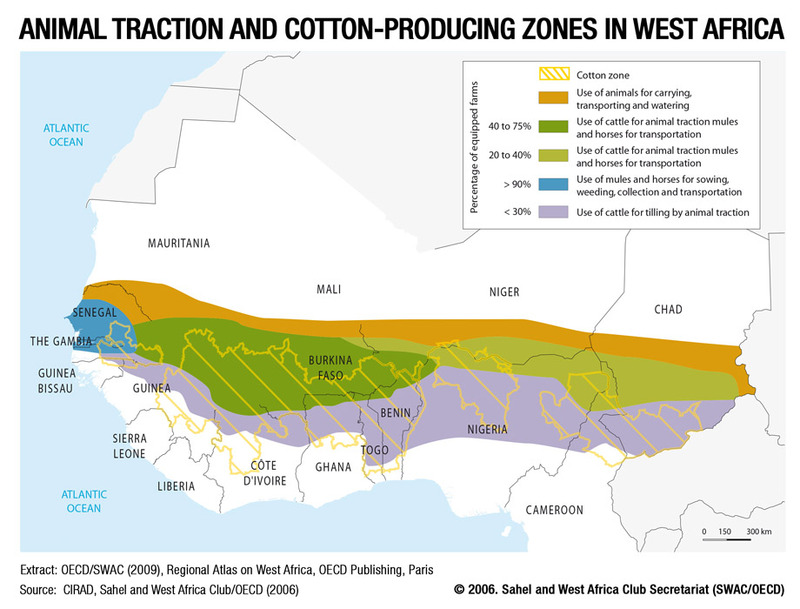 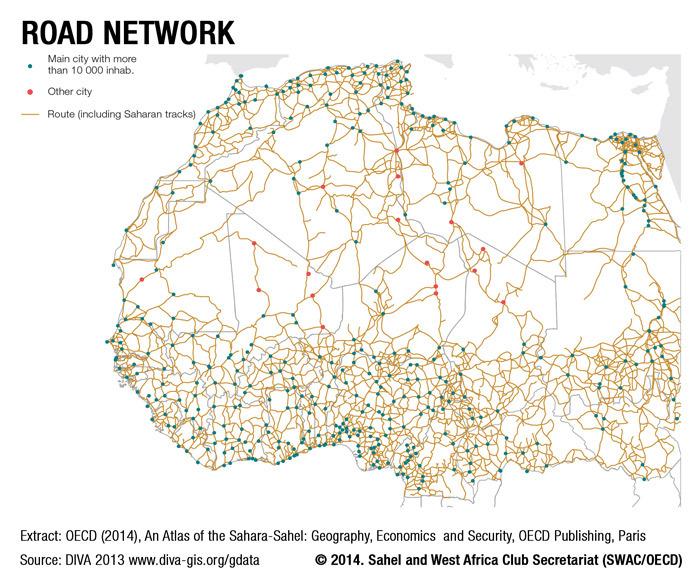 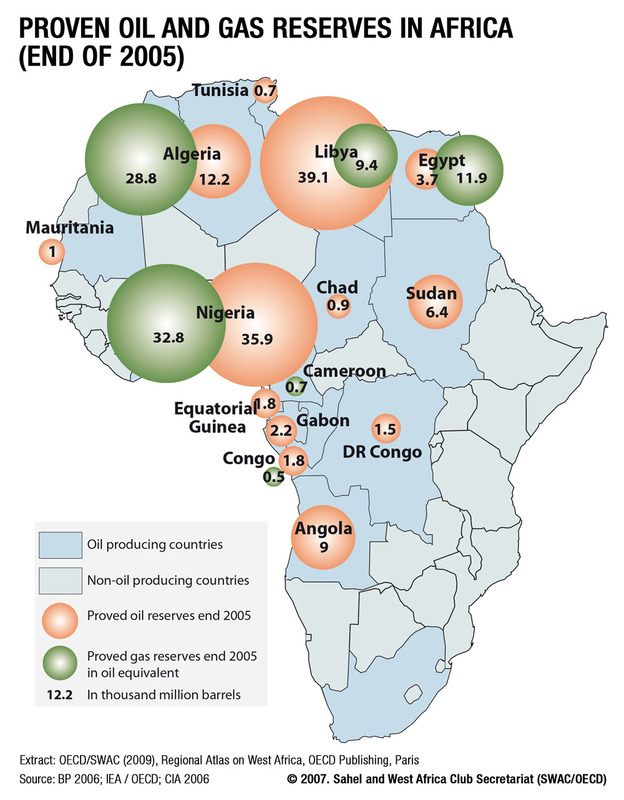 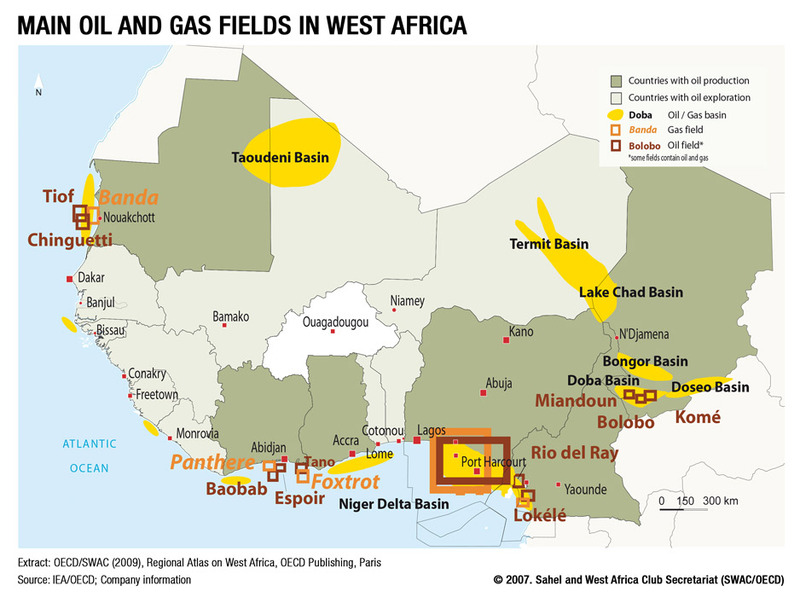 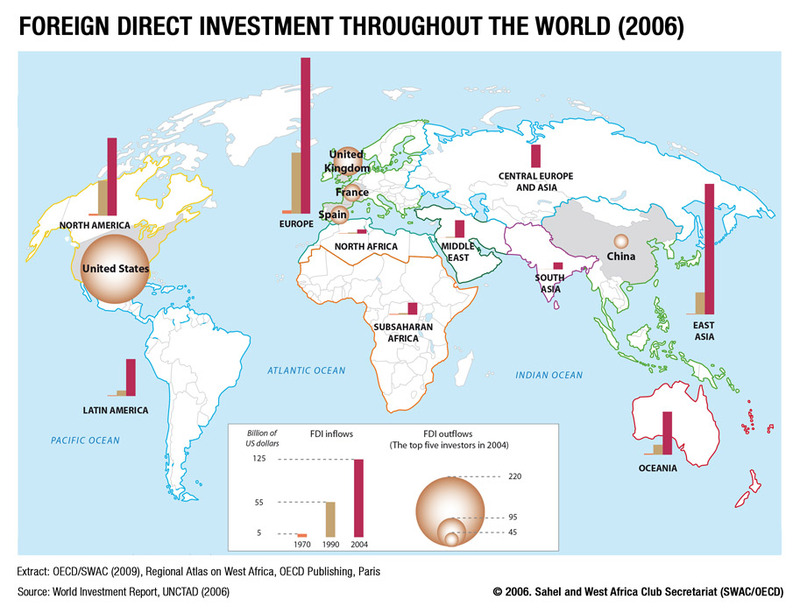 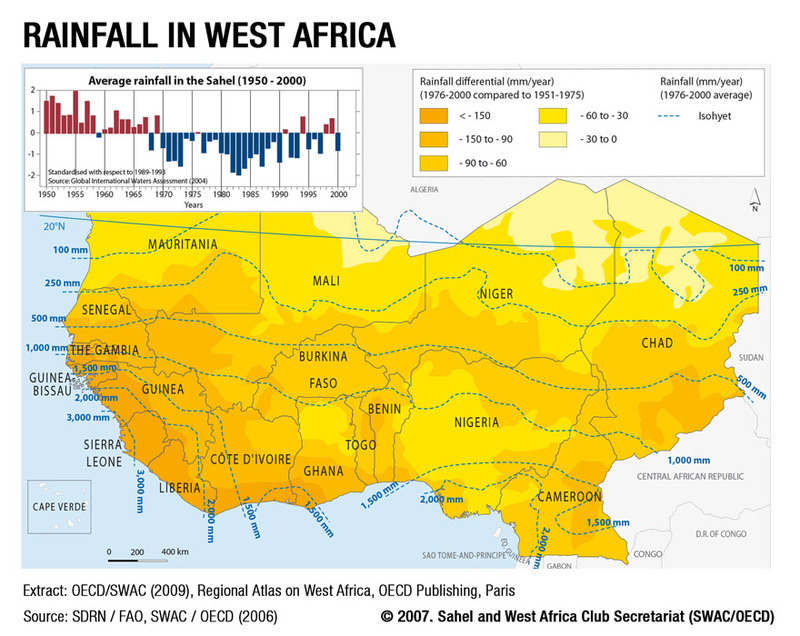 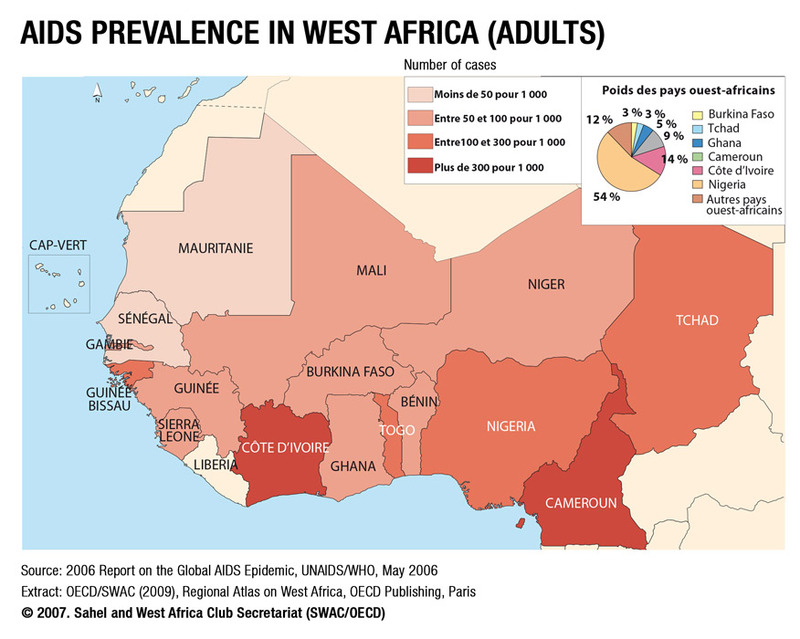 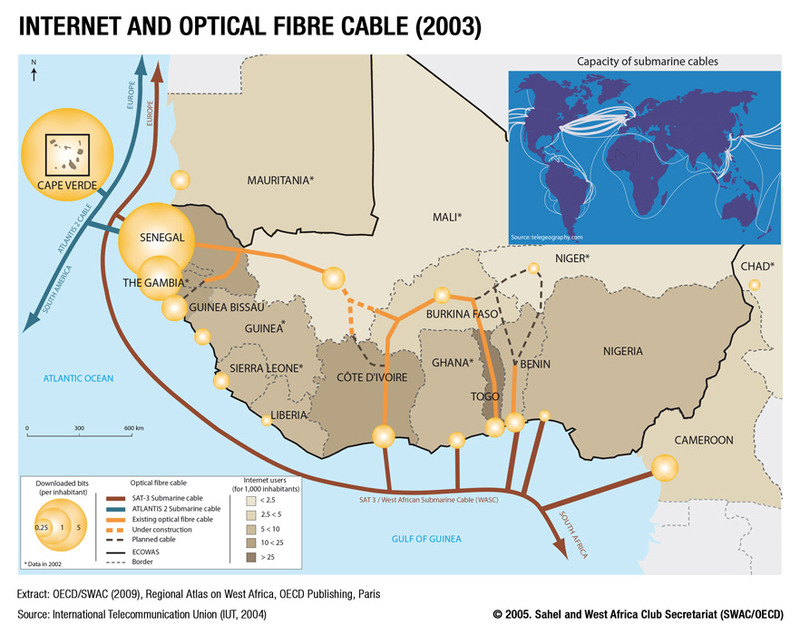 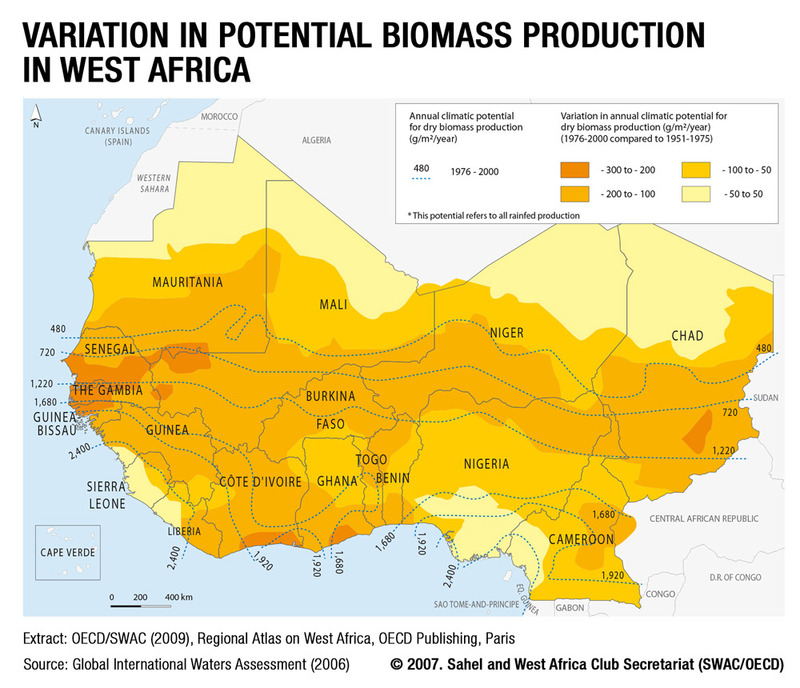 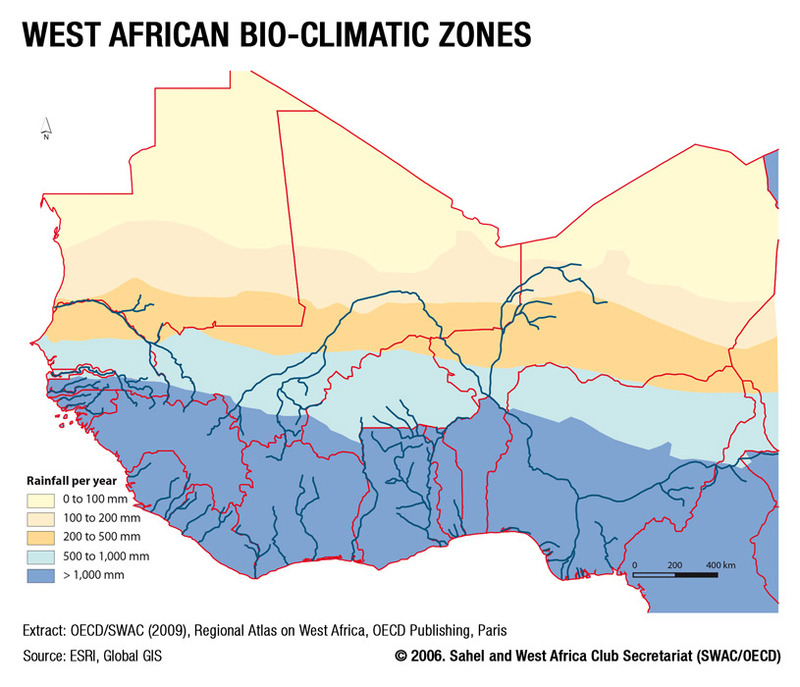 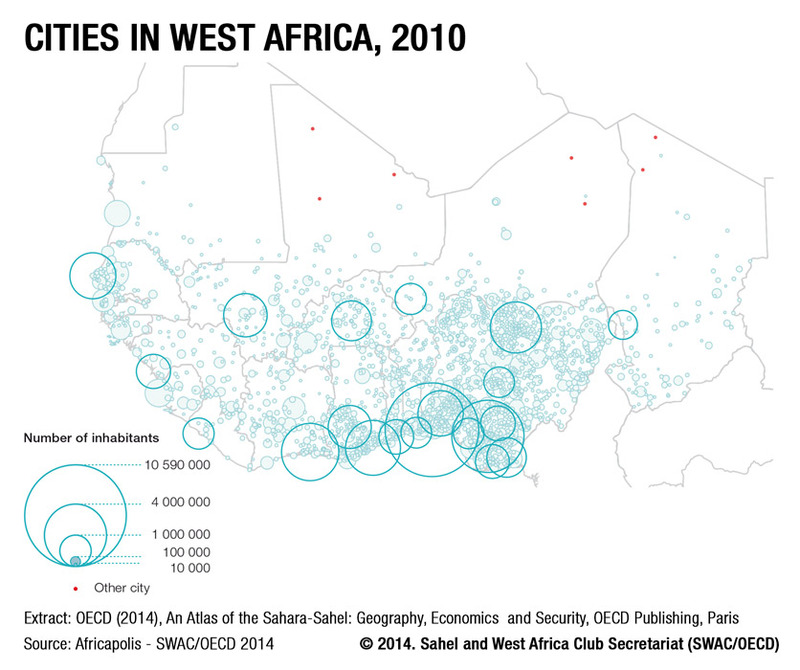 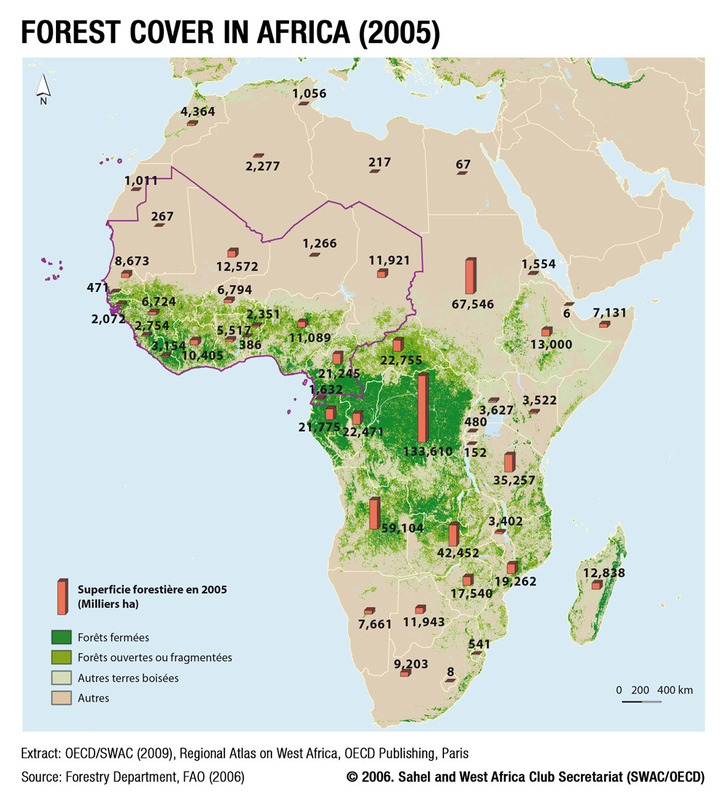 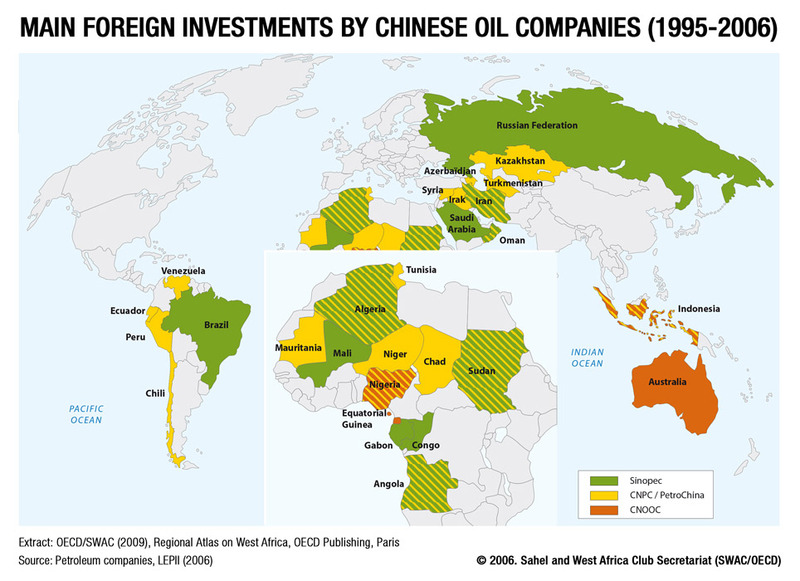 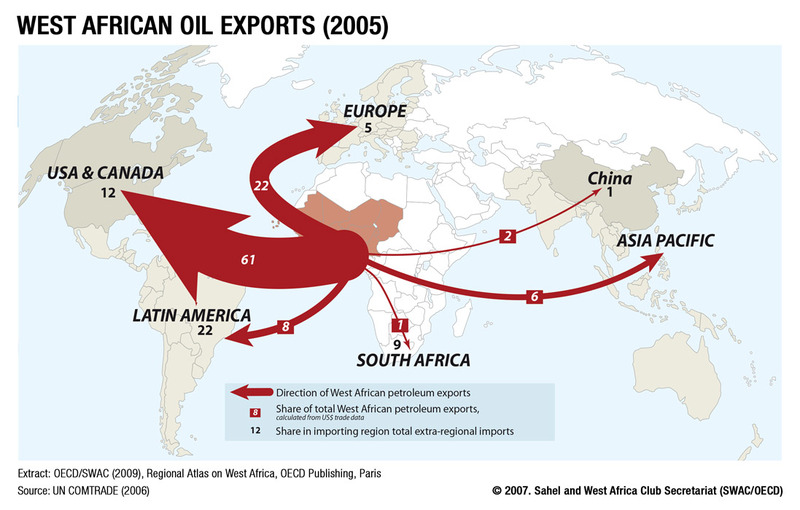 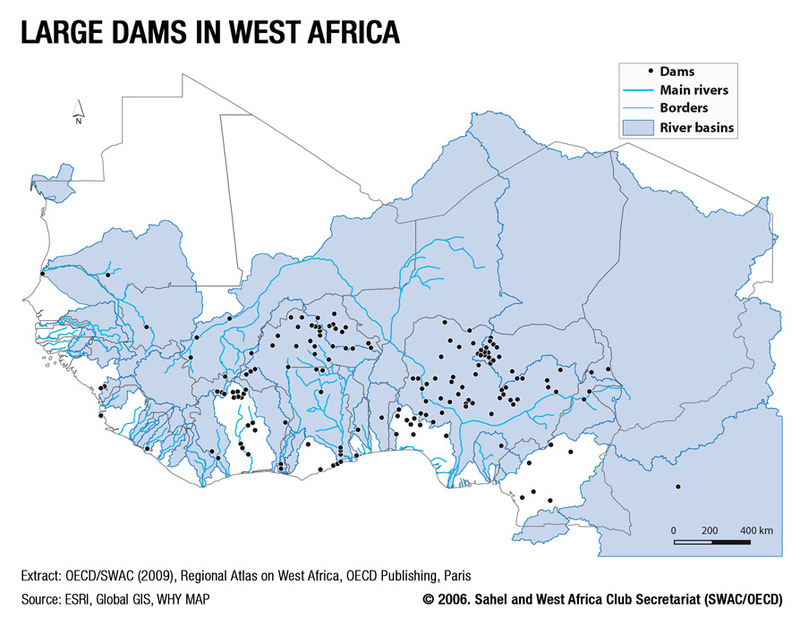 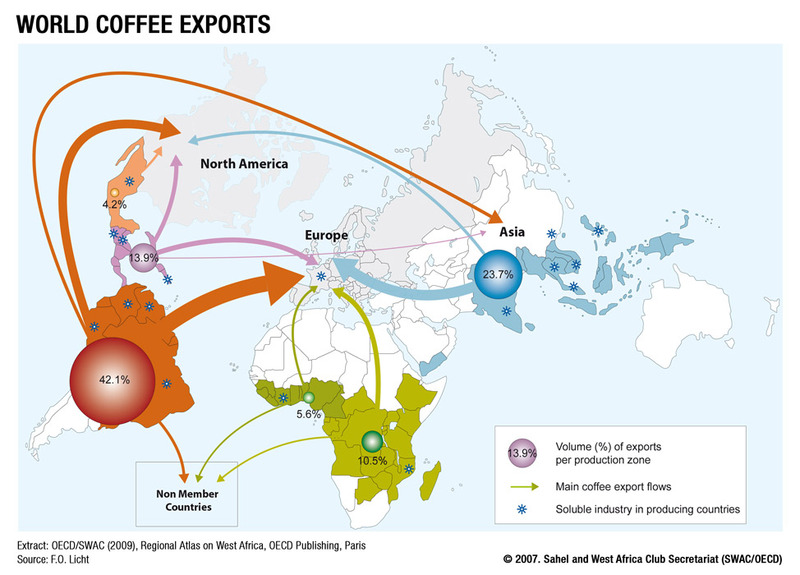 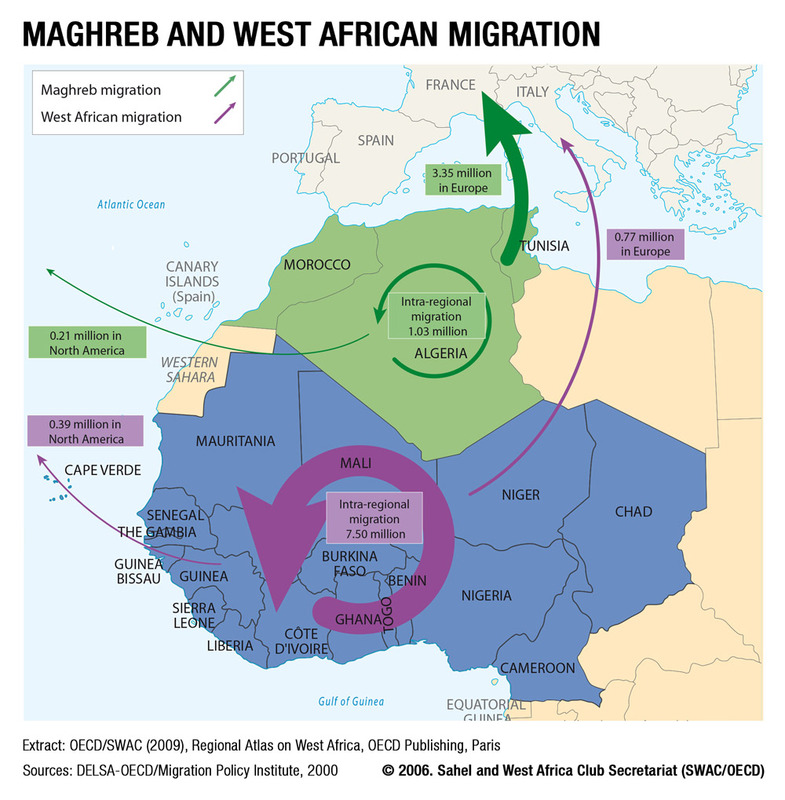 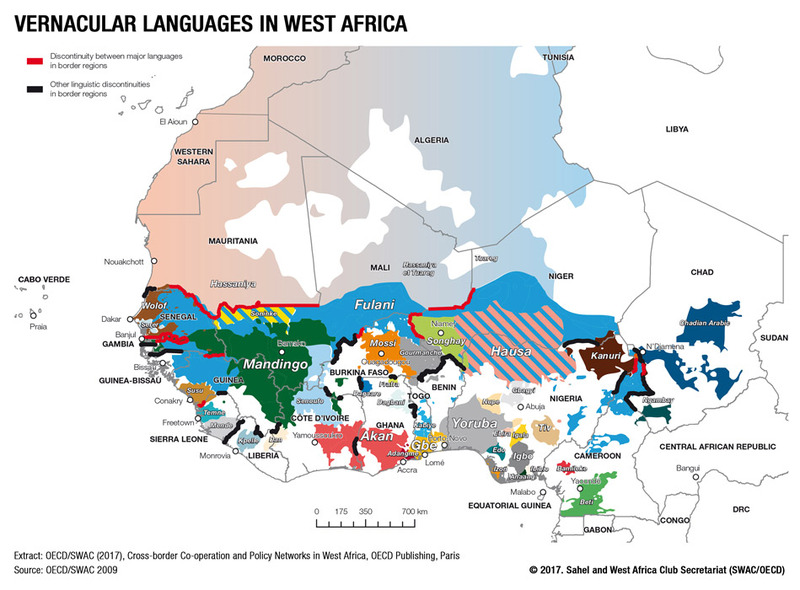 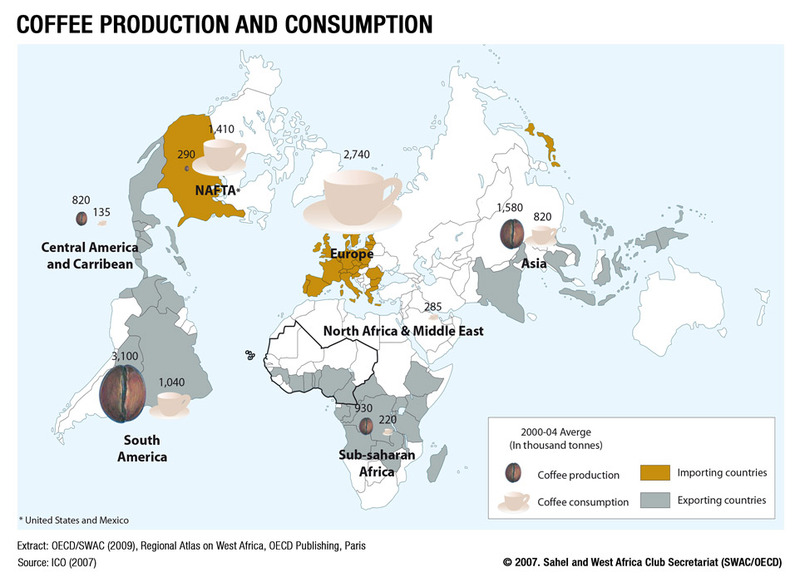 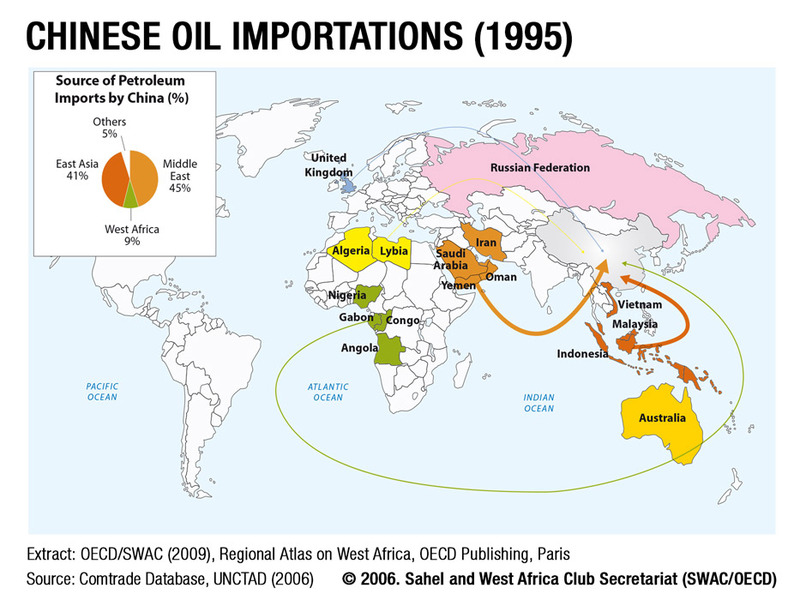 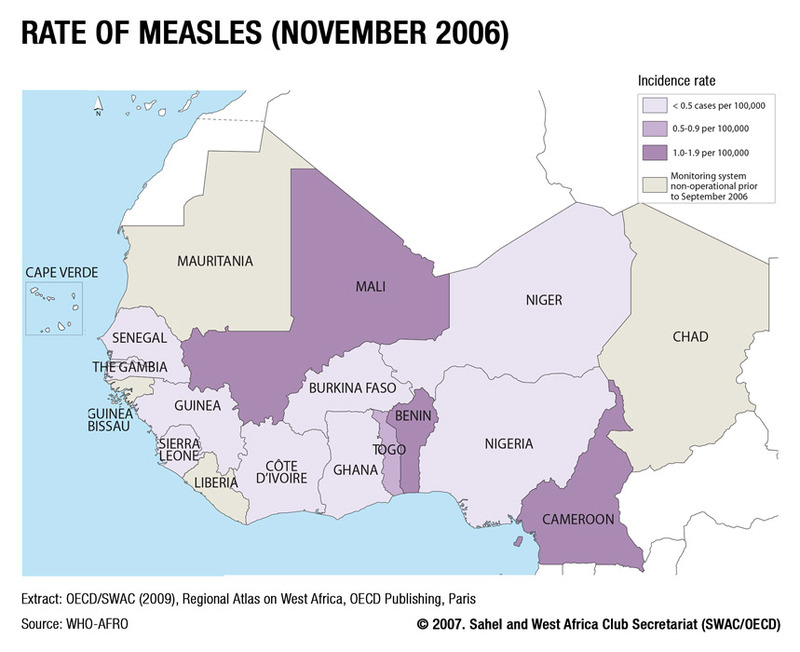 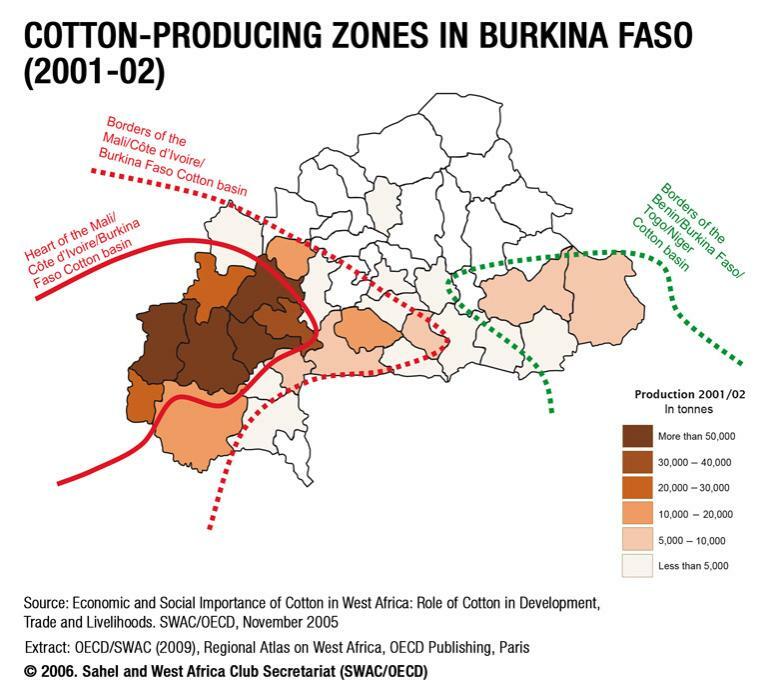 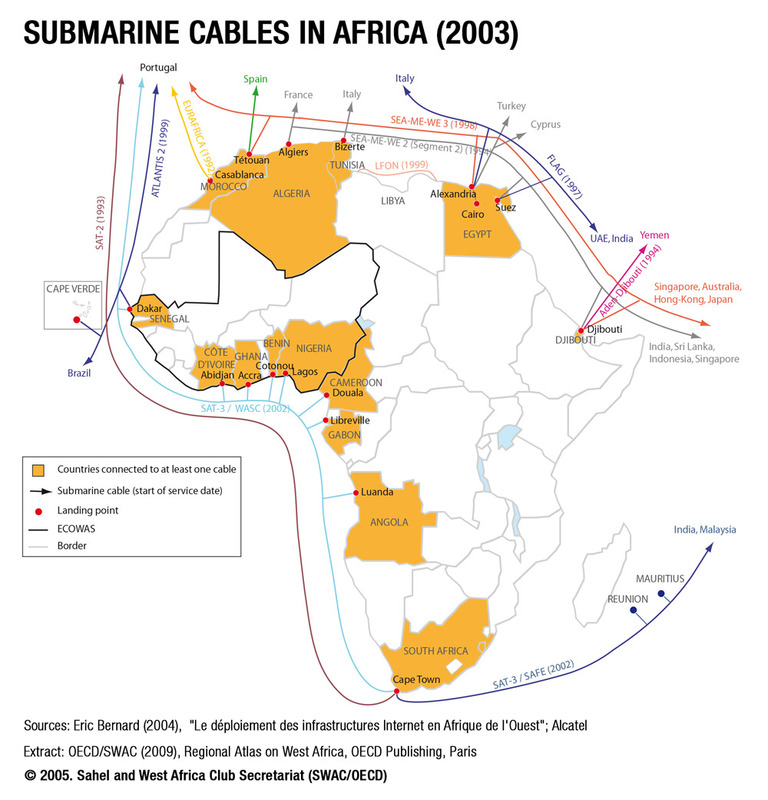 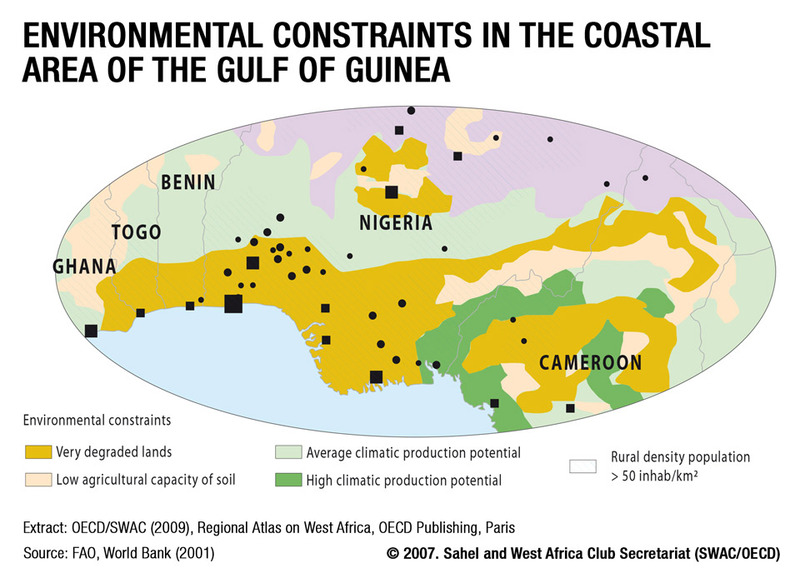 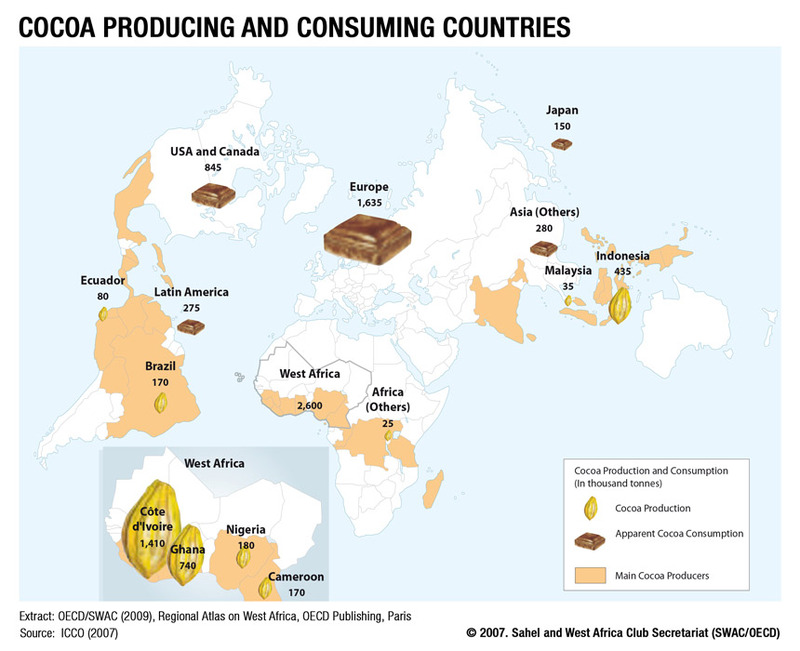 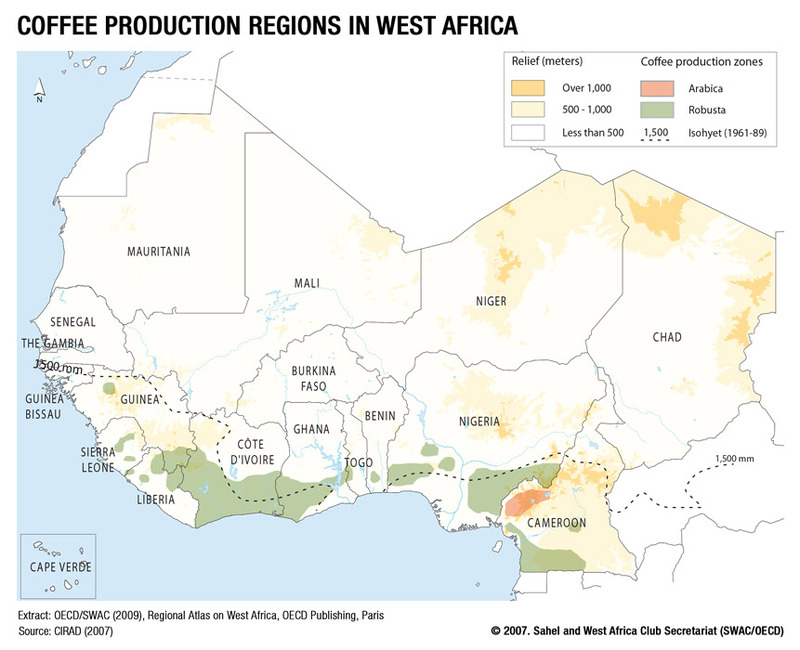 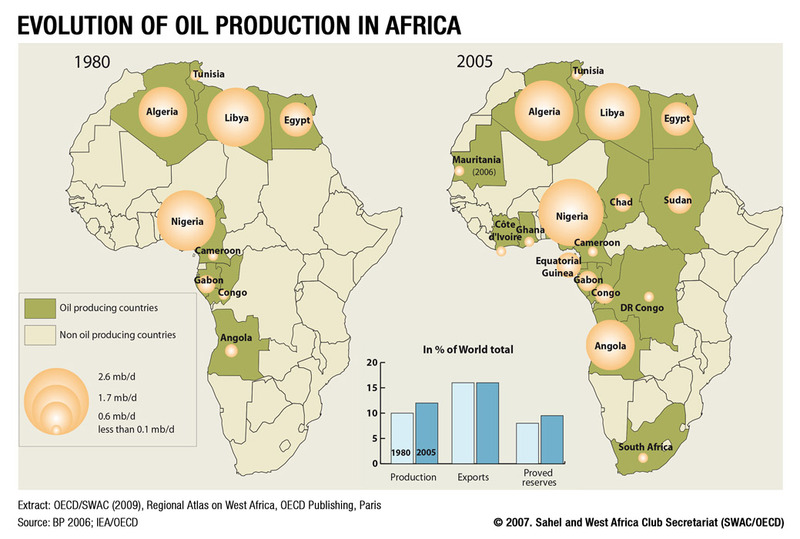 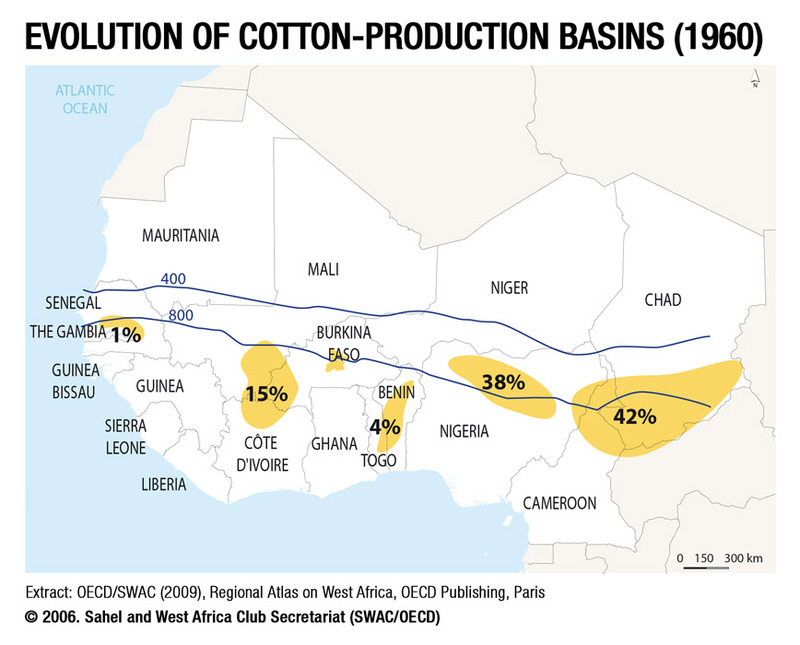 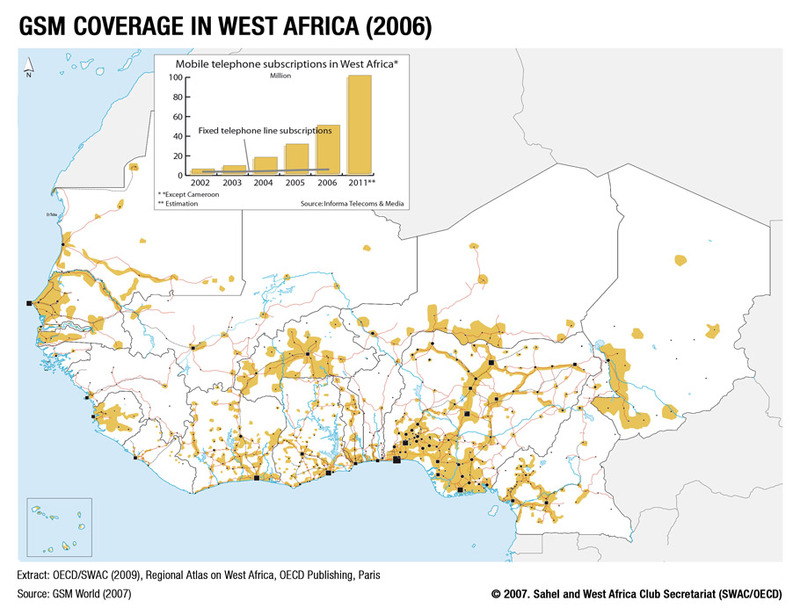 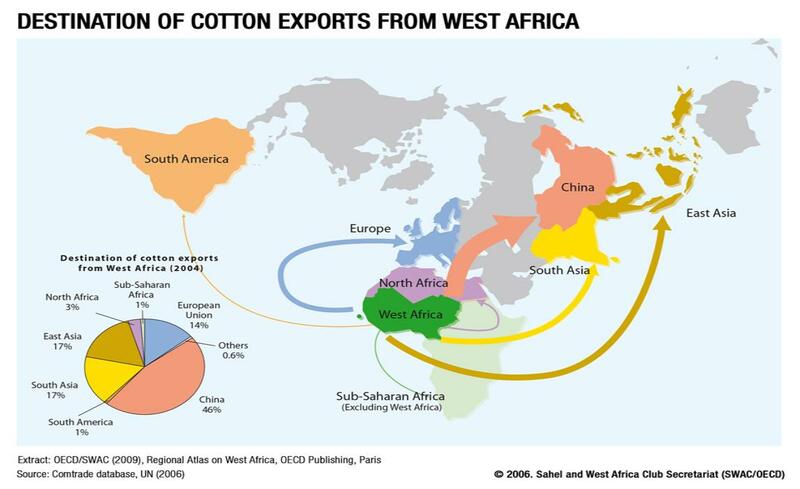 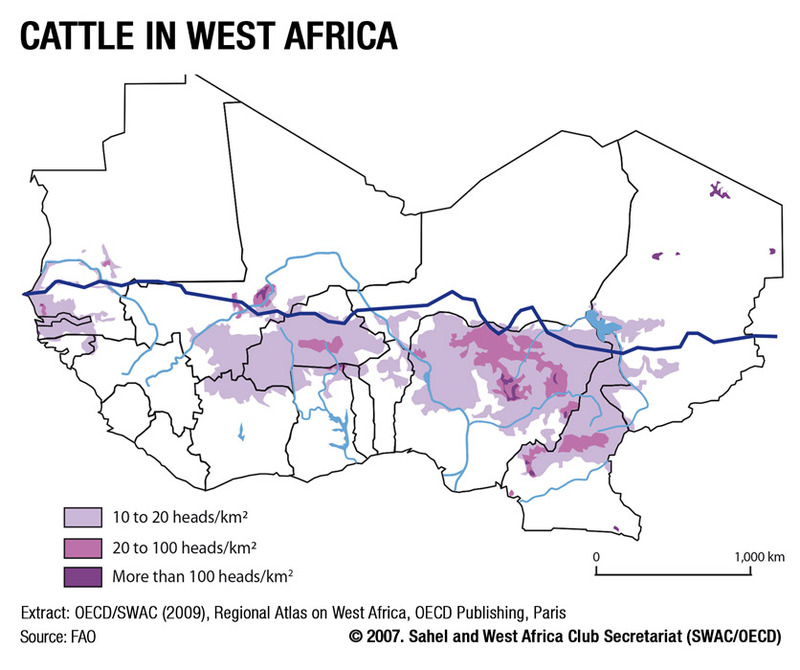 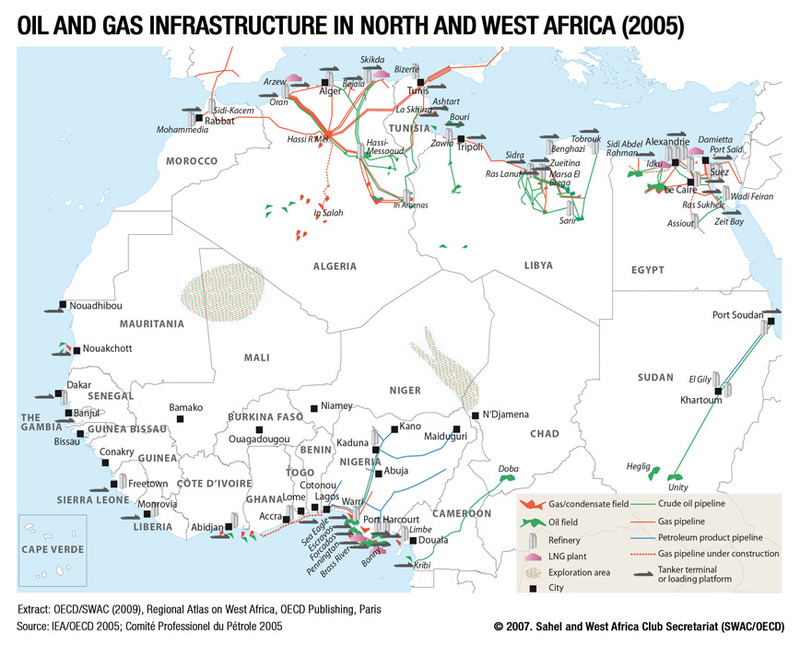 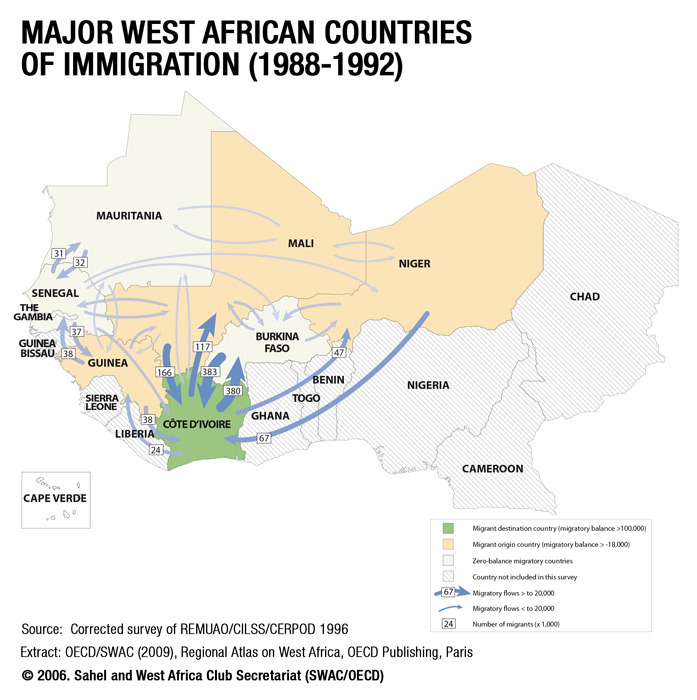 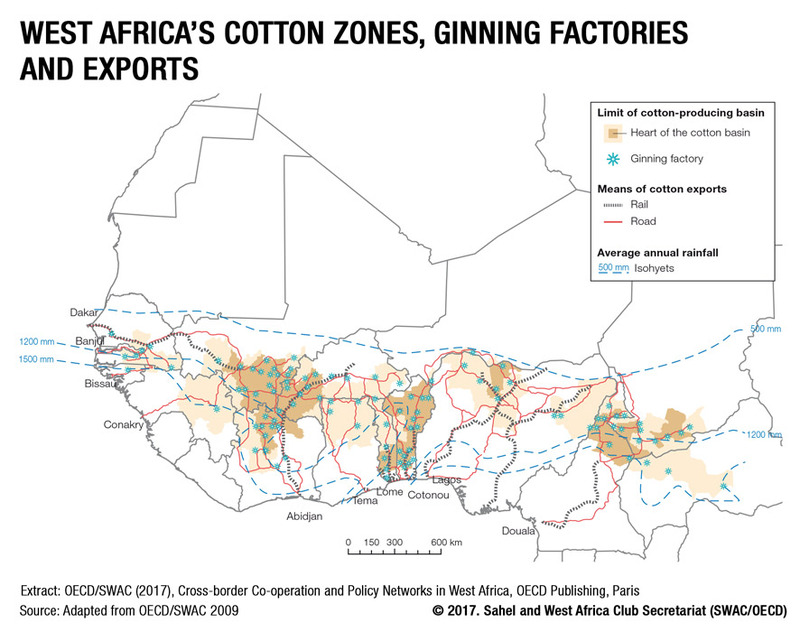 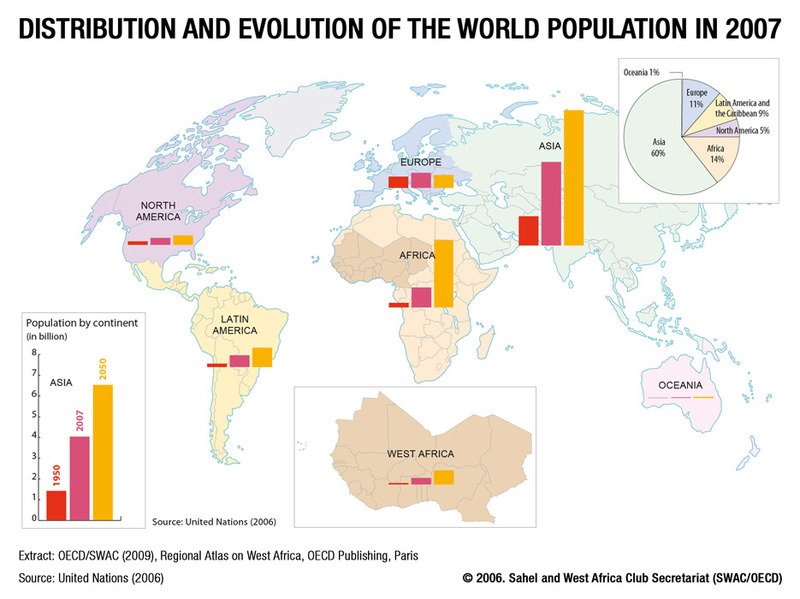 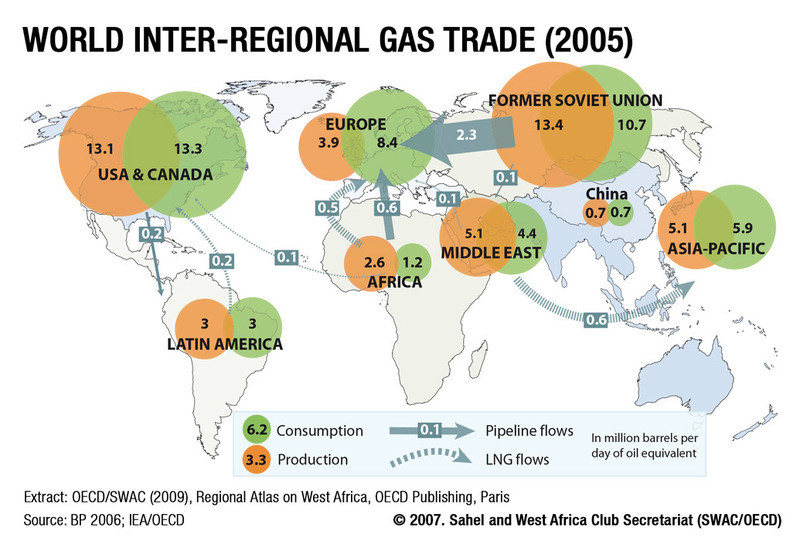 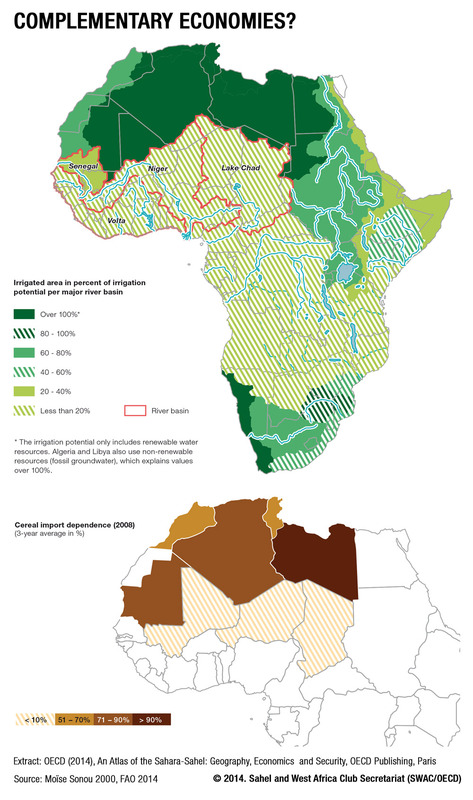 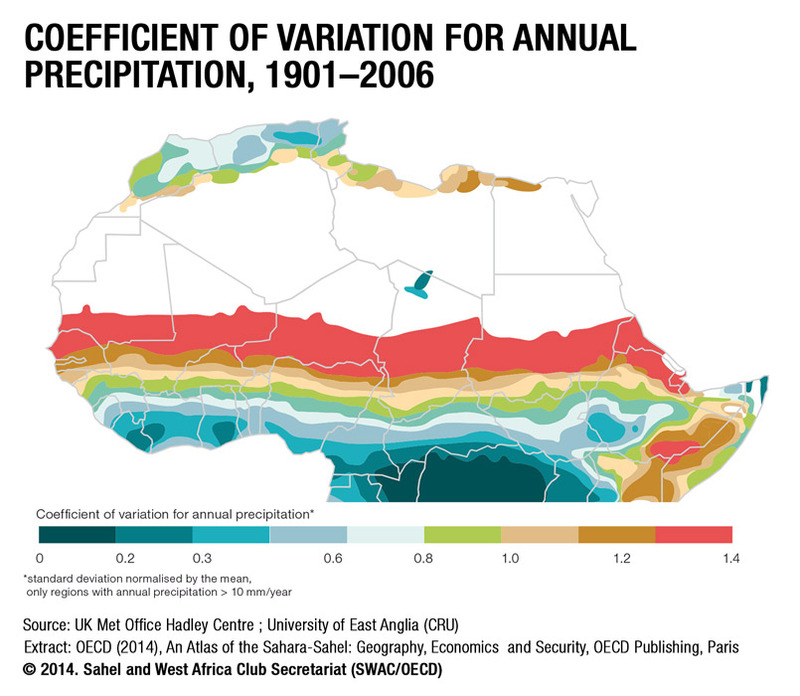 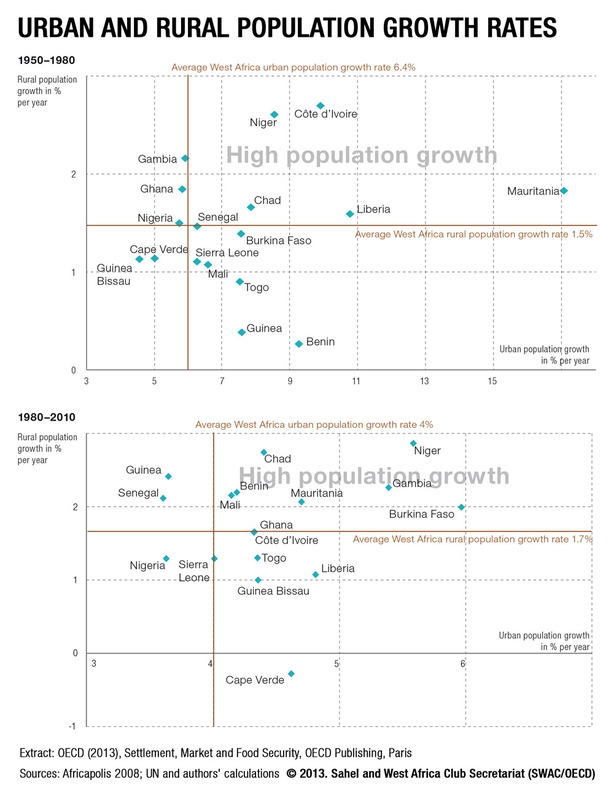 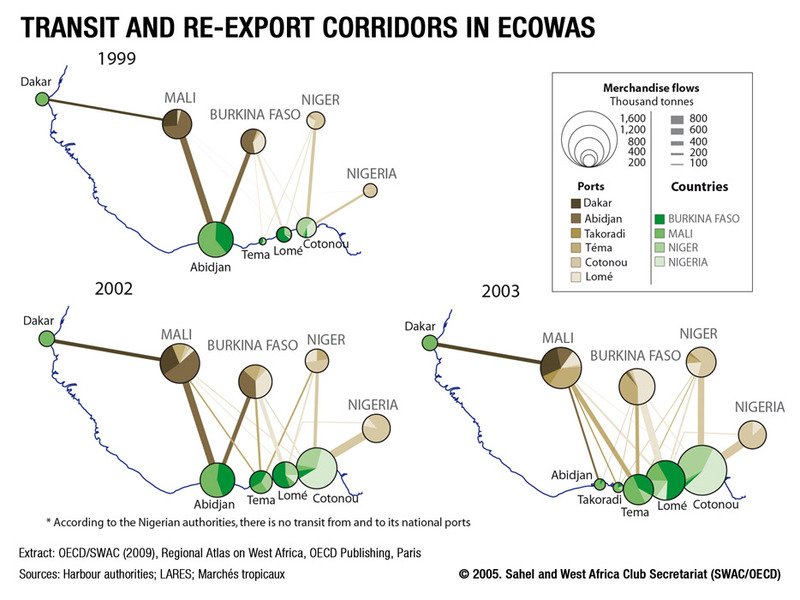 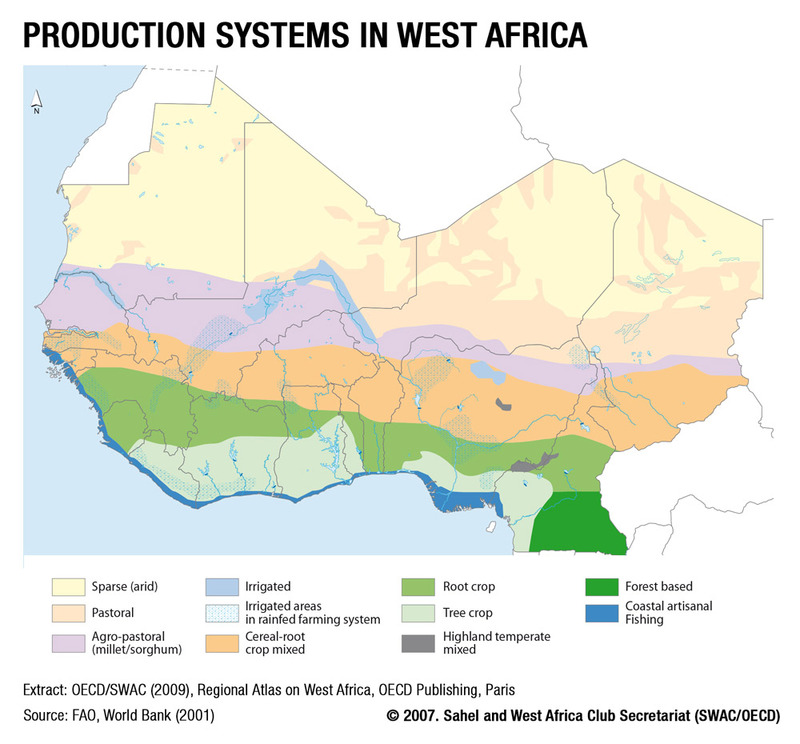 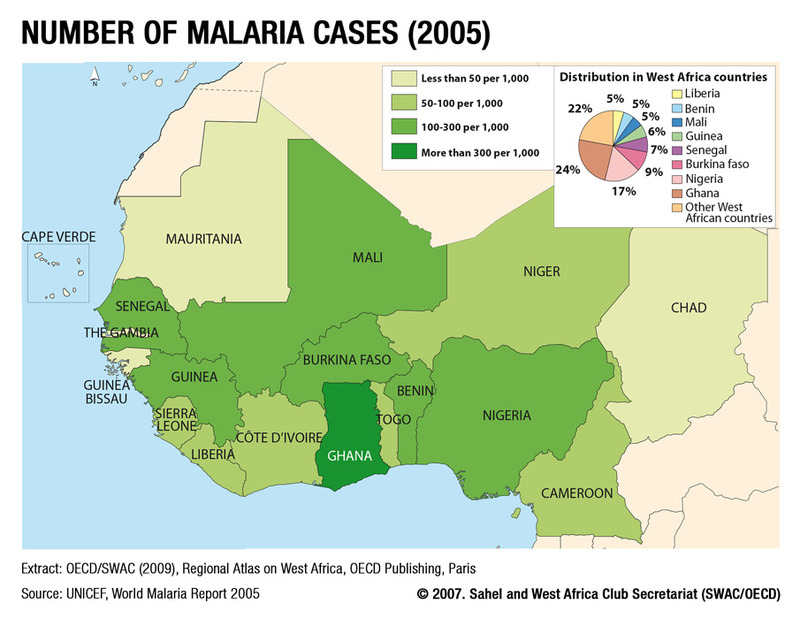 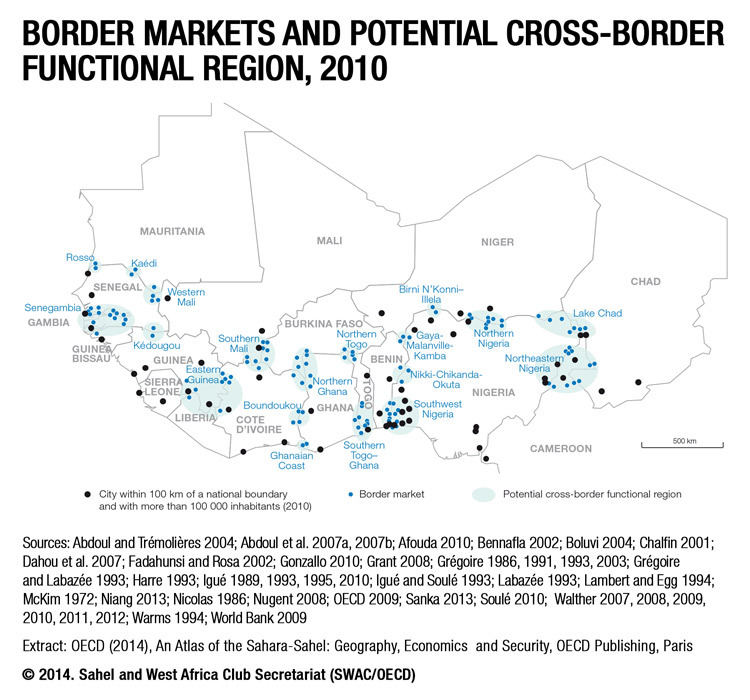 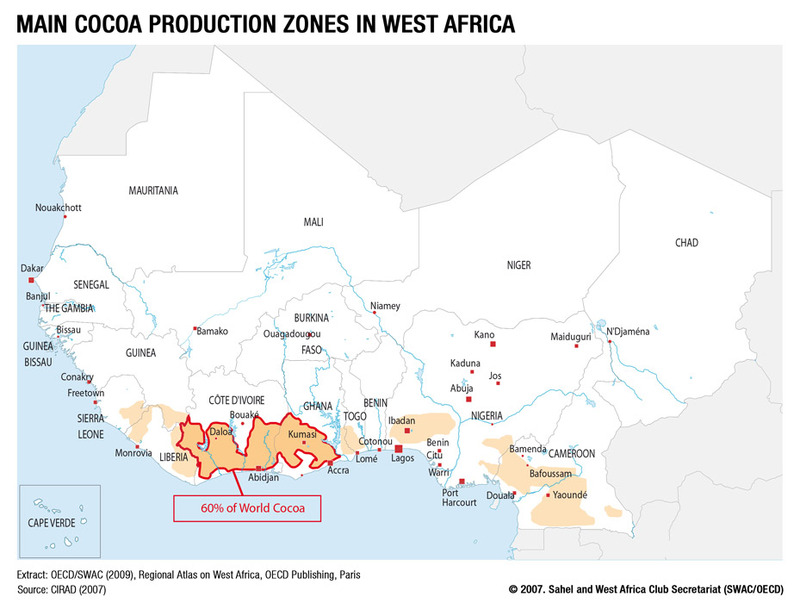 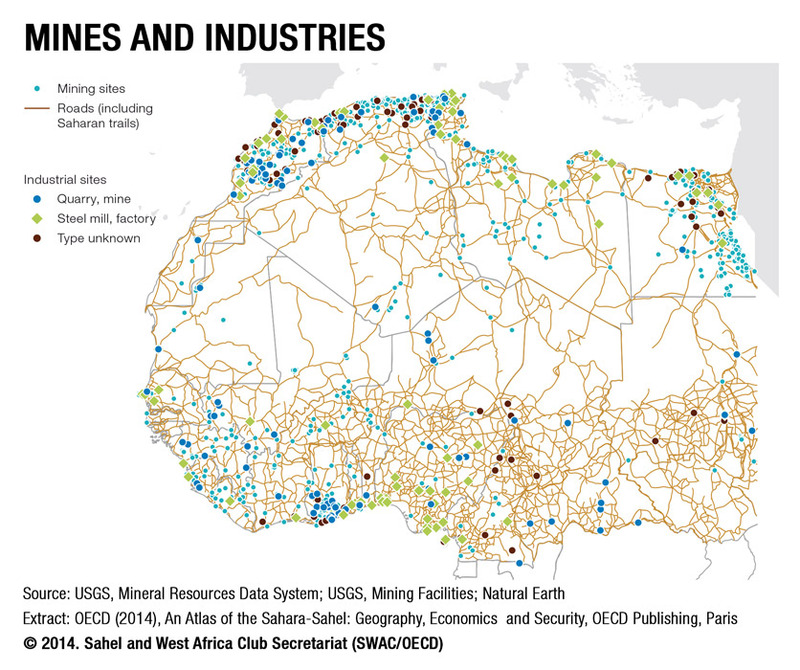 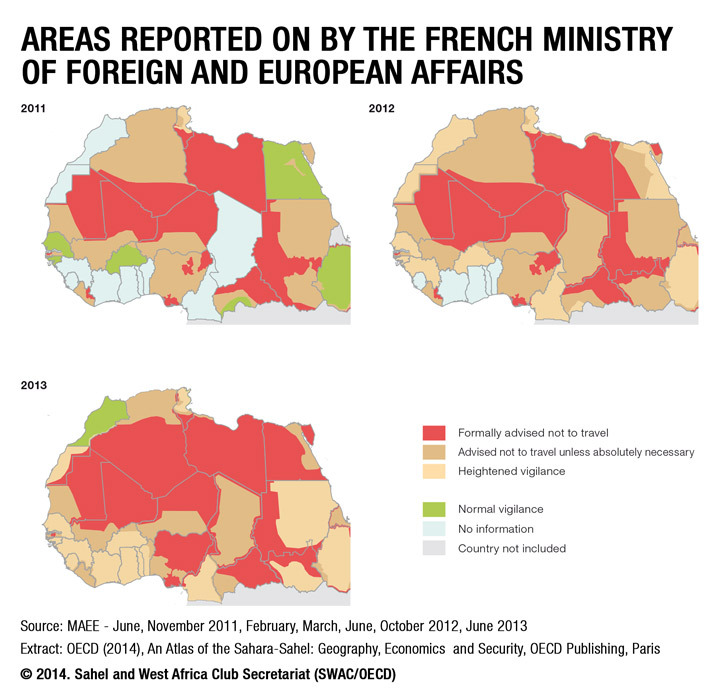 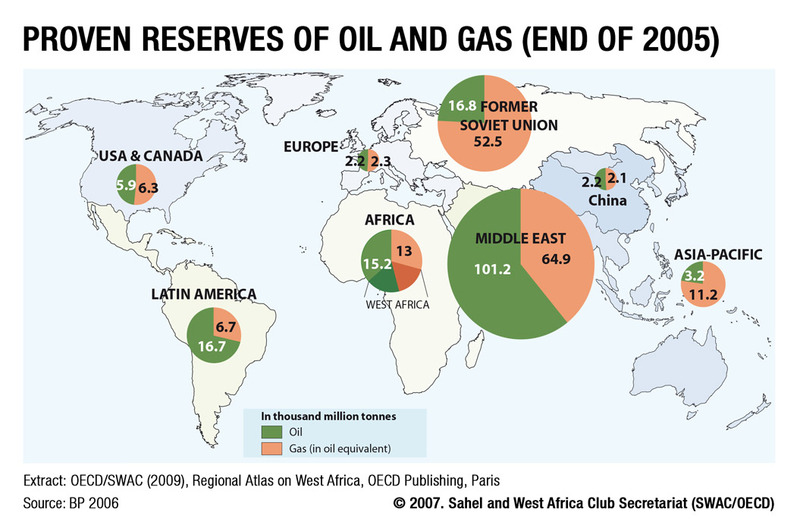 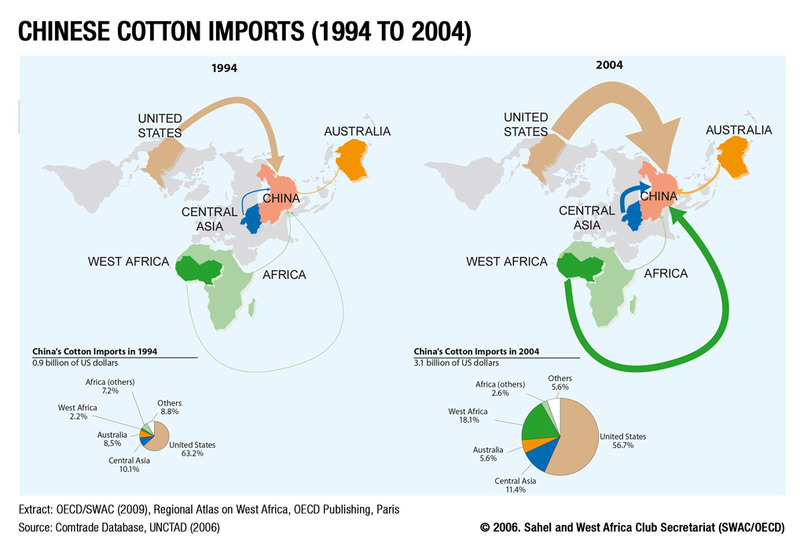 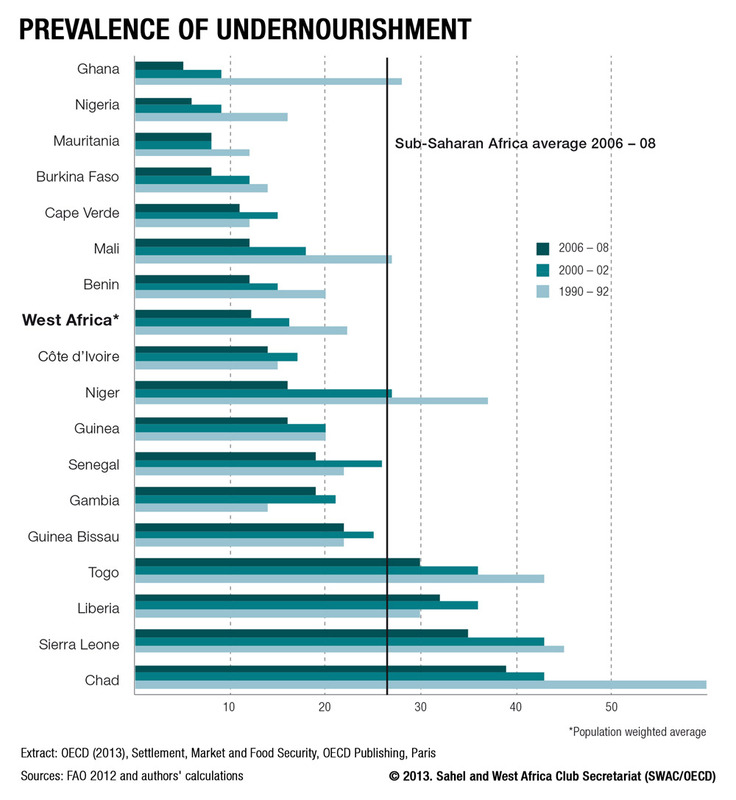 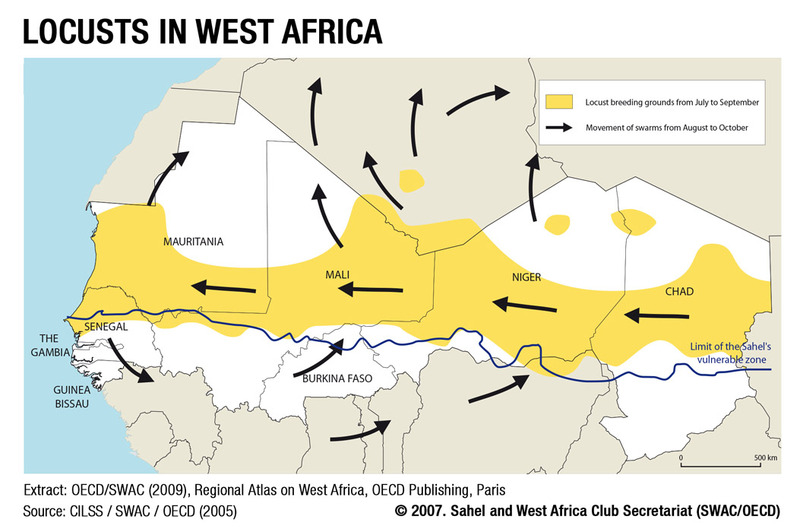 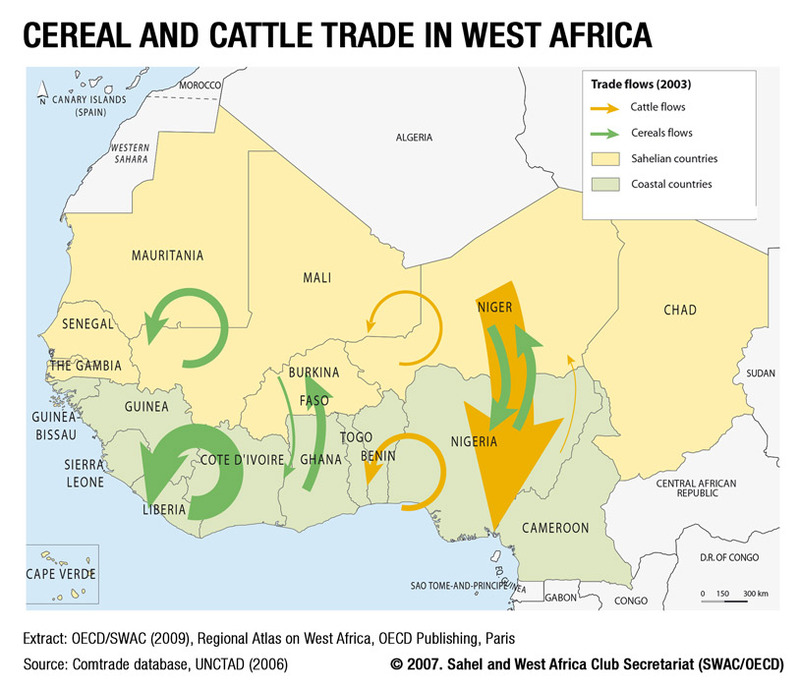 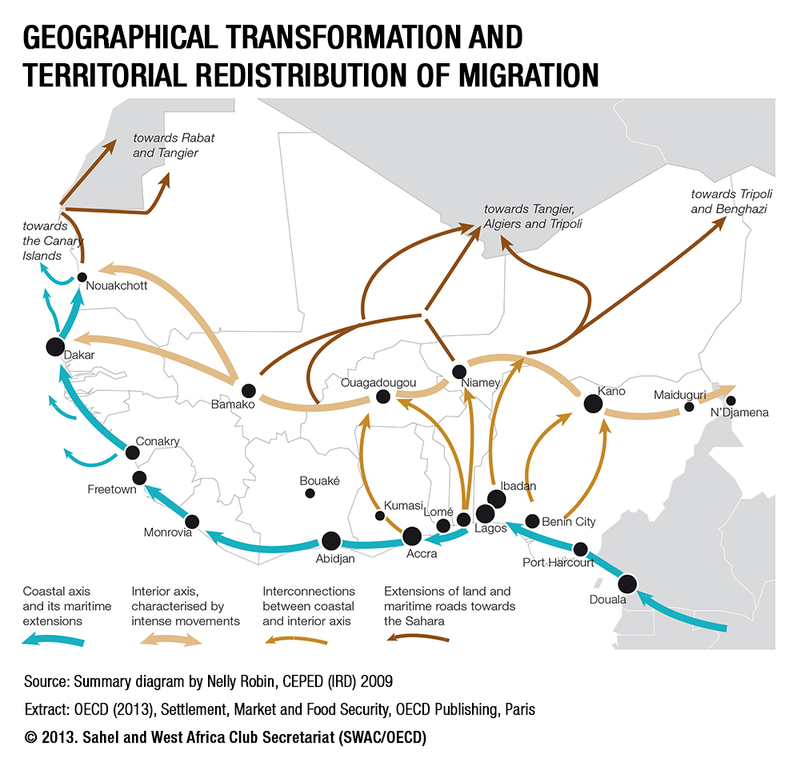 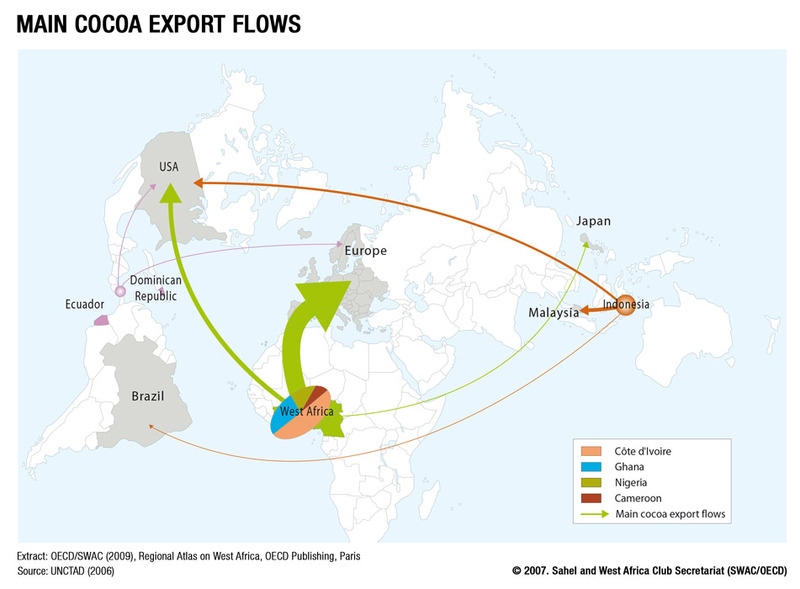 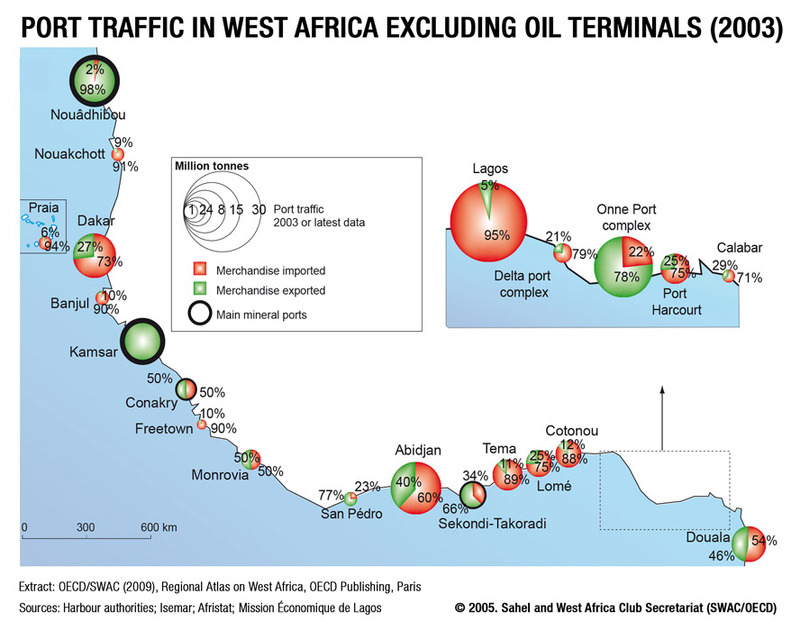 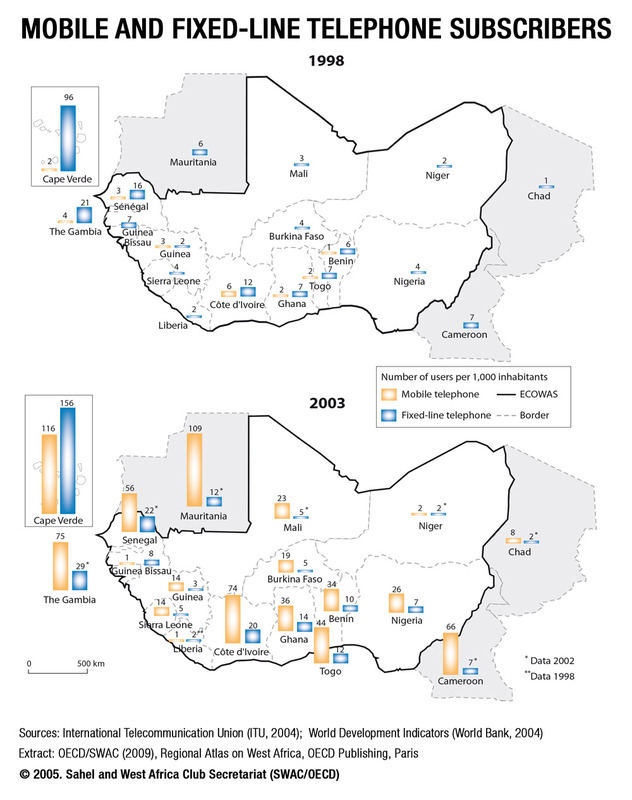 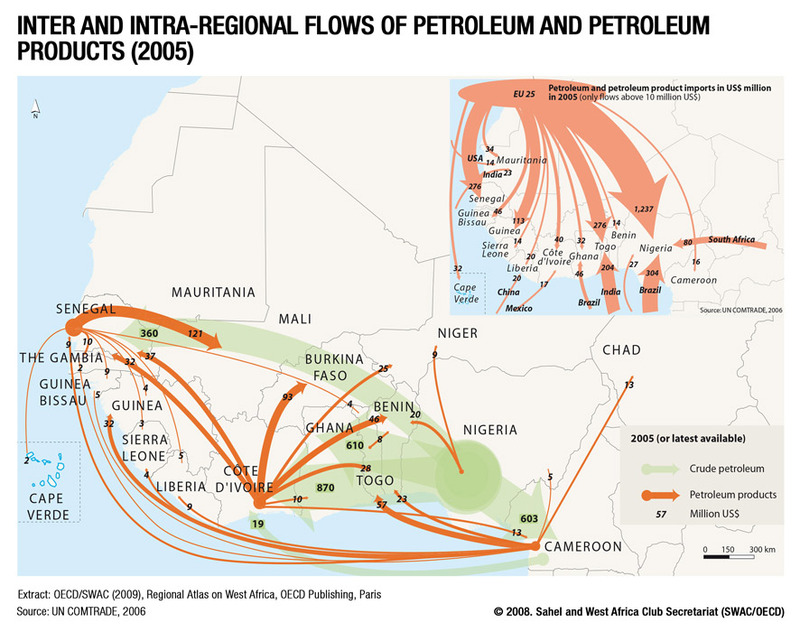 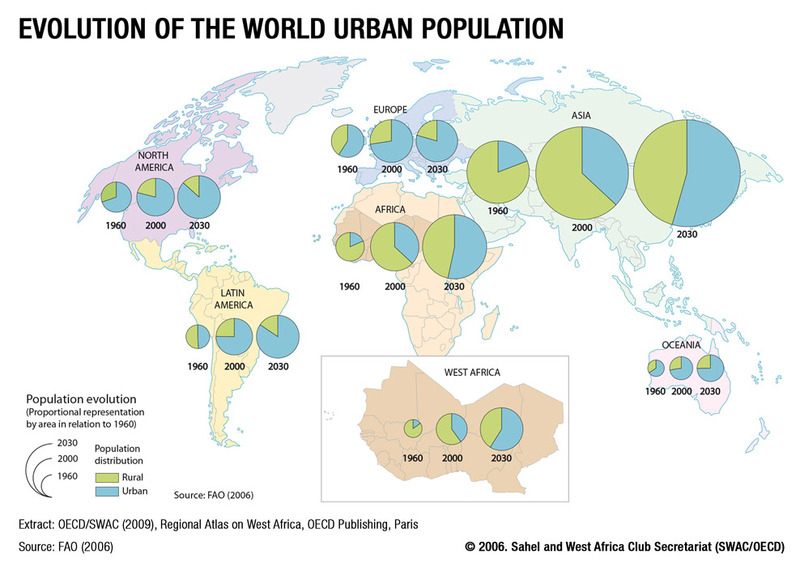 ‌The following maps are extracted from the OECD publication "Regional Atlas on West Africa", published in July 2009. 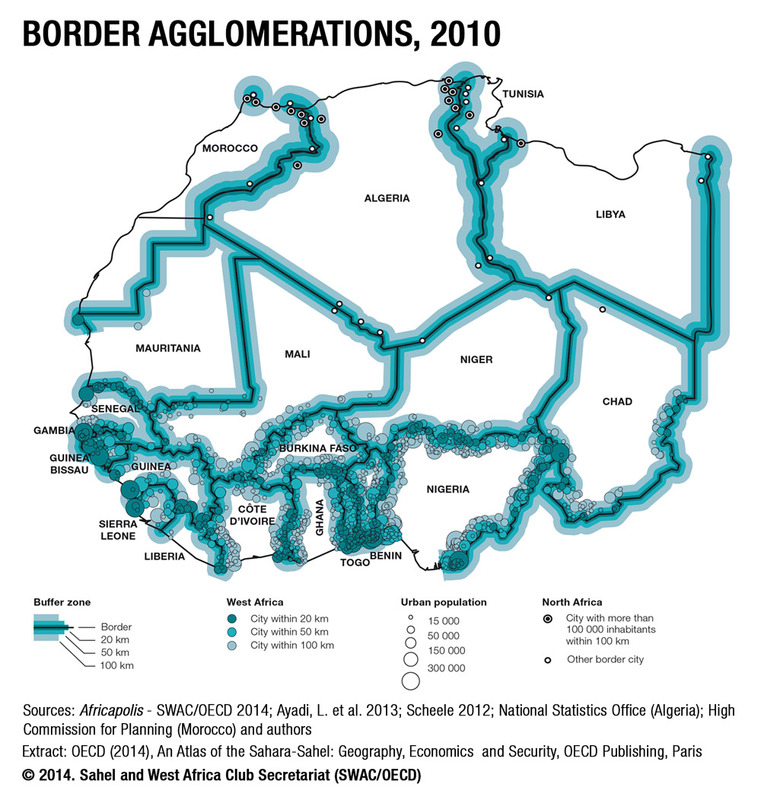 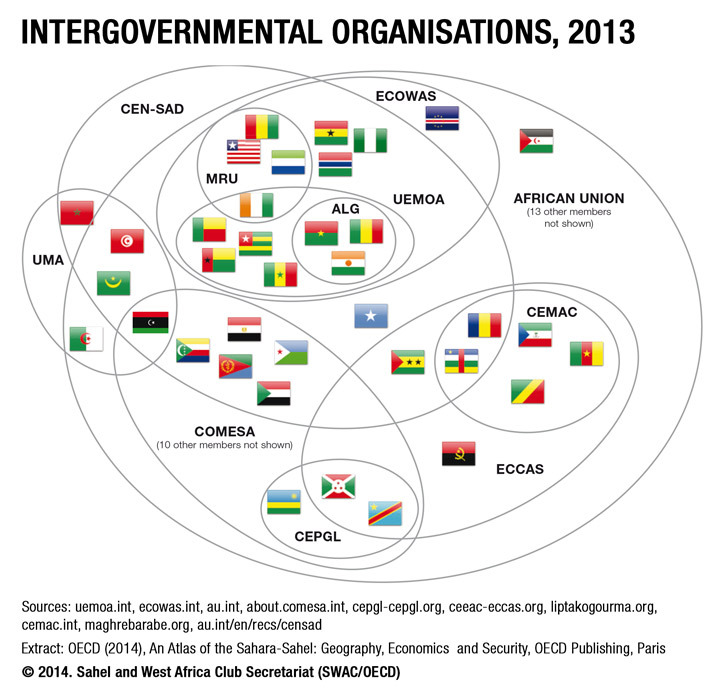 Recent global changes have placed regional integration at the centre of Africa’s political and economic agenda. 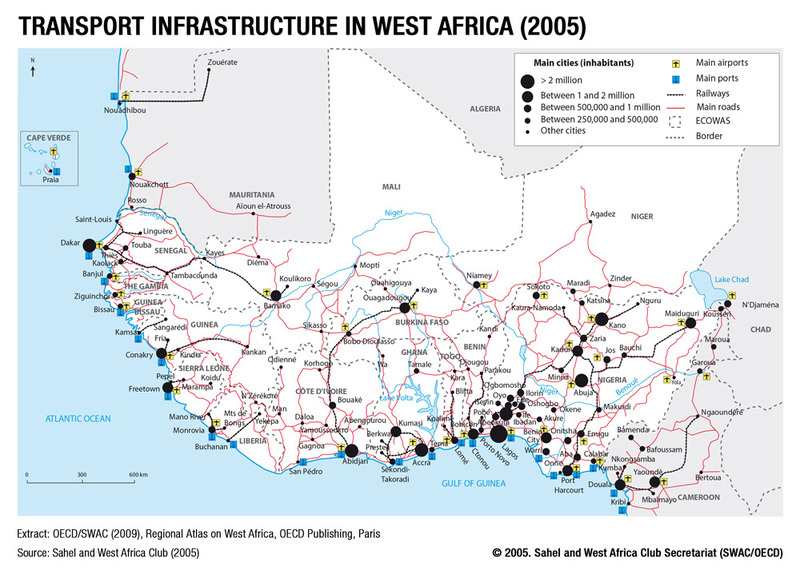 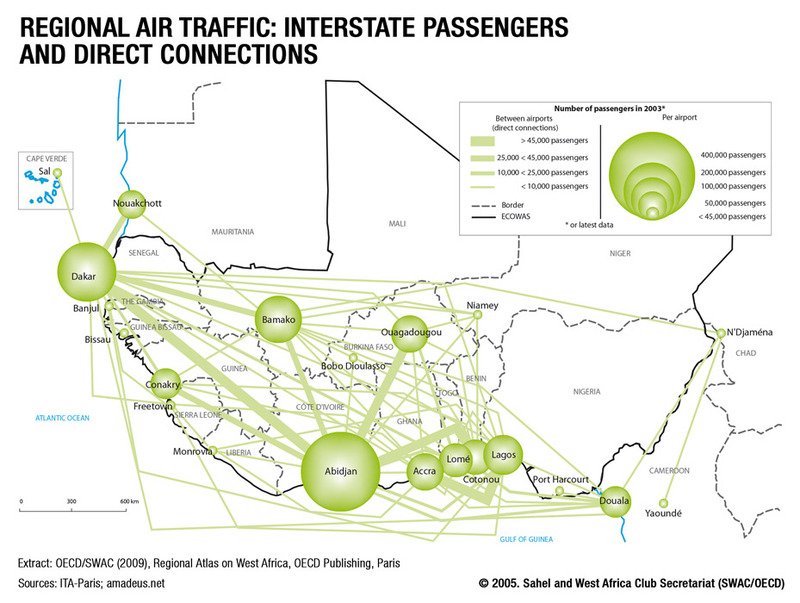 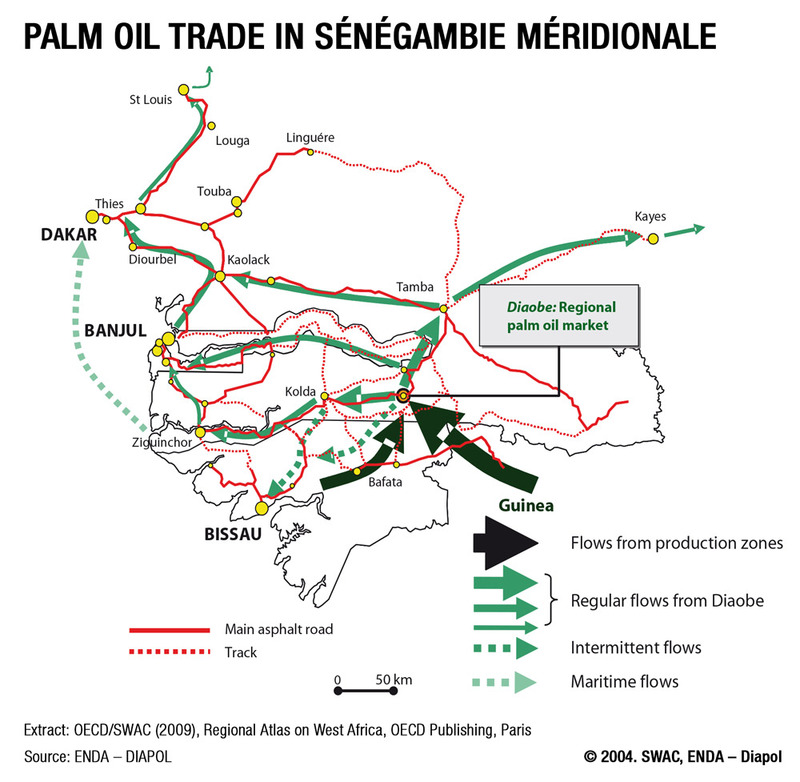 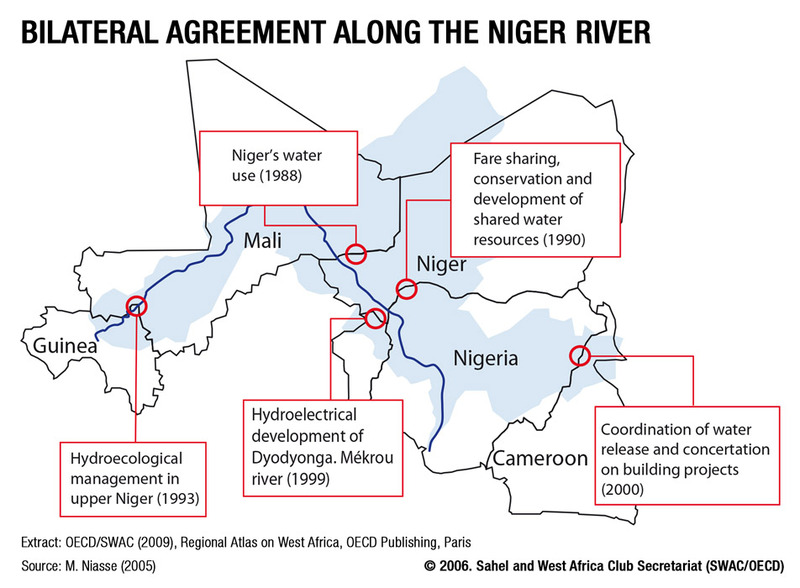 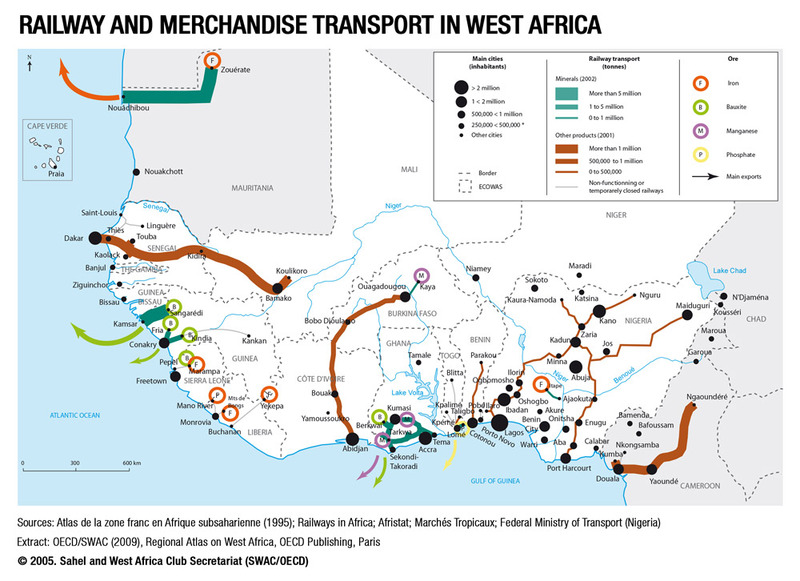 This Atlas is both a driver and the result of strategic thinking on regional integration in West Africa. 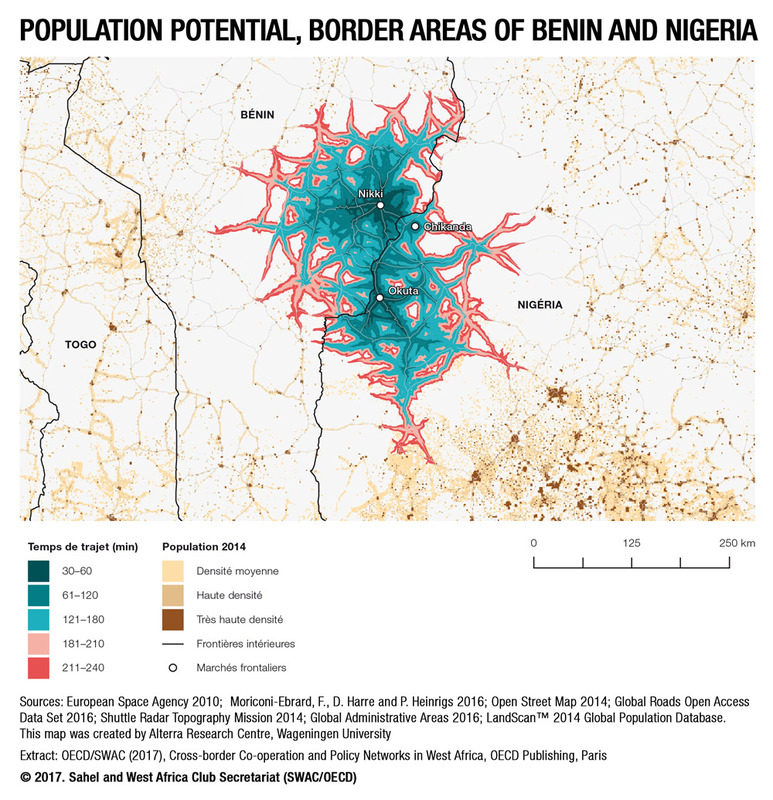 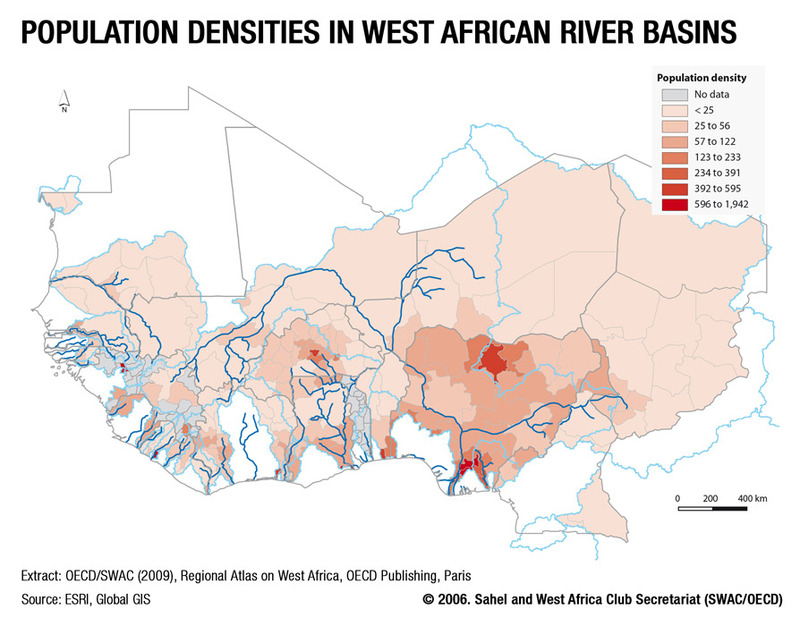 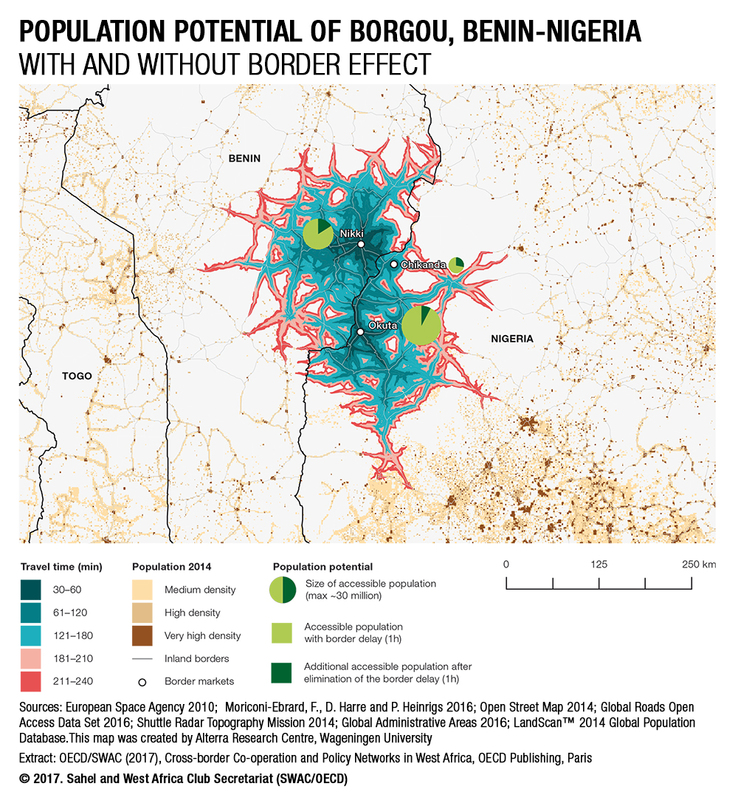 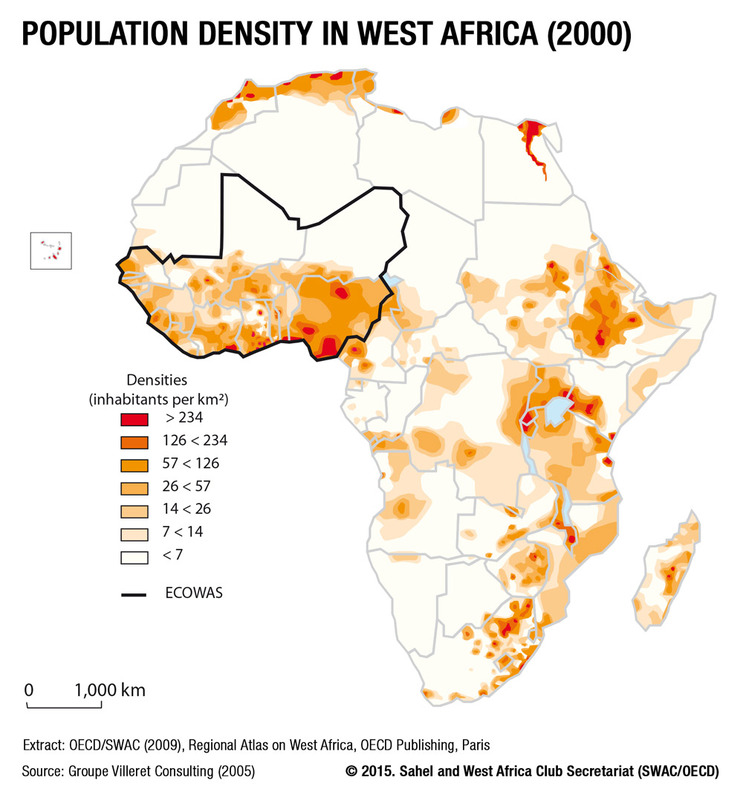 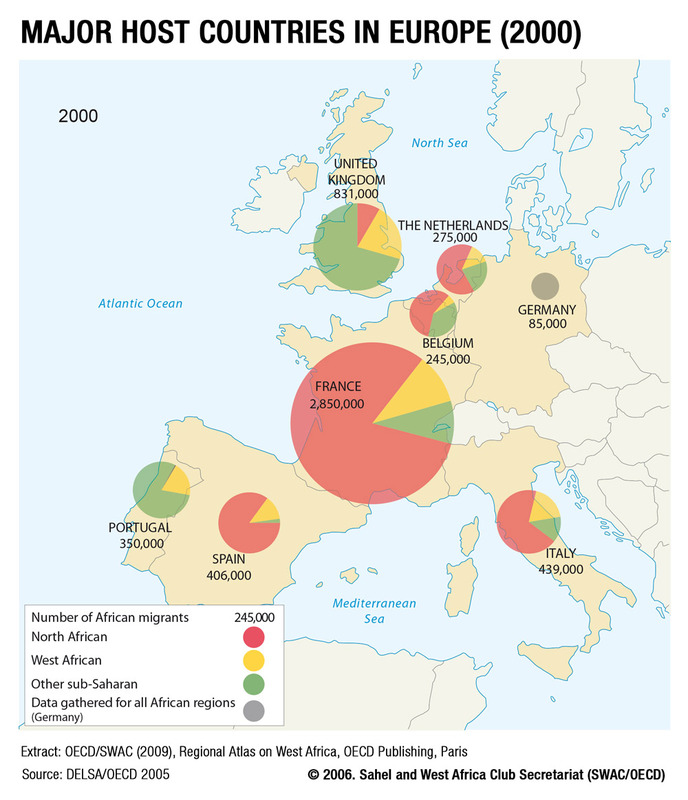 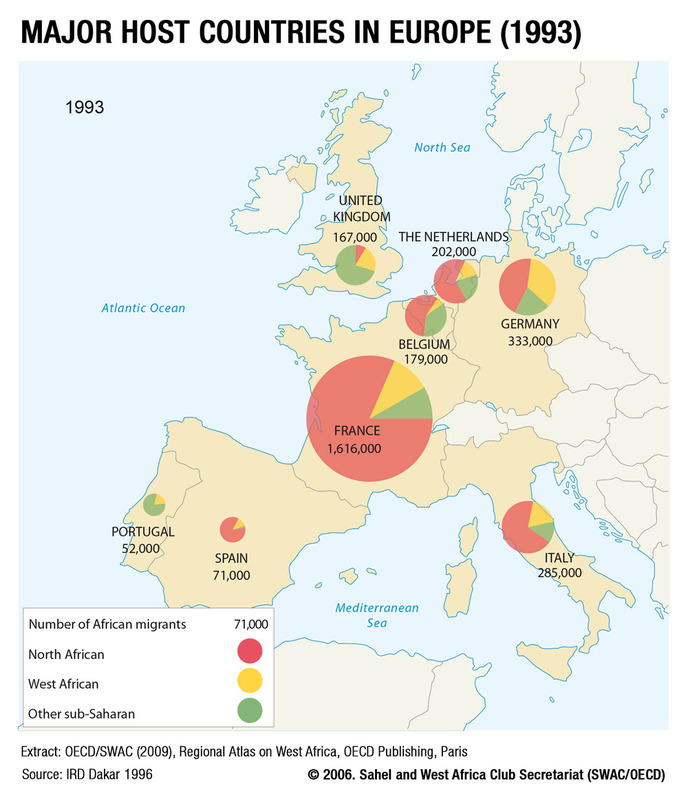 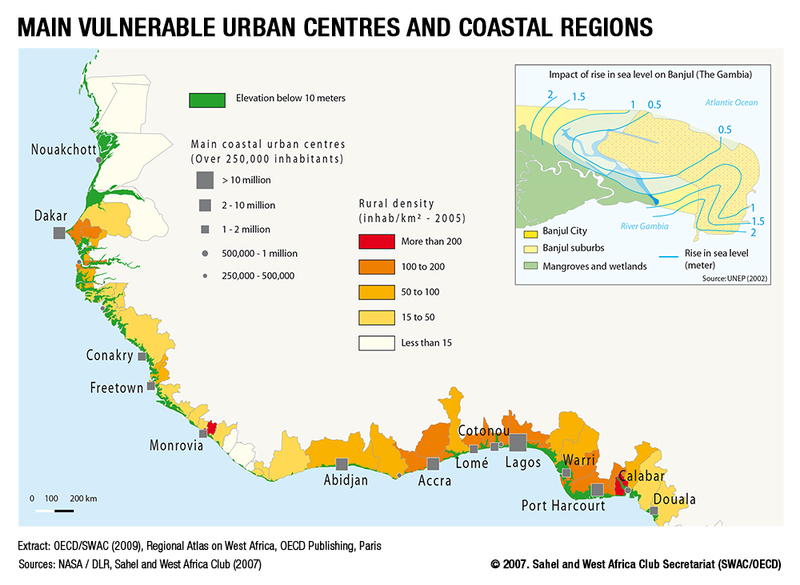 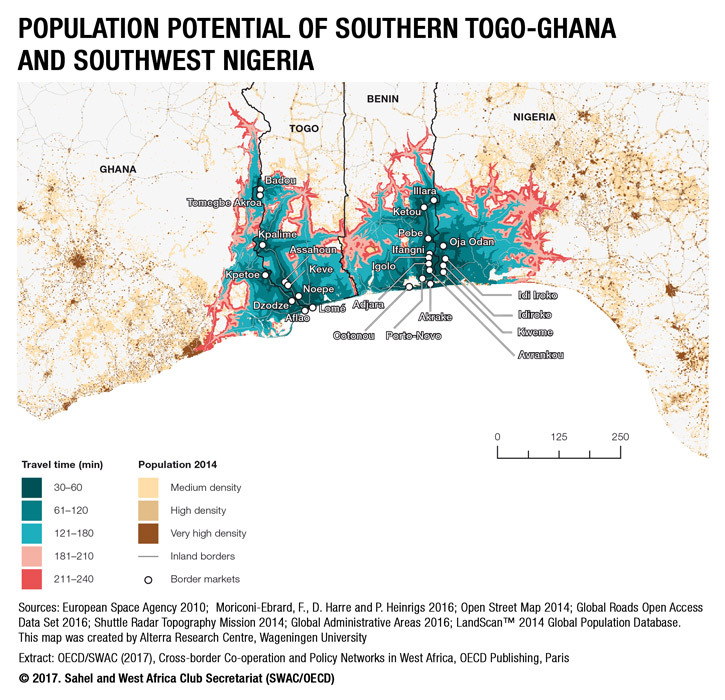 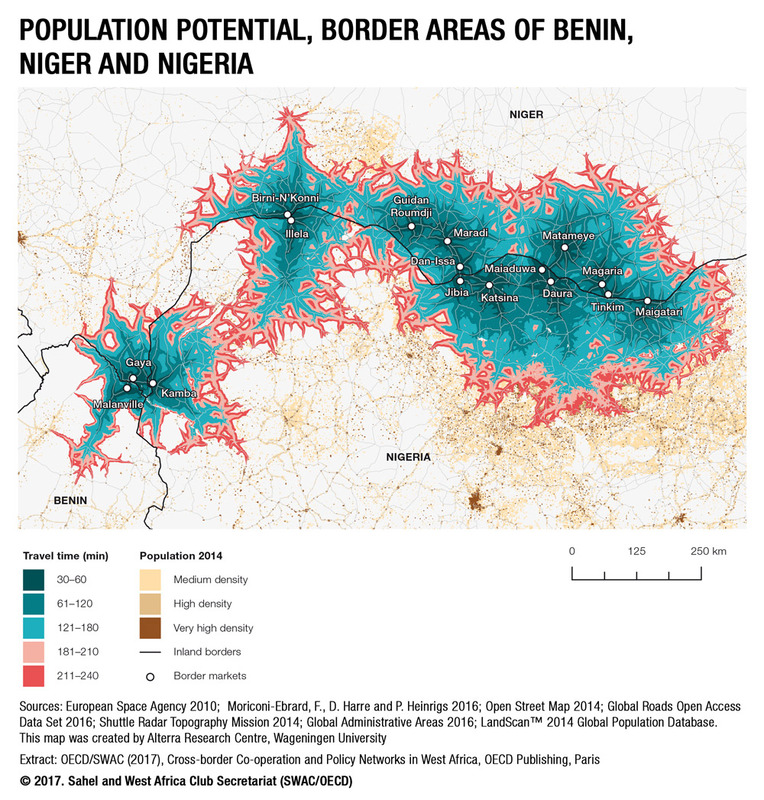 Containing maps, statistics and analyses, it describes the West African region, its population, settlement, territories, its economy and its vulnerabilities. 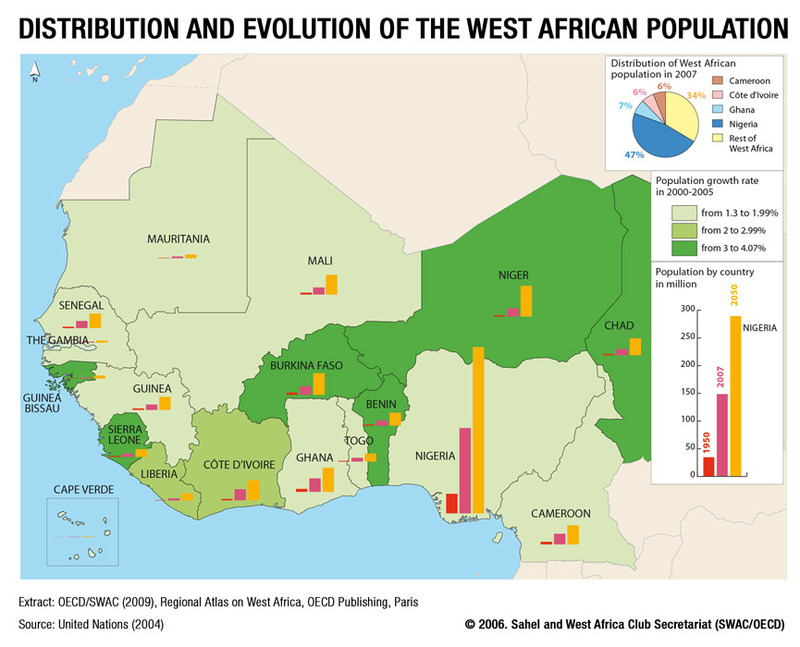 It analyses the developments and the ways in which West Africa is conforming to a constantly changing global environment. 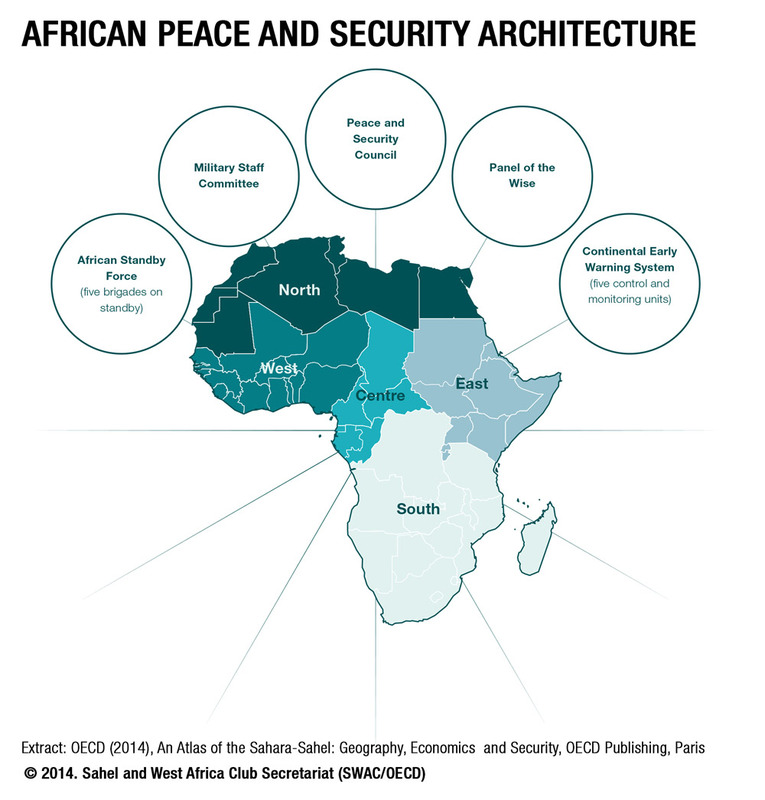 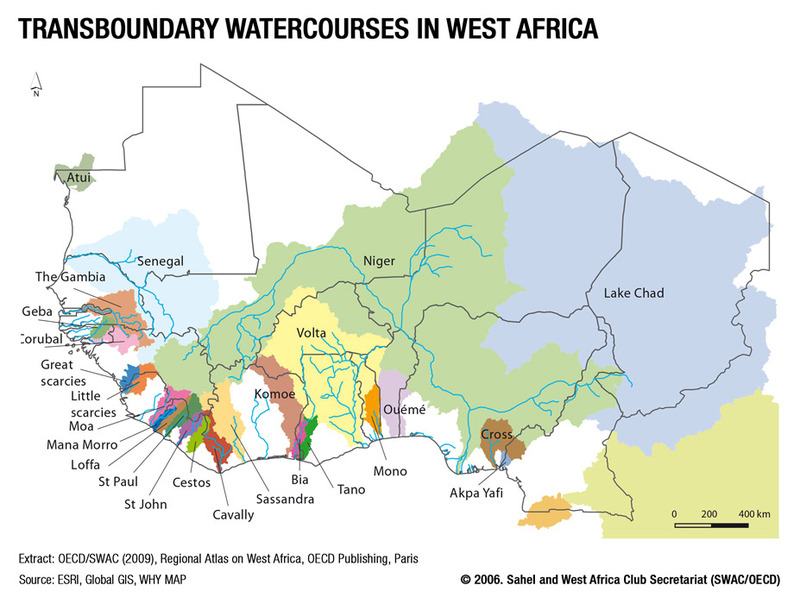 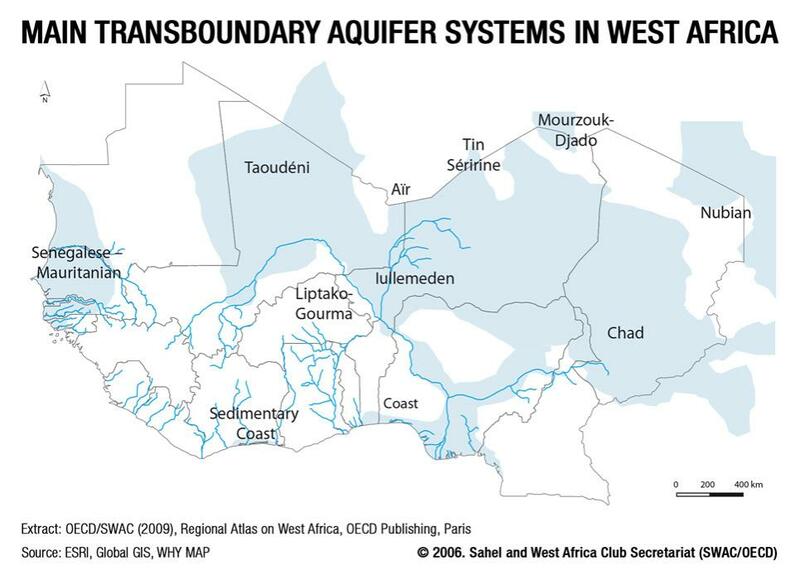 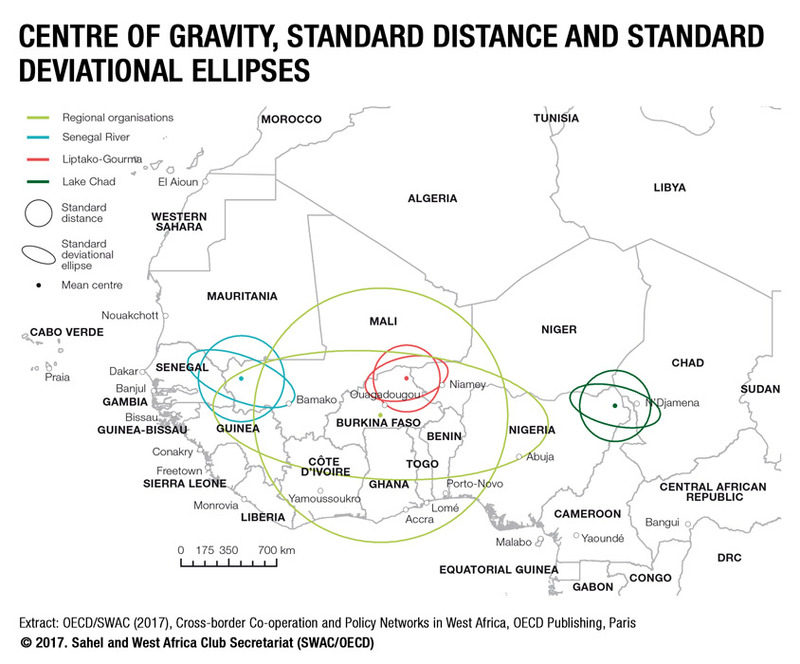 The Atlas is a compilation of chapters, which were jointly published by the SWAC Secretariat and the ECOWAS Commission. 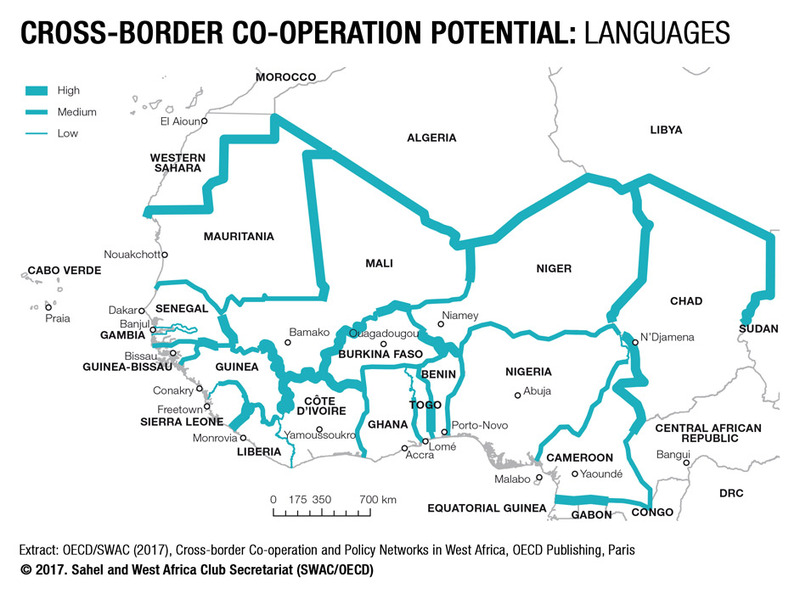 It aims to increase understanding of regional integration dynamics in West Africa and thereby hopes to facilitate the building of a regional space in West Africa. 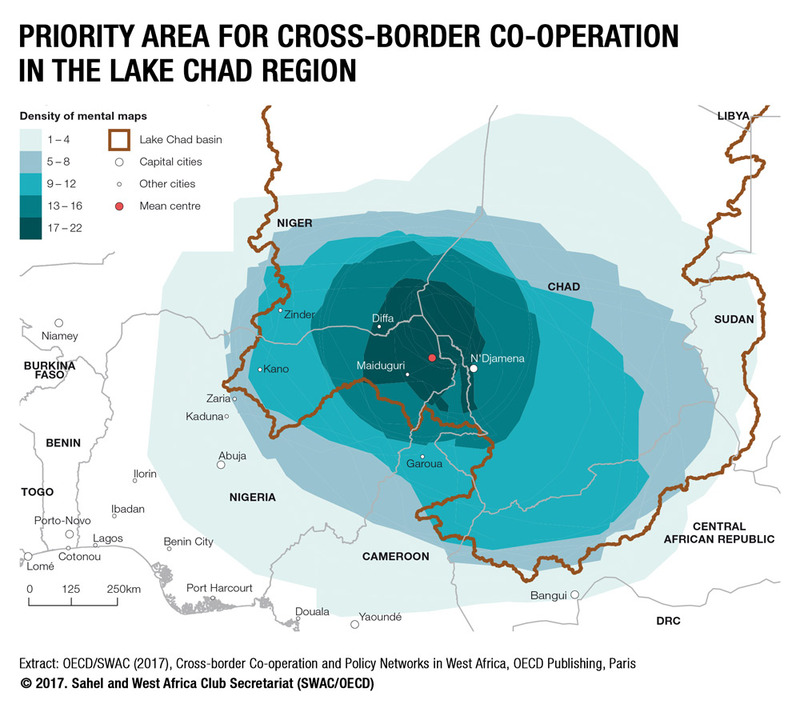 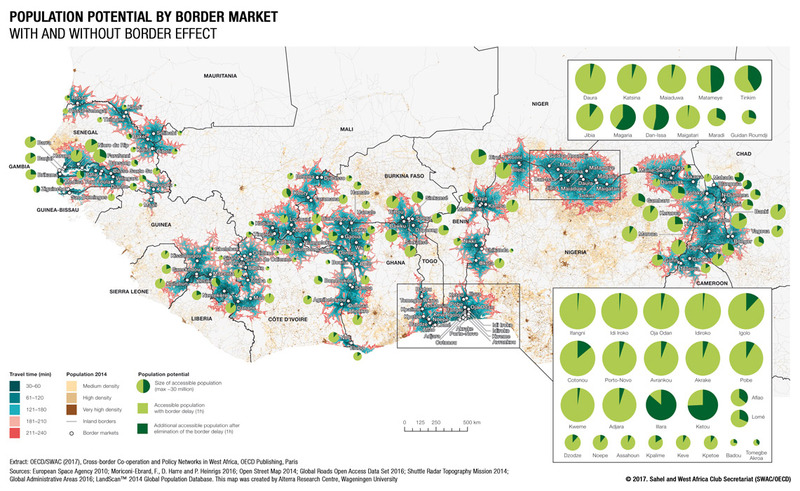 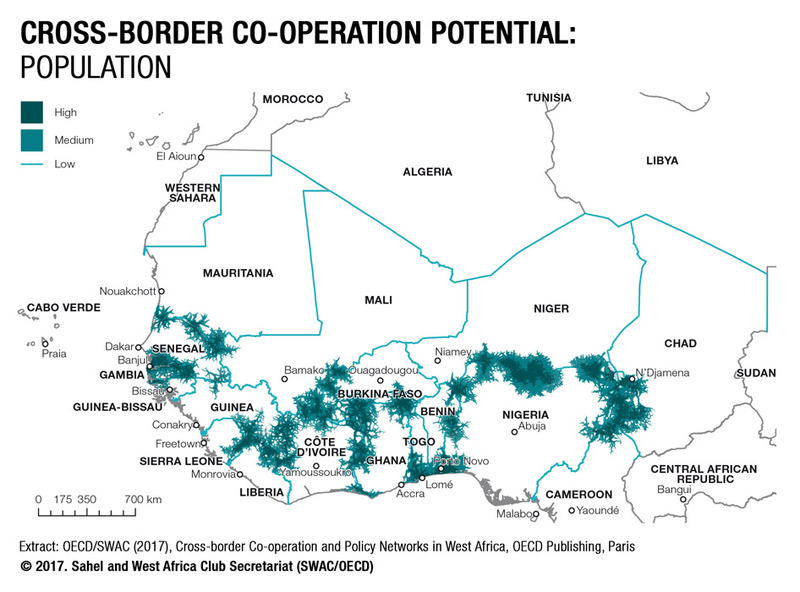 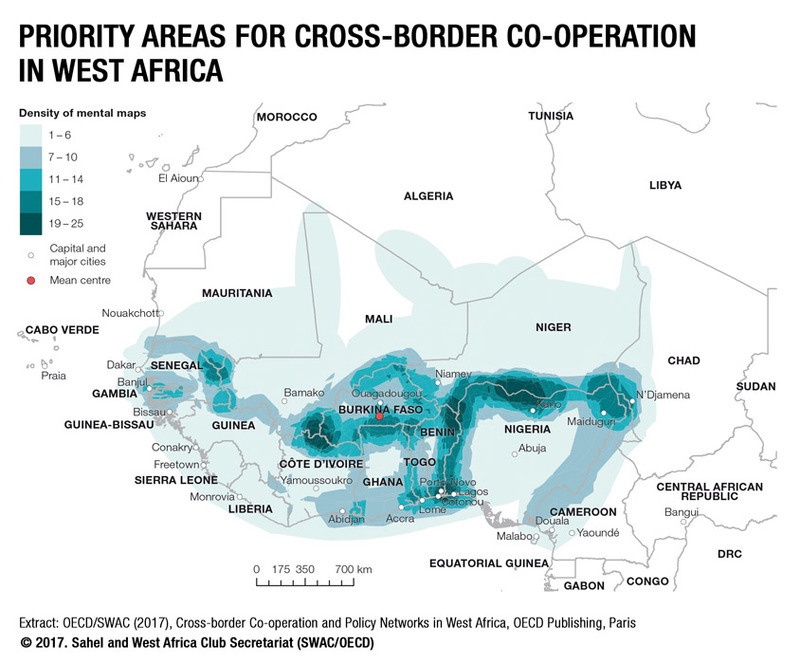 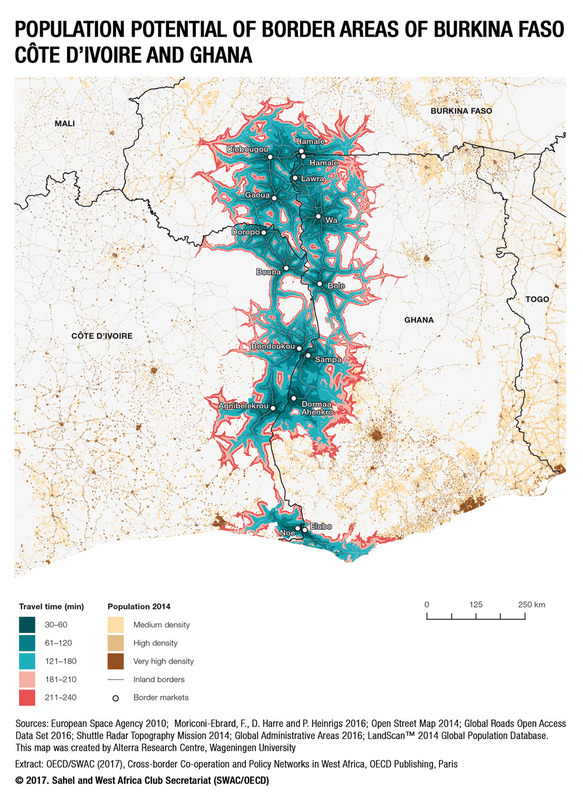 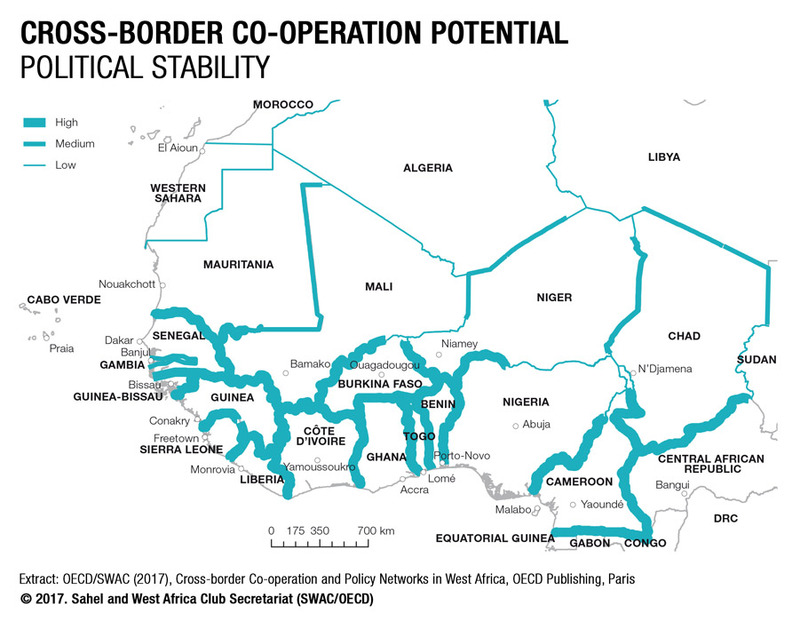 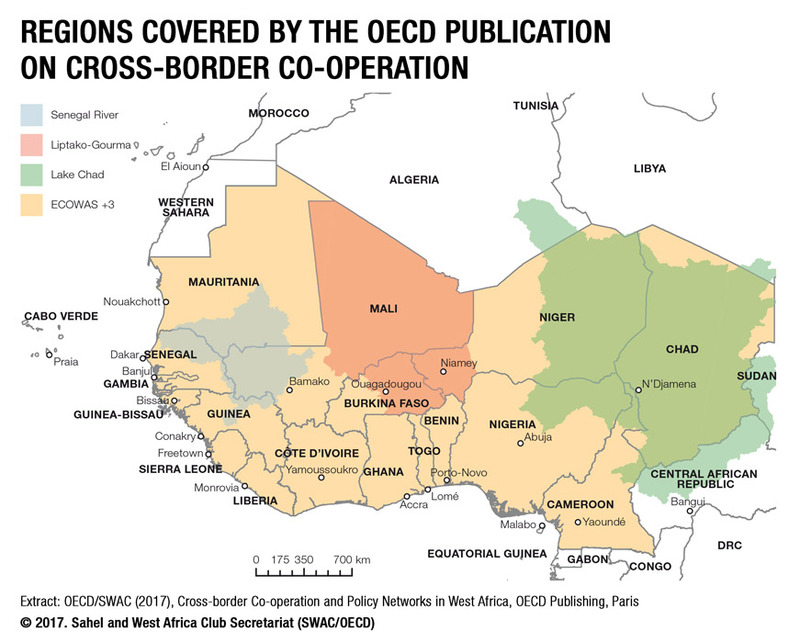 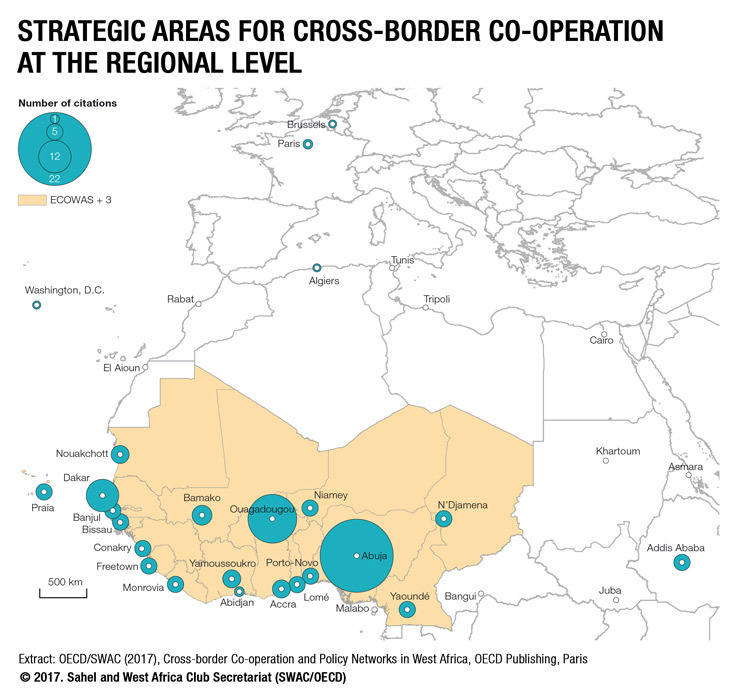 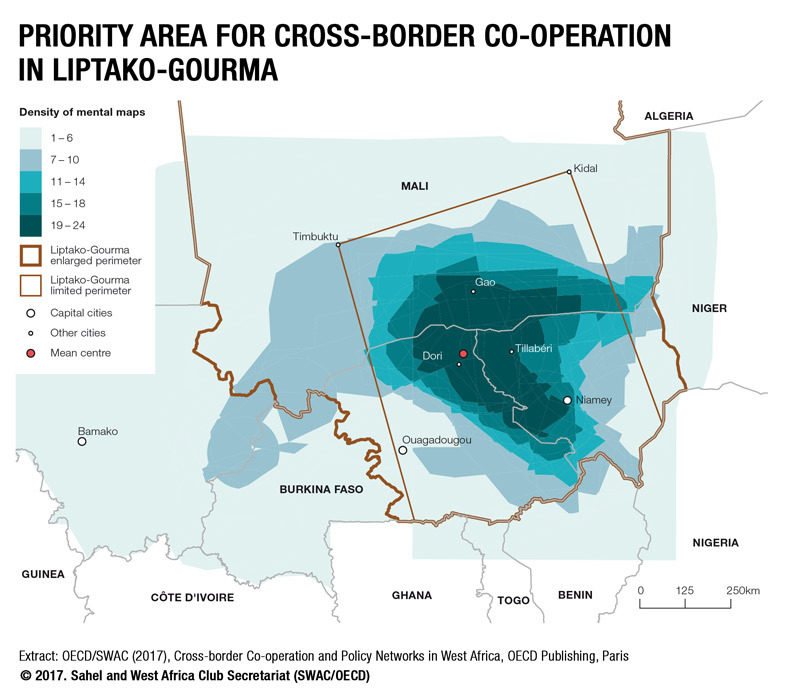 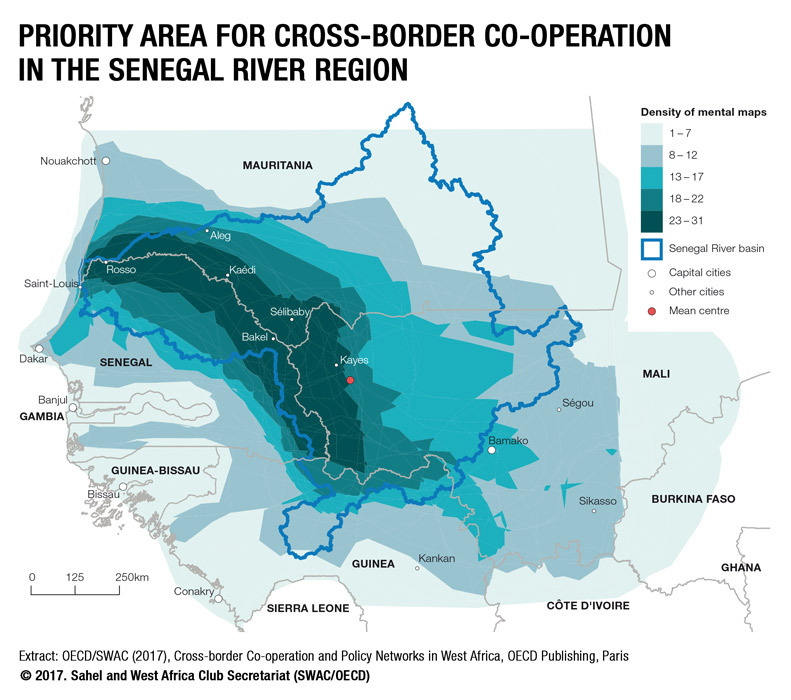 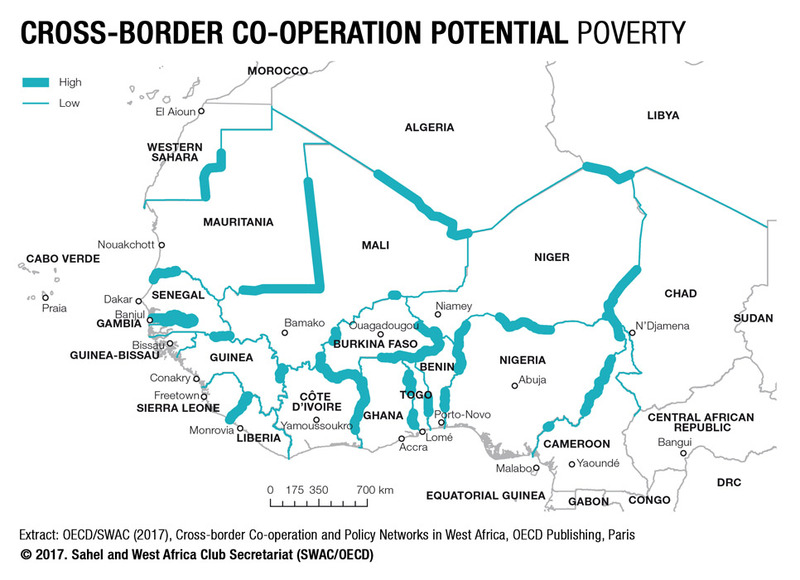 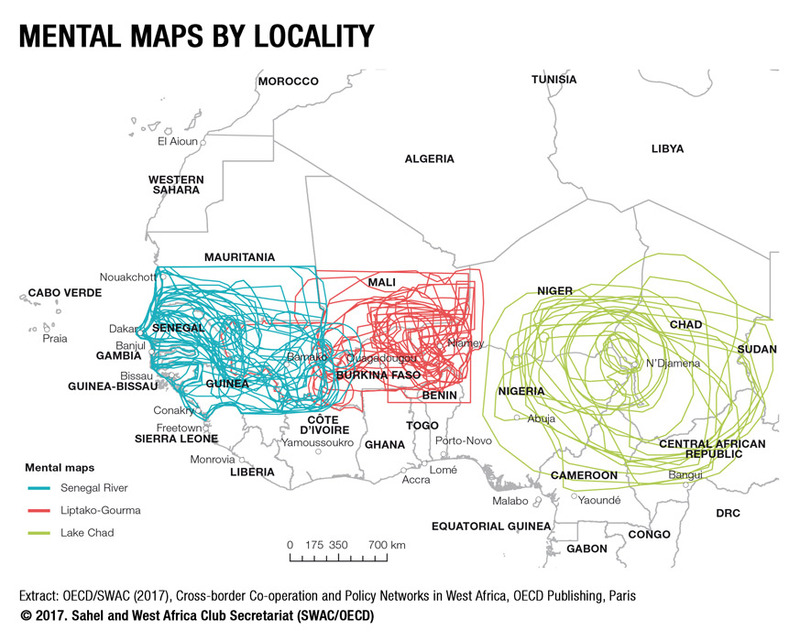 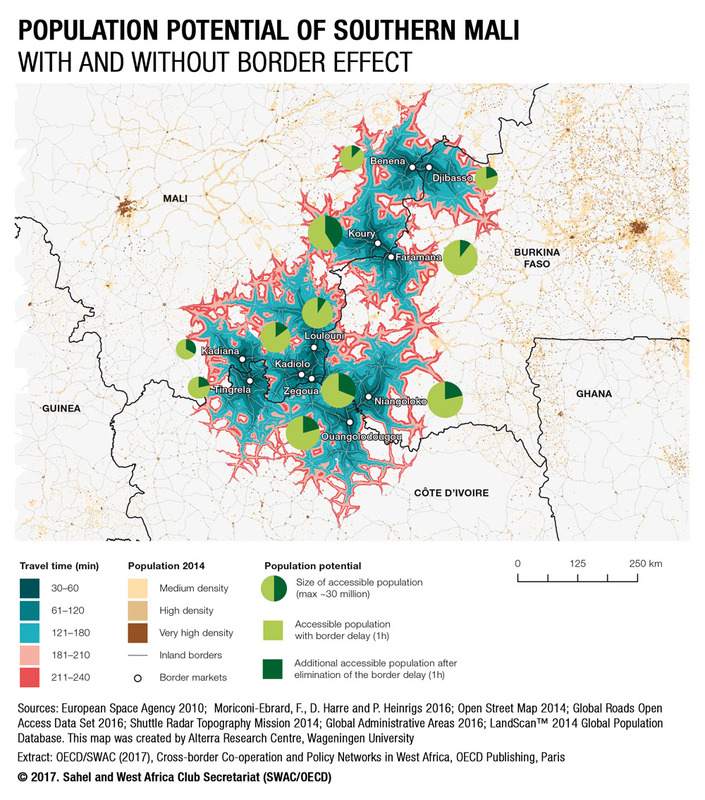 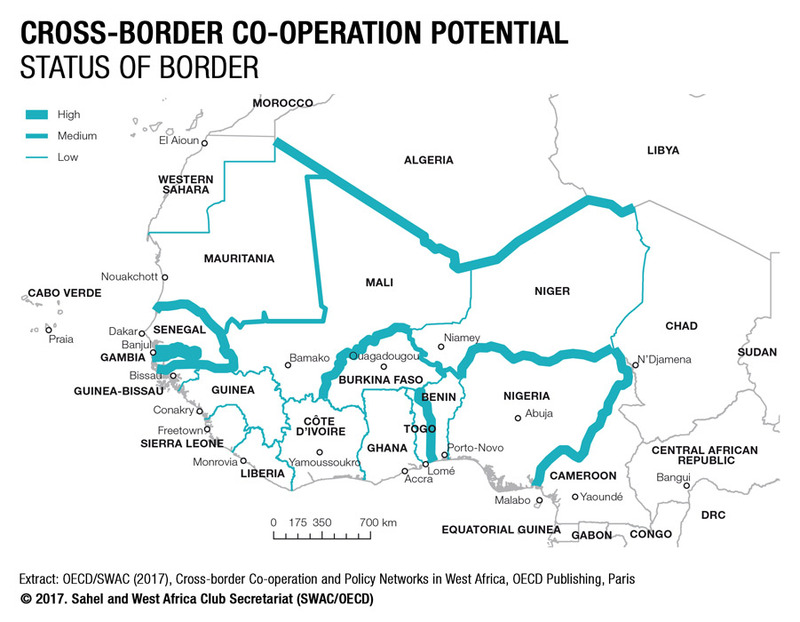 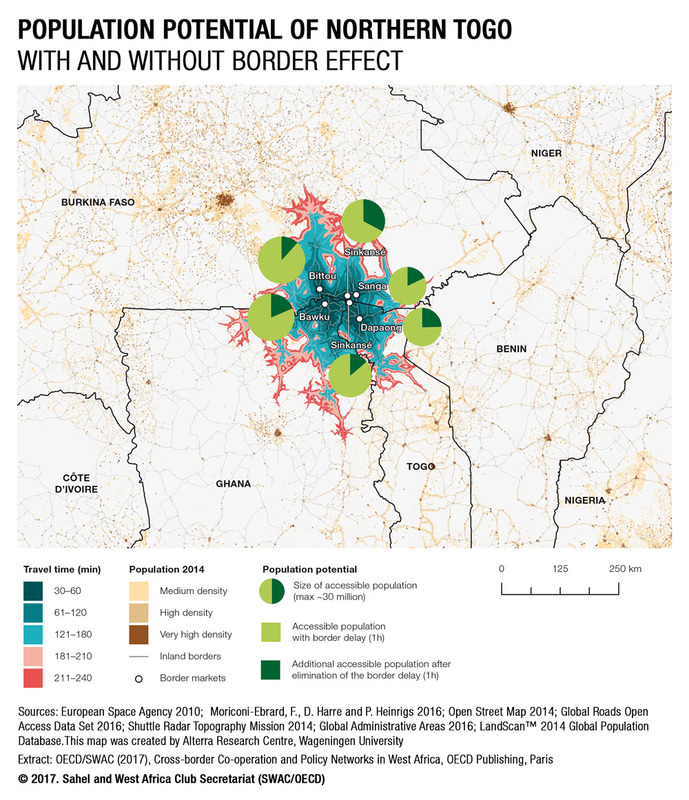 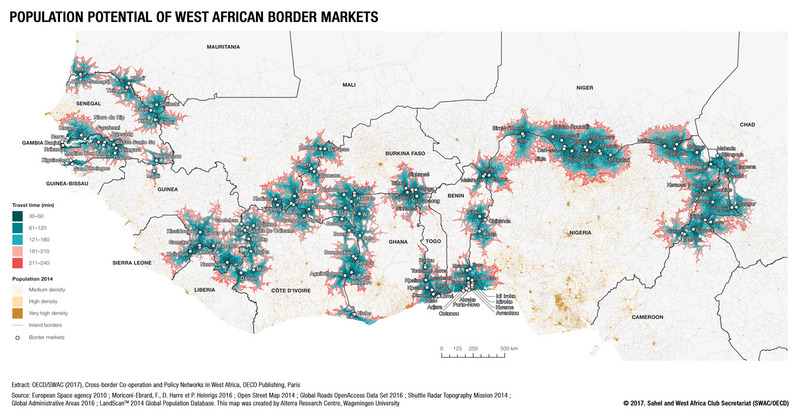 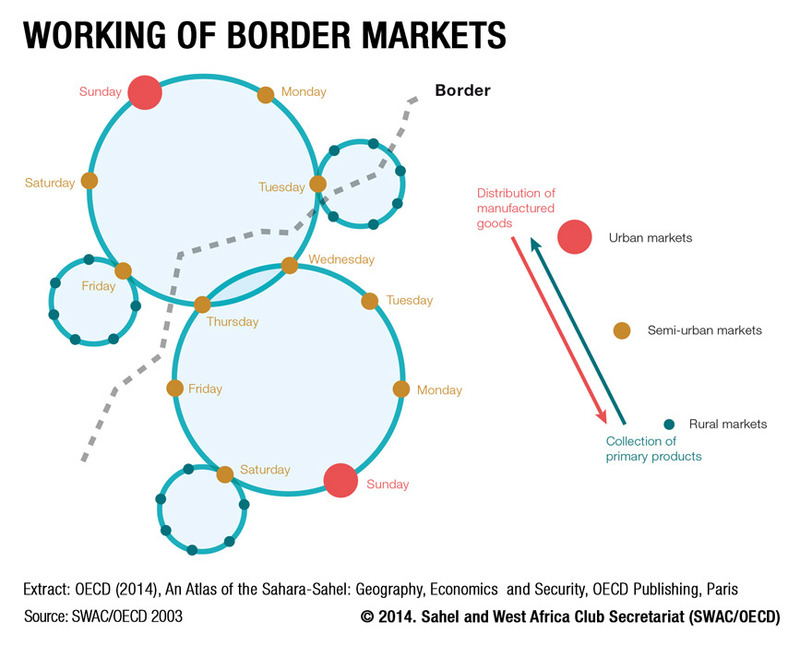 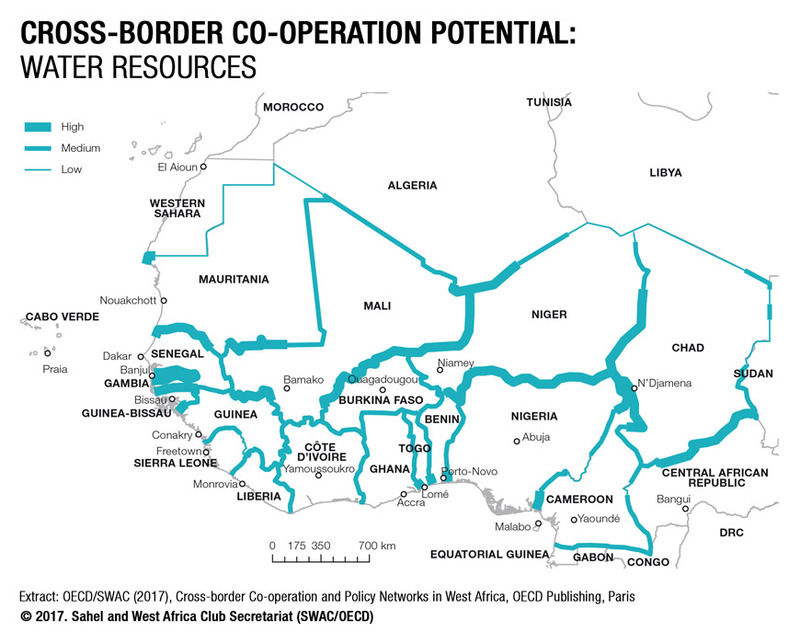 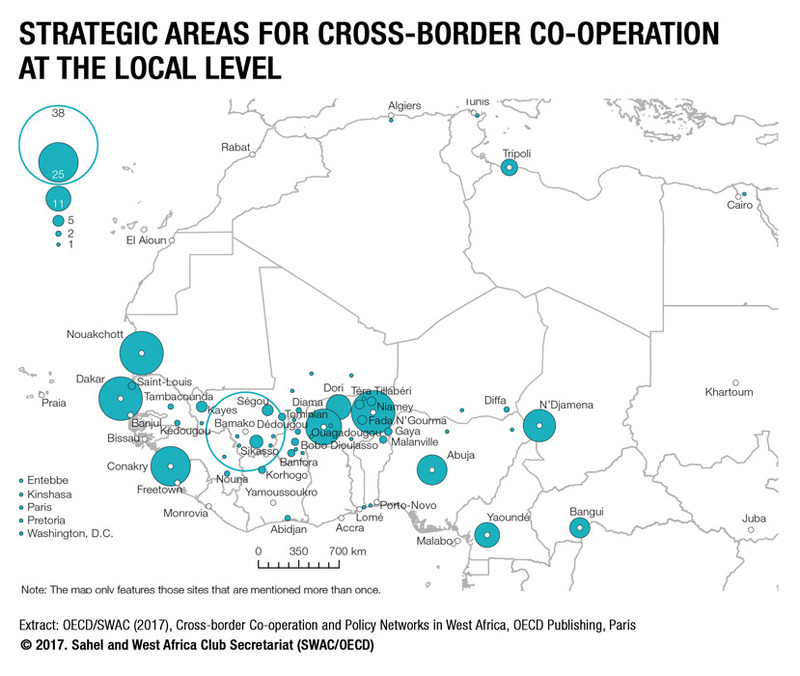 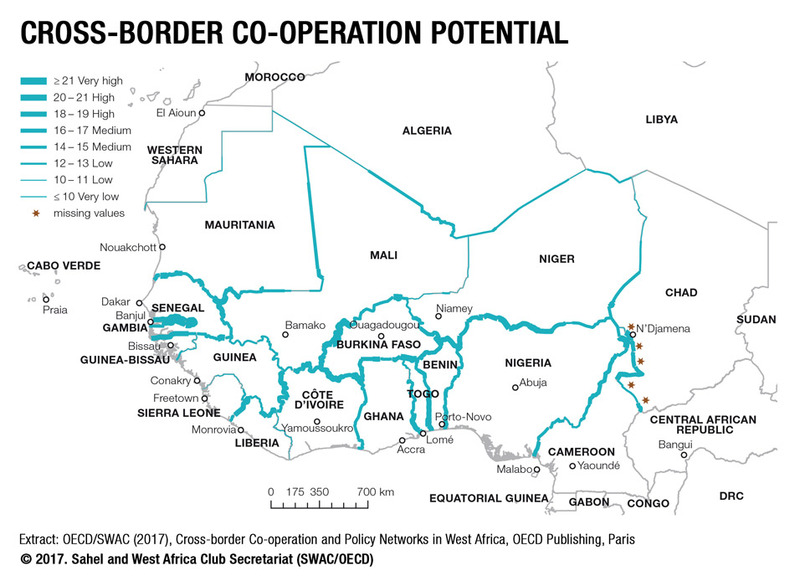 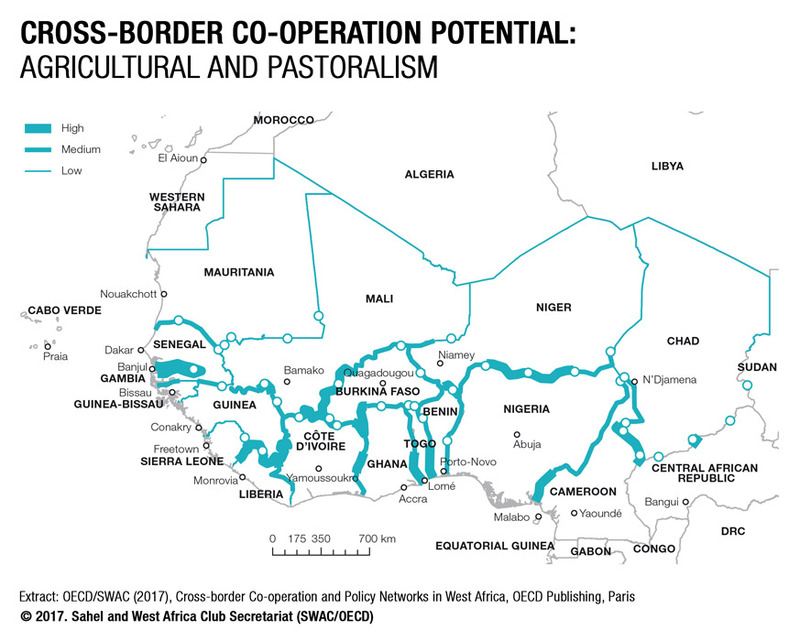 ‌The following maps are extracted from the OECD publication "Cross-border Co-operation and Policy Networks in West Africa", published in January 2017. 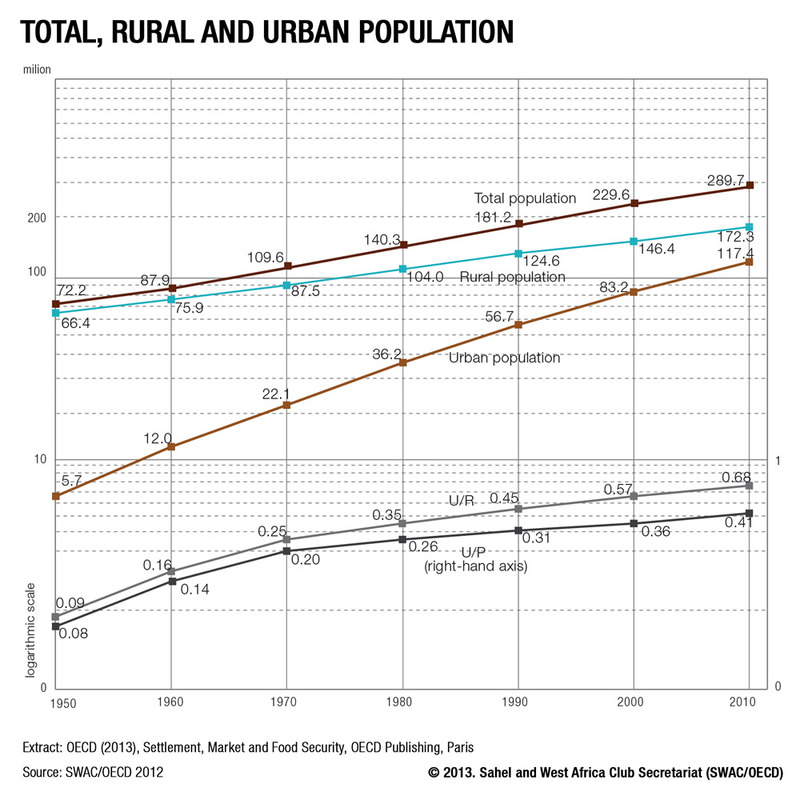 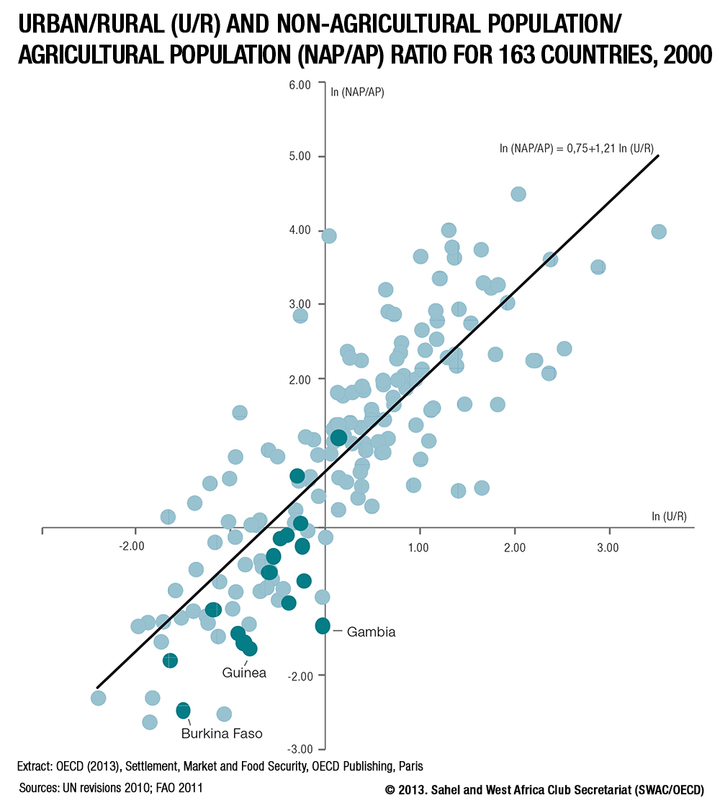 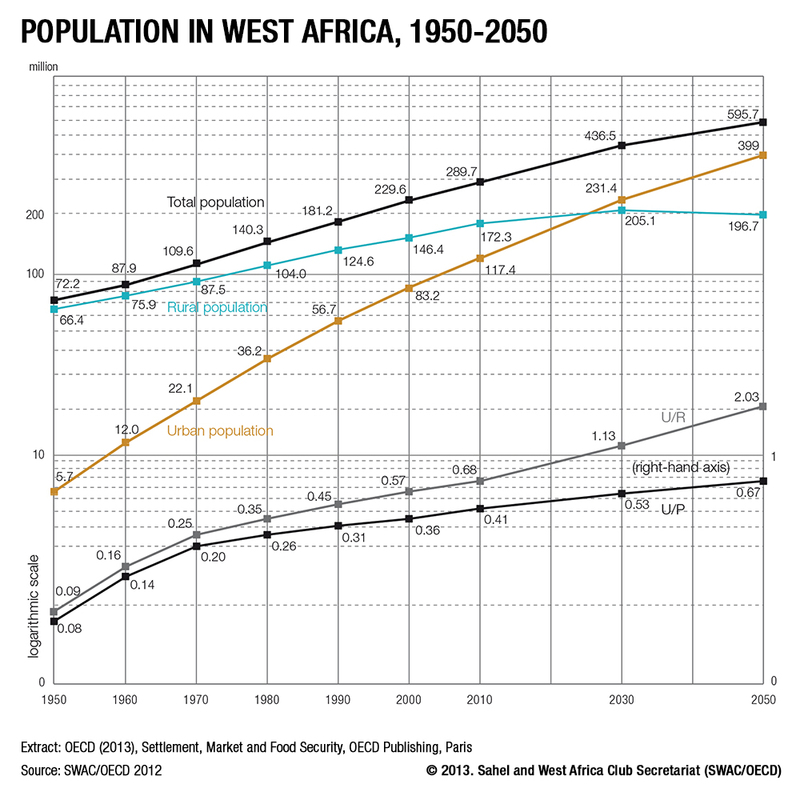 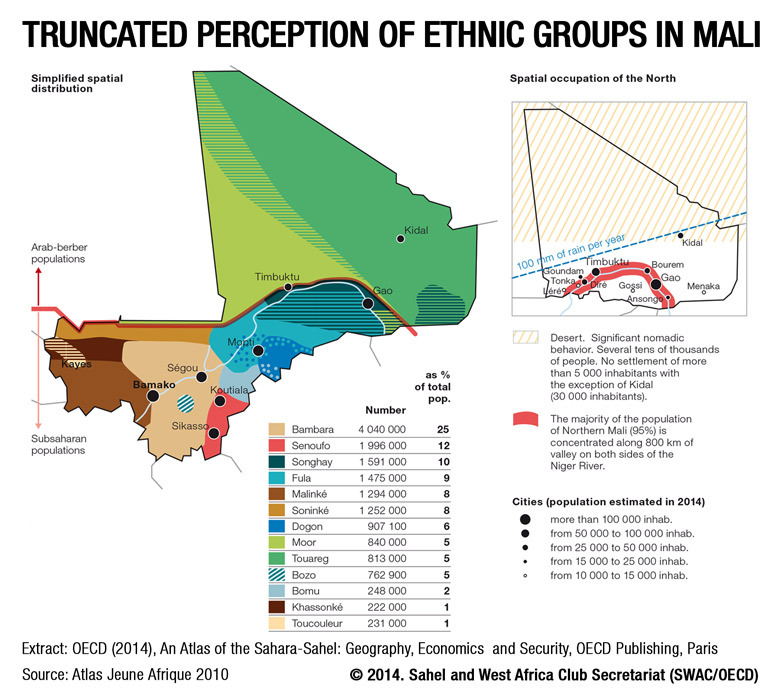 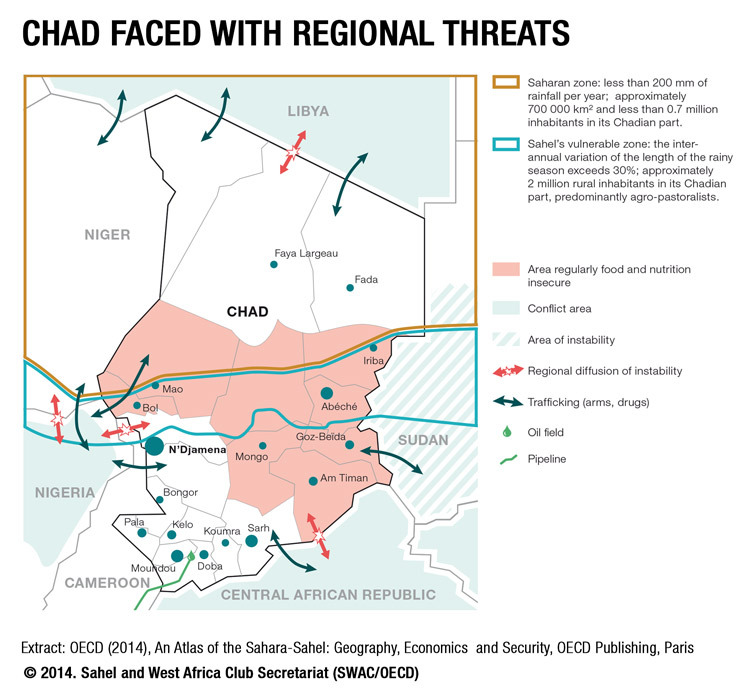 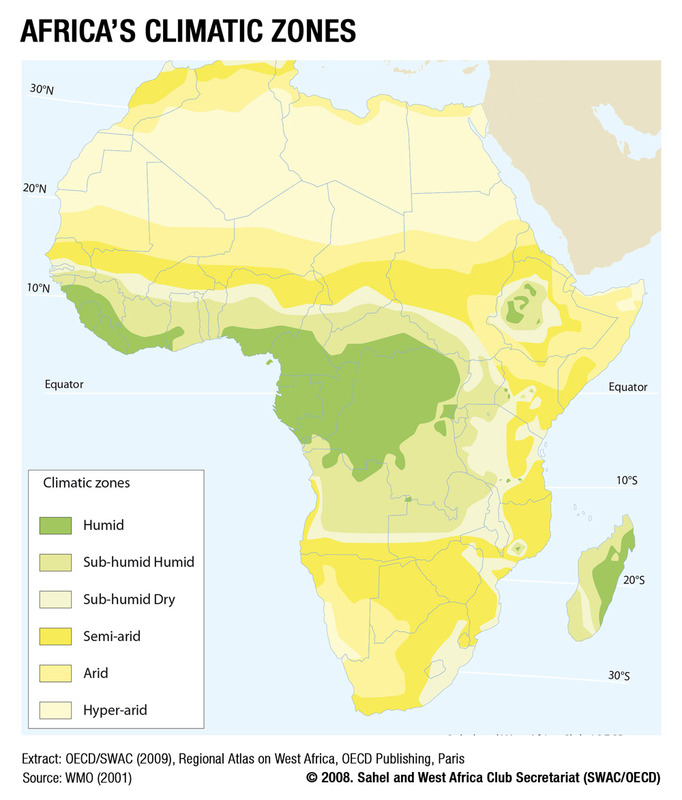 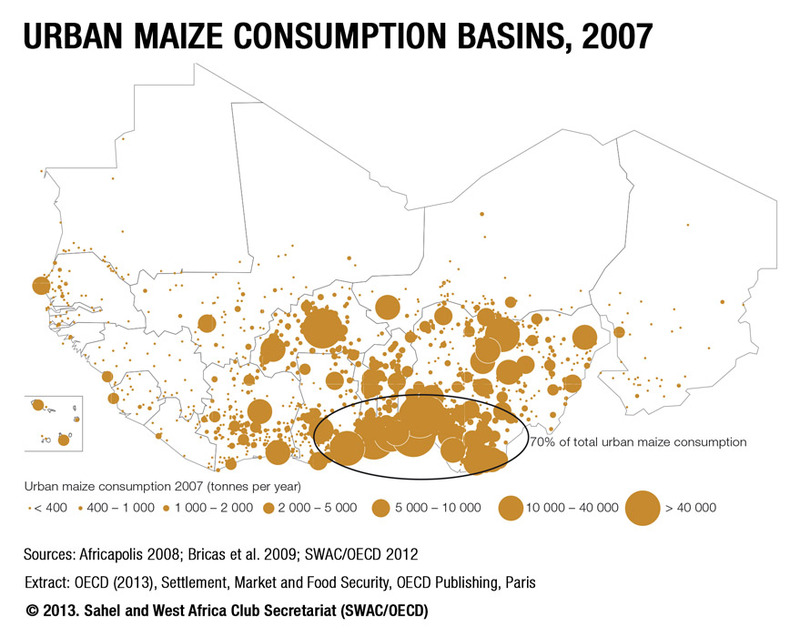 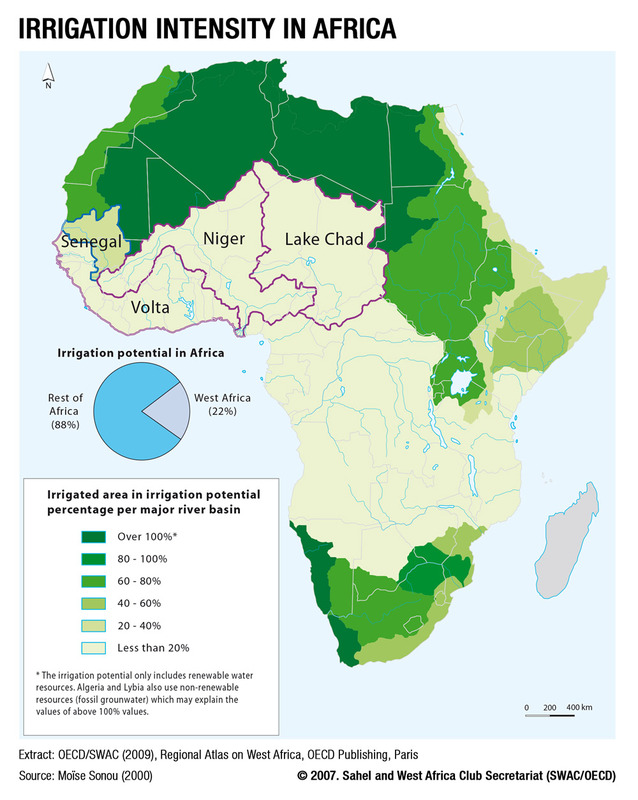 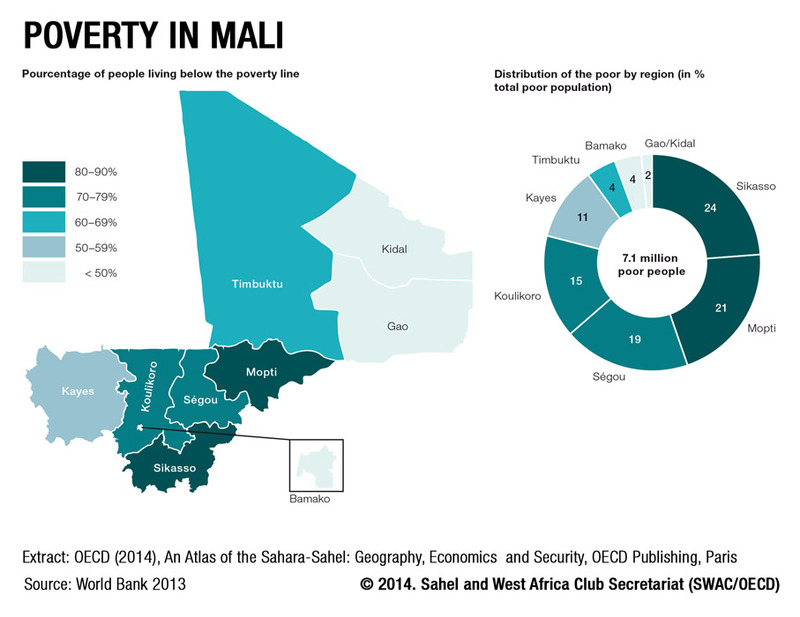 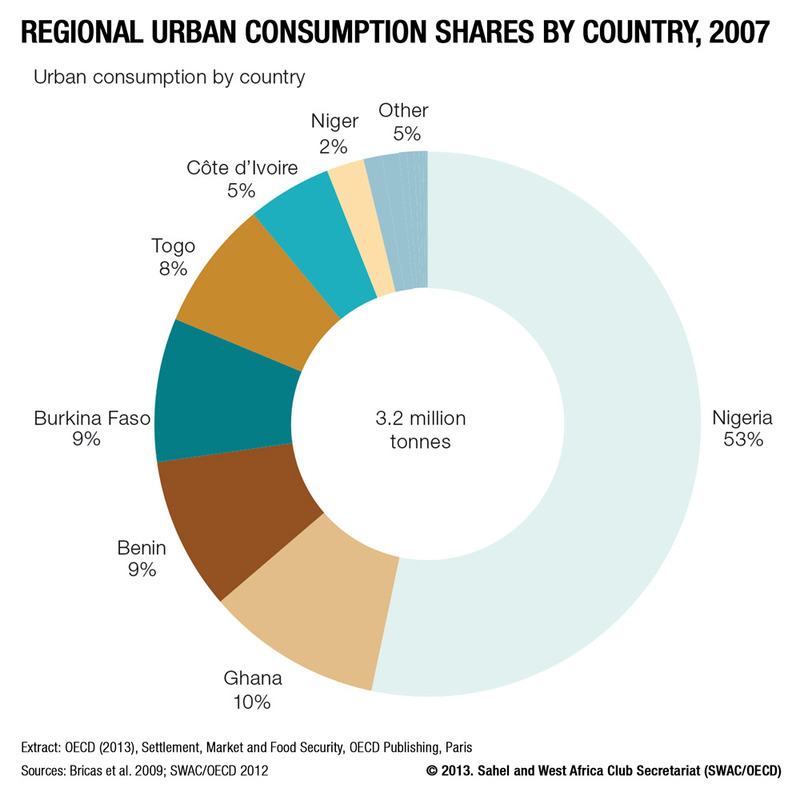 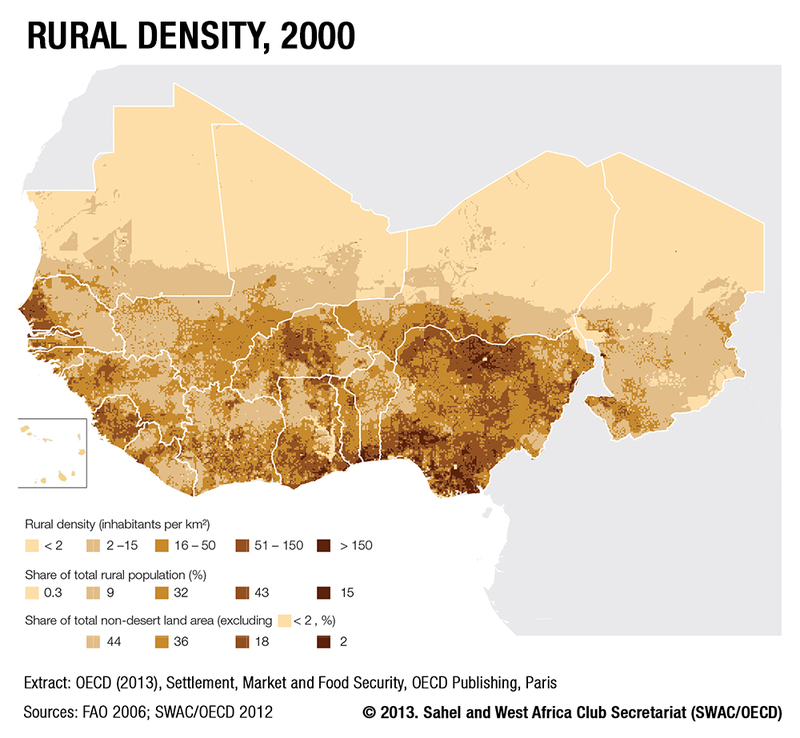 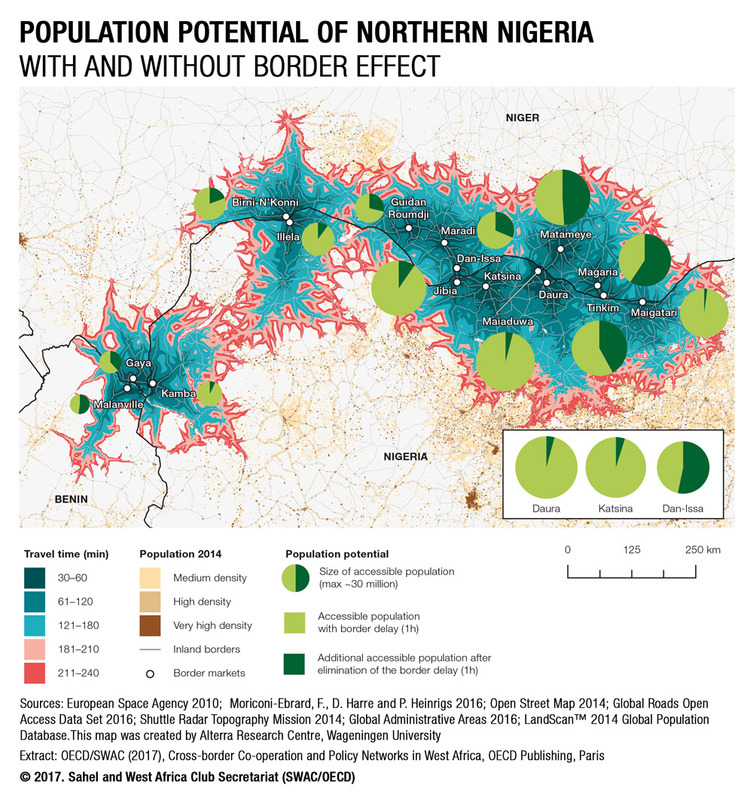 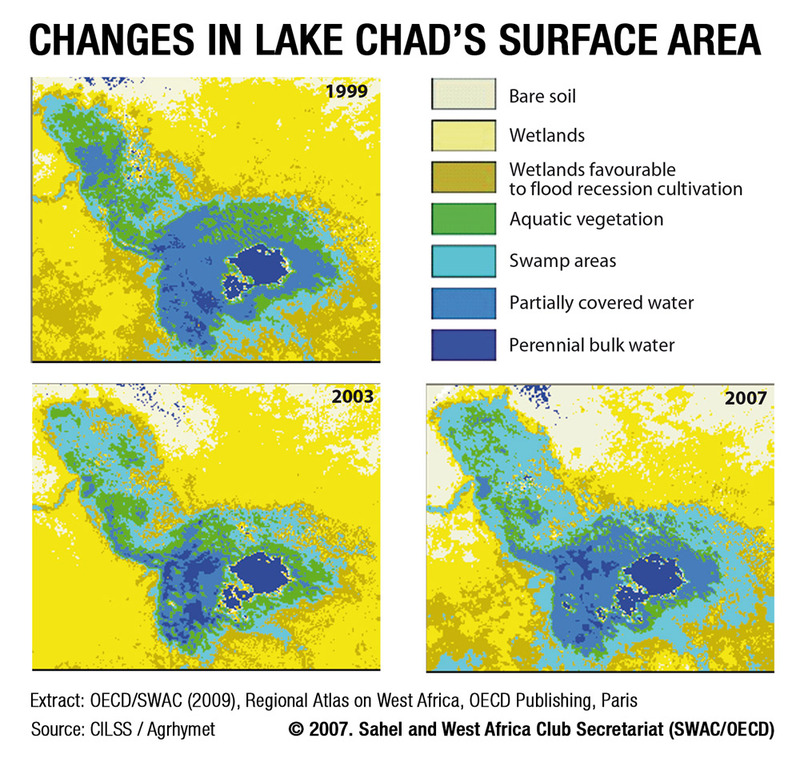 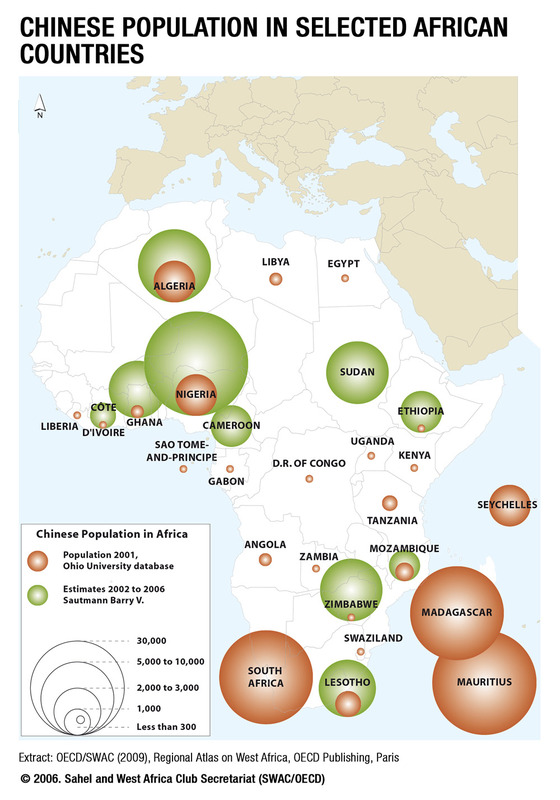 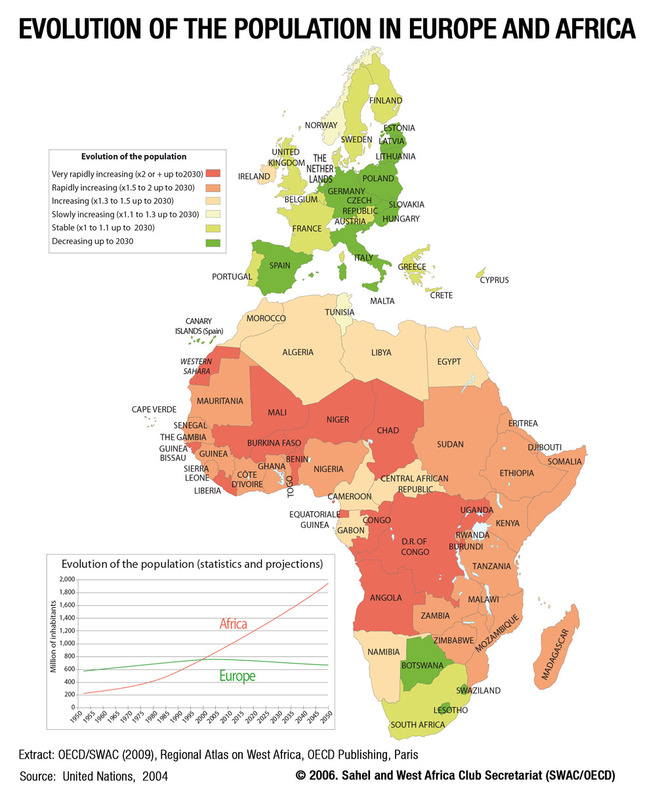 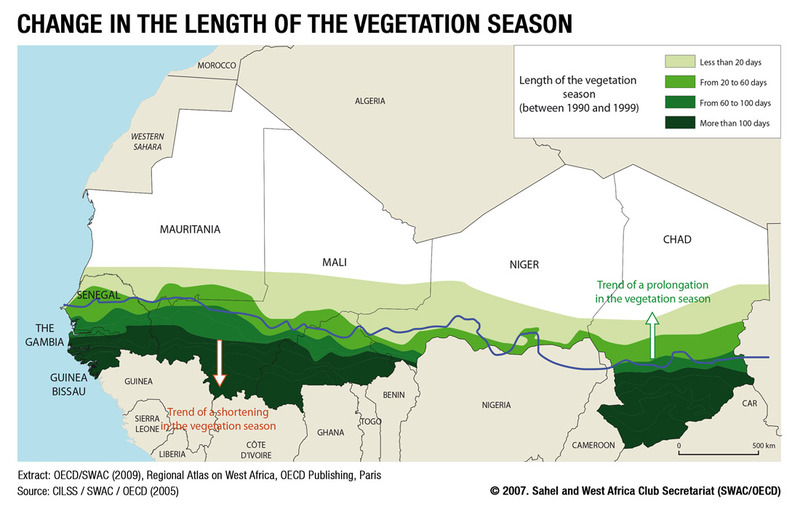 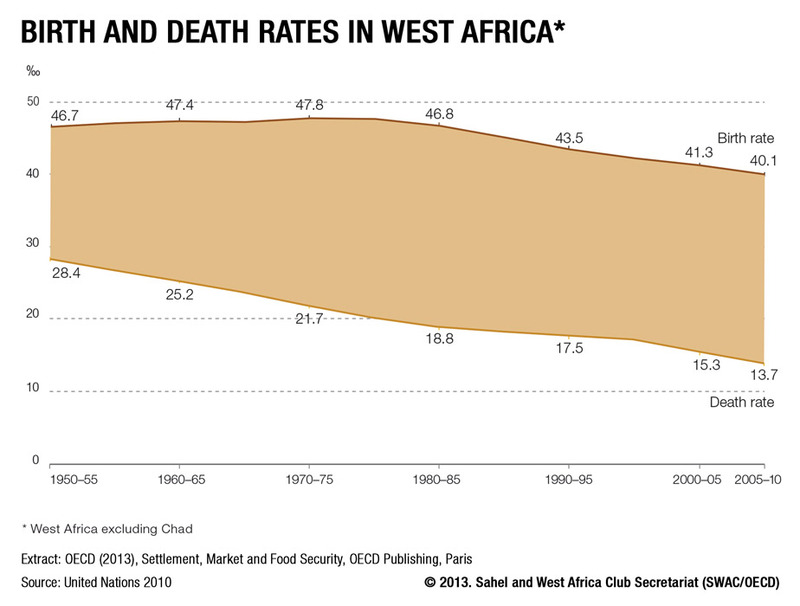 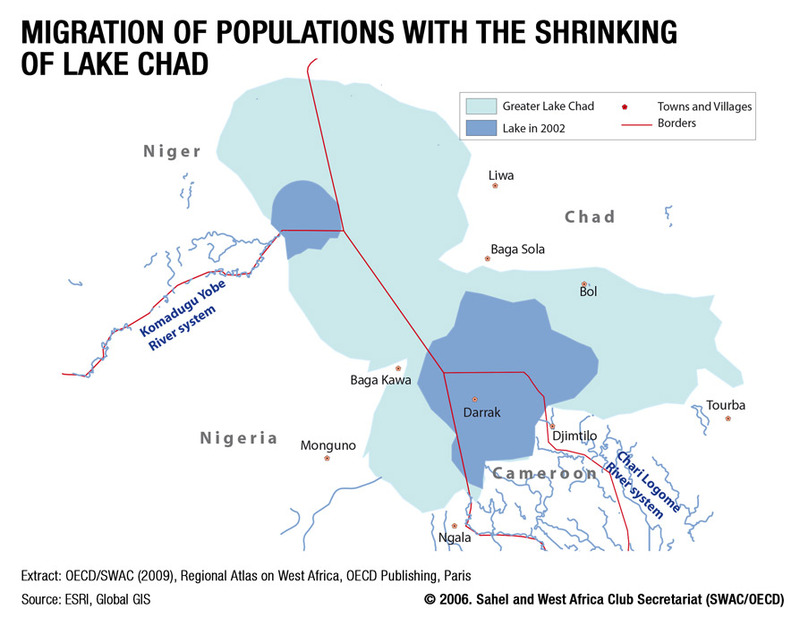 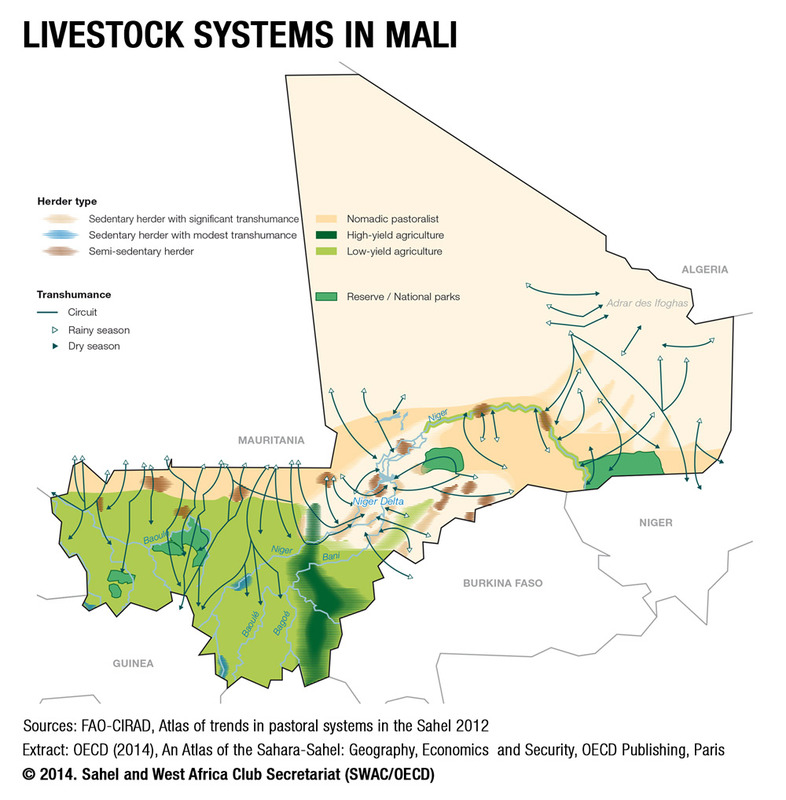 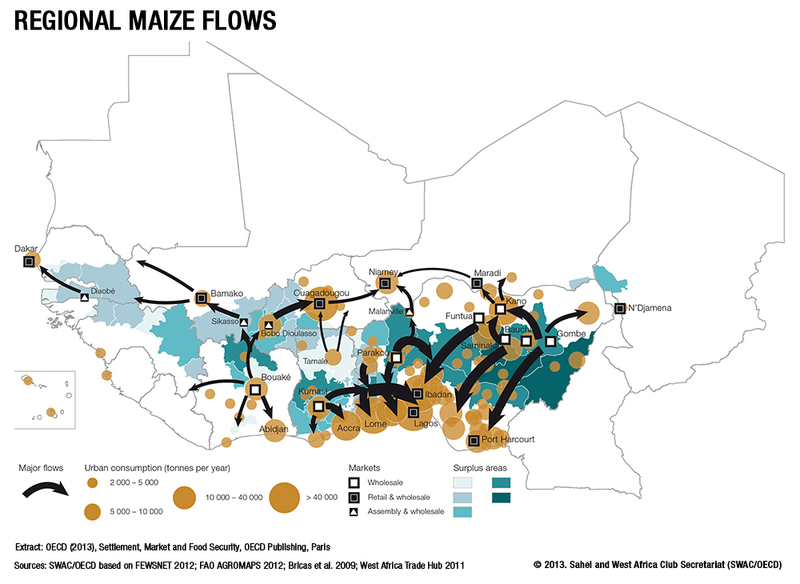 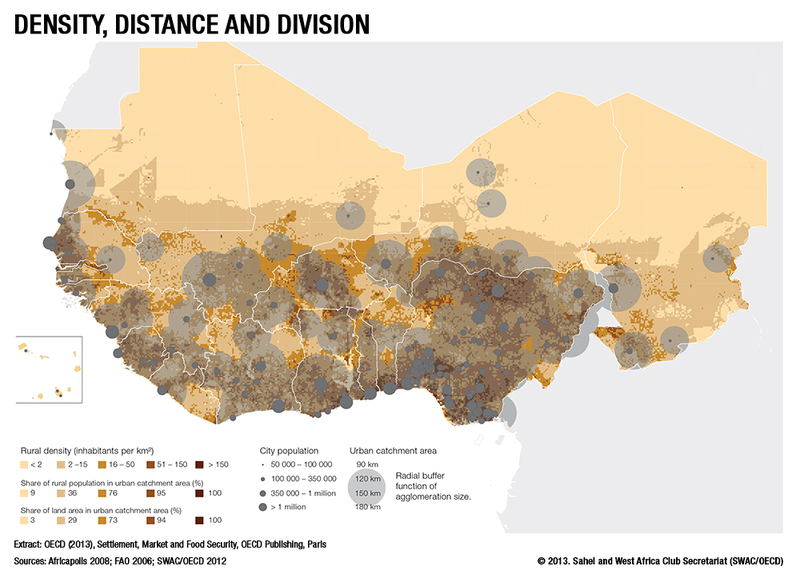 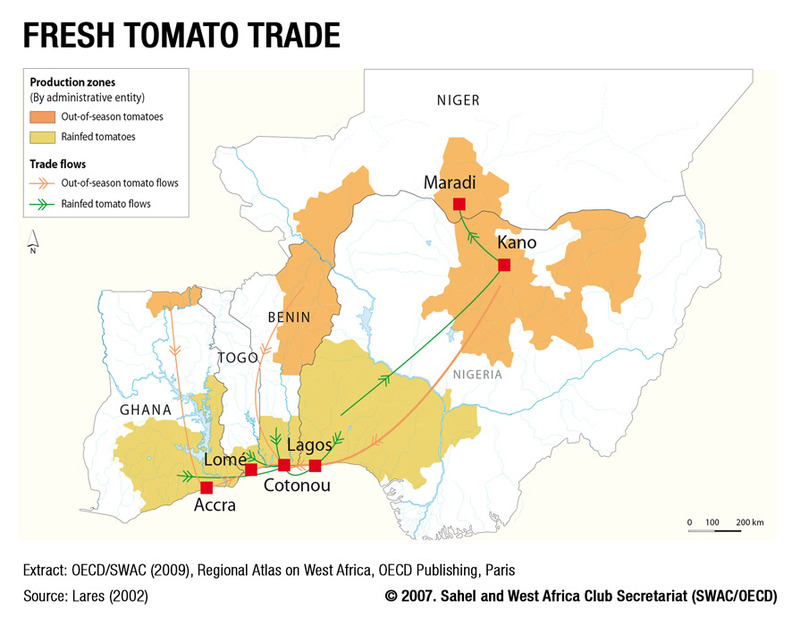 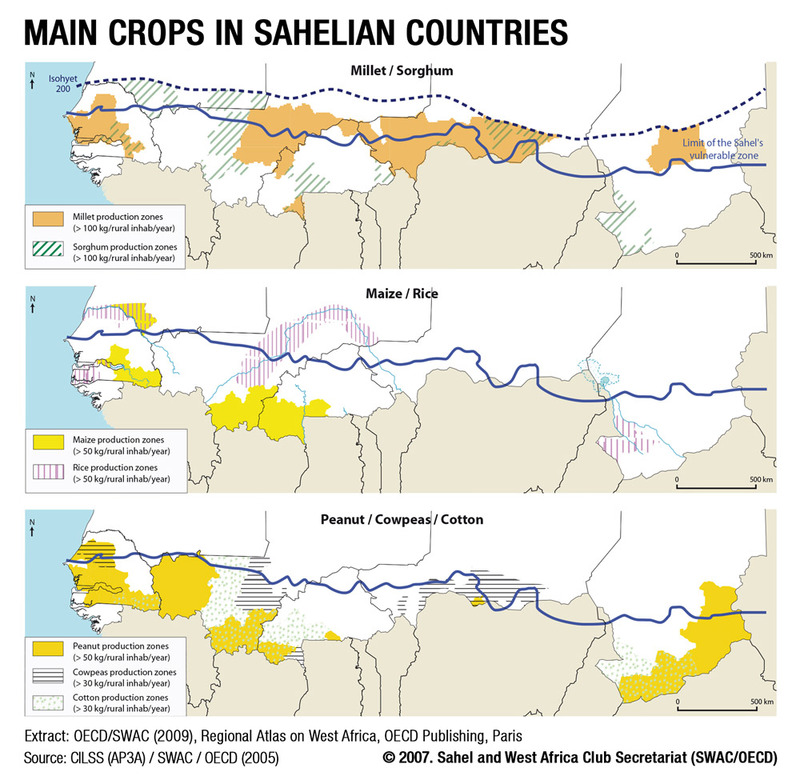 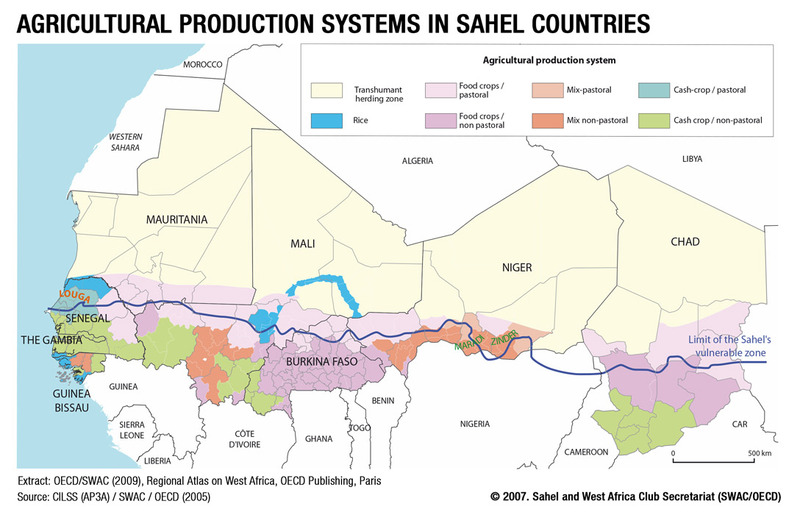 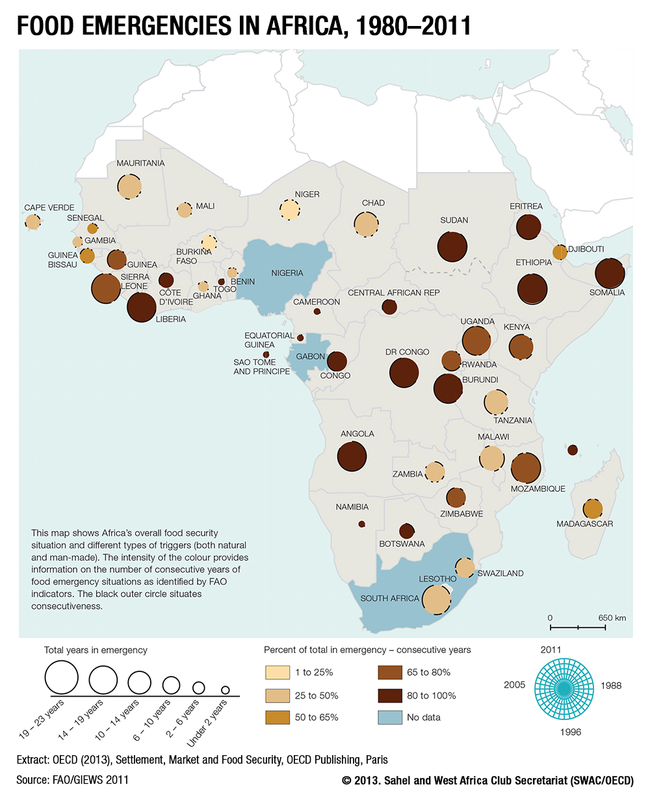 This “Maps & Facts” brochure looks at the demographic, urban, migration and security challenges in the Sahel and West Africa through the lens of food issues. 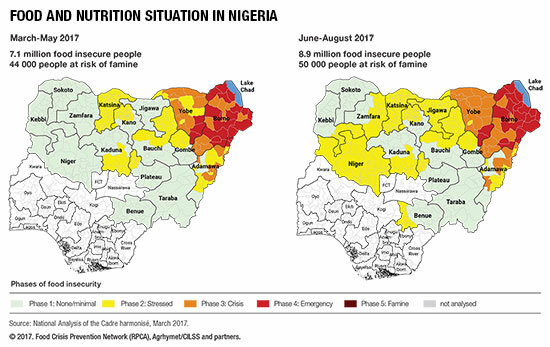 It promotes the following key message: the challenges facing food security should not be overshadowed by the resurgence of demographic, migration and security concerns on the international agenda. 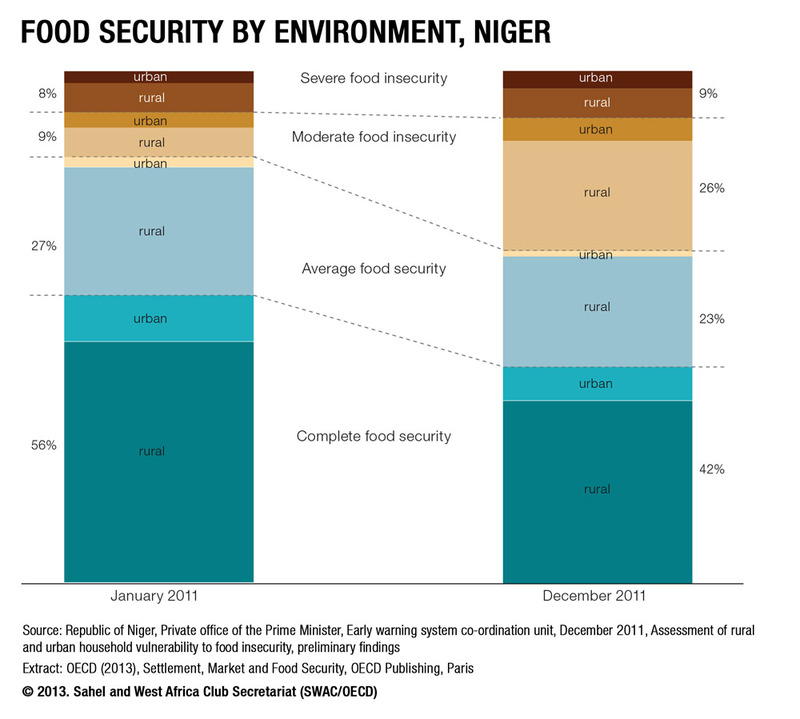 Rather, food security is closely related to these issues, and should be considered as part of the solution to the challenges they raise. 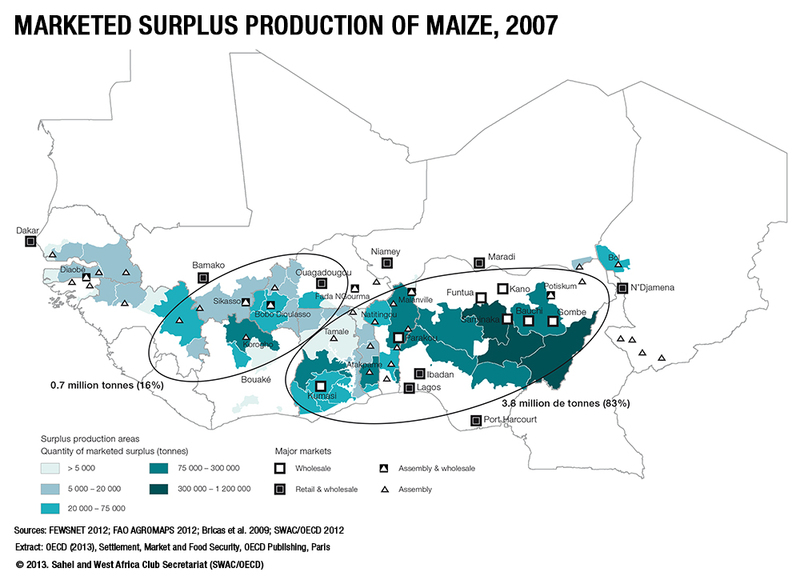 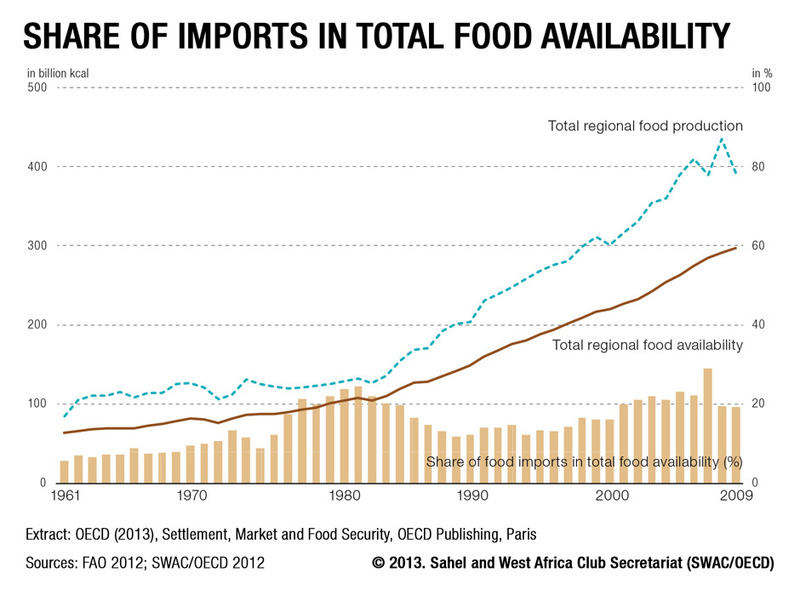 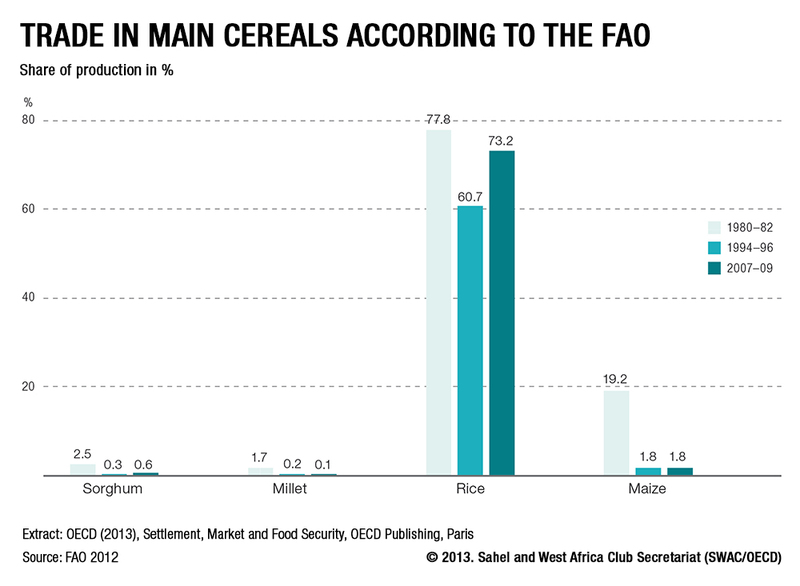 Food issues are at the heart of the West African economy and society; ignoring their importance would be a strategic error. 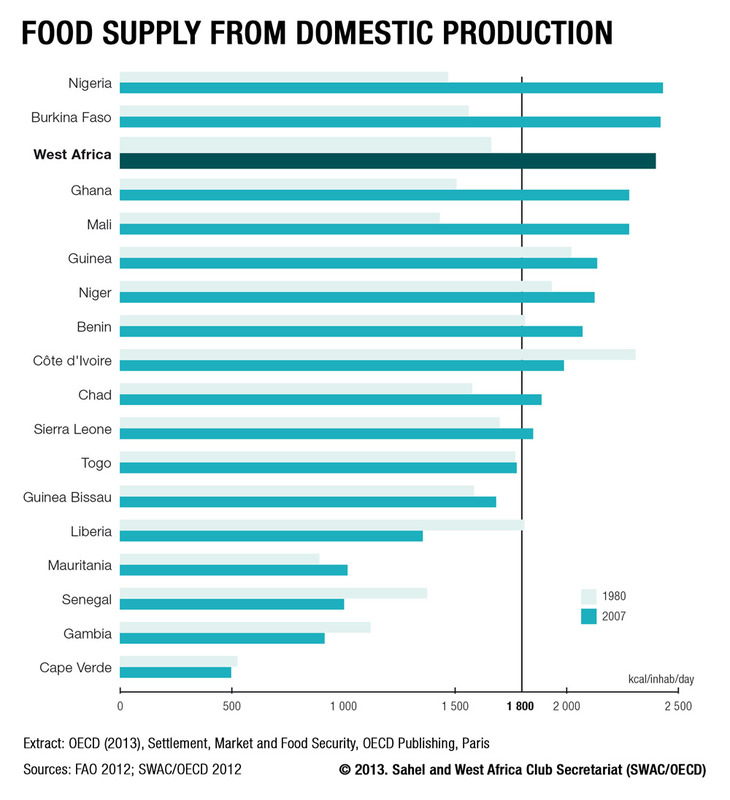 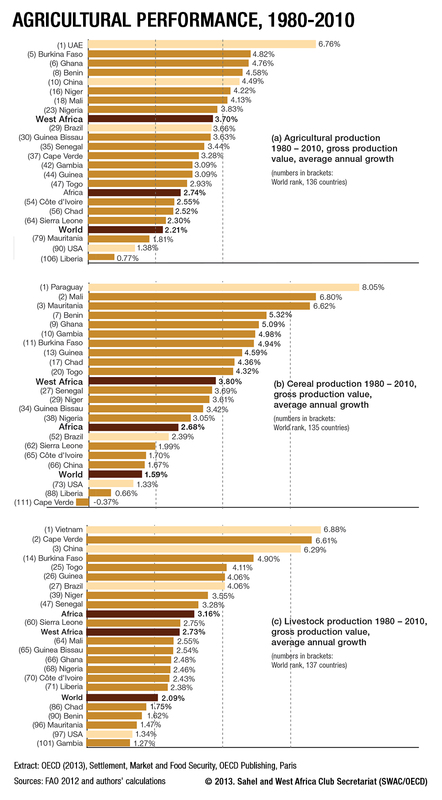 The business of making food for human consumption, including all elements of the value chain – production, processing and distribution – is the largest sector in the region, far ahead of oil, cash crops or industry. 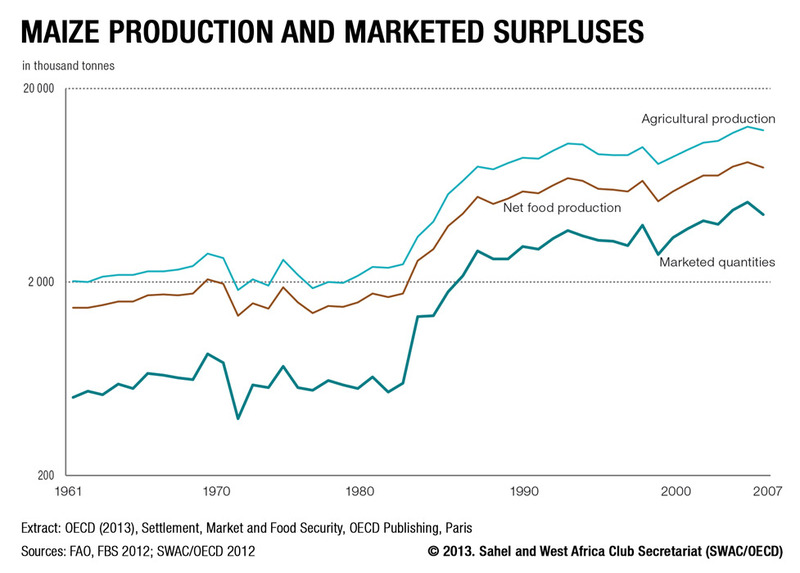 The food sector is key for creating more jobs, stimulating stronger and more inclusive growth, opening up a wider field of opportunities for agricultural producers and other entrepreneurs, and pulling the most vulnerable out of poverty and insecurity. 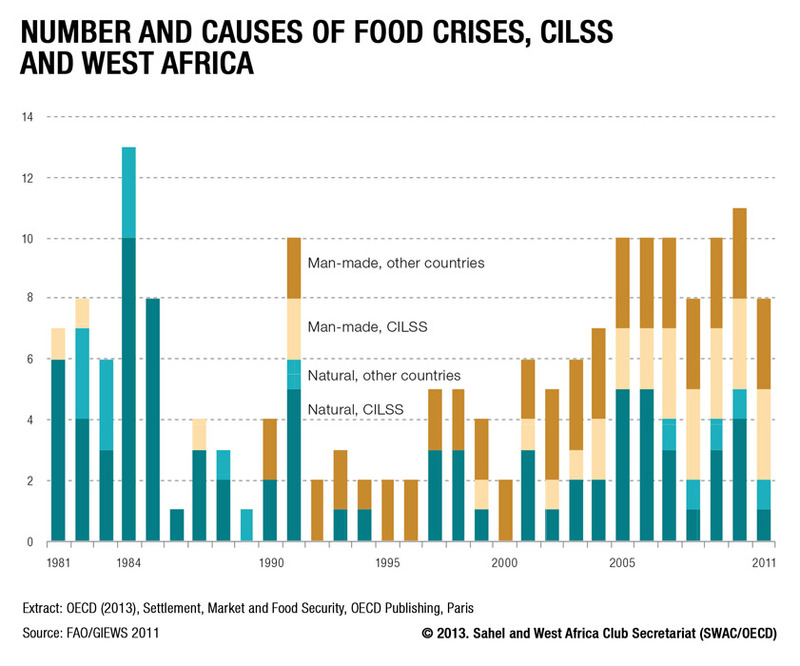 Food issues must therefore remain at the centre of all reflection, policy and action – from food crisis prevention, to economic development, to building the resilience of the most vulnerable people. 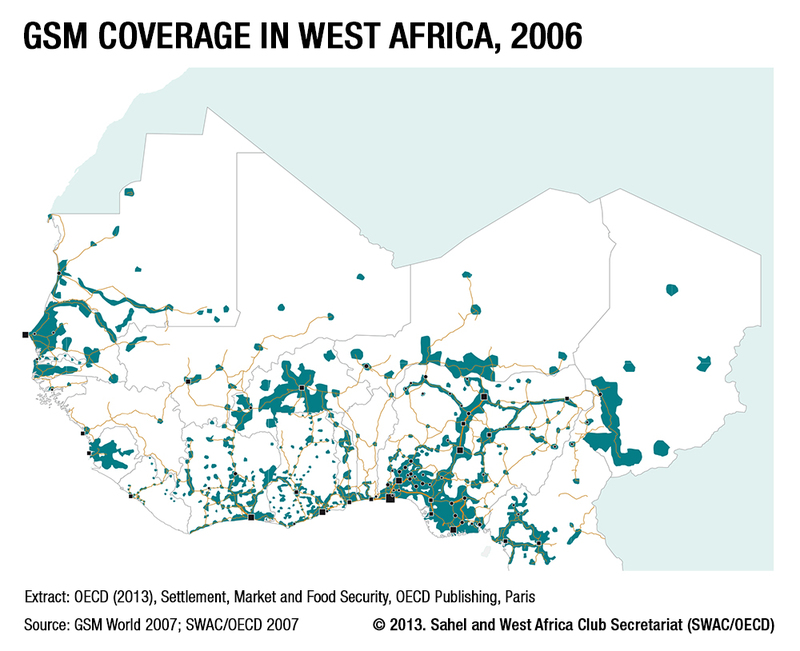 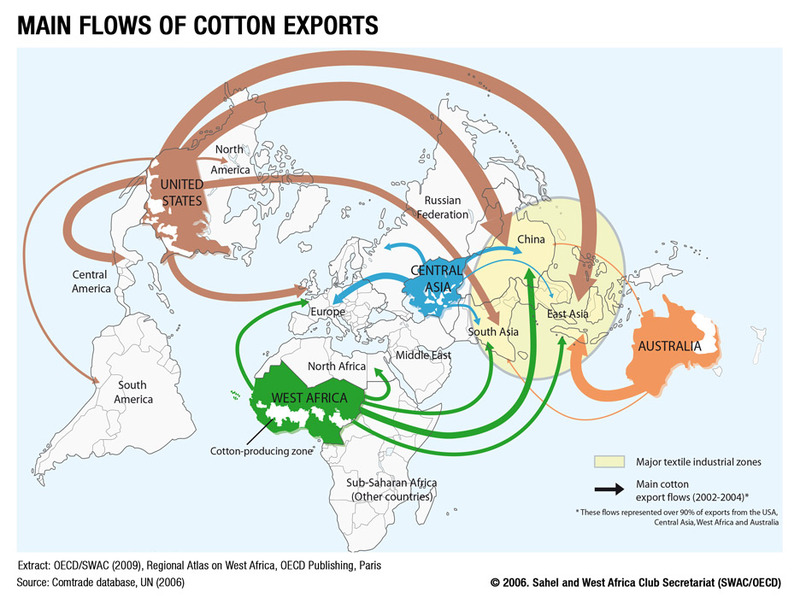 ‌The following maps are extracted from the OECD publication "Settlement, Market and Food Security", published in May 2013. 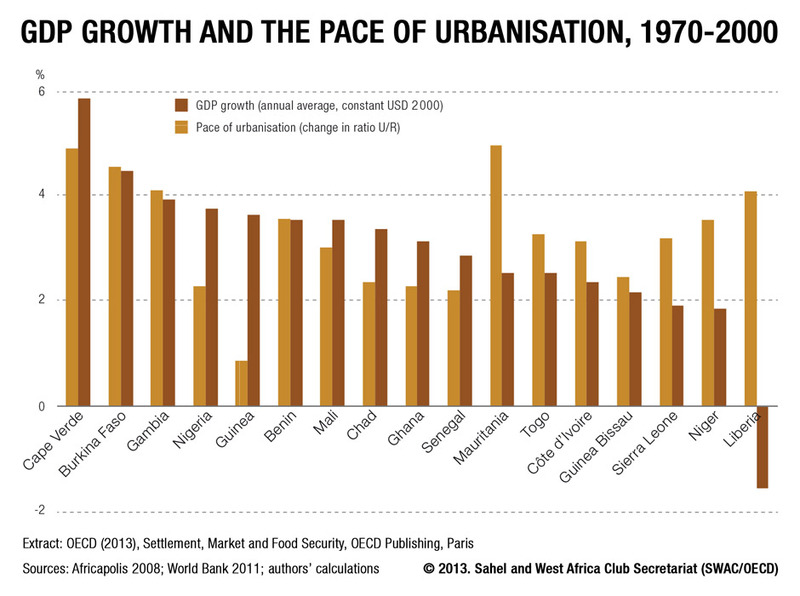 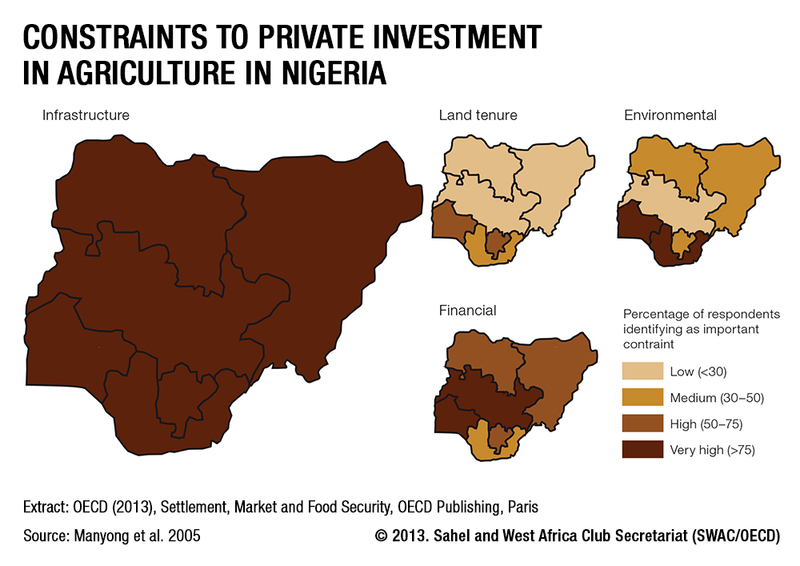 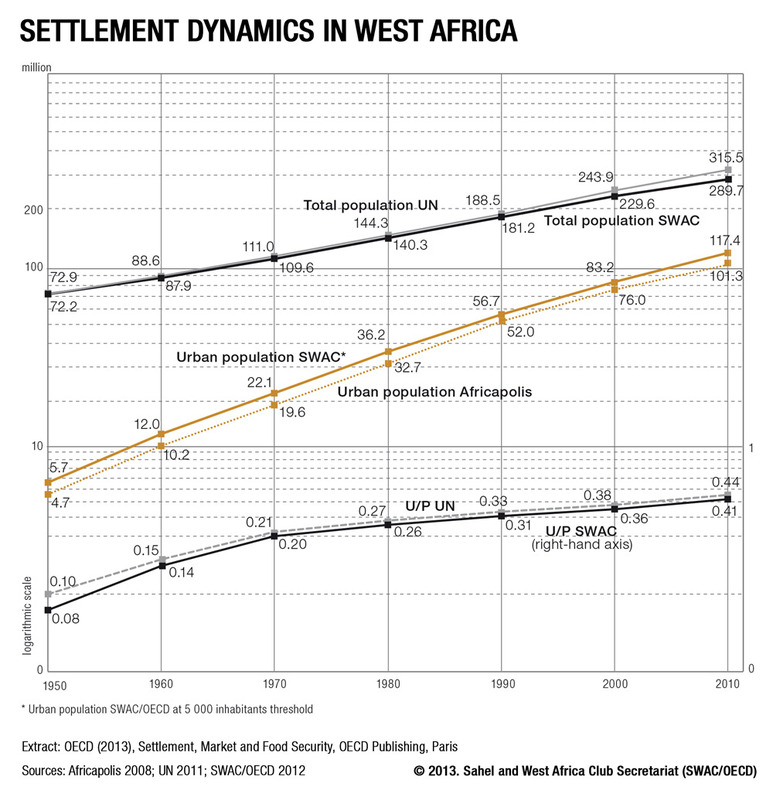 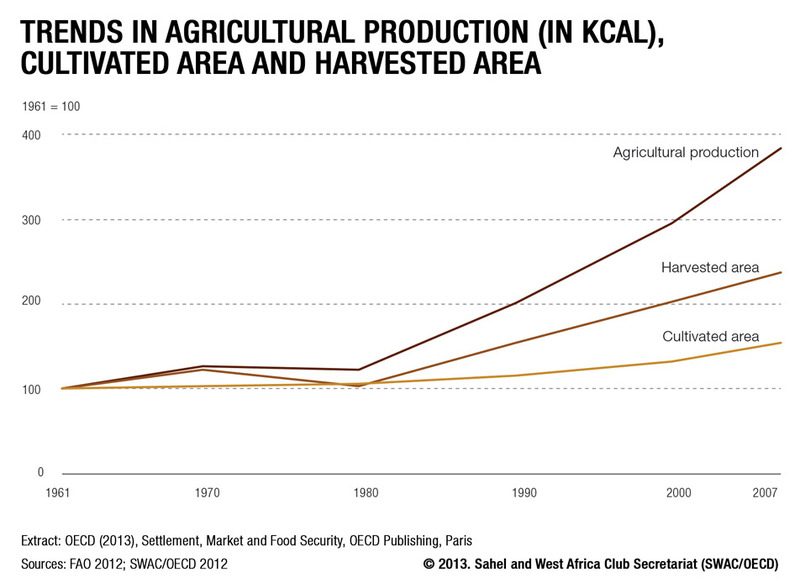 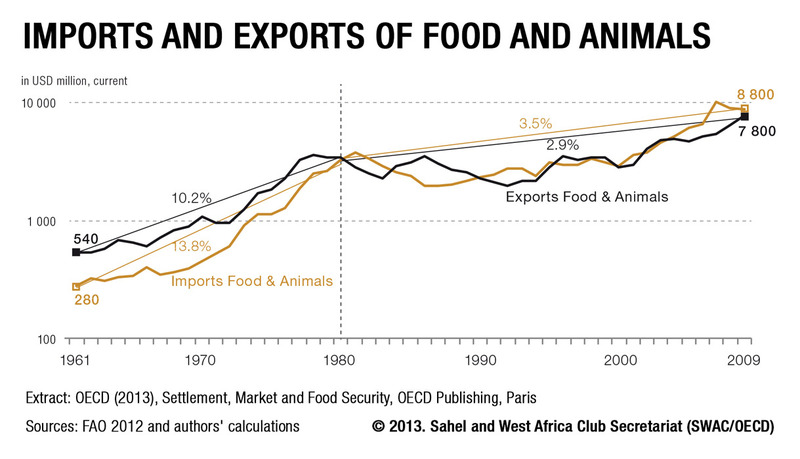 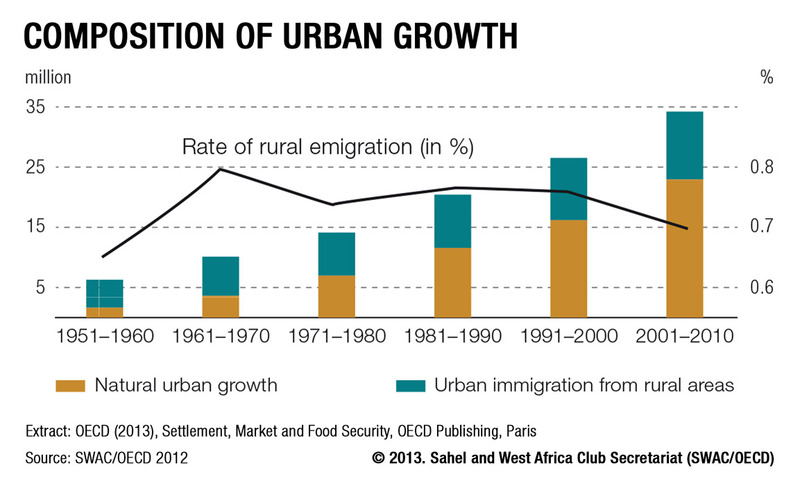 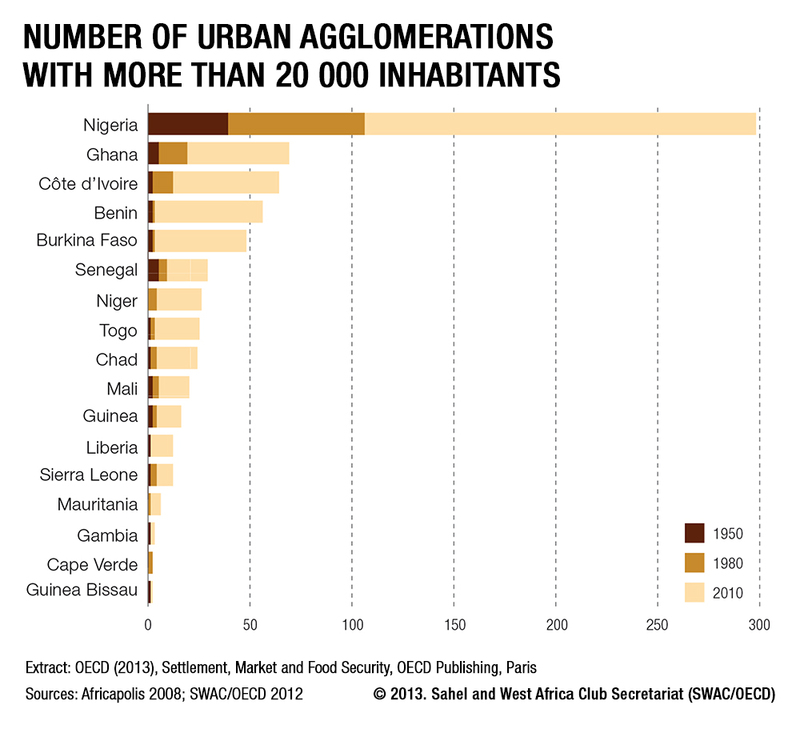 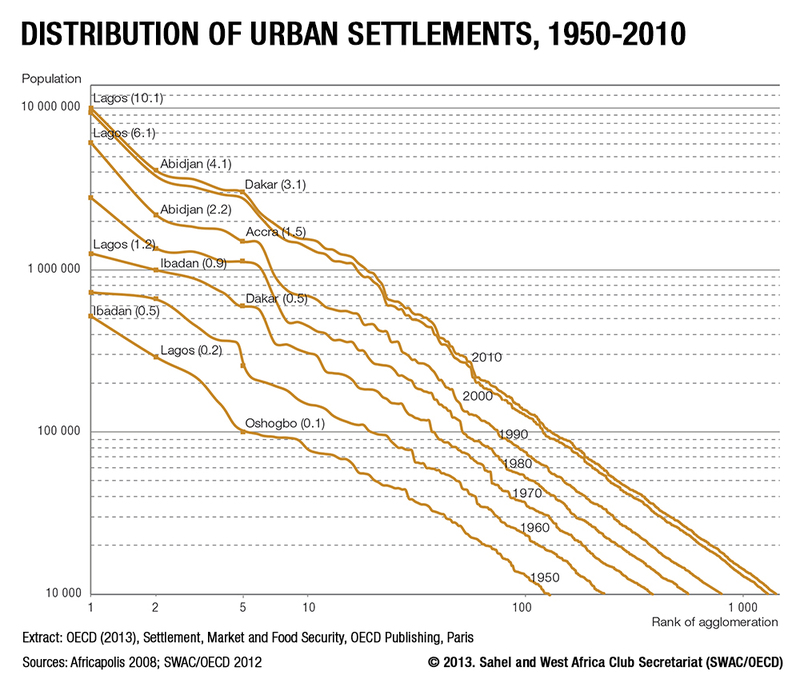 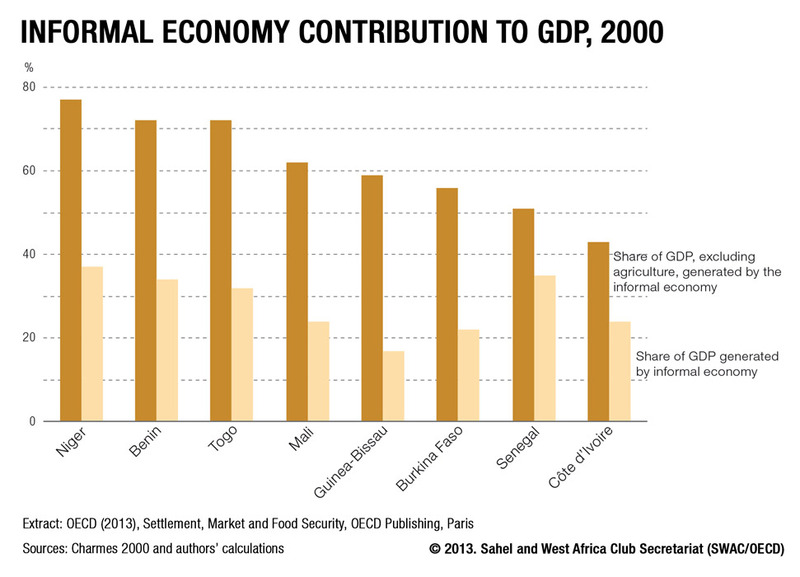 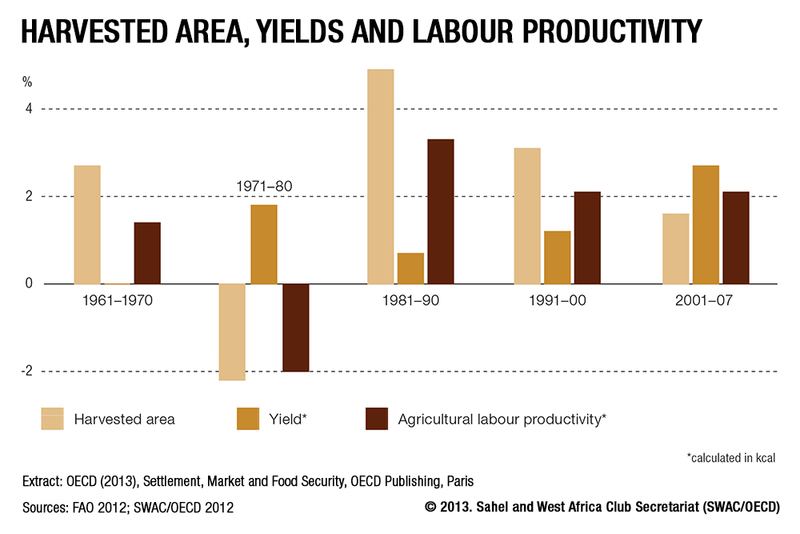 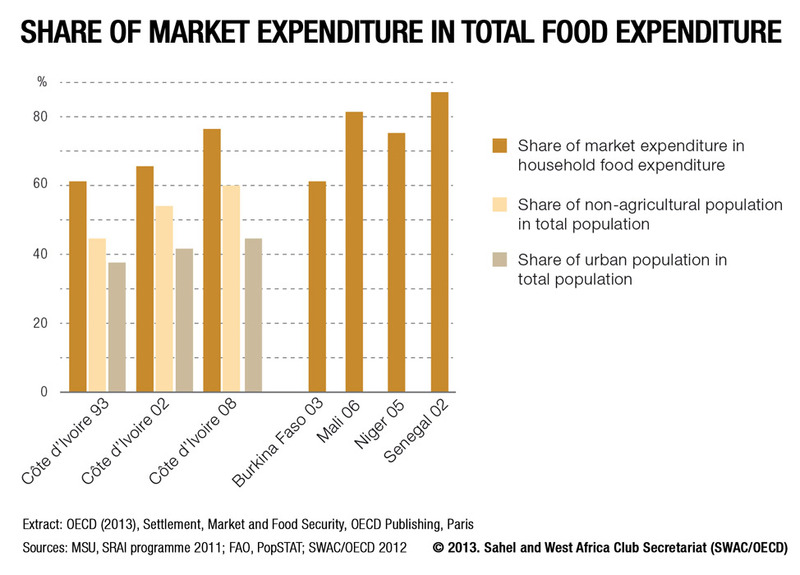 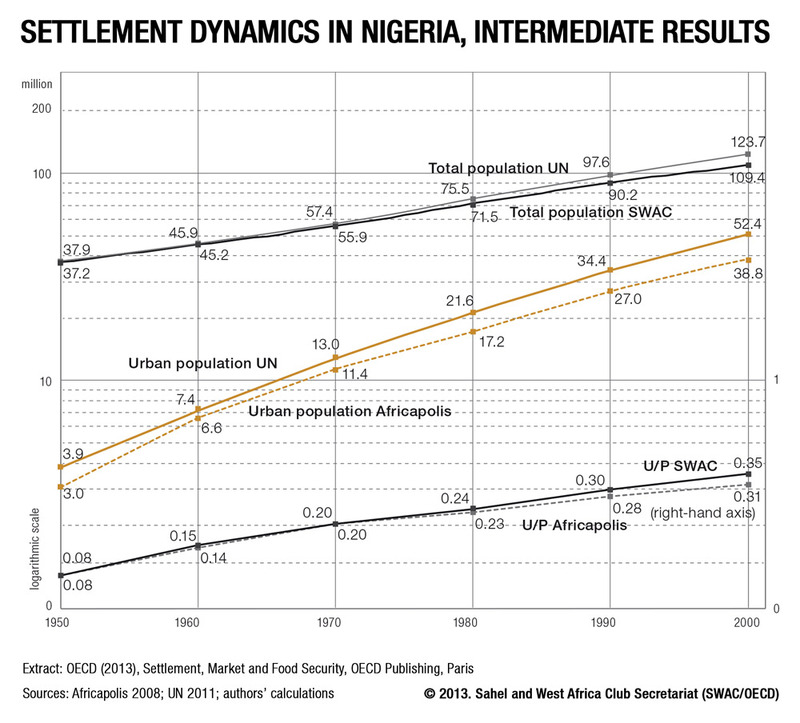 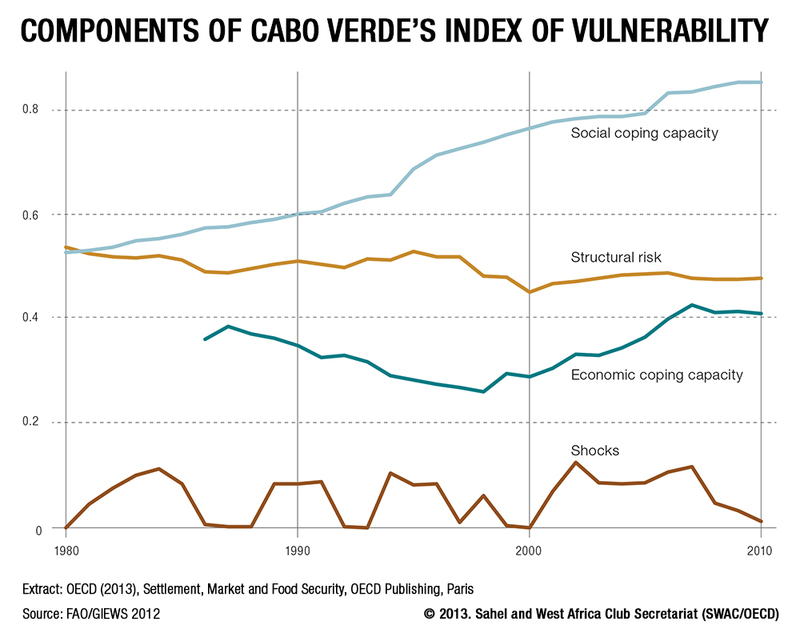 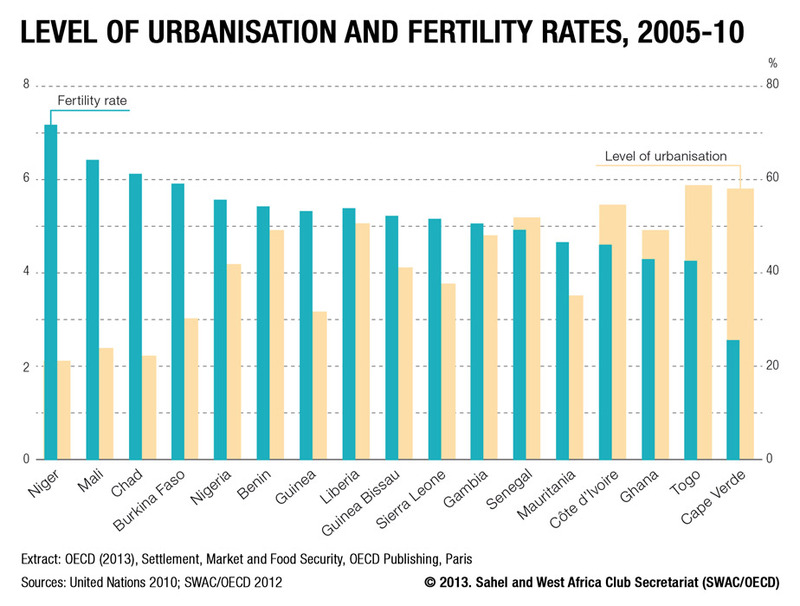 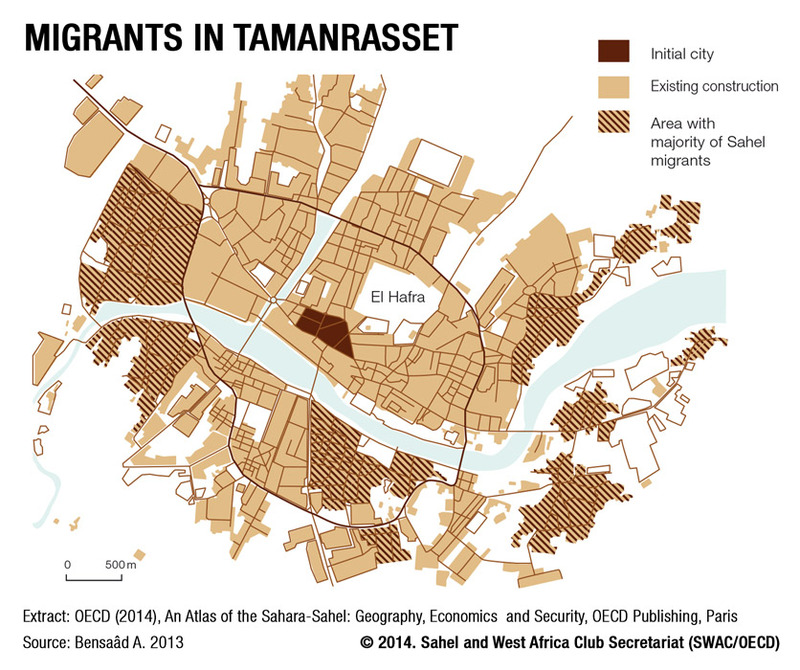 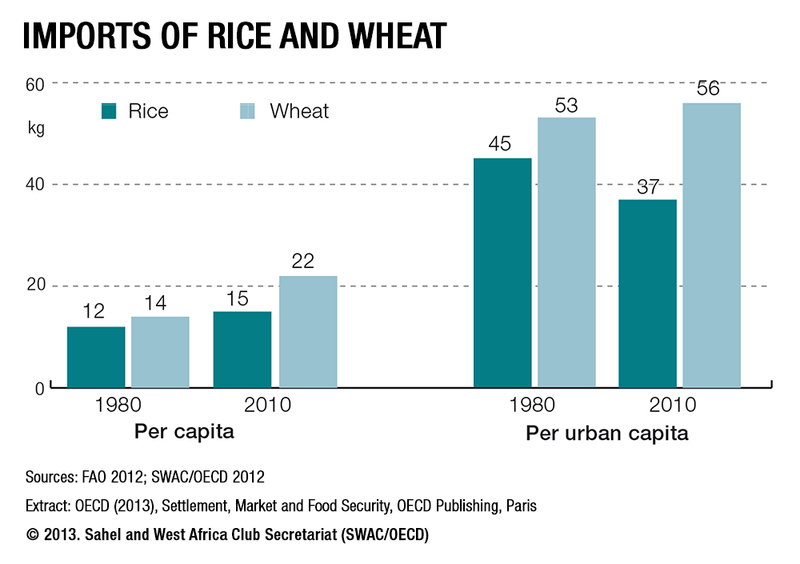 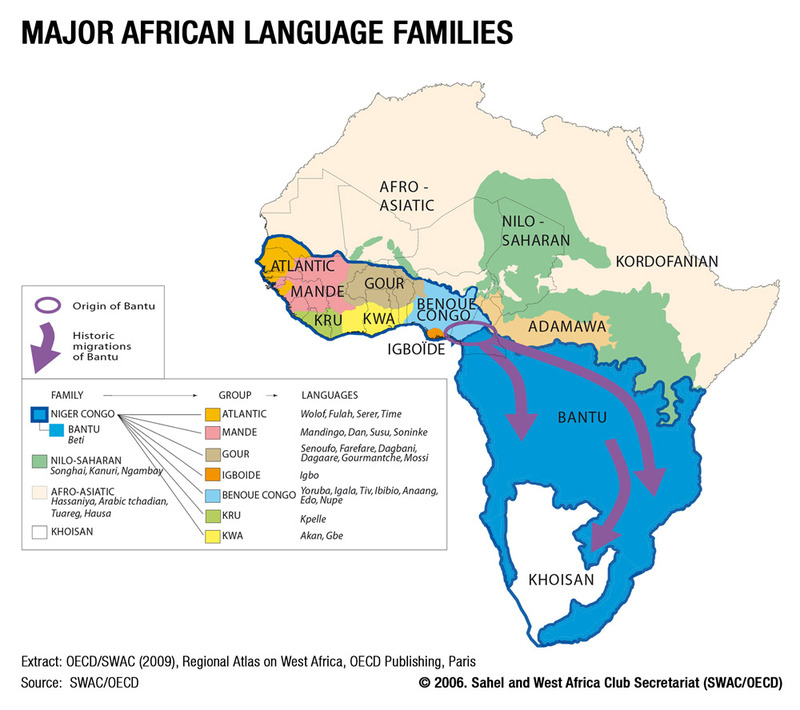 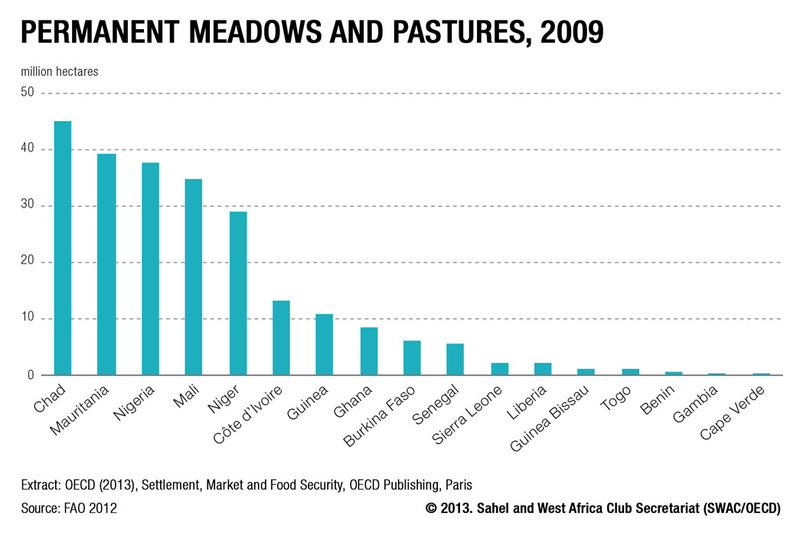 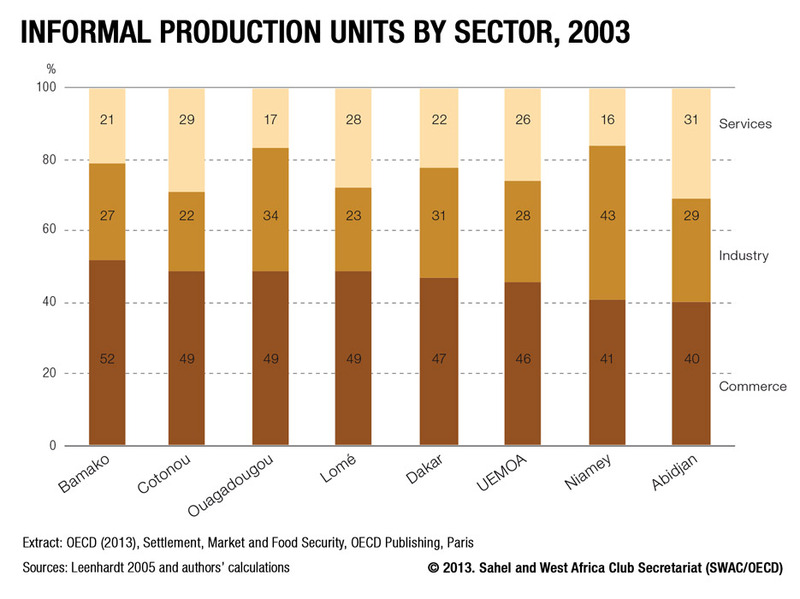 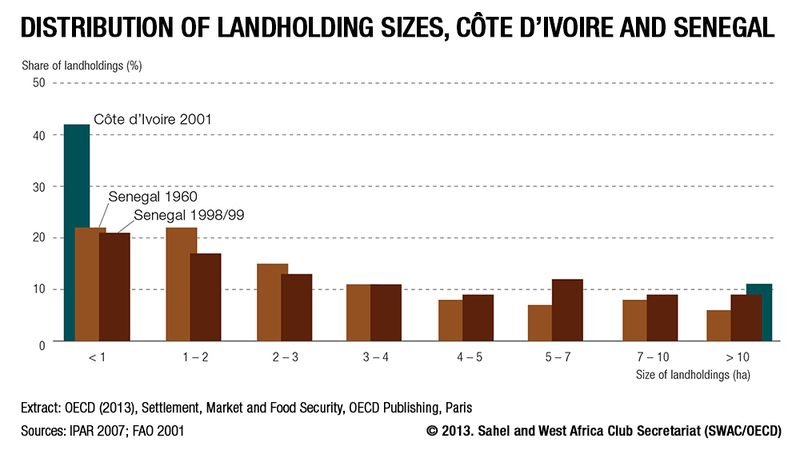 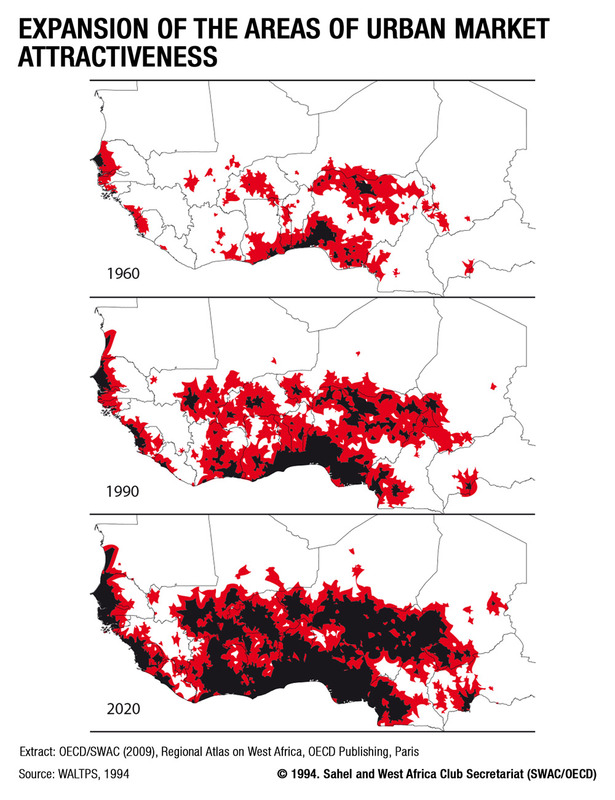 Settlement dynamics have been reshaping West Africa’s social and economic geography. 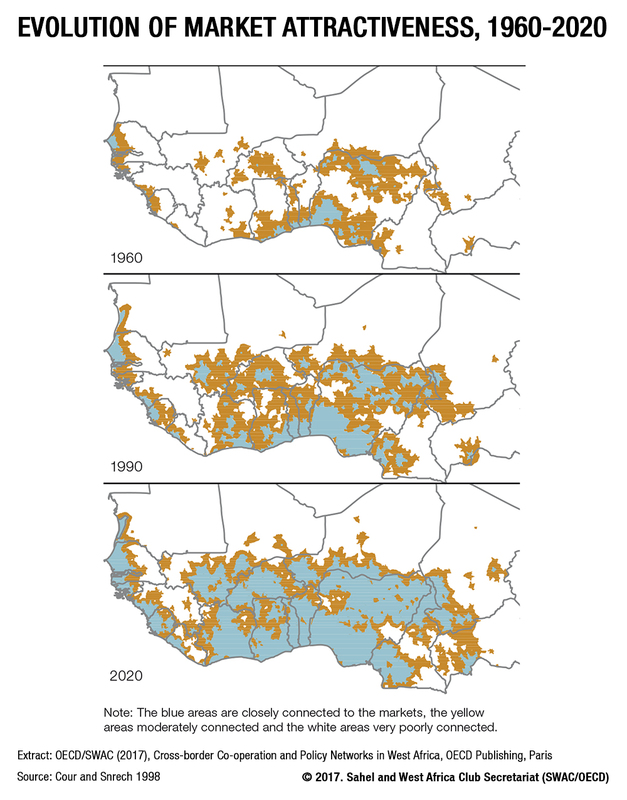 These spatial transformations – high urbanisation and economic concentration – favour the development of market-oriented agriculture. 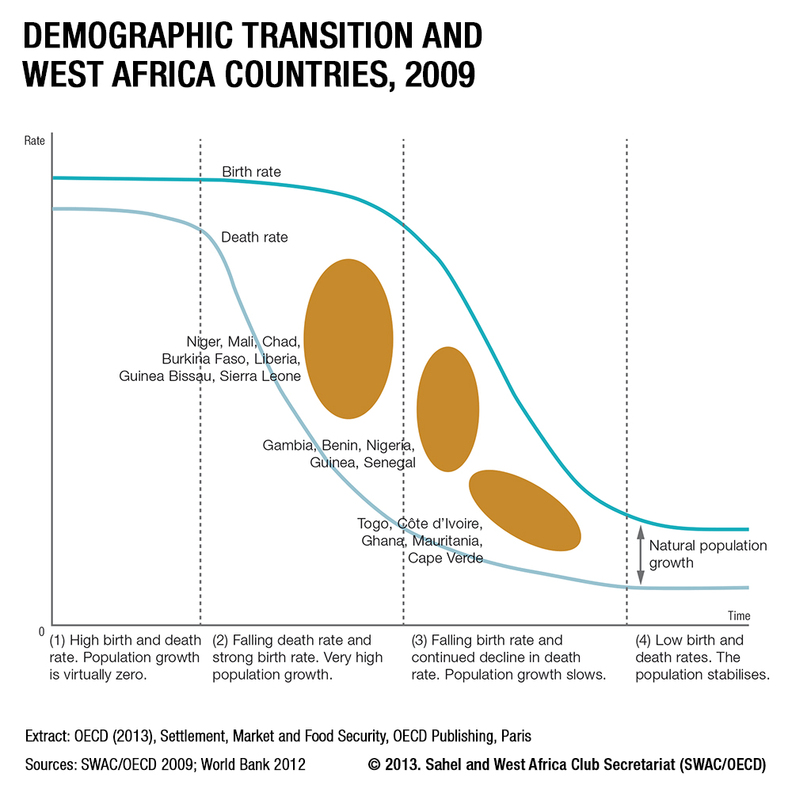 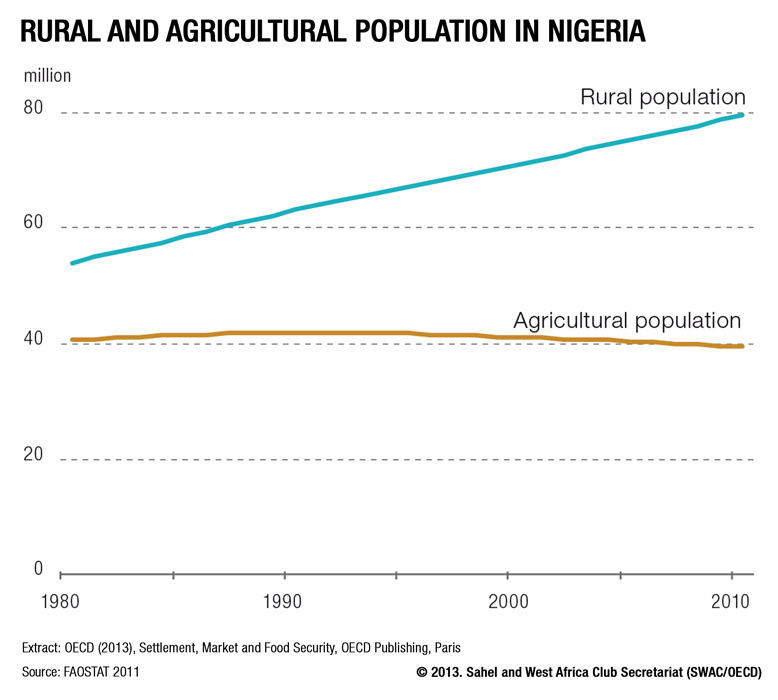 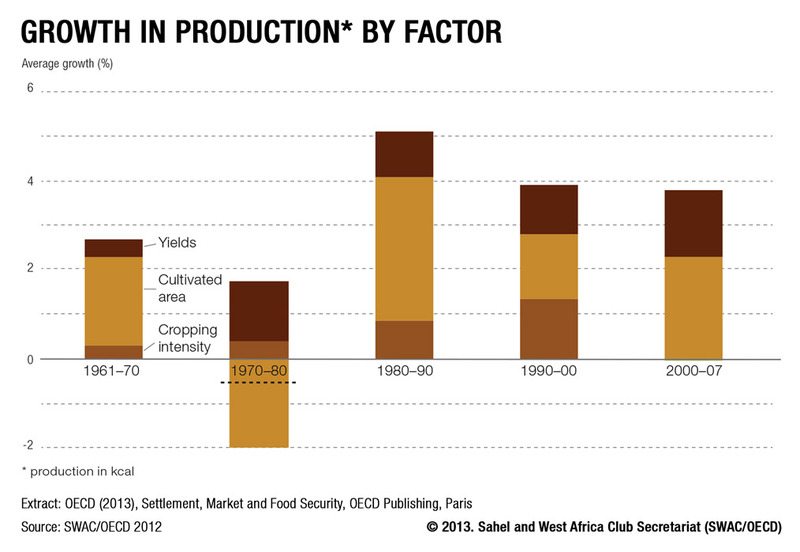 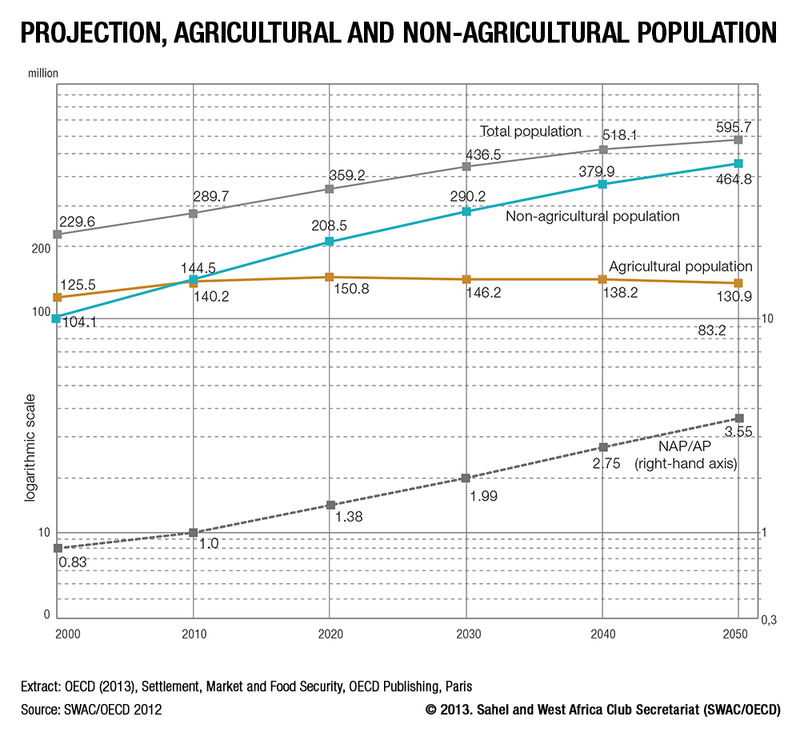 With the population of West Africa set to double by 2050, agricultural production systems will undergo far-reaching transformations. 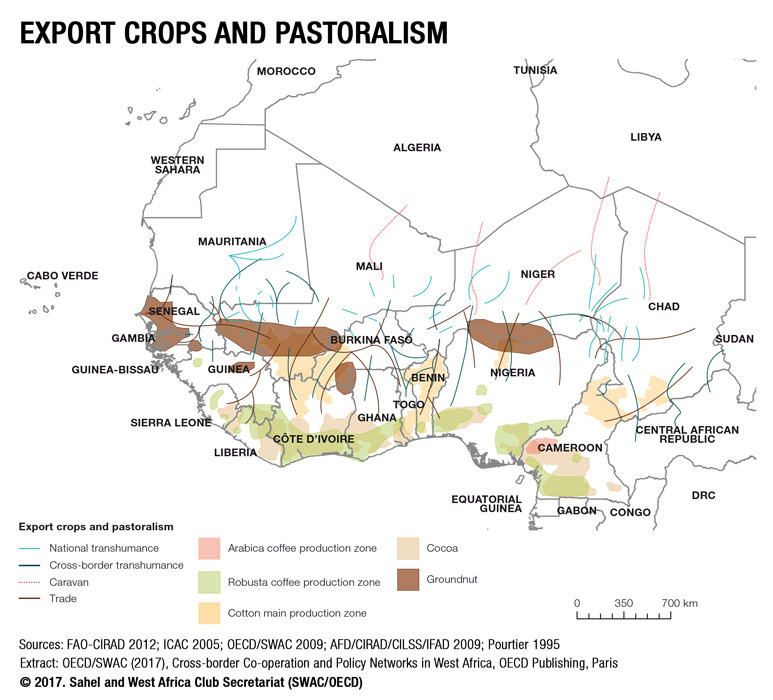 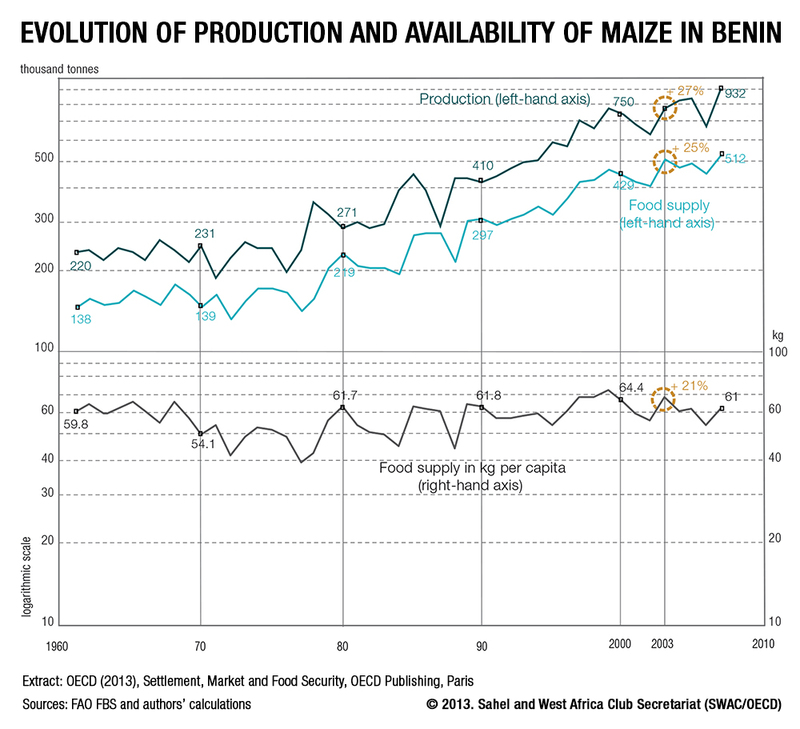 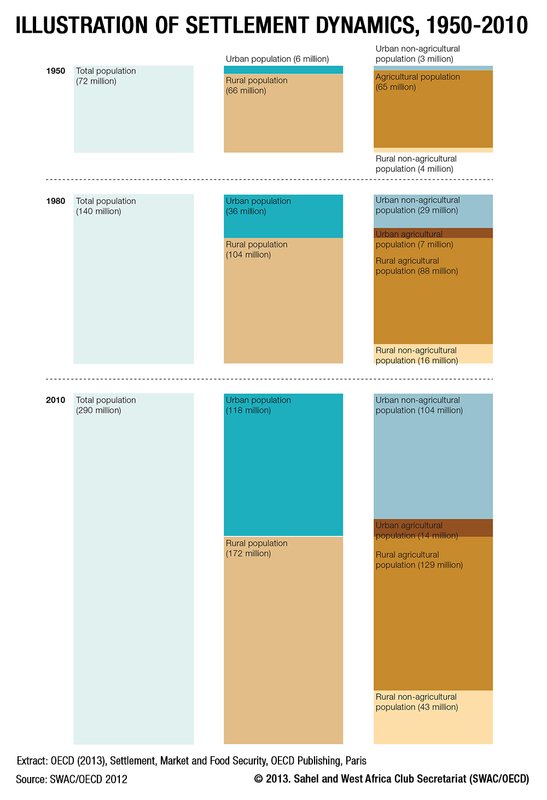 To support these transformations, policies need to be spatially targeted, improve availability of market information and broaden the field of food security to policy domains beyond agriculture. 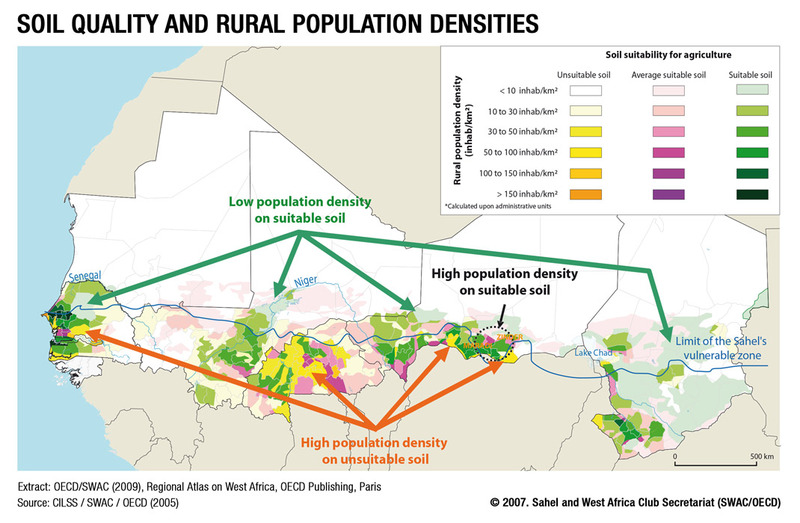 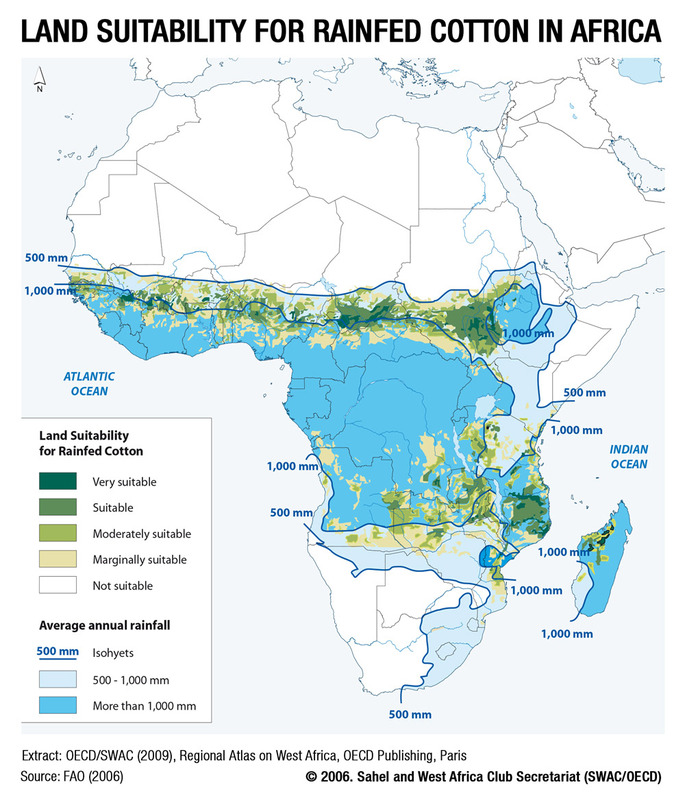 They need to rely on homogeneous and reliable data – not available at present – particularly for key variables such as non-agricultural and agricultural population, marketed production and regional trade. 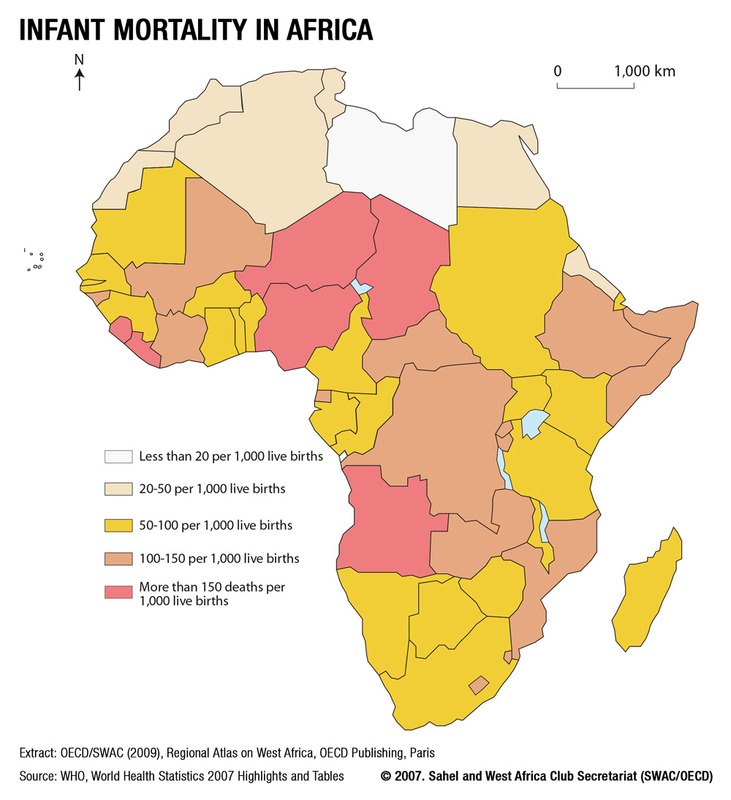 You can copy and paste maps directly from the PowerPoint presentation or download individual maps by making a right click and choosing the option "save image as". 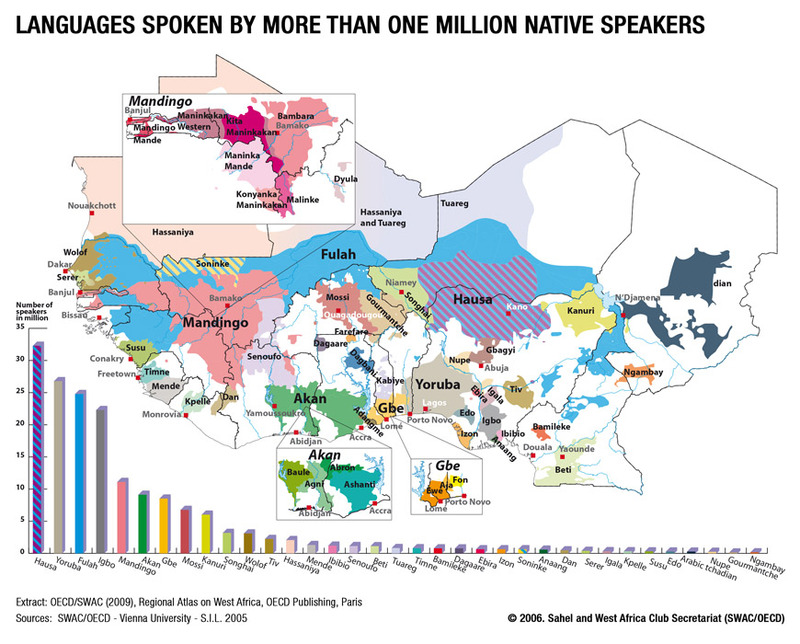 You can also explore all SWAC maps in different formats by key word, topic or country search on the SWAC Online Map Library. 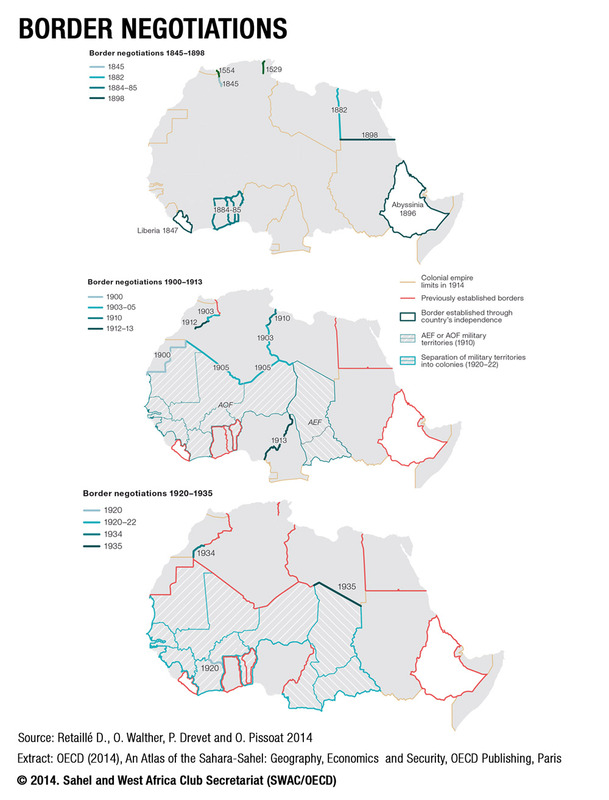 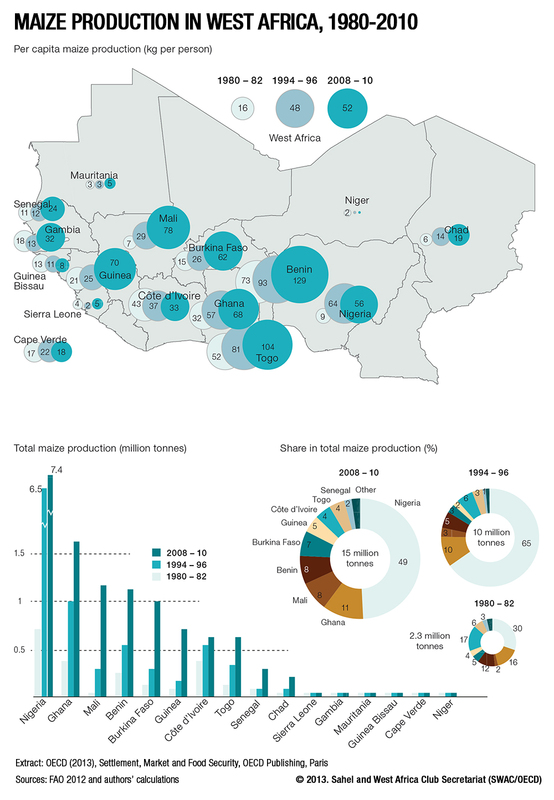 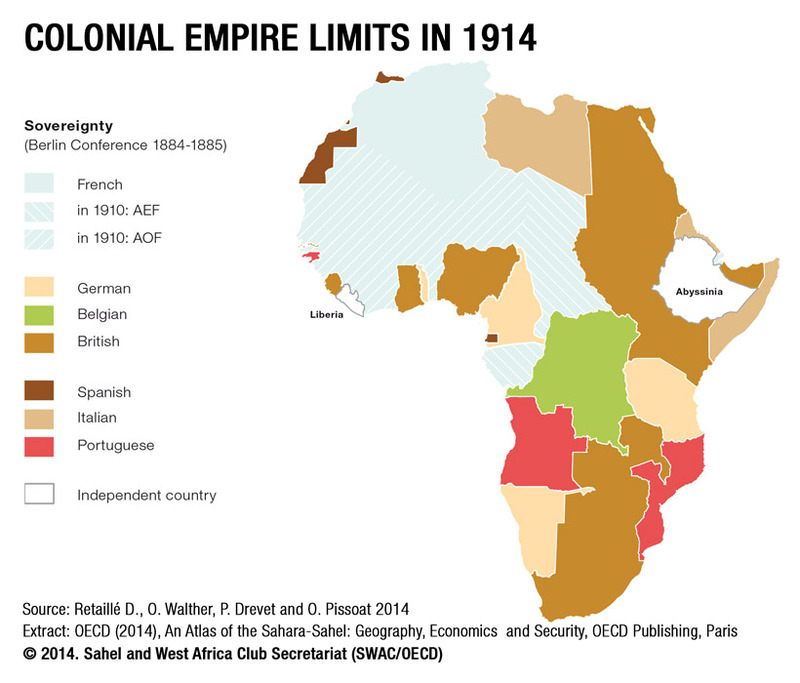 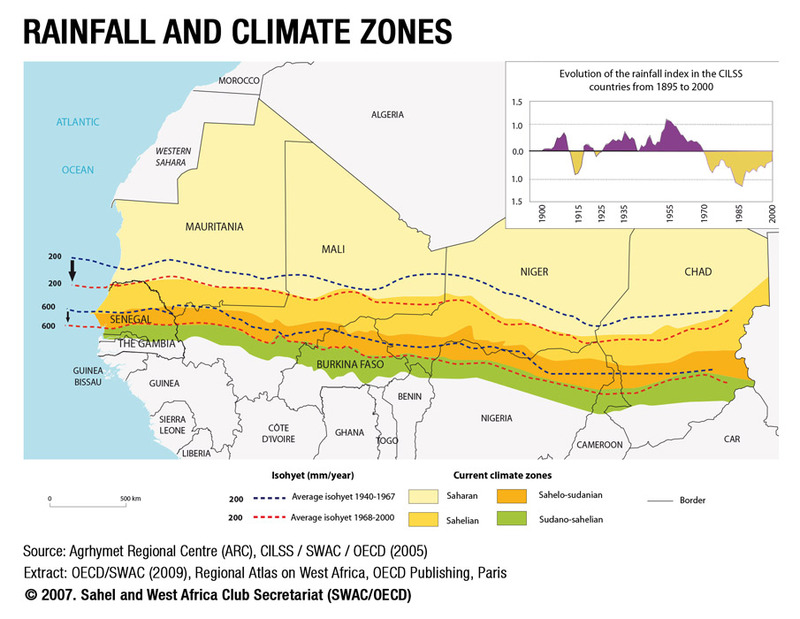 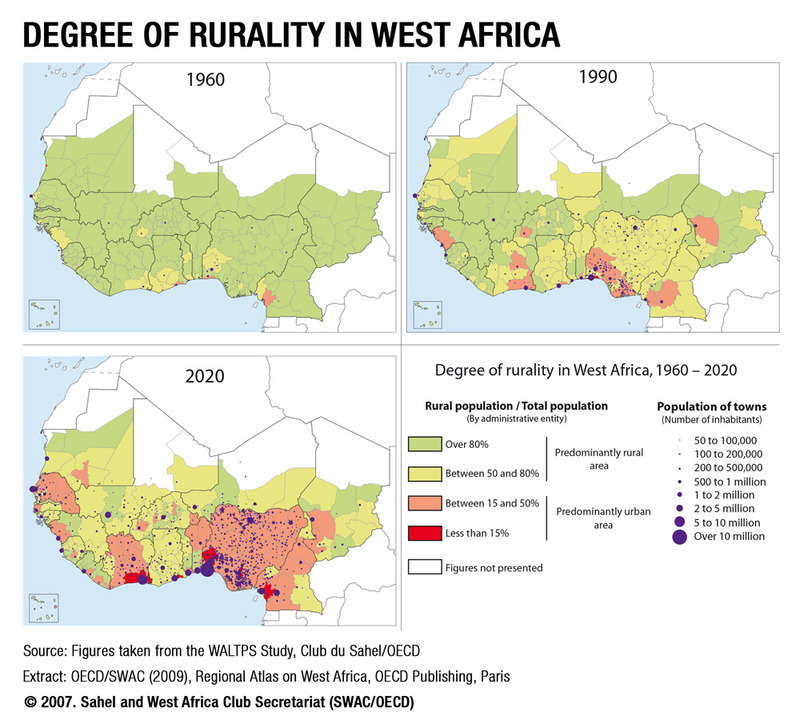 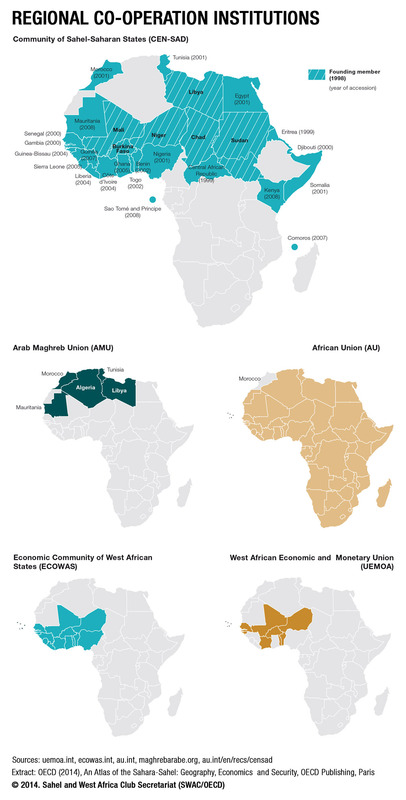 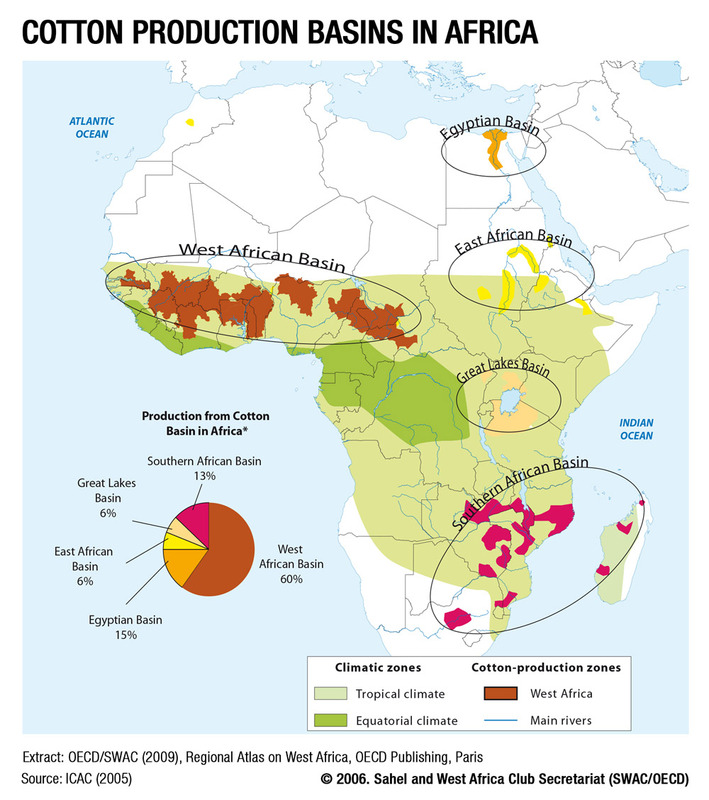 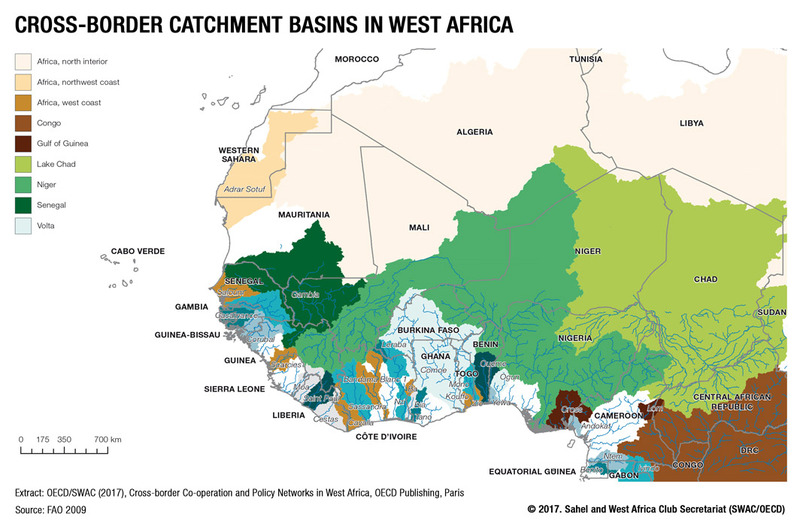 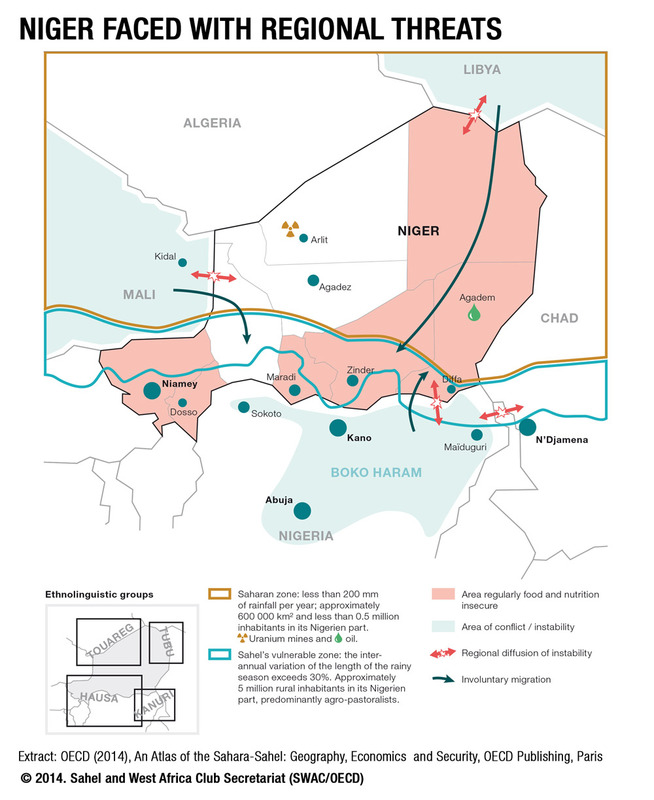 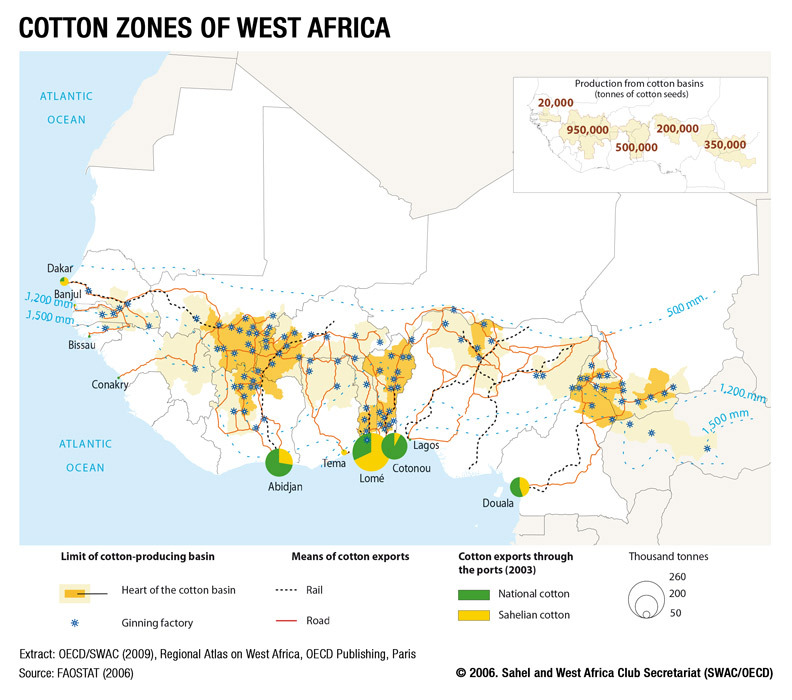 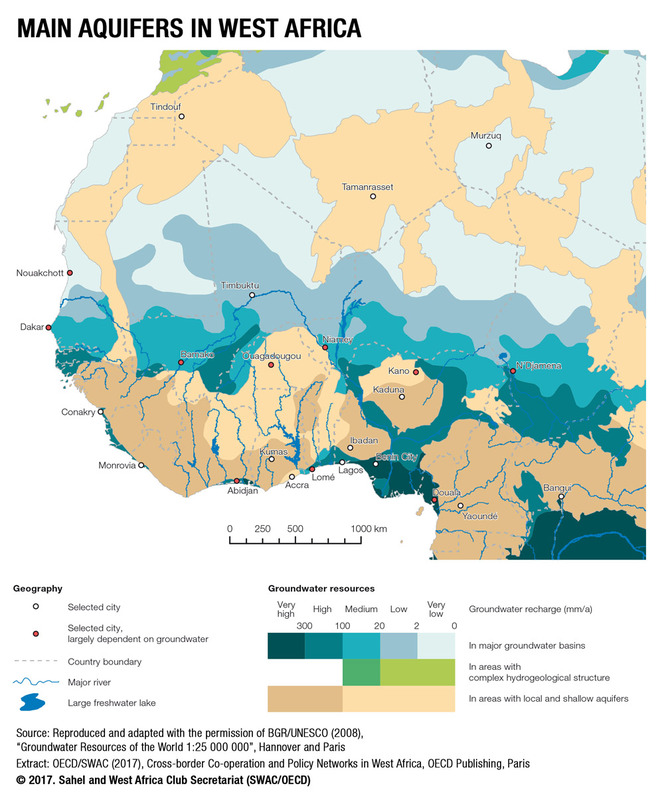 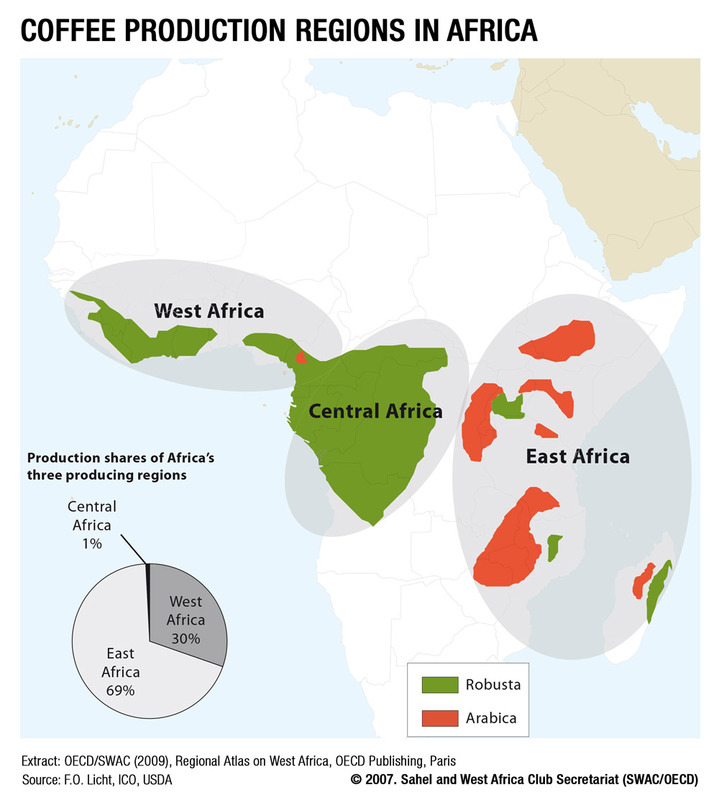 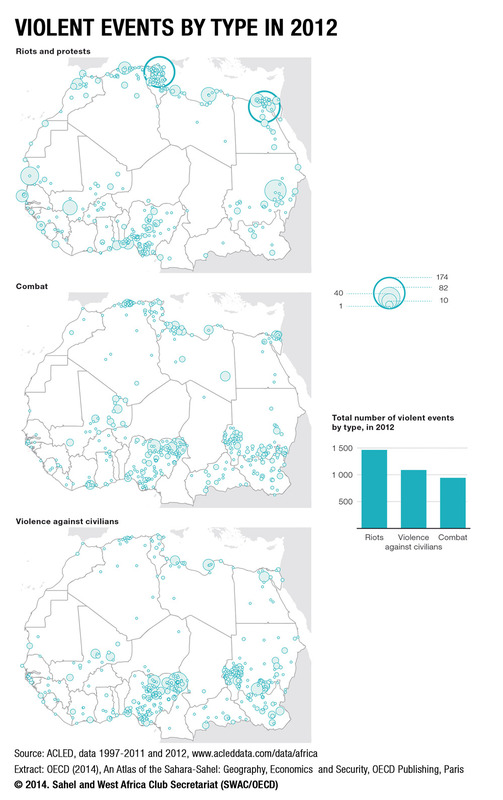 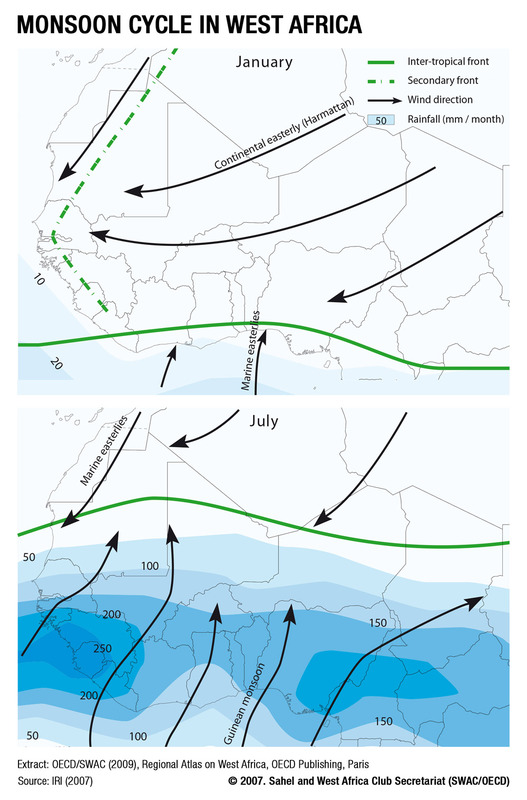 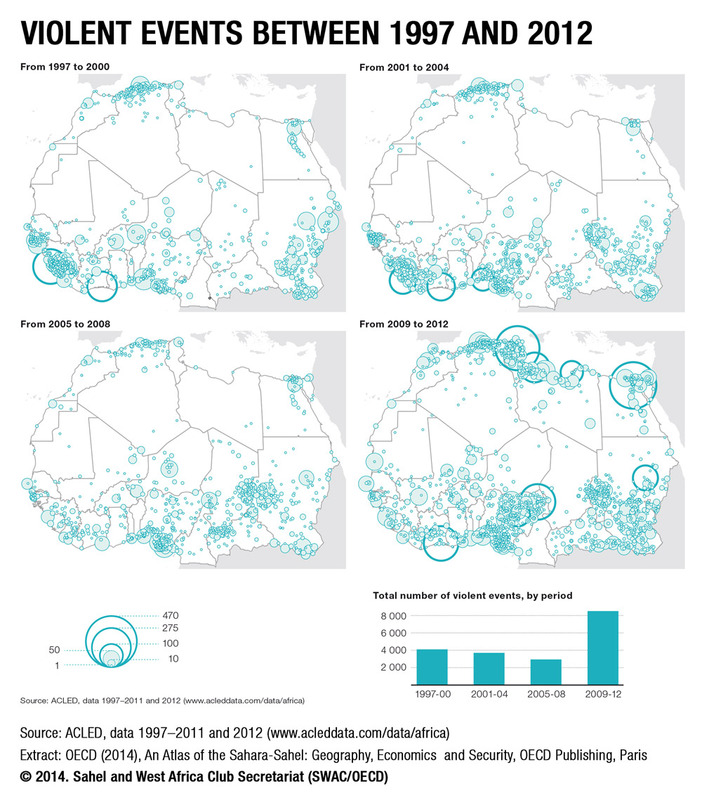 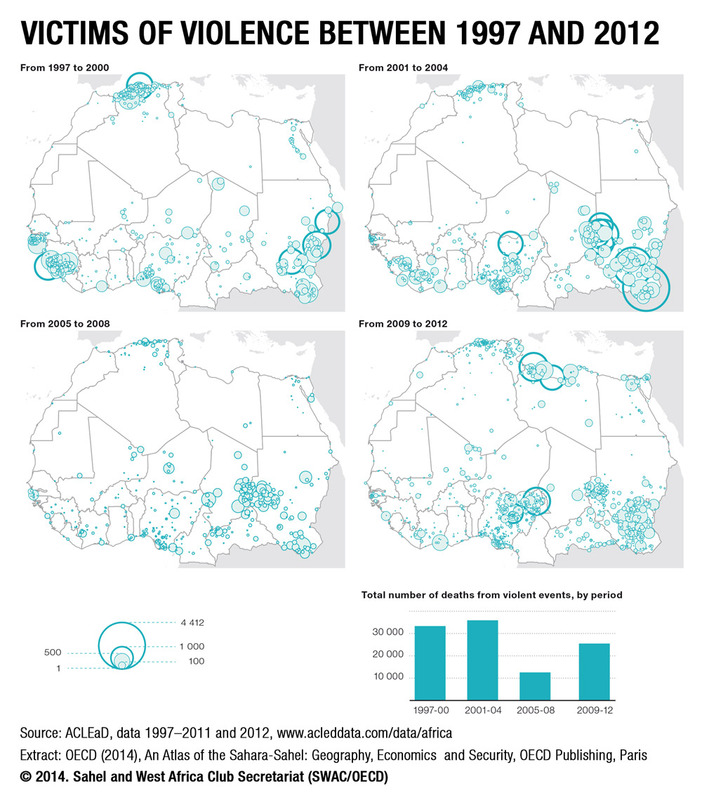 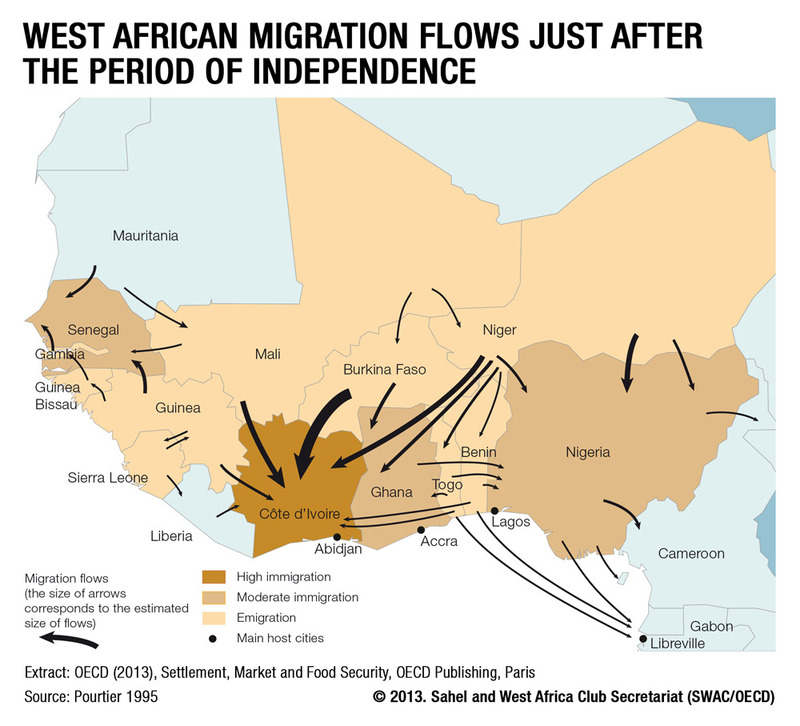 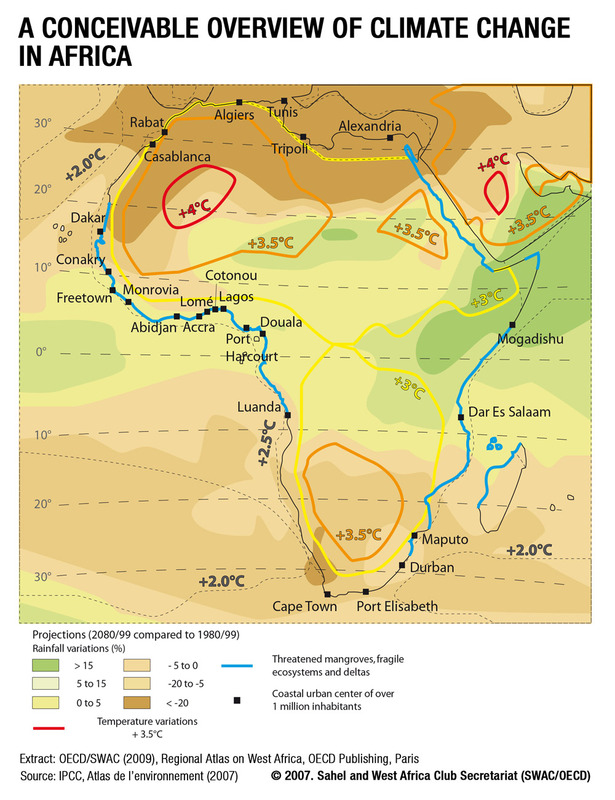 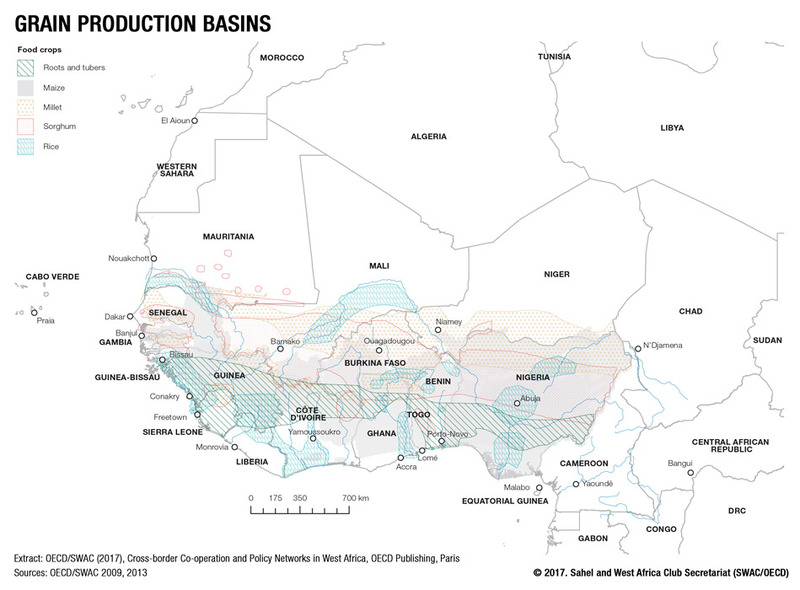 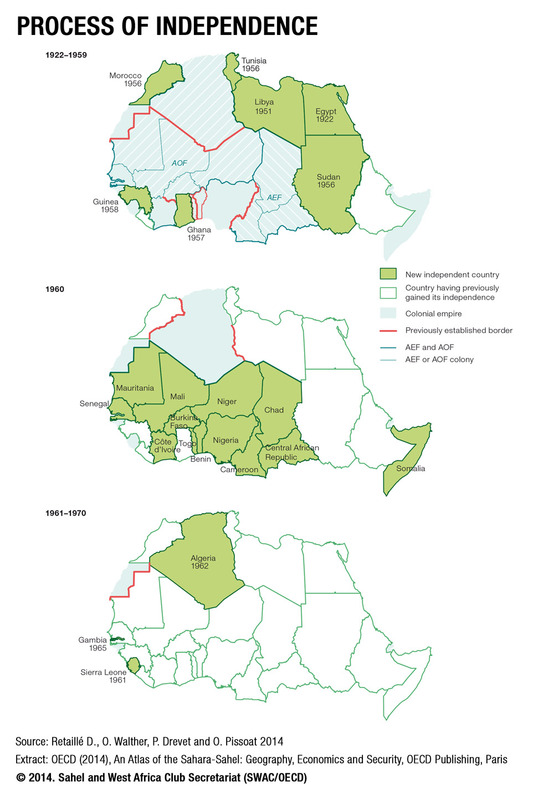 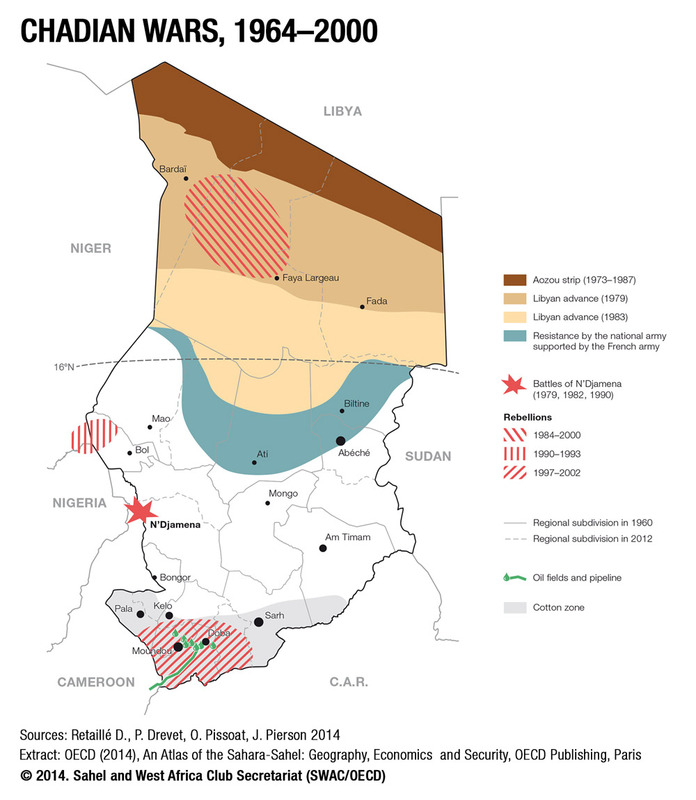 Subscribe to the West Africa Brief to receive the most recent issues of the Maps & Facts series: a one pager with a map and a complementary text in English/French.